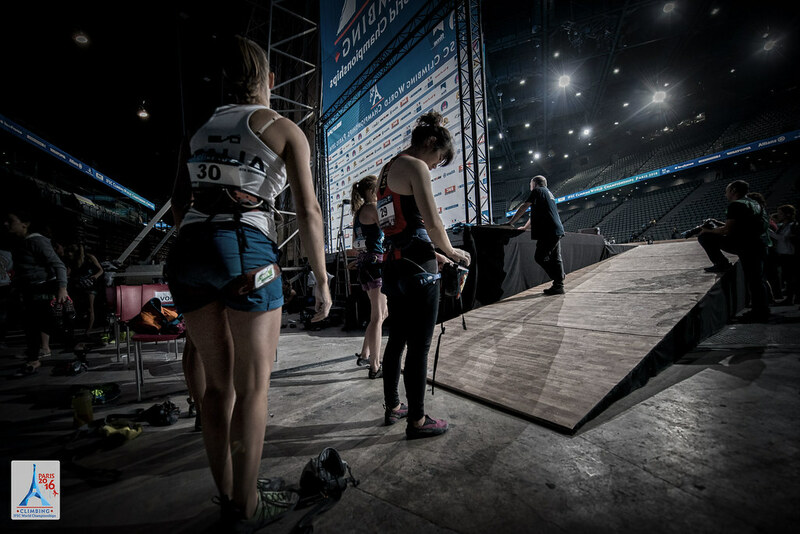 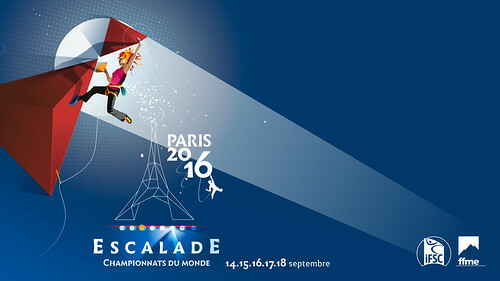 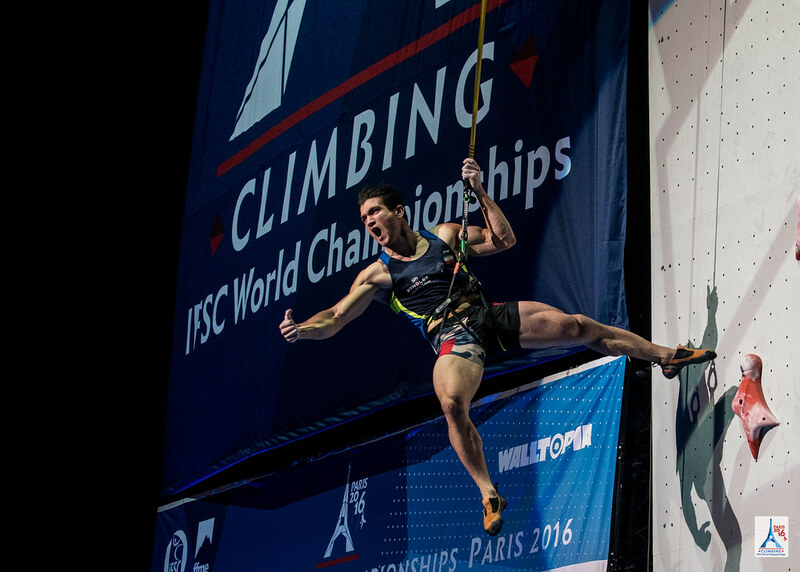 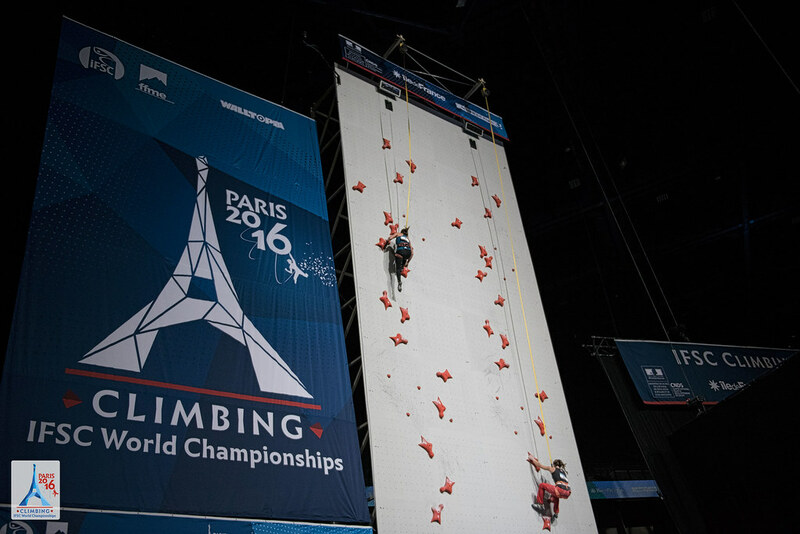 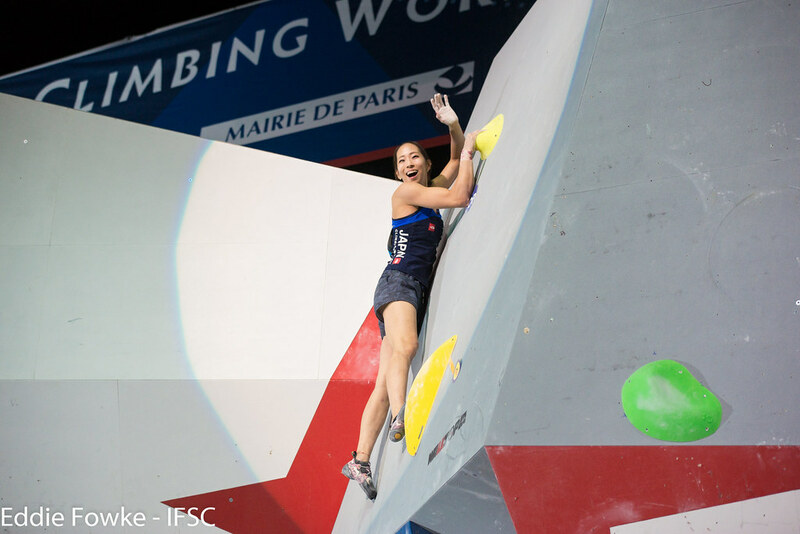 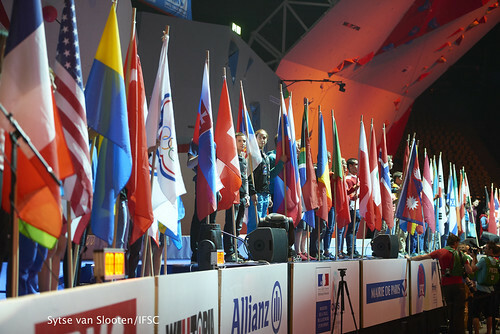 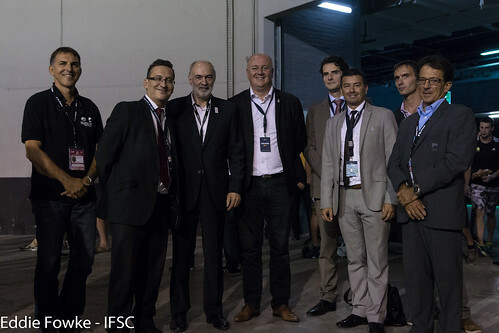 386 Athletes from 53 countries competed in the signature event of the 2016 IFSC Calendar: the IFSC Climbing and Paraclimbing World Championships in Paris. 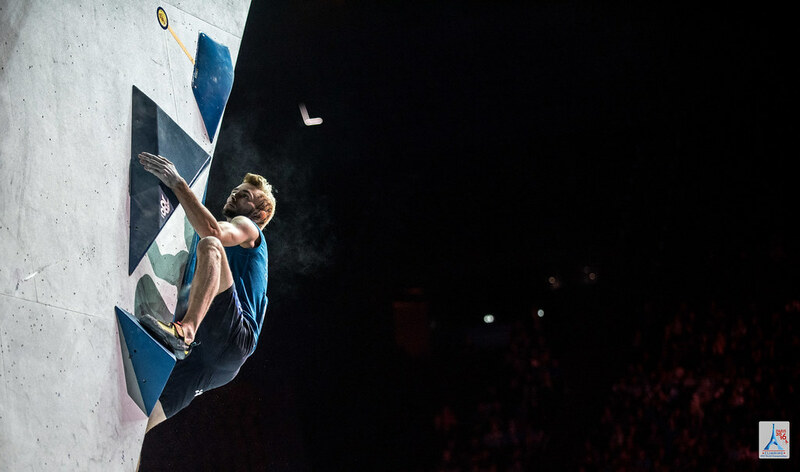 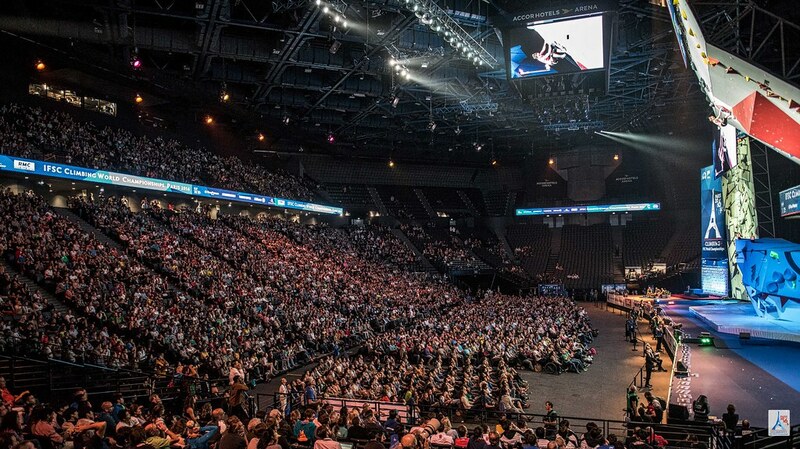 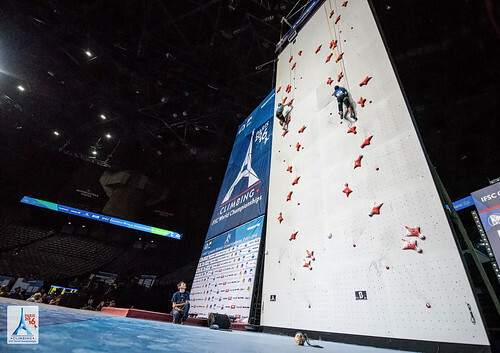 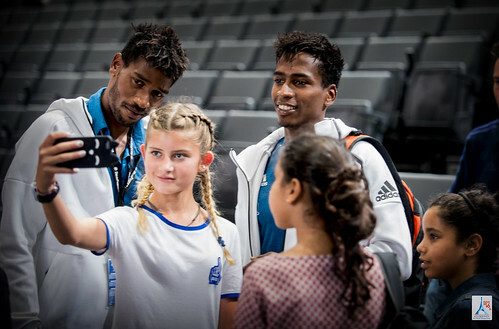 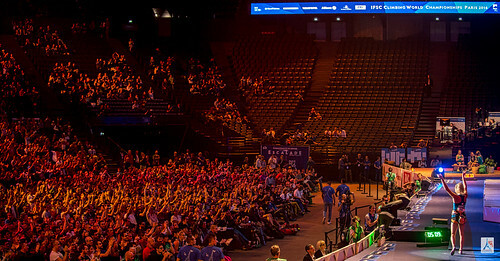 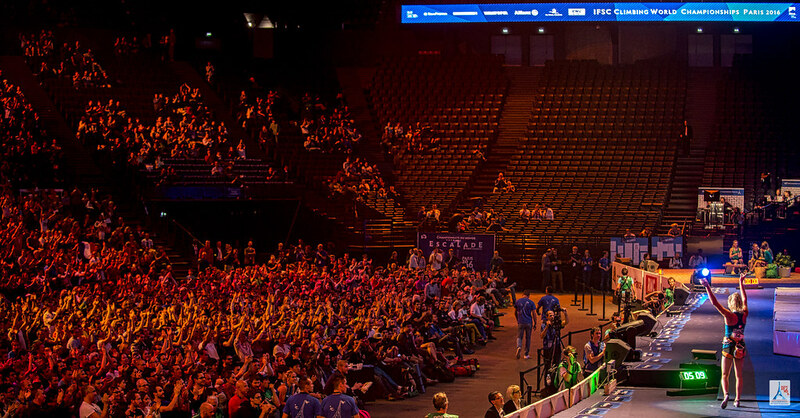 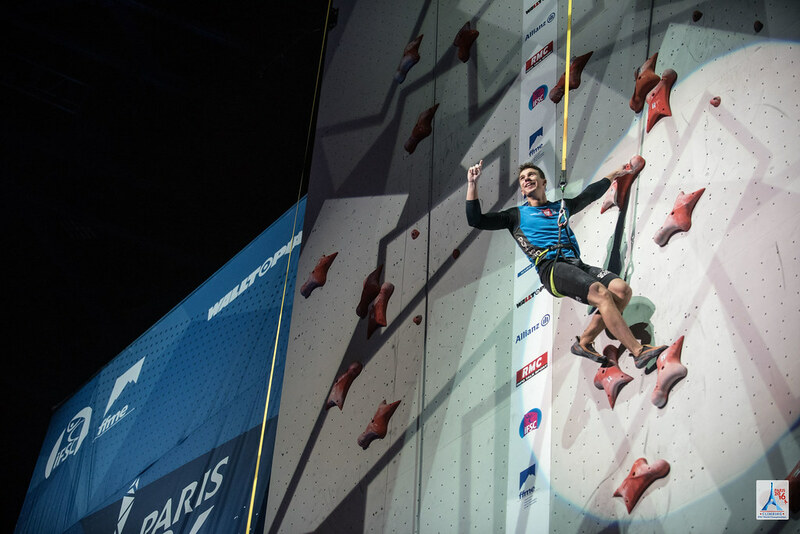 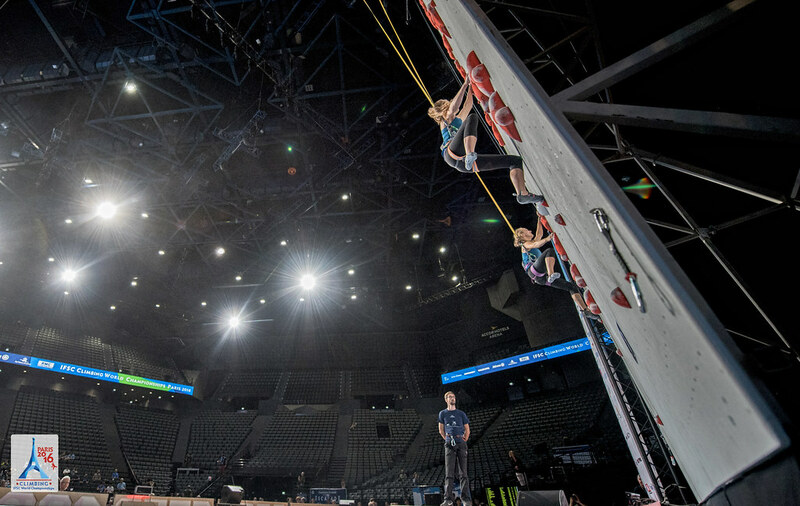 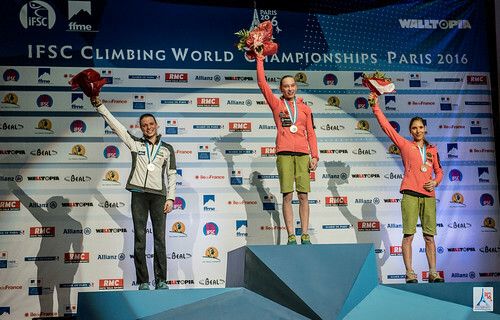 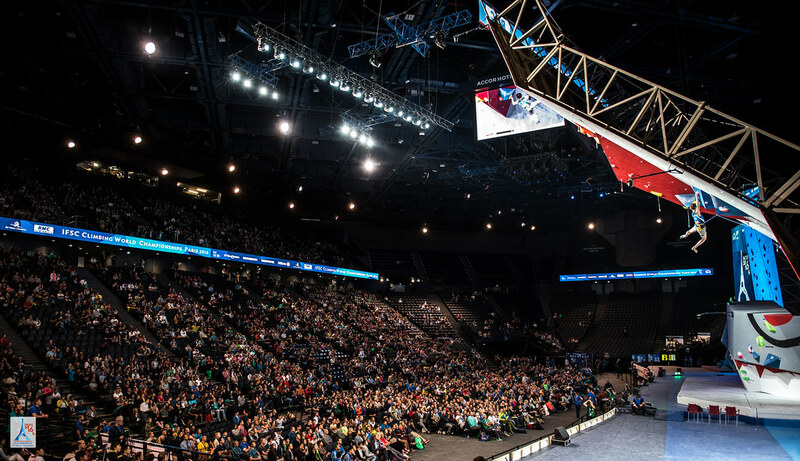 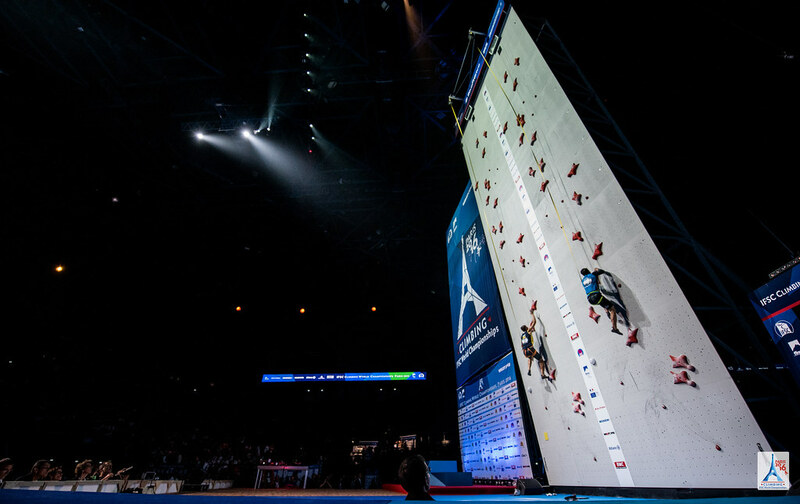 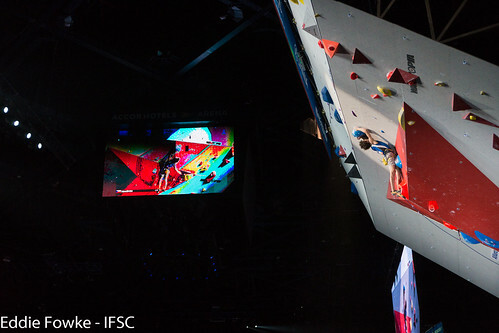 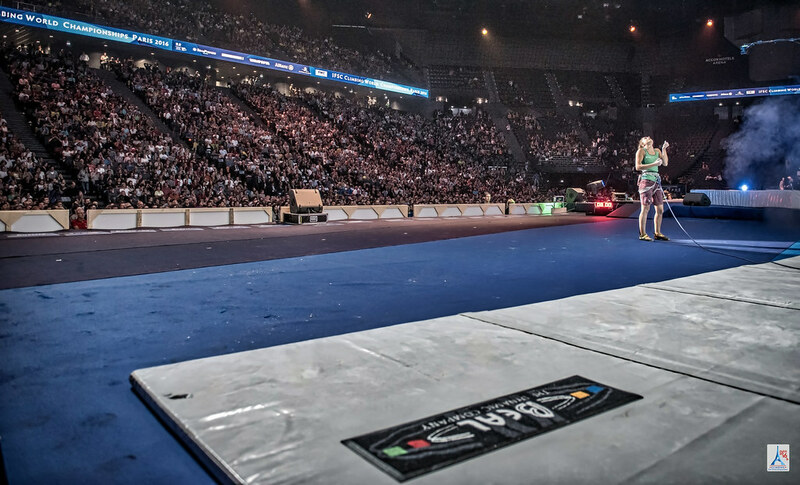 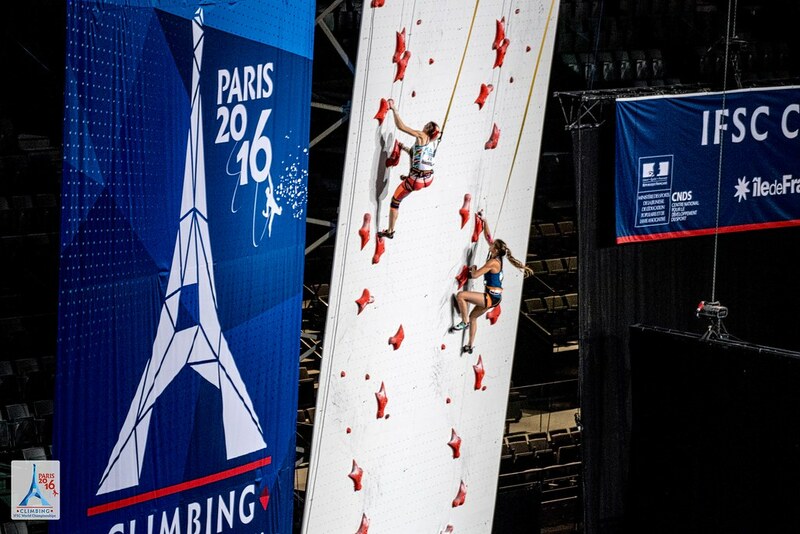 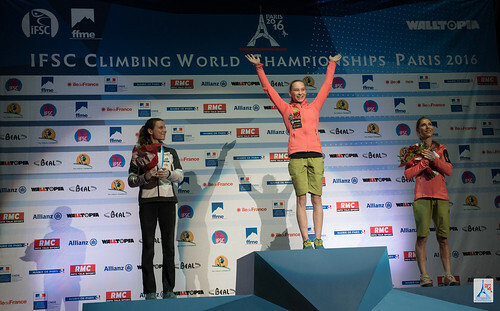 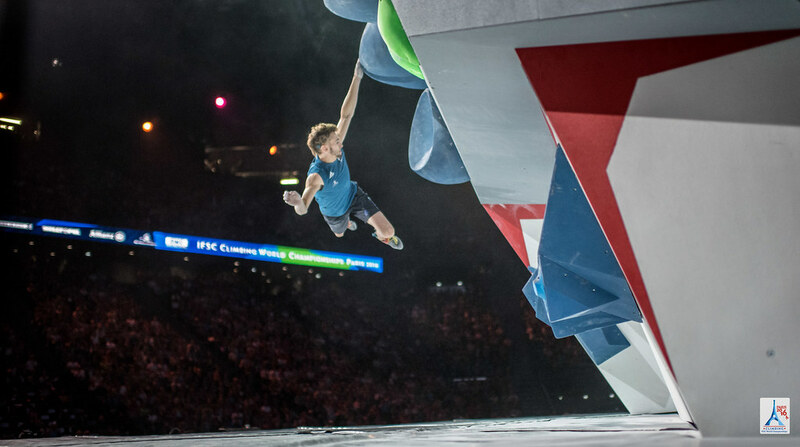 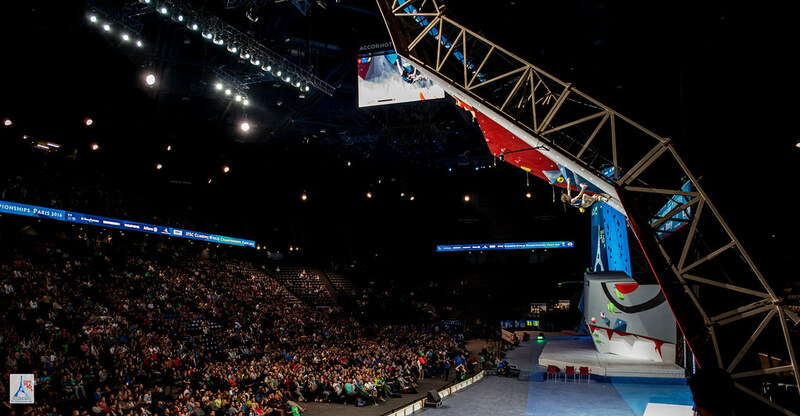 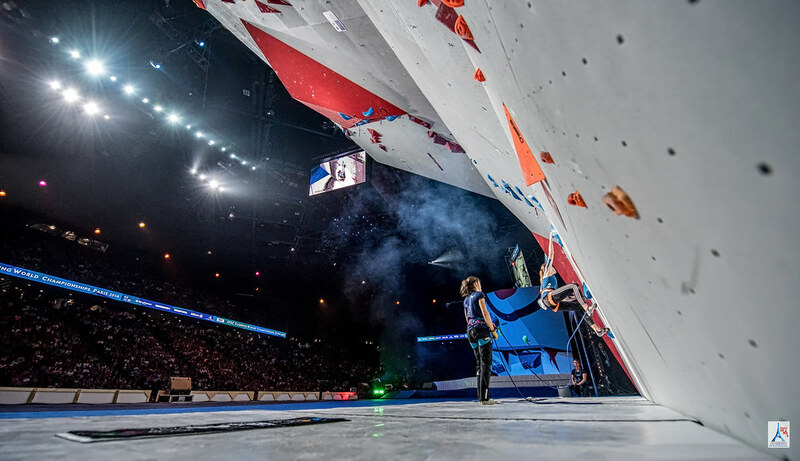 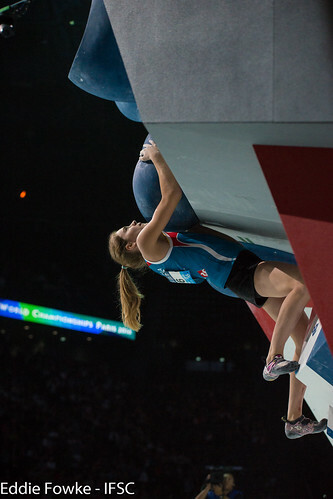 The newly-renovated AccorHotels Arena was packed with thousands of Frech fans and even more LIVE viewers, who witnessed tears of joy, screams of exertion and ear-to-ear smiles from the best Sport Climbers in the world standing atop the podiums. The host country led the way with five medals in Climbing and seven in Paraclimbing. 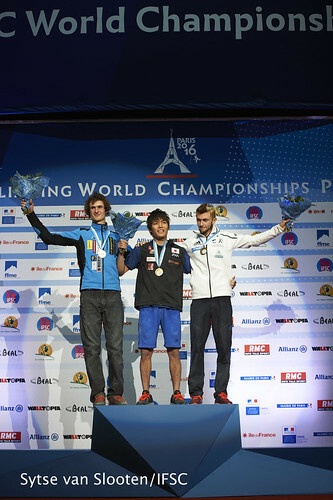 Japan won the most Gold and six medals in total, while Russia finished third in the total count with five Athletes bringing home hardware. 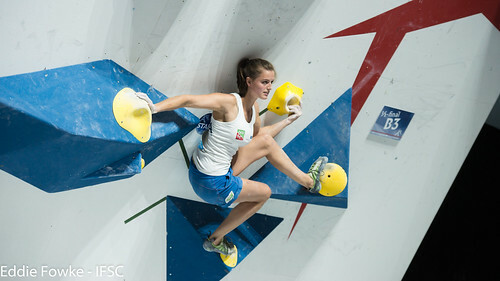 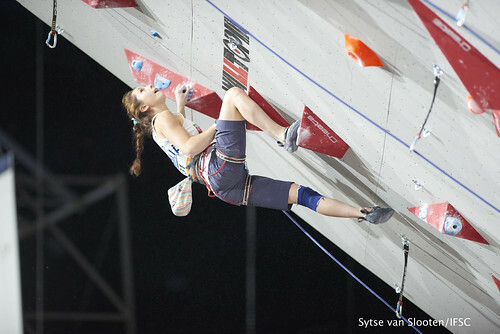 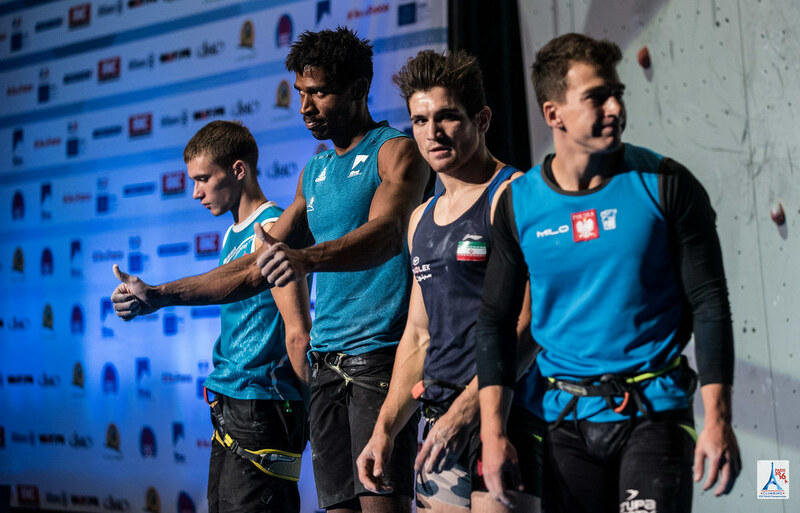 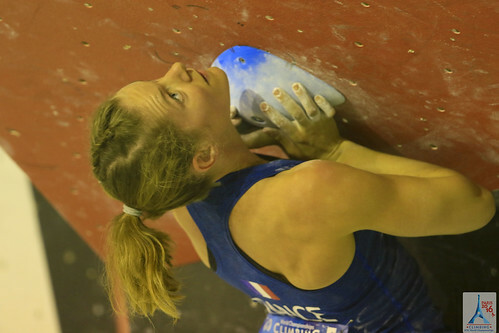 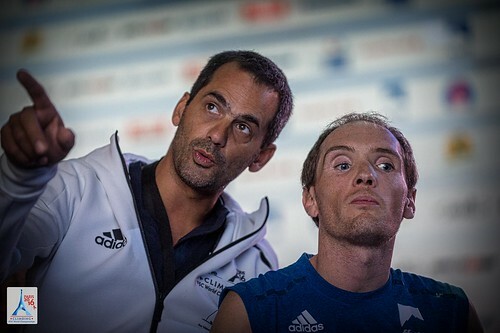 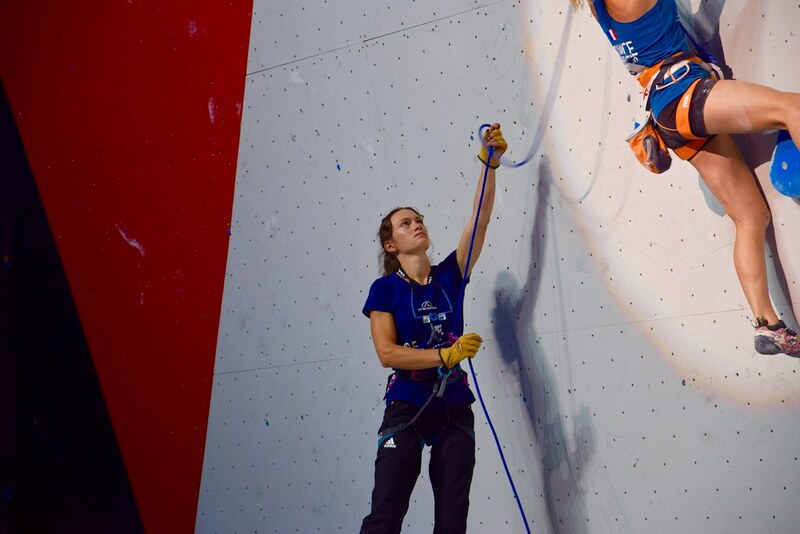 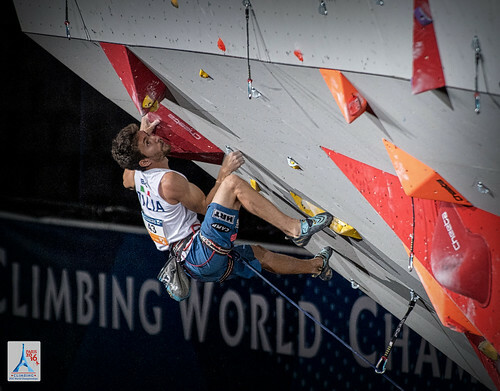 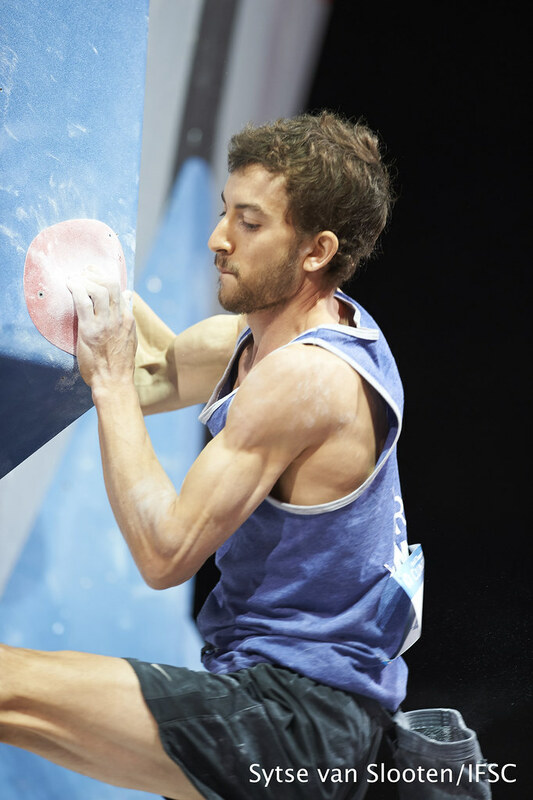 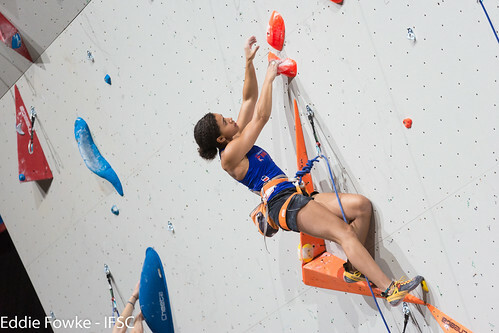 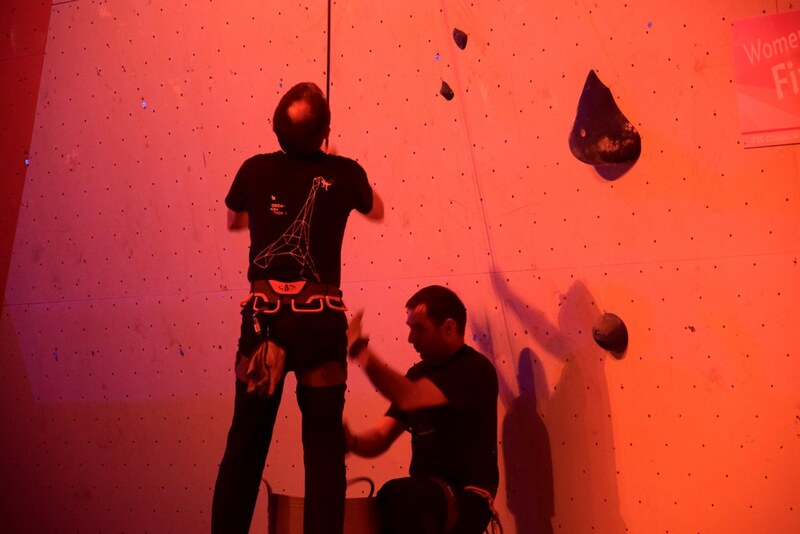 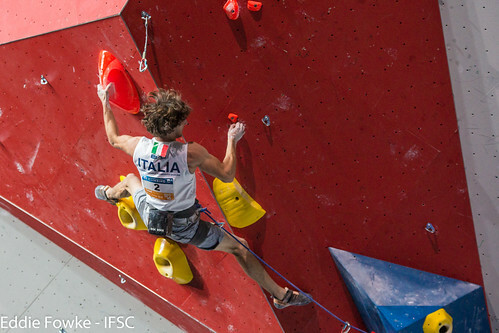 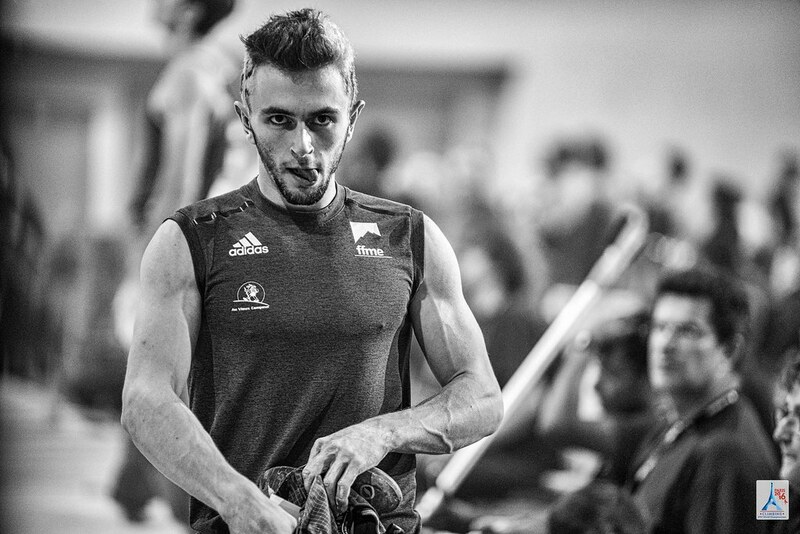 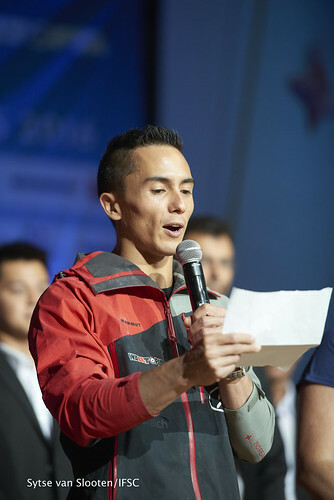 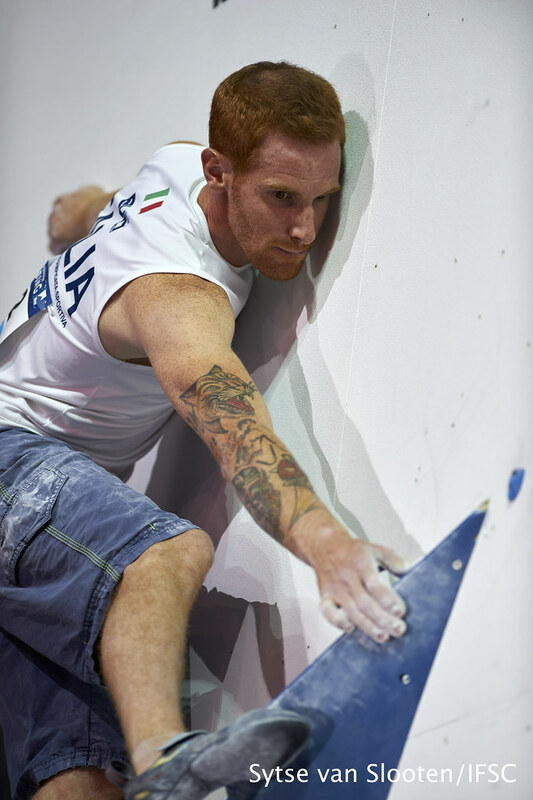 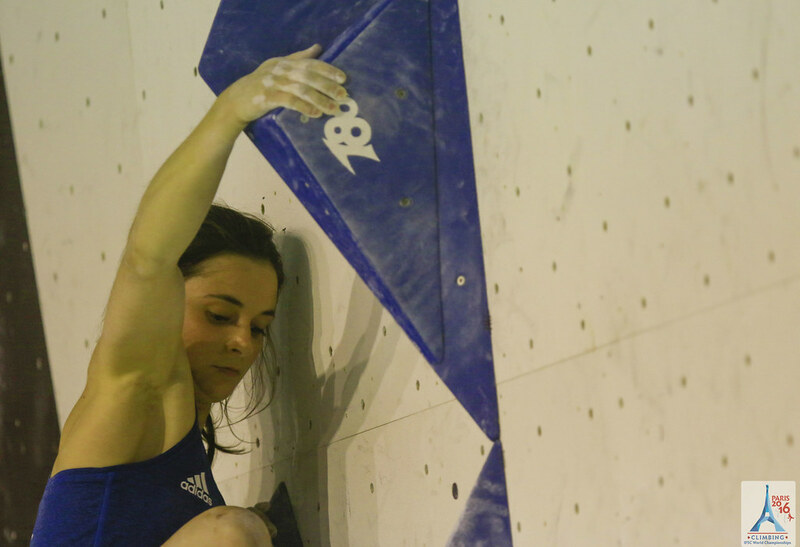 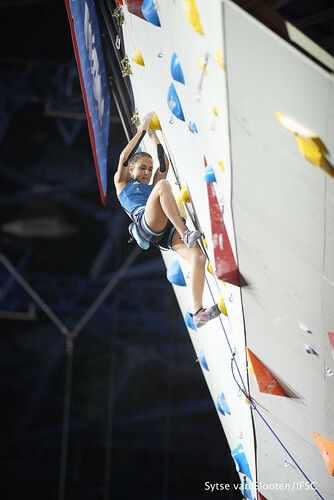 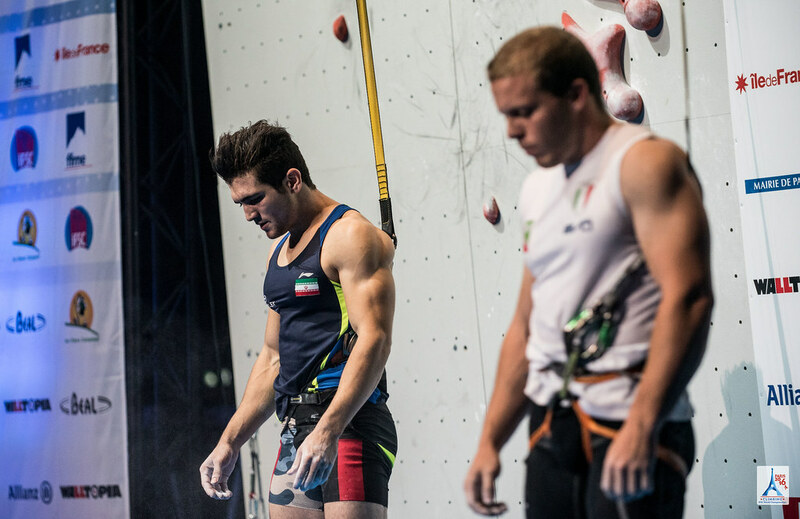 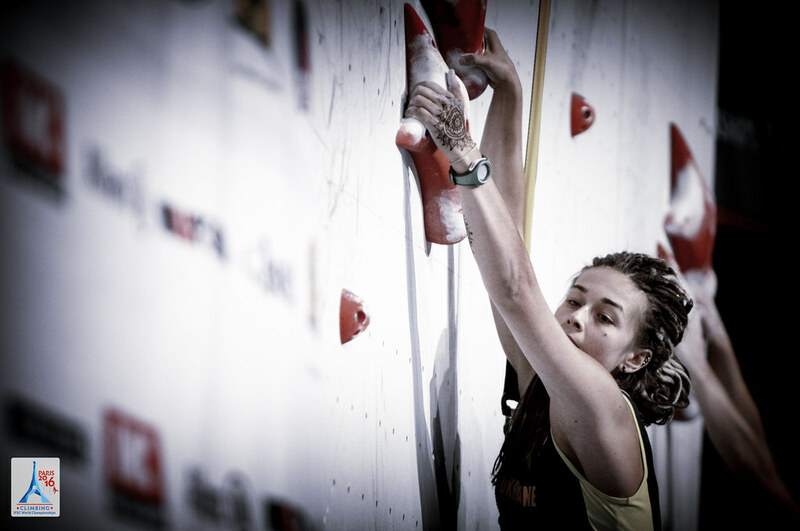 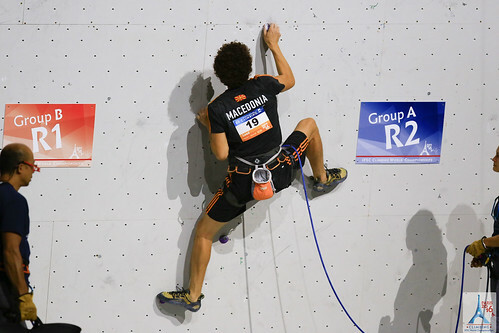 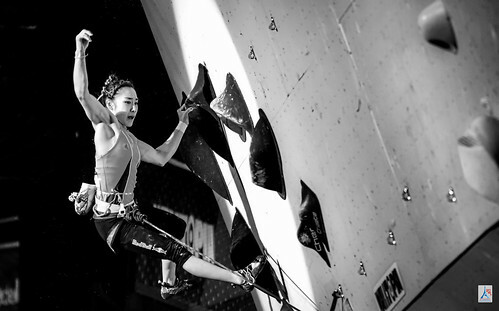 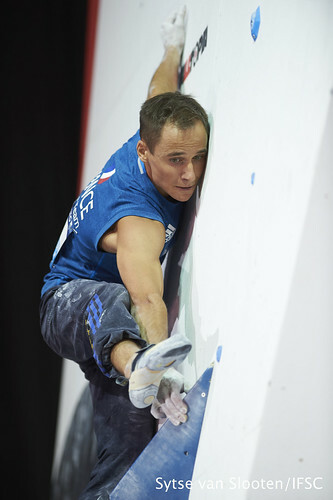 Italy also faired well, claimed four spots on the podium in Paraclimbing. 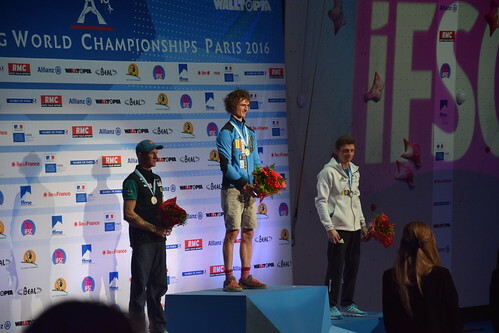 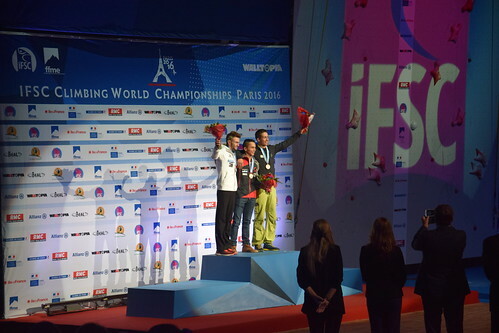 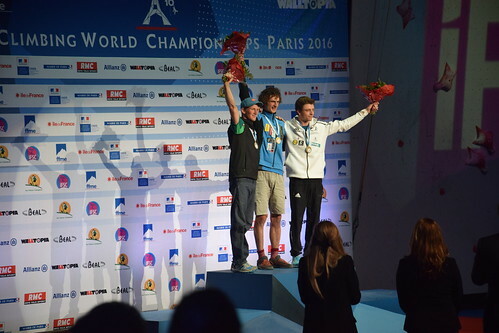 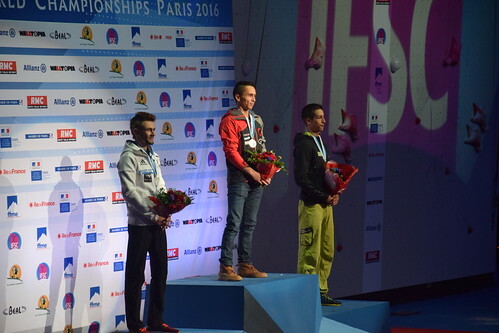 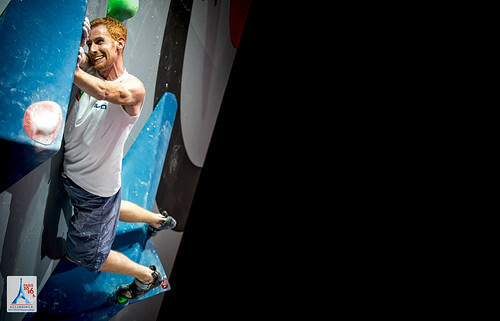 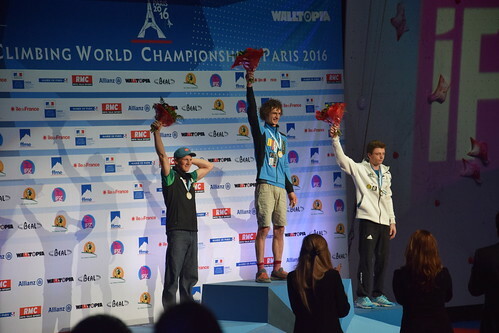 Sean McColl, 2014 IFSC World Championships winner in Combined (Bouldering, Lead and Speed), defended his spot atop the podium. 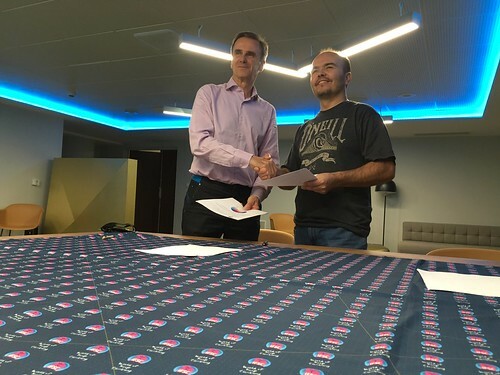 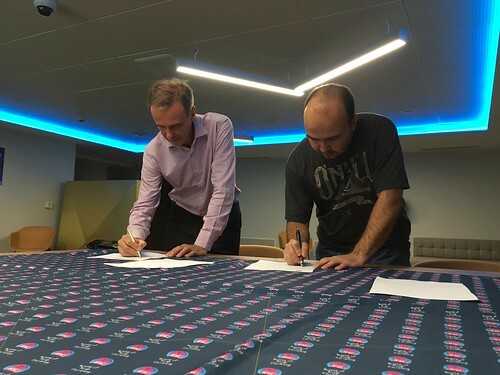 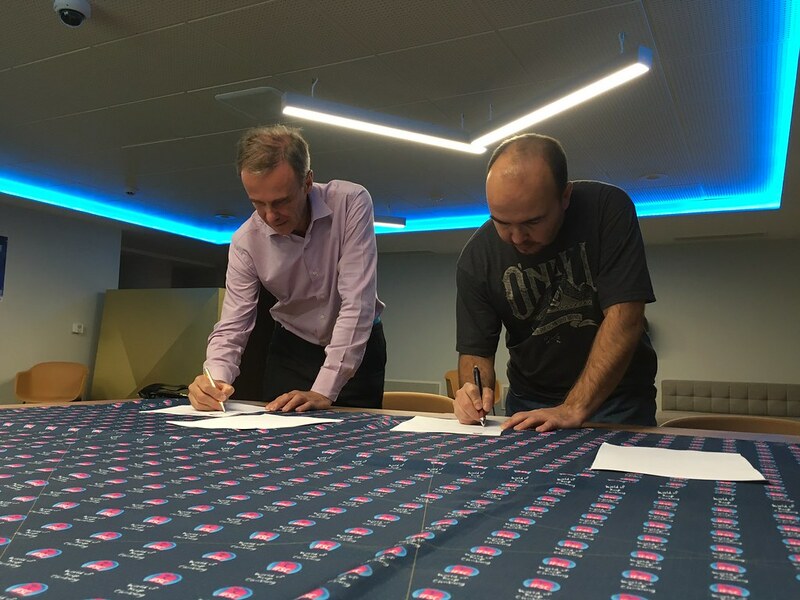 Joining him was Manuel Cornu of France in second and David Firnenburg of Germany in third. For the Women, Russian Elena Krasovskaia was officially given the Gold medal on Sunday which she secured the day before. 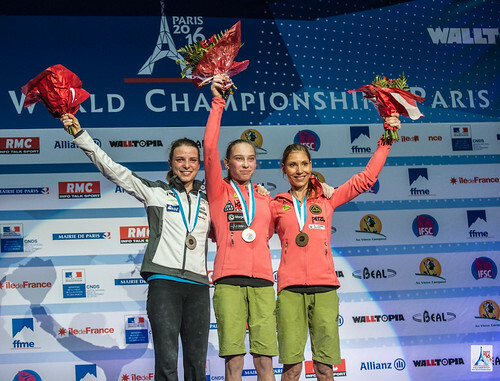 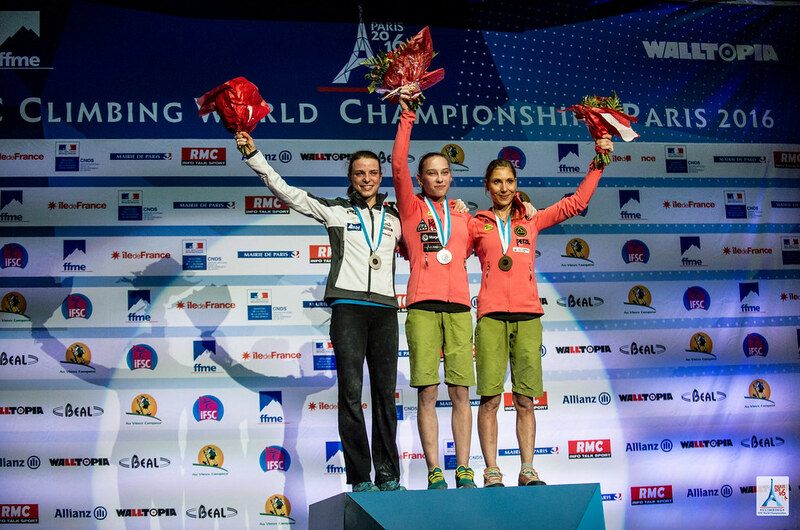 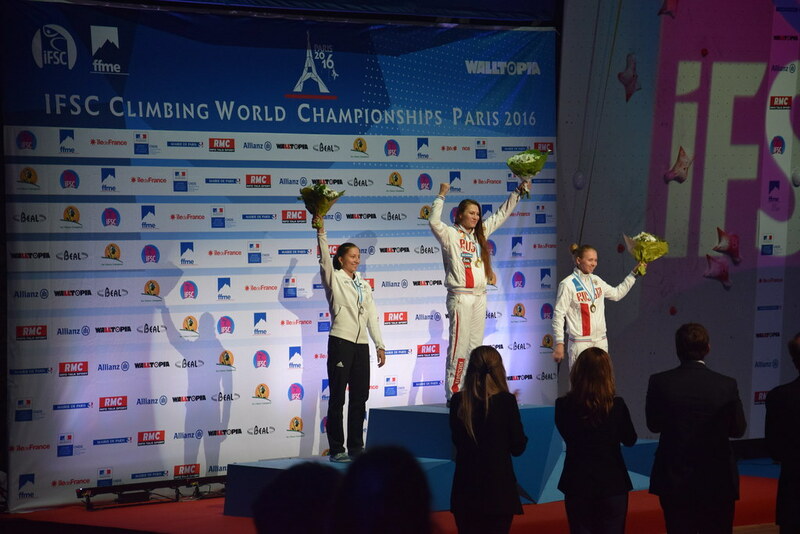 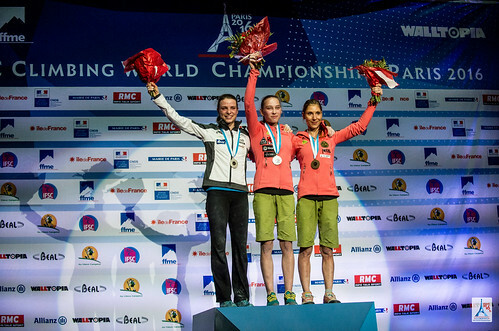 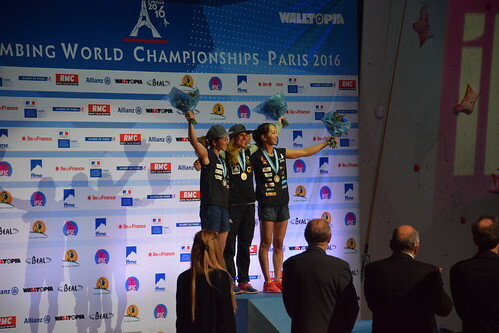 Claire Buhrfeind of the USA picked up the Silver, and Charlotte Durif of France completed the podium. 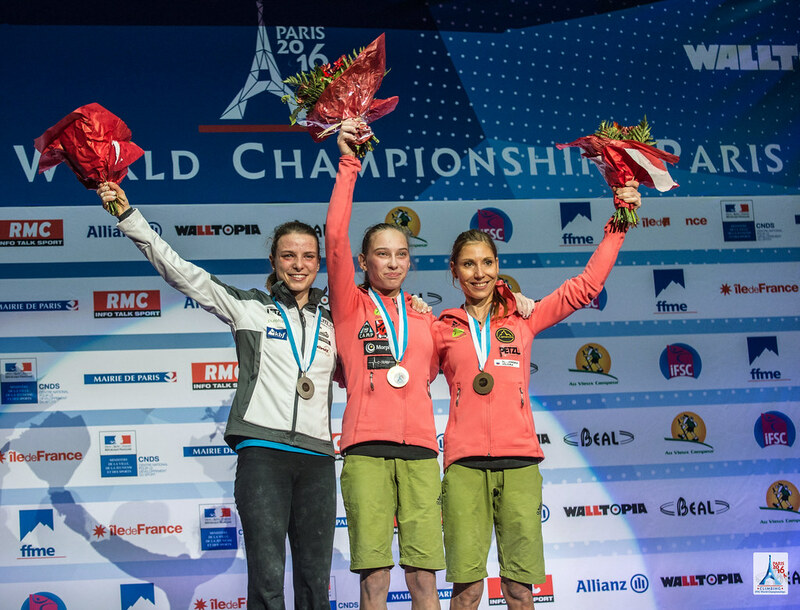 Find the complete Combined results and Medal Count here. 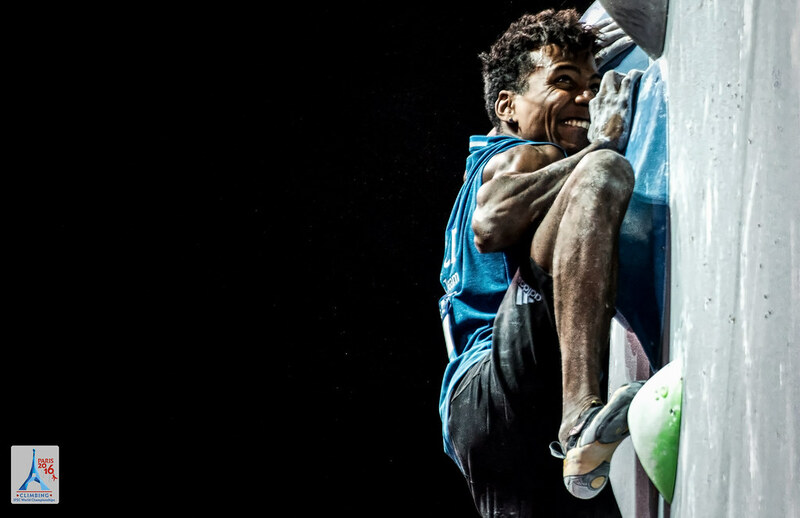 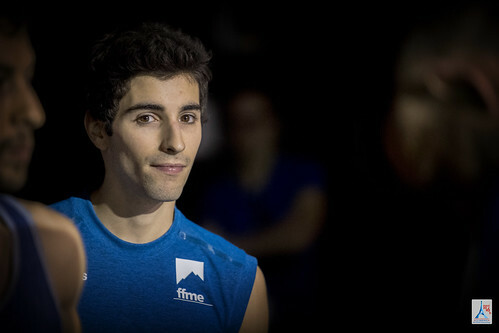 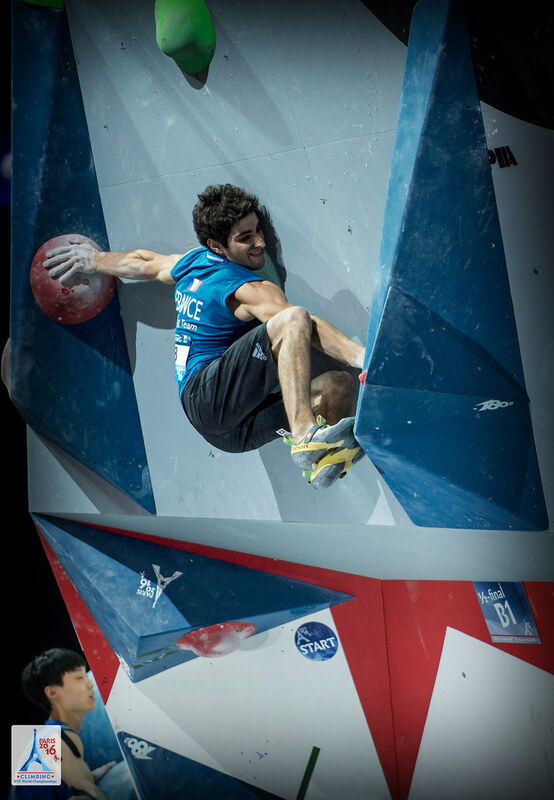 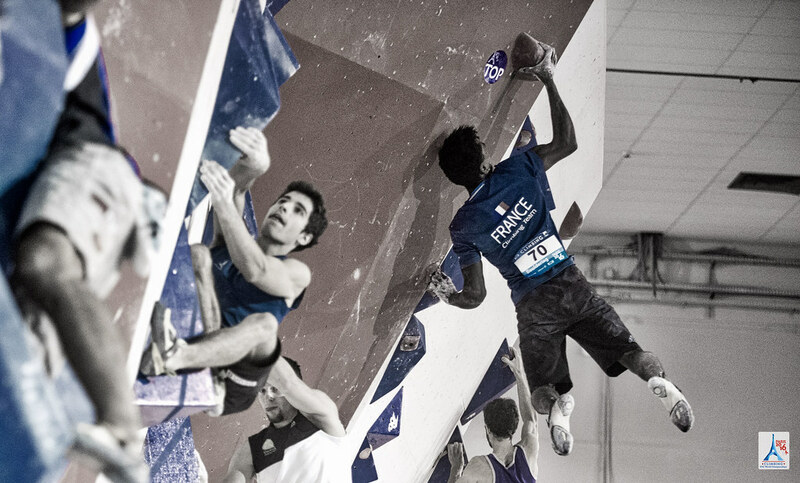 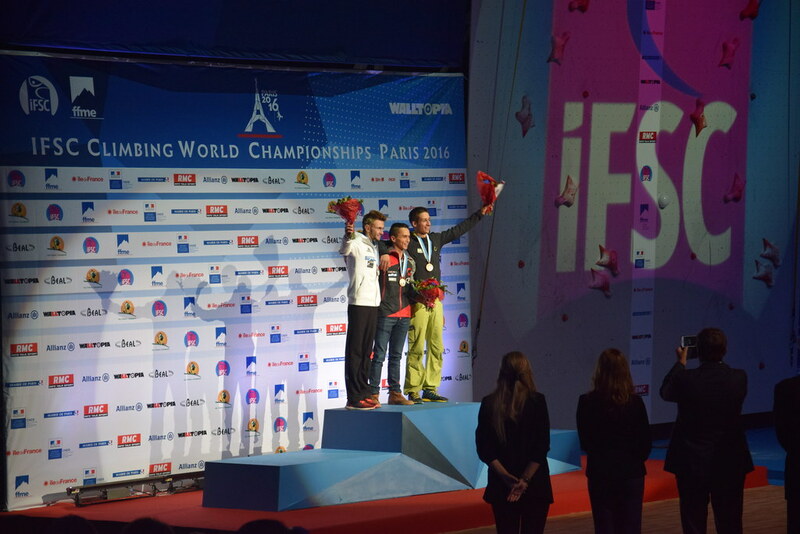 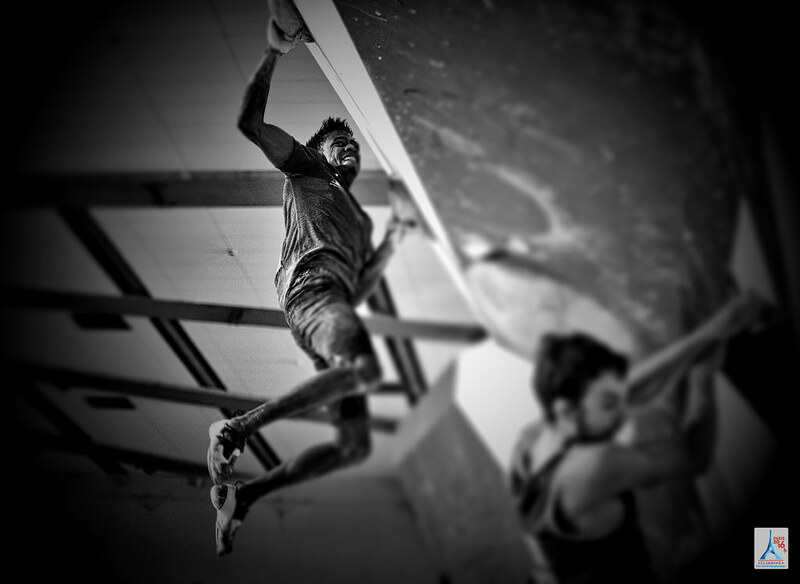 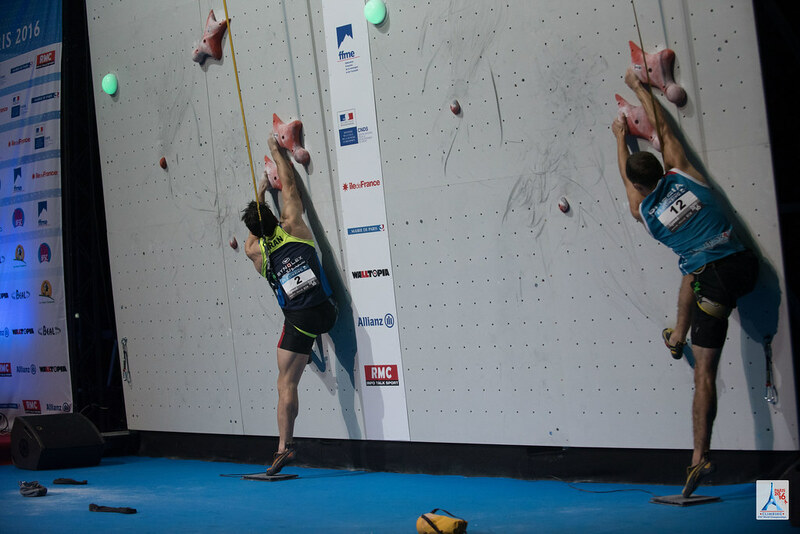 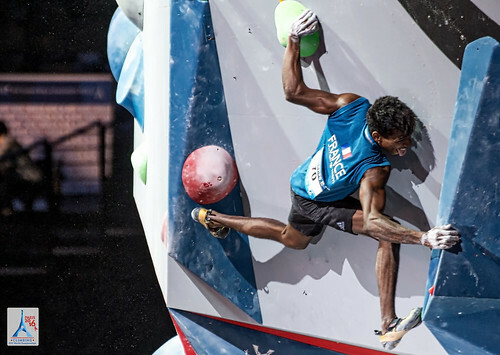 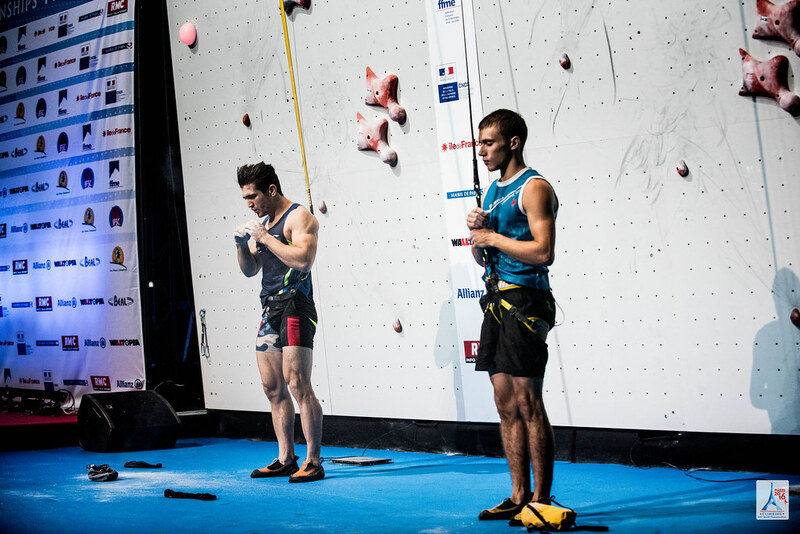 Three Frenchmen competed in the Finals for Men Bouldering on Saturday, and all three Athletes received standing ovations at the end of M4. 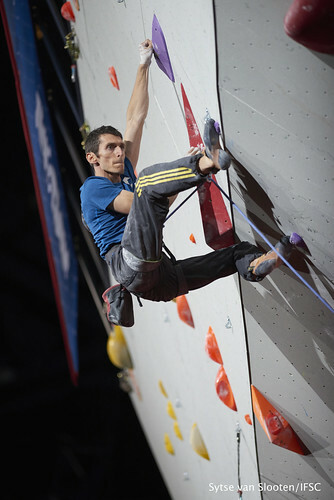 Most finalists stuck the triple dyno on M1, but only Mickael Mawem and Manuel Cornu kept their balance on the M2 slab. 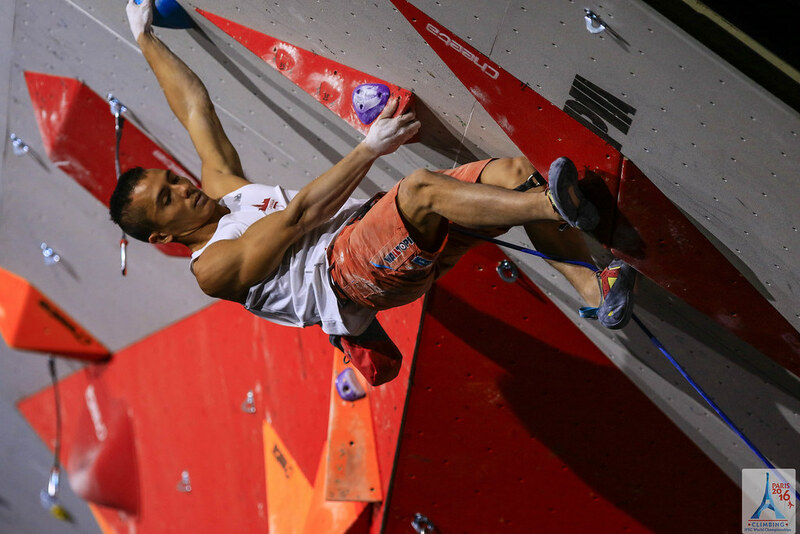 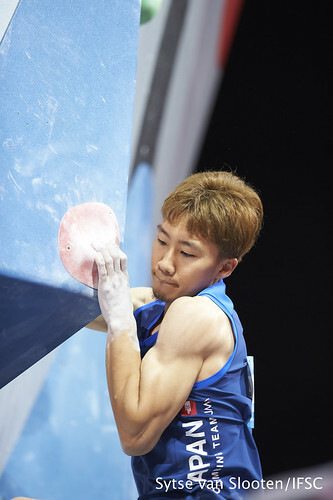 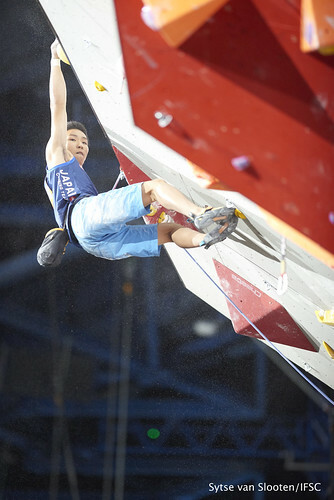 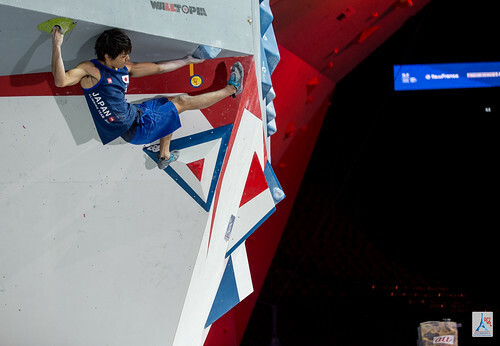 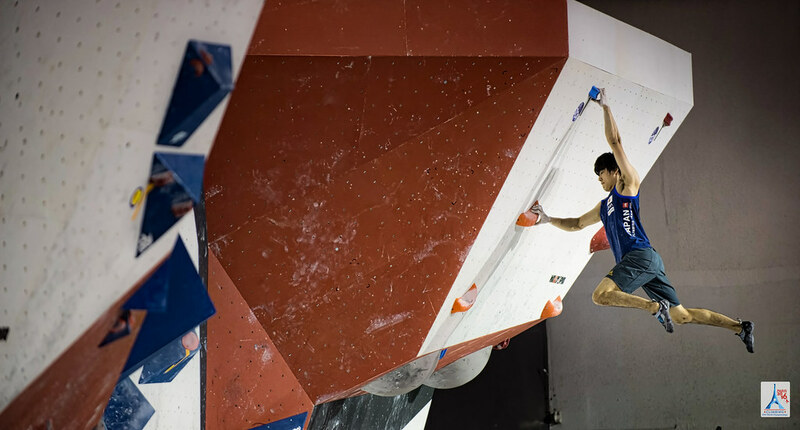 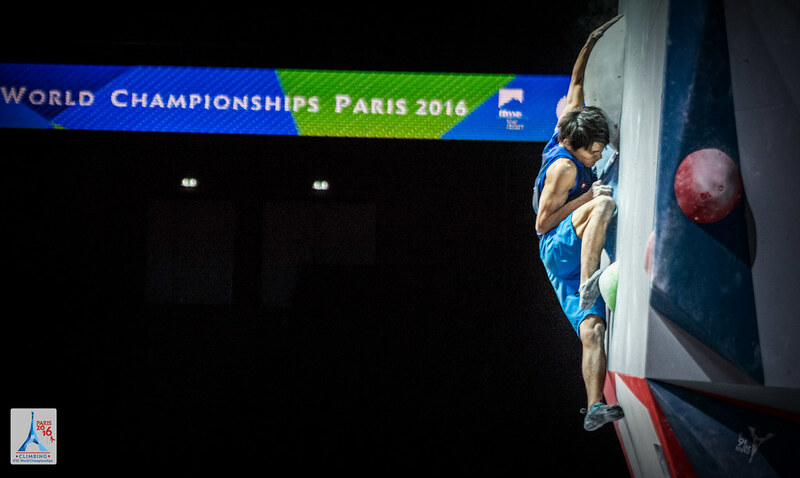 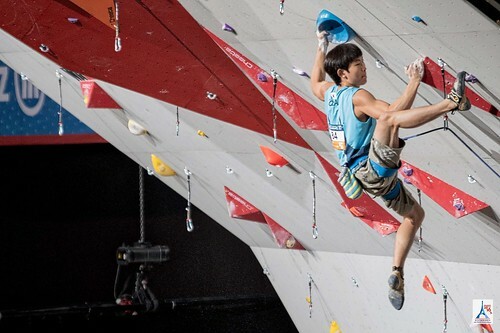 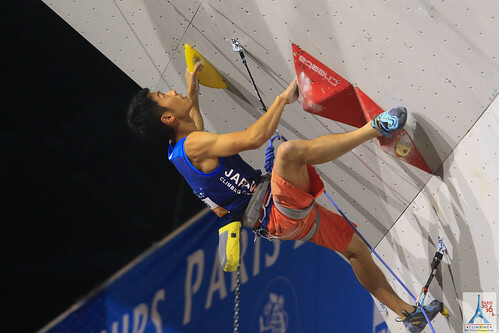 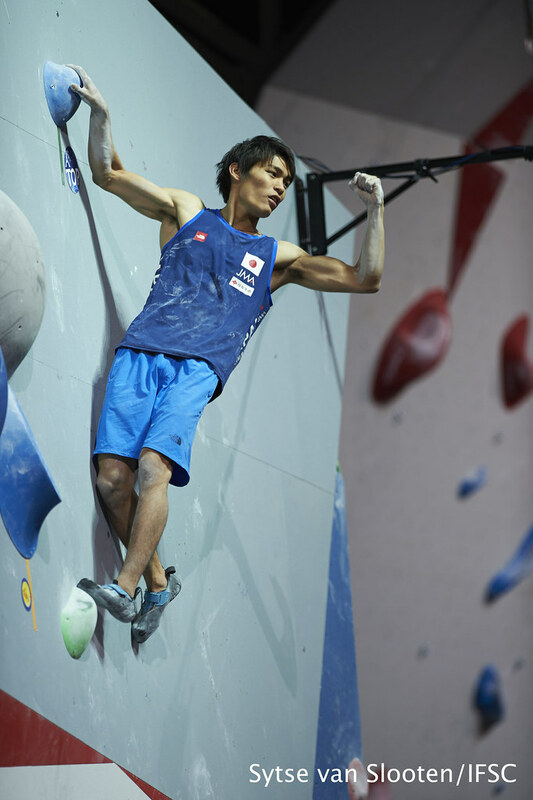 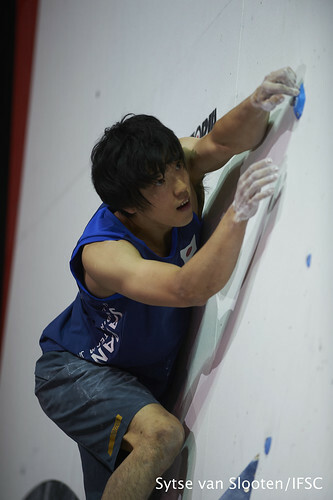 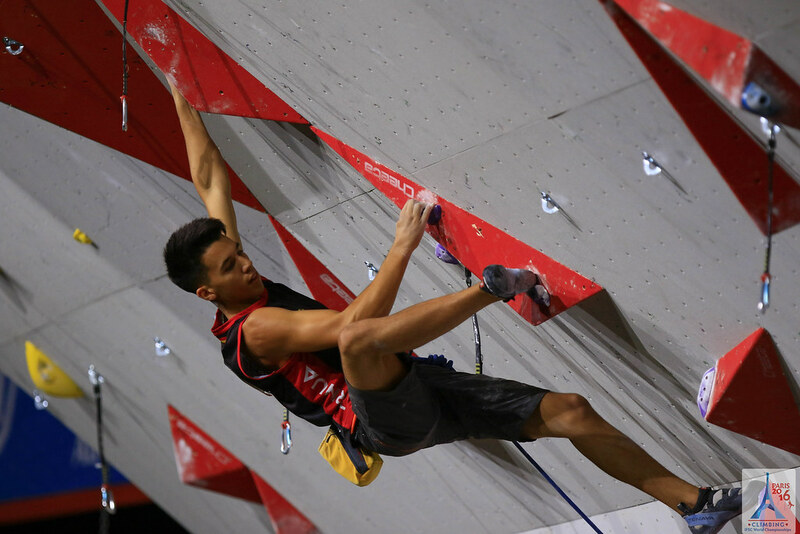 Tomoa Narasaki of Japan, who became the 2016 Bouldering World Cup champion in Munich last month, and Adam Ondra of the Czech Republic, reigning Bouldering world champion, both rebounded on M3. 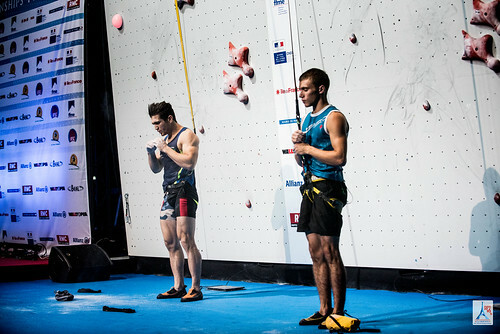 The podium placements were left a mystery until M4, a burly bloc requiring both endurance and extension. Cornu grimaced at the crux and did not Top, but his passionate effort still greatly pleased his home crowd. 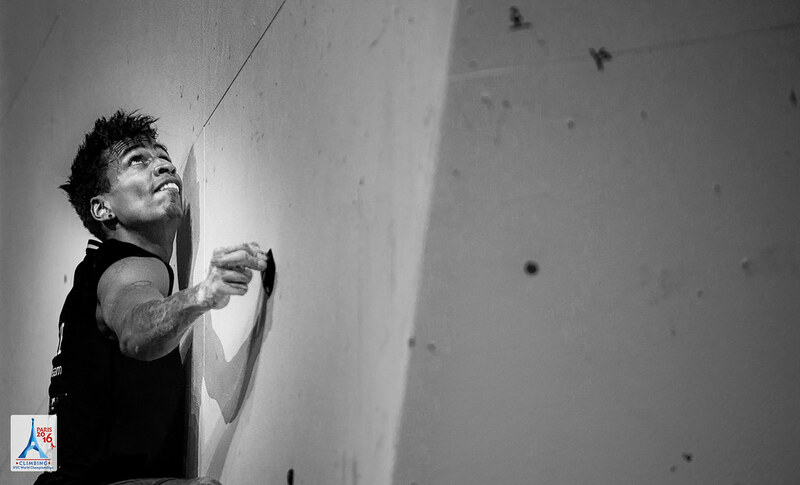 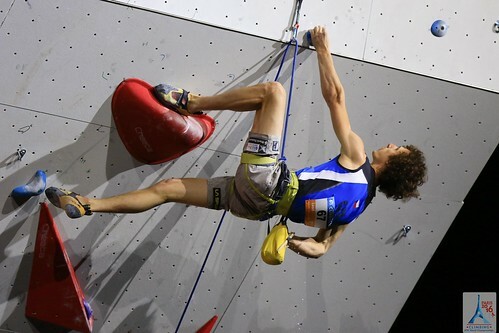 He finished in third place when Ondra found a no-hands rest before cruising through the toughest section. 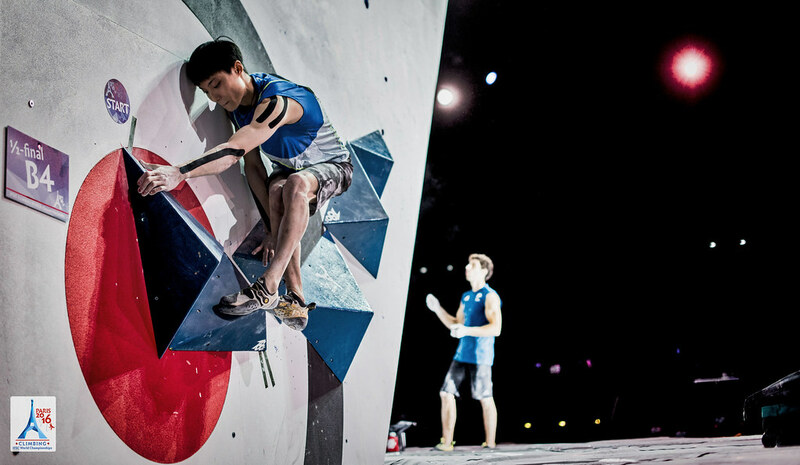 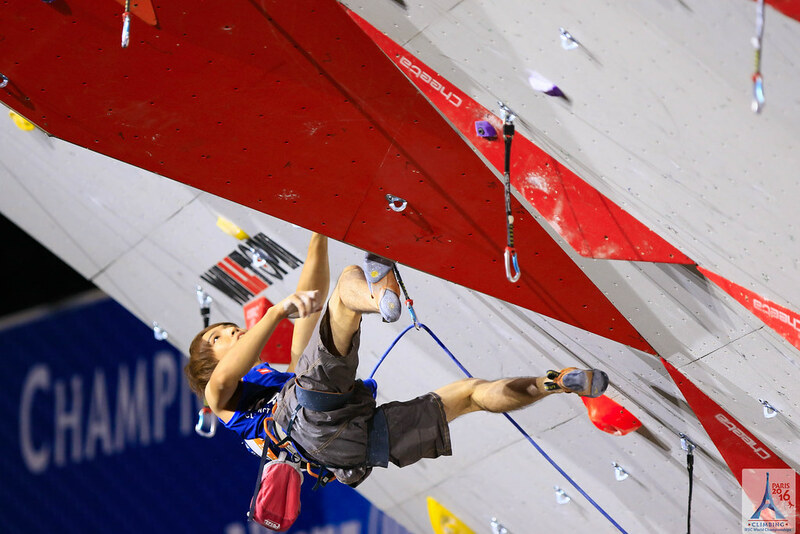 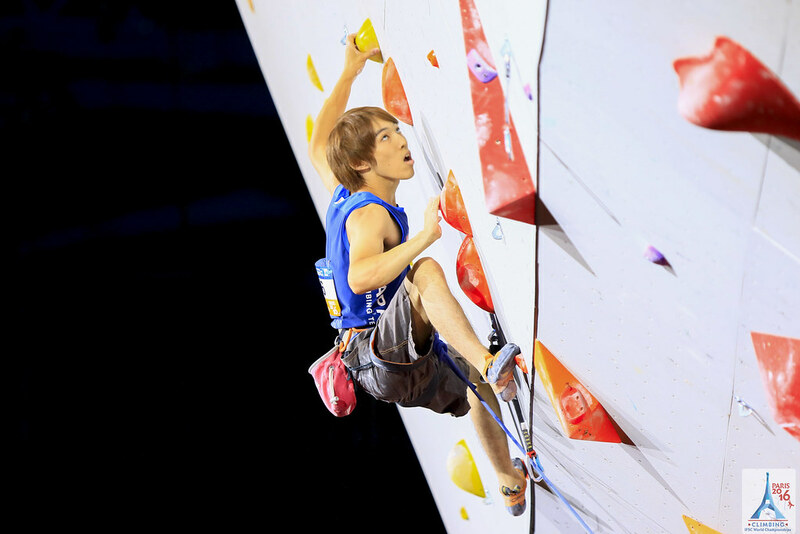 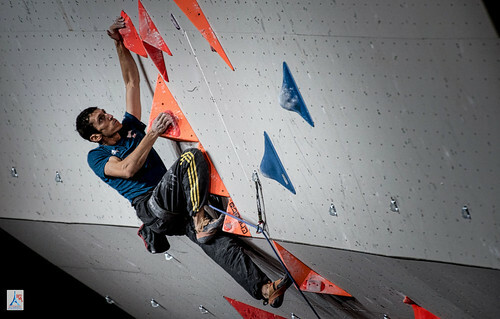 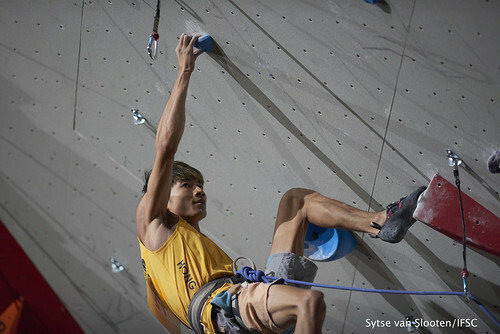 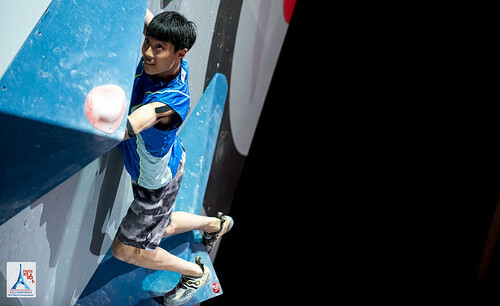 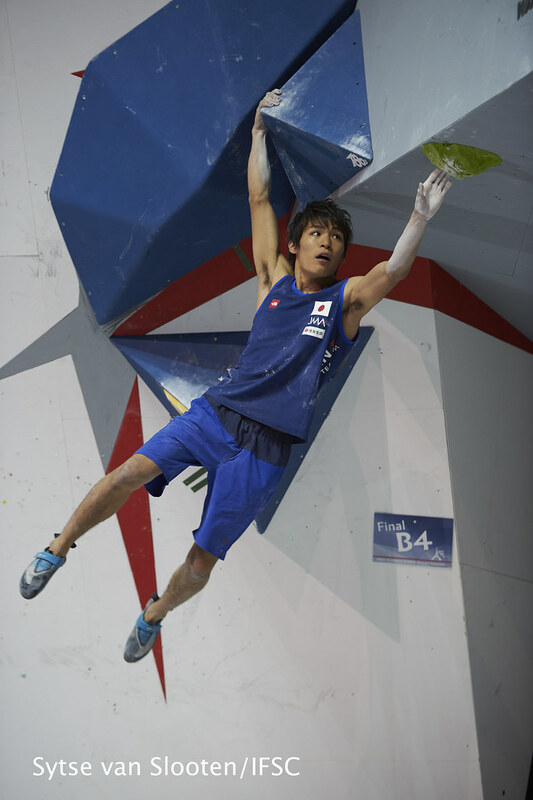 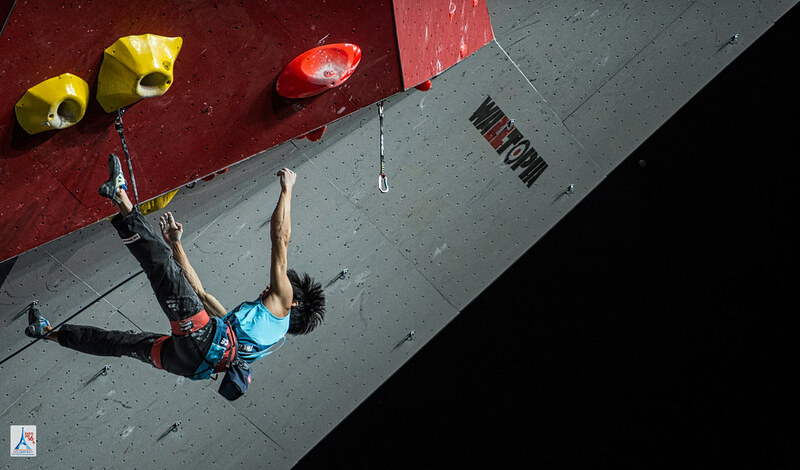 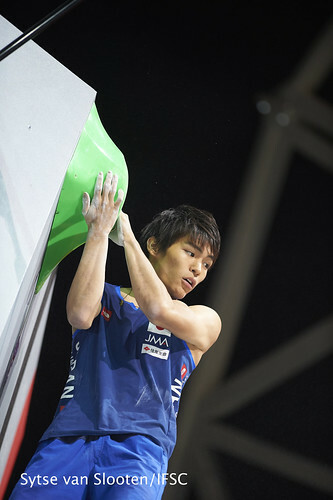 In the end, Narasaki became the new world champion with a Top on M4, completing three problems in fewer attempts than Ondra. 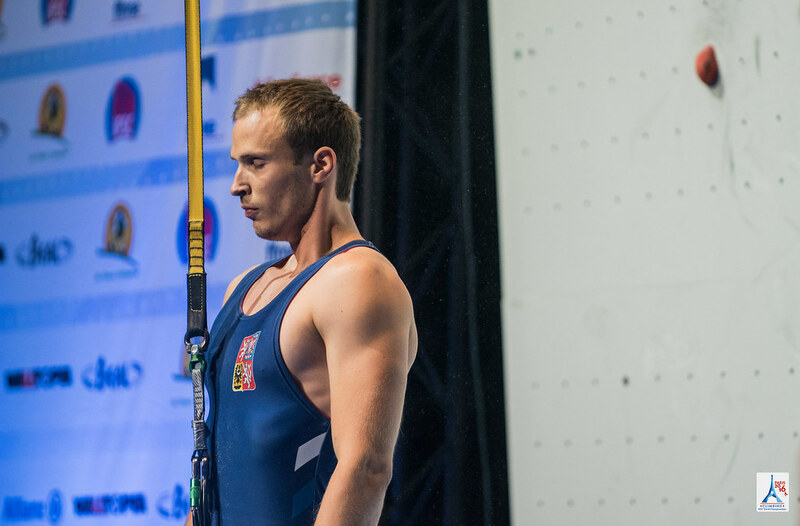 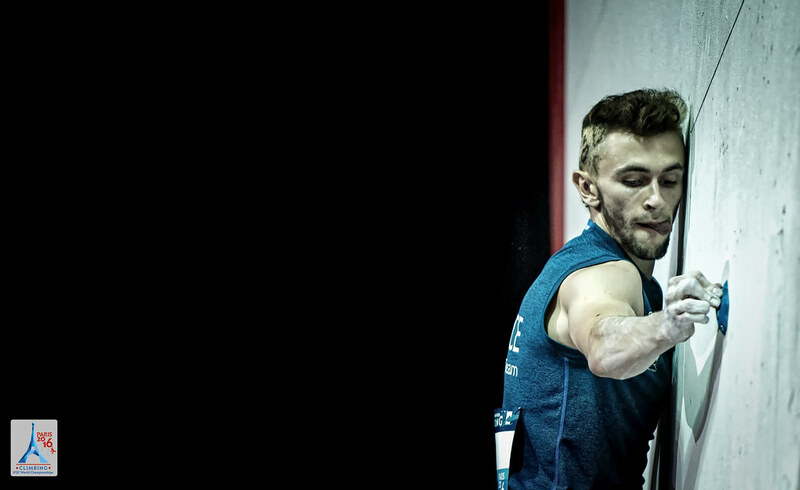 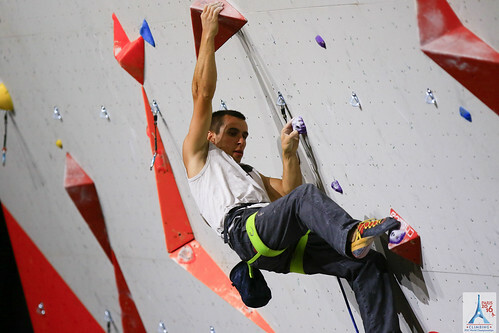 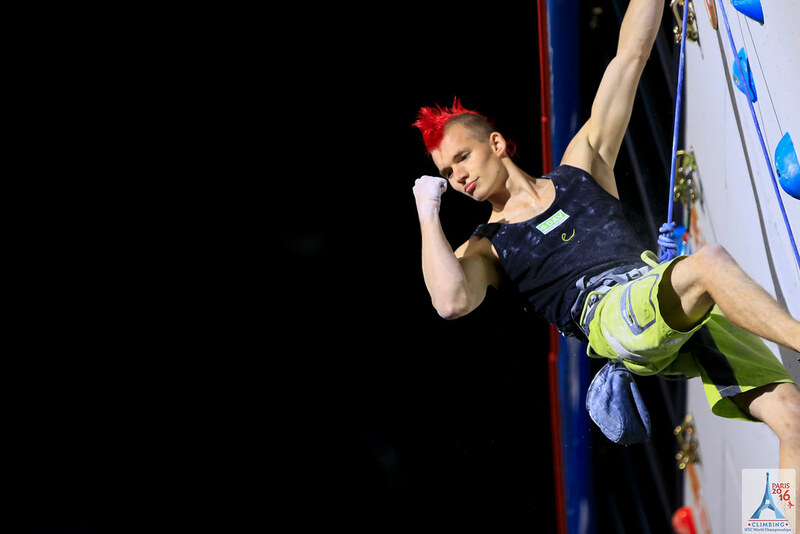 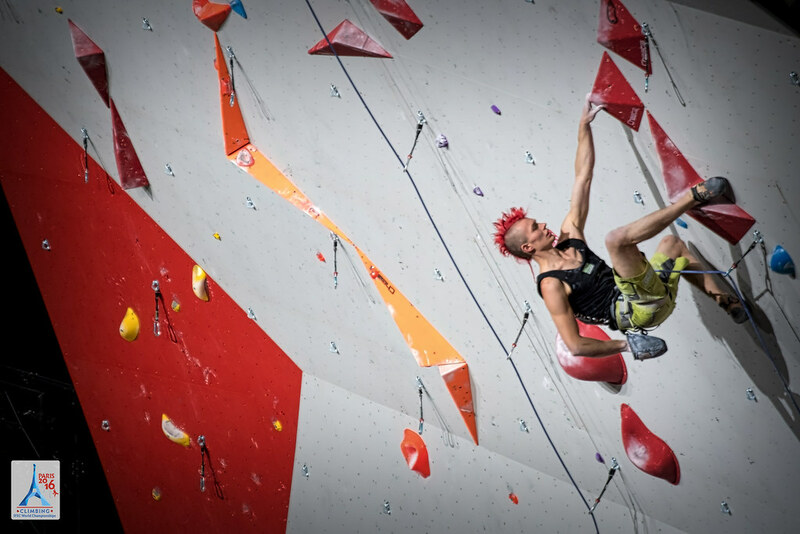 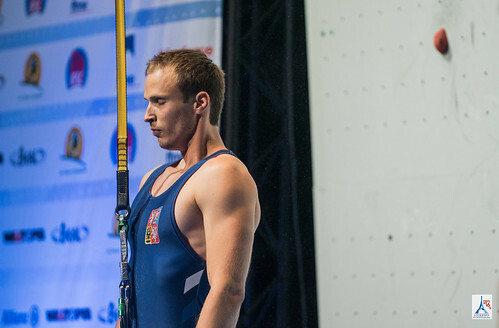 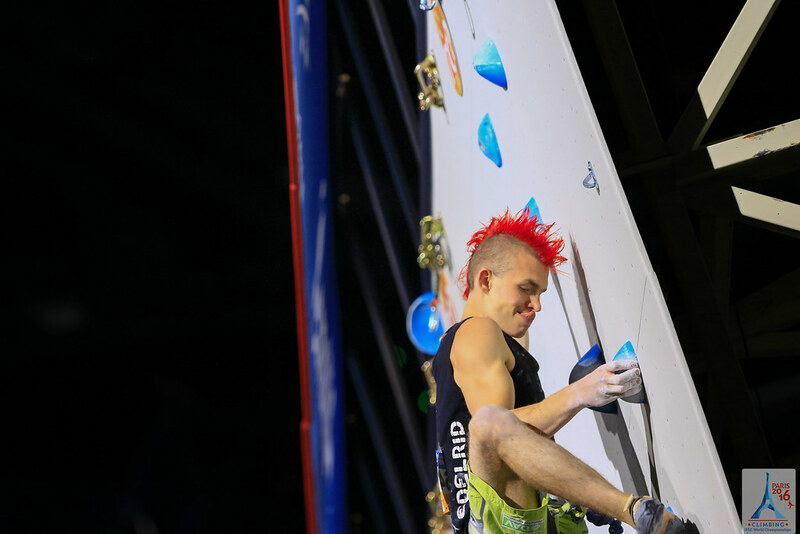 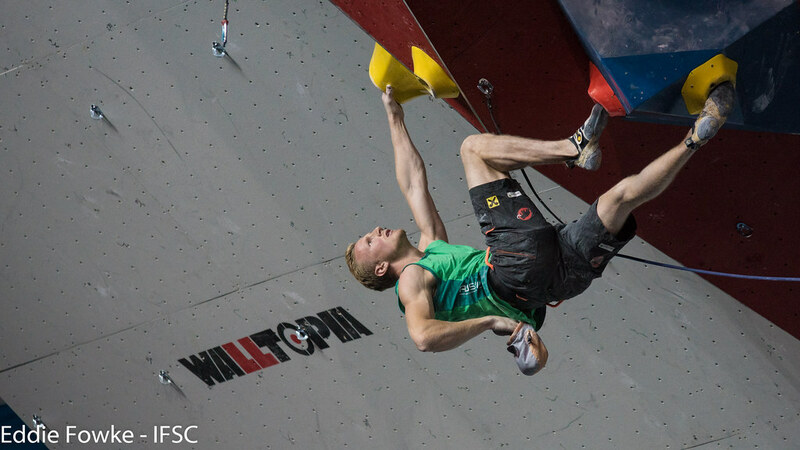 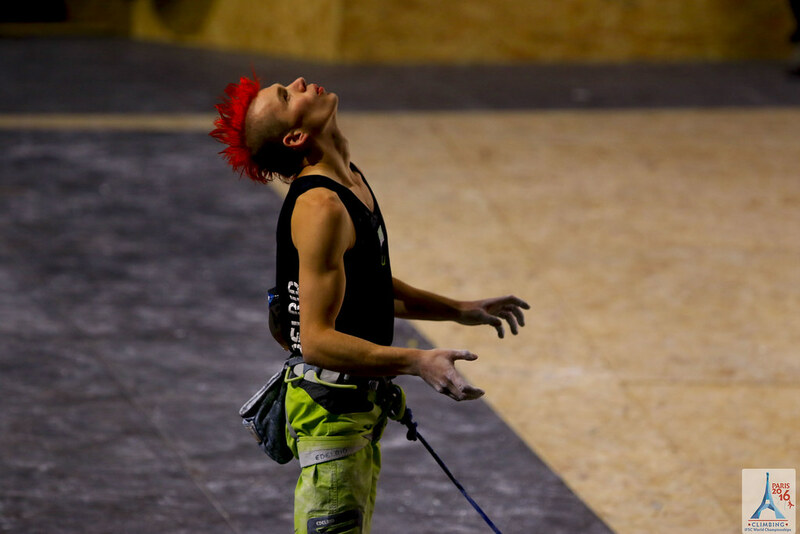 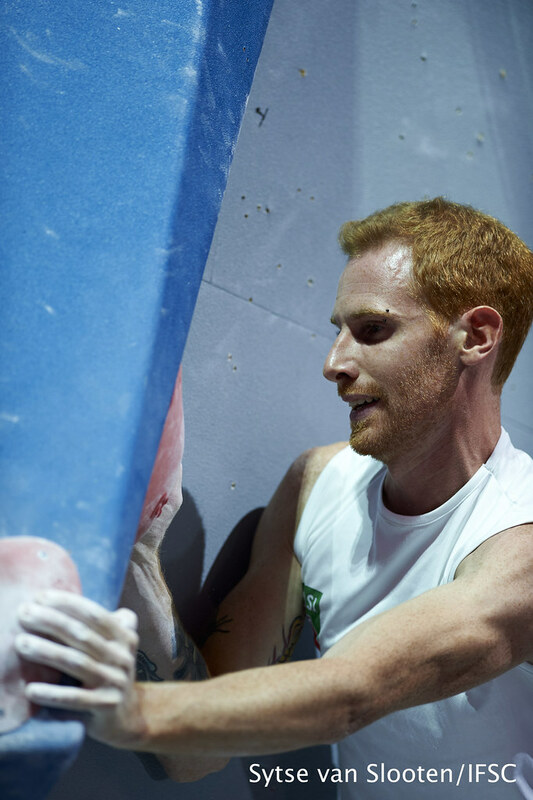 Not long after Bouldering Finals ended, Marcin Dzienski extended his winning streak to four IFSC competitions. 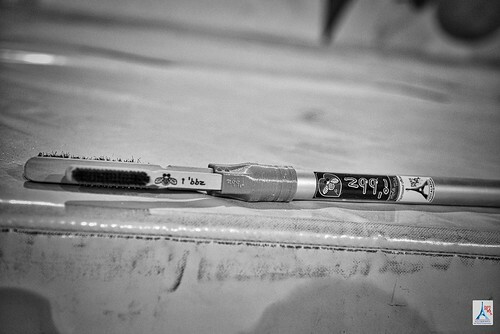 The Polish speedster posted a 5.83 in the final match against Reza Alipourshenazandifar for the top spot on the podium. Alipoushenazandifar slipped in the final race, but the Iranian Athlete ousted Aleksandr Shikov by one hundredth of a second in an emotional semi-final face-off. 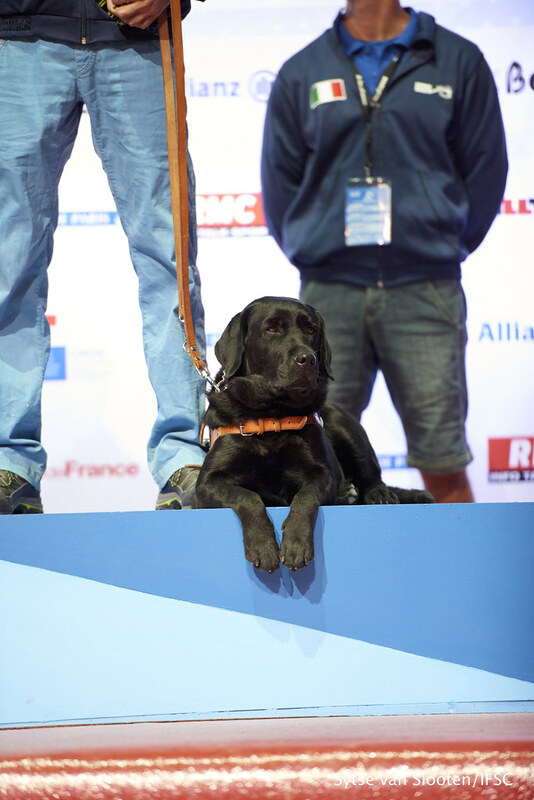 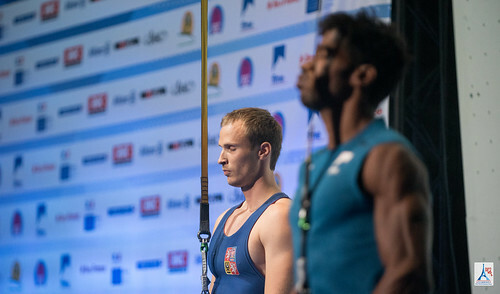 Shikov claimed the remaining medal for Russia with a 5.95, besting the crowd favorite, Bassa Mawem of France. 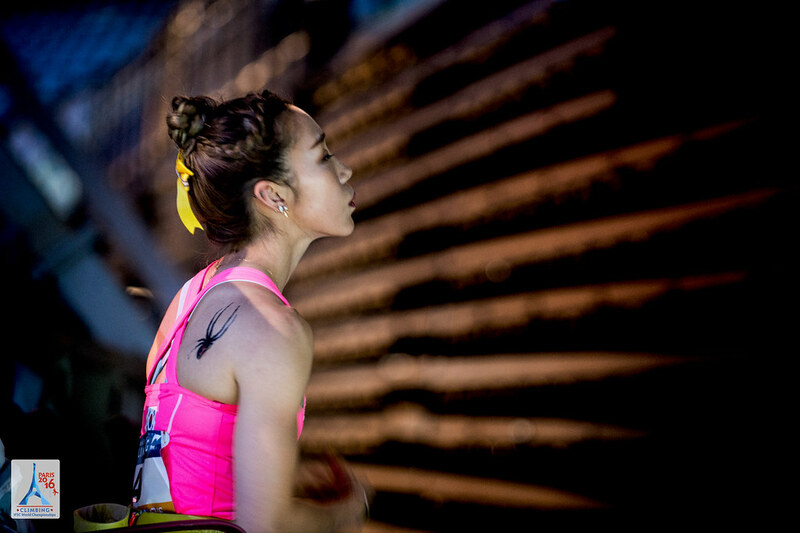 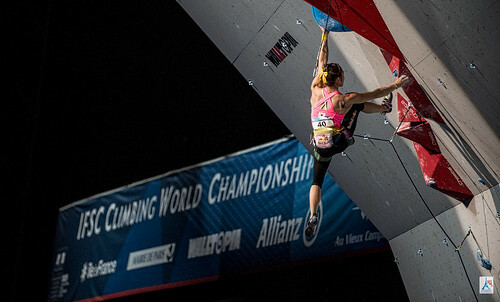 The best Lead Women in the world closed out Saturday's events. 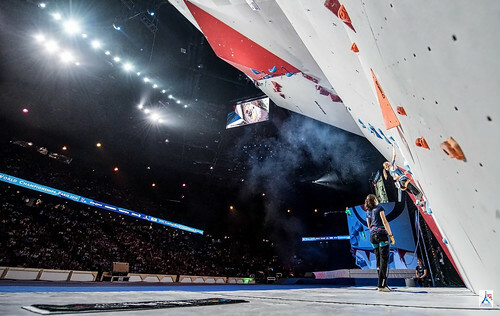 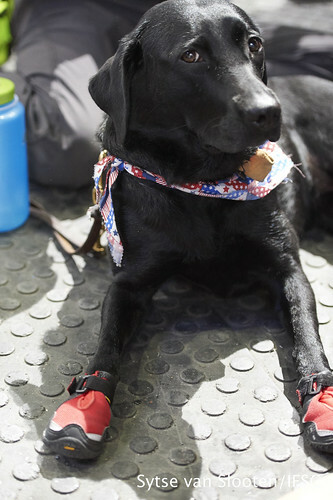 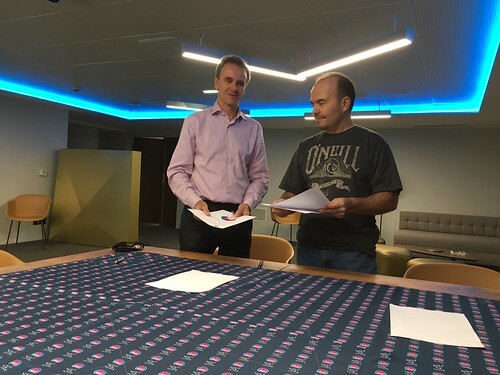 Unforgiving blue slopers kept four finalists at bay, and the five other Athletes in harnesses slapped chalk on the penultimate sloper. Anak Verhoeven of Belgium was the first to stick the move and clip the chains, a feat which stood alone until the final climber of the day: Slovenian Janja Garnbret. 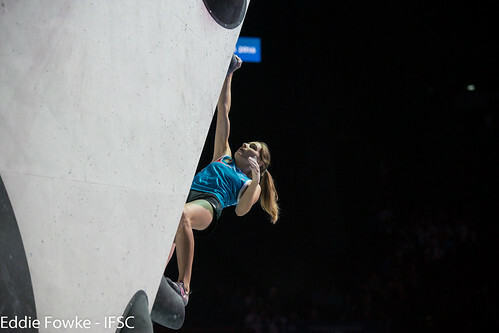 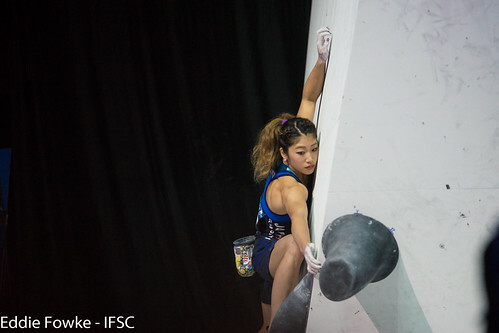 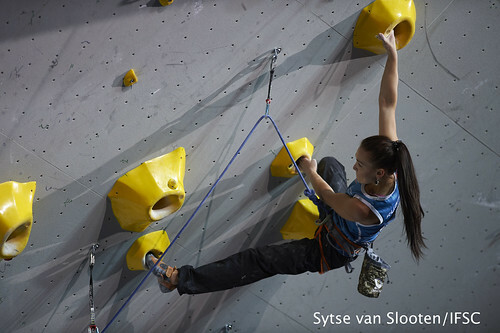 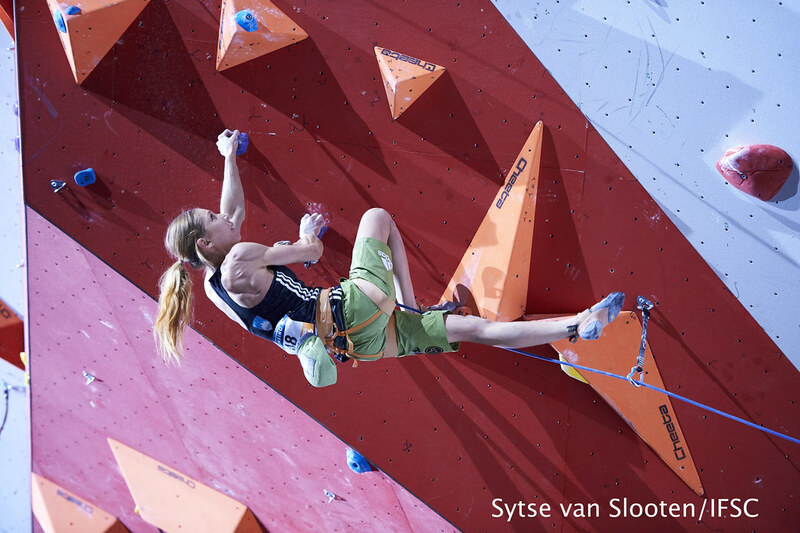 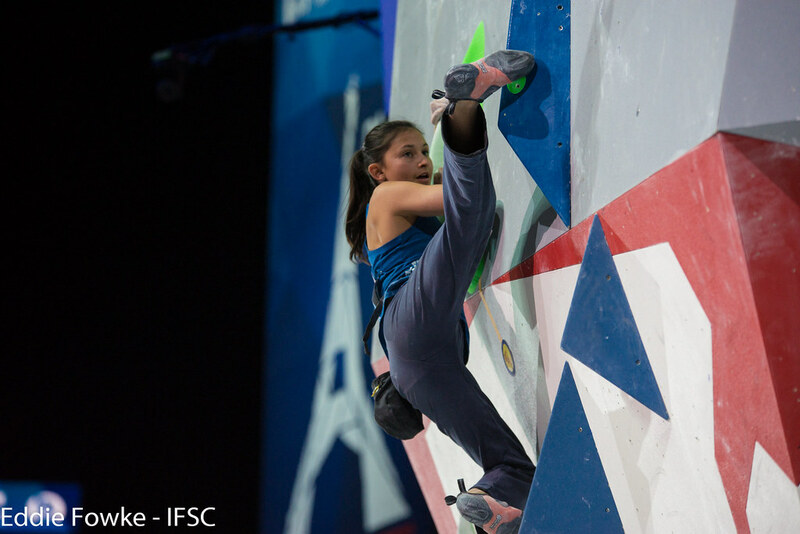 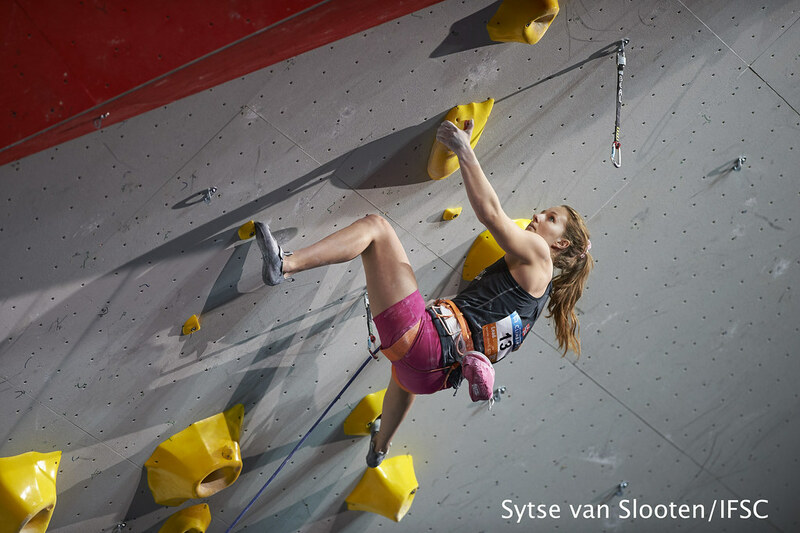 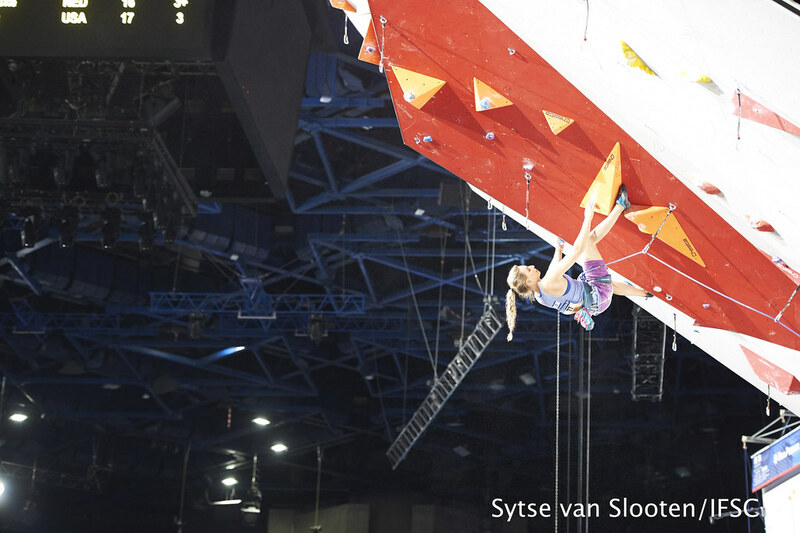 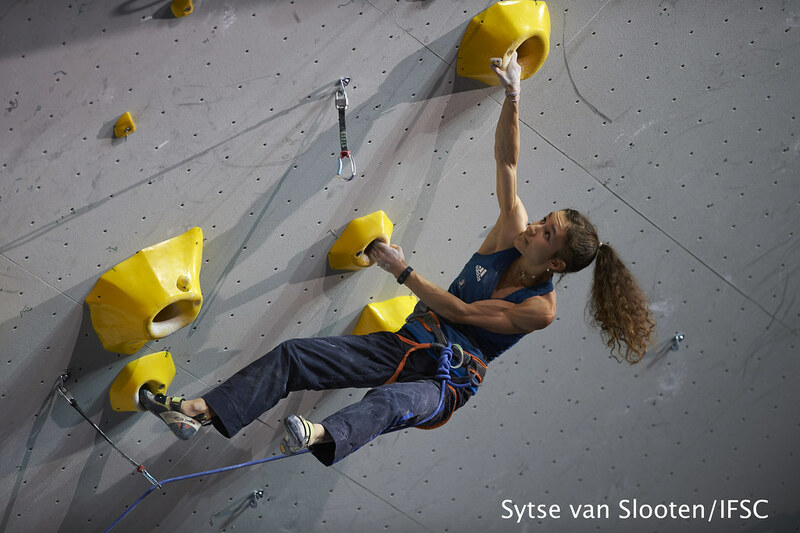 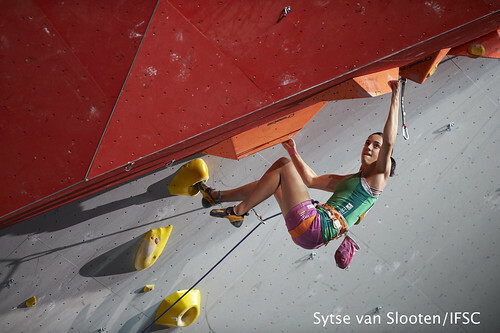 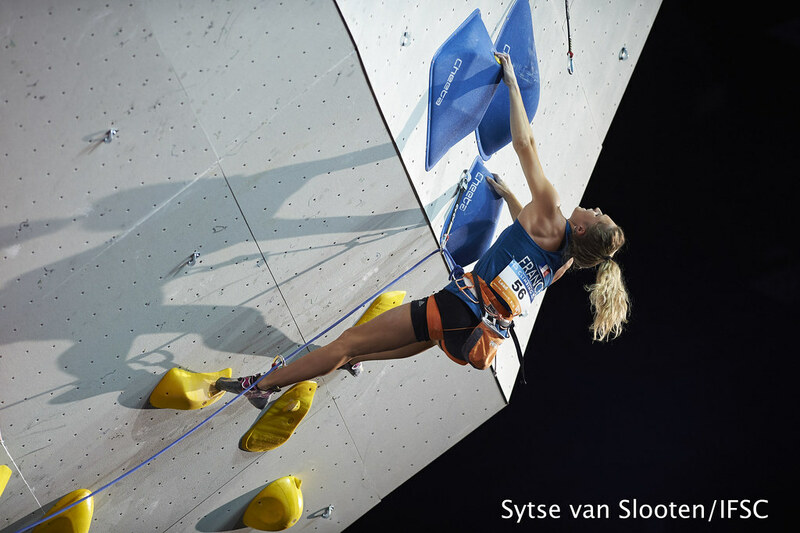 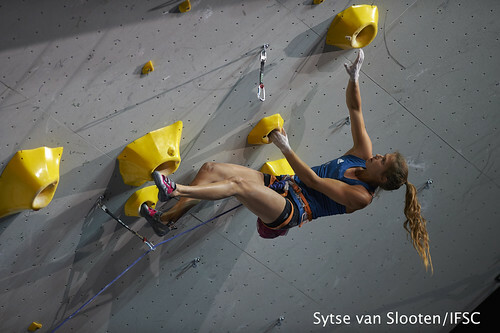 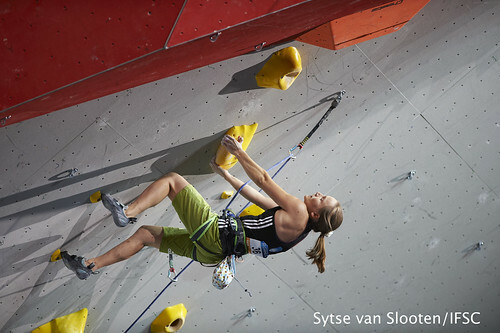 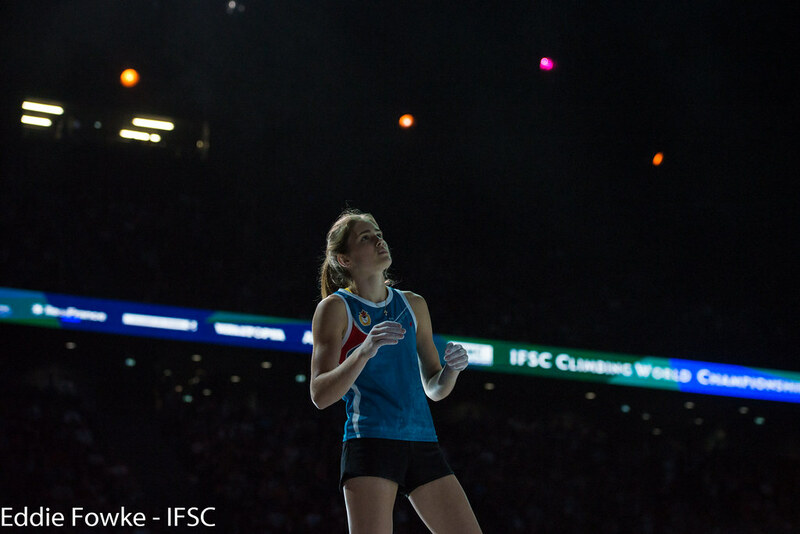 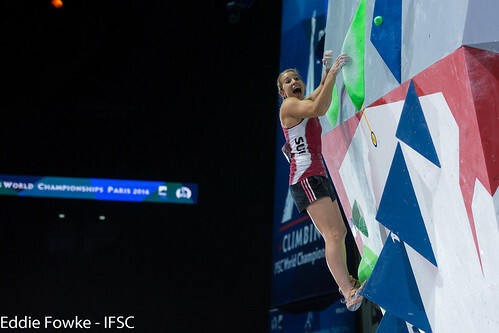 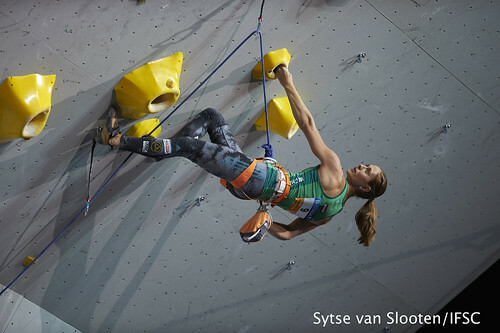 The seventeen-year-old and leader of the 2016 Lead World Cup rankings matched Verhoeven’s performance with a Top of her own, pounding the wall in celebration. 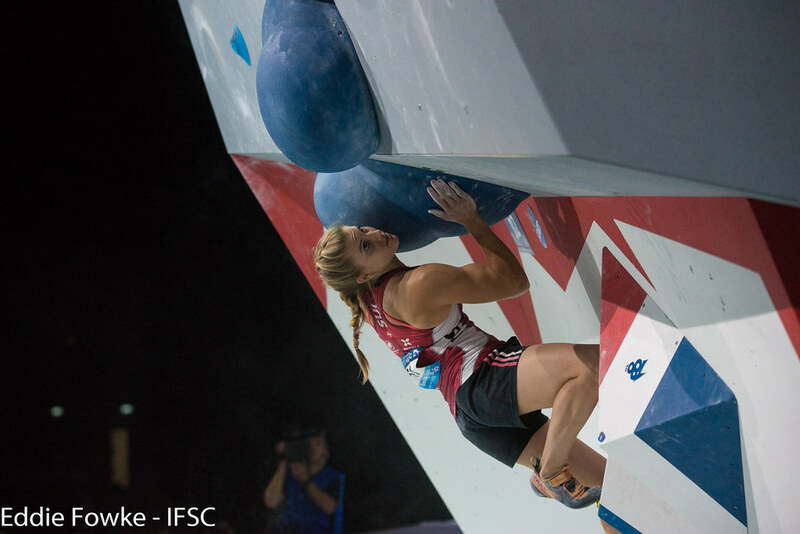 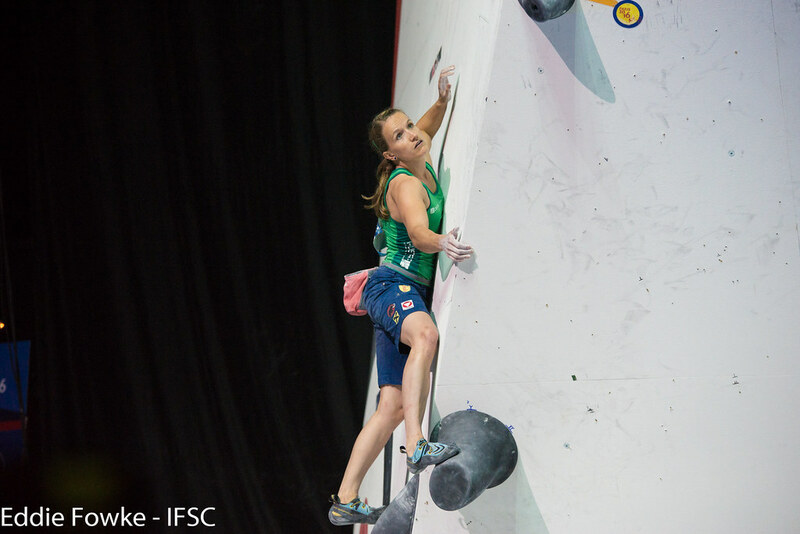 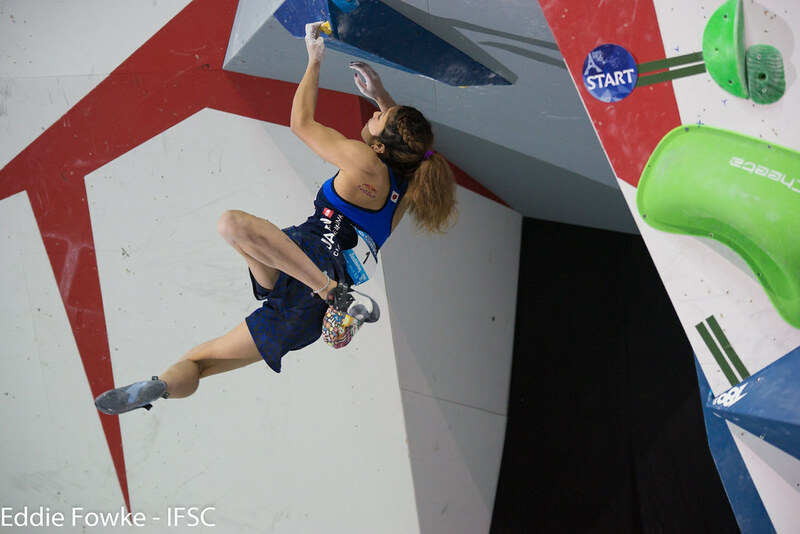 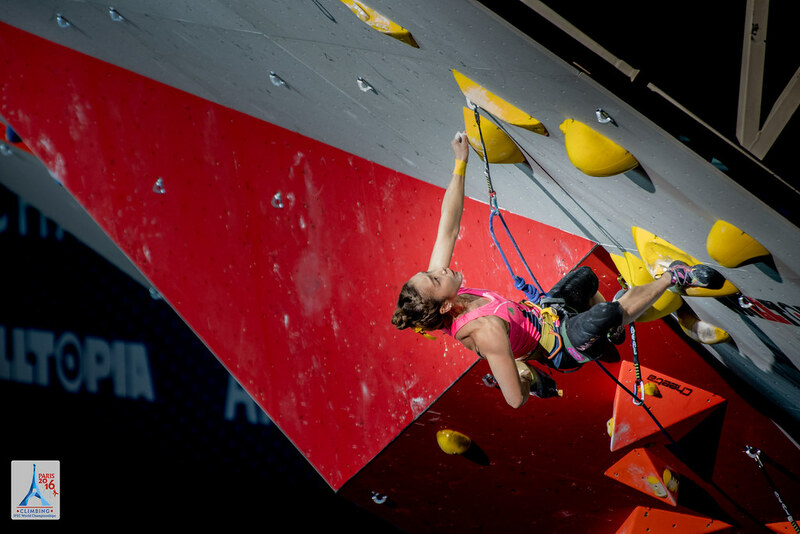 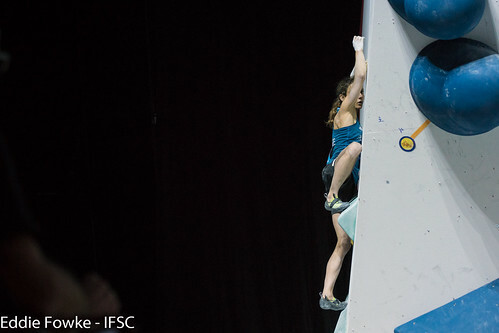 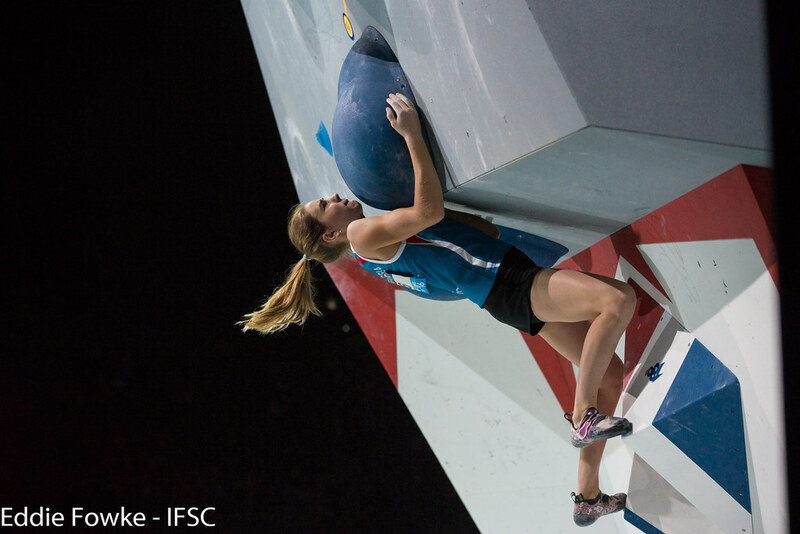 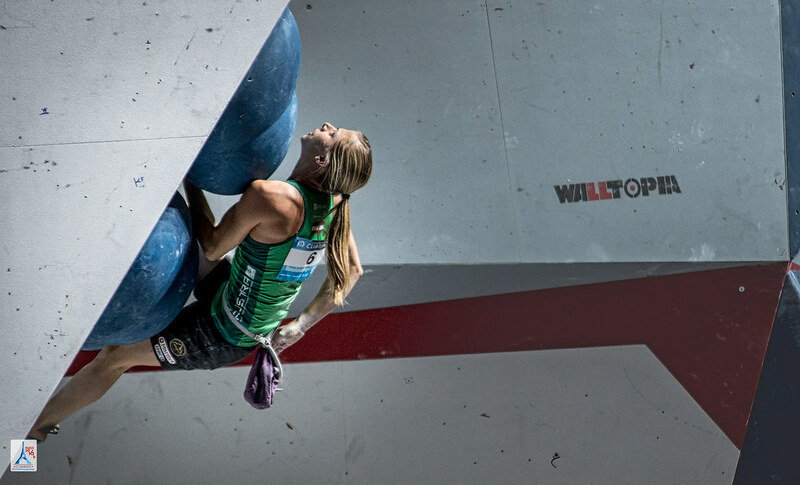 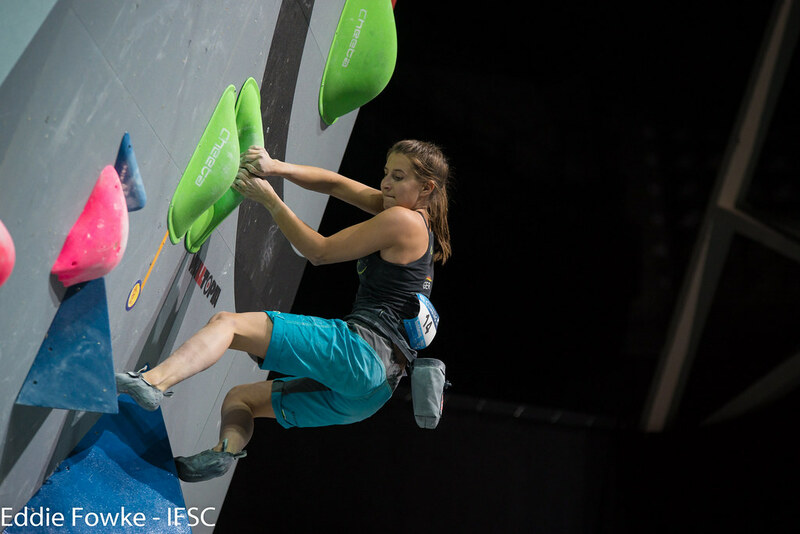 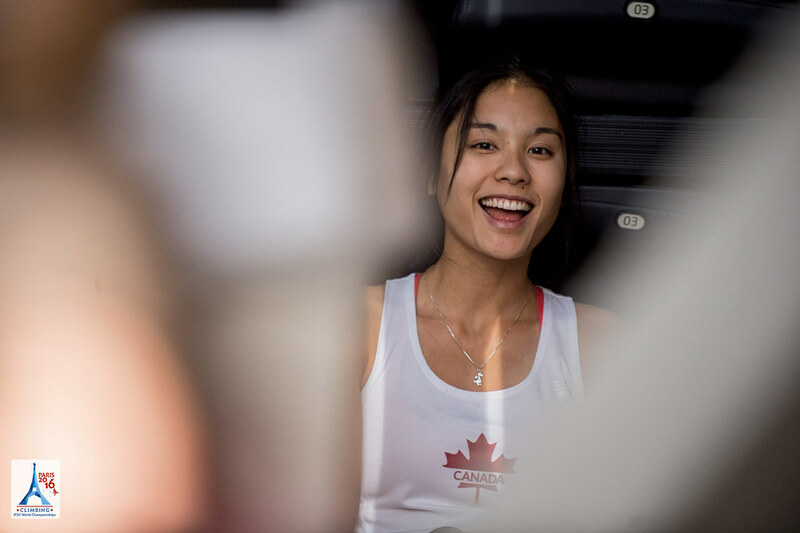 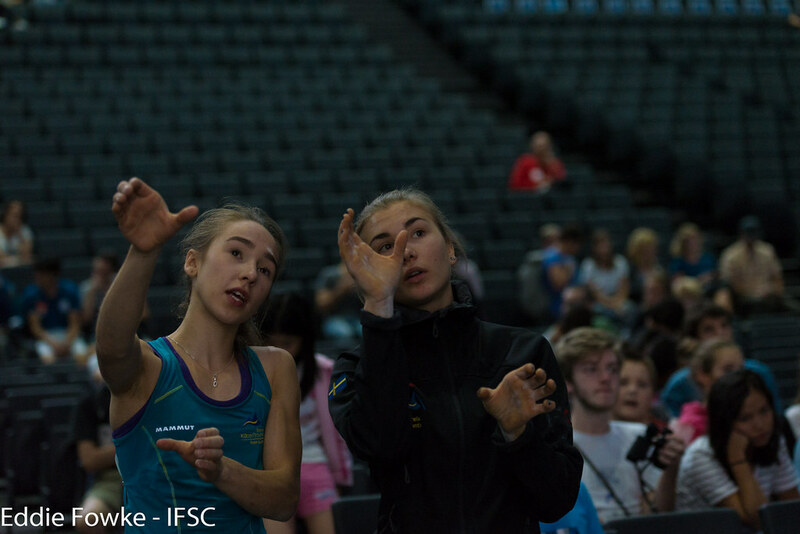 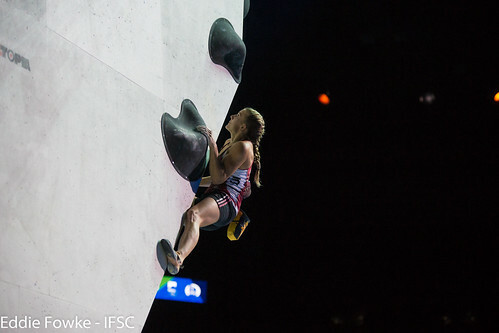 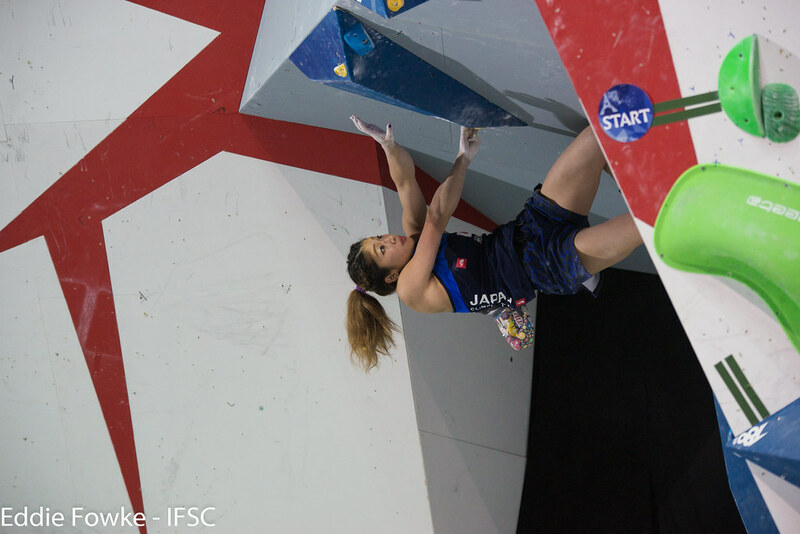 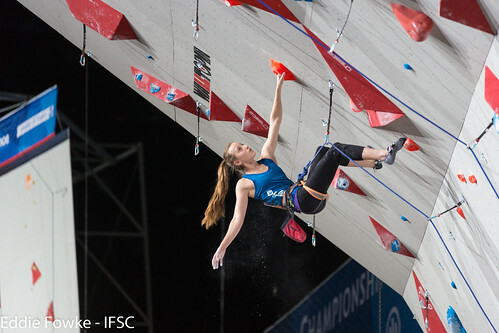 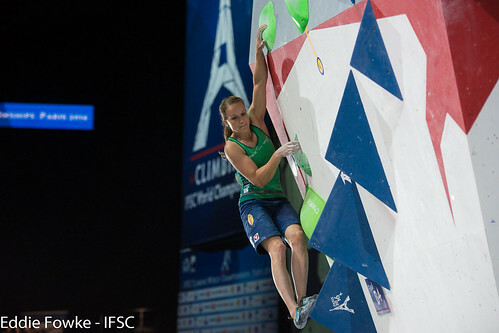 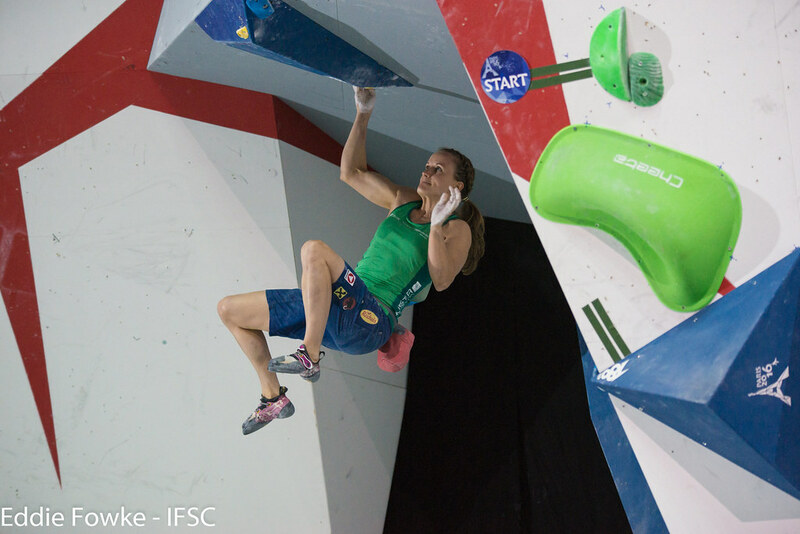 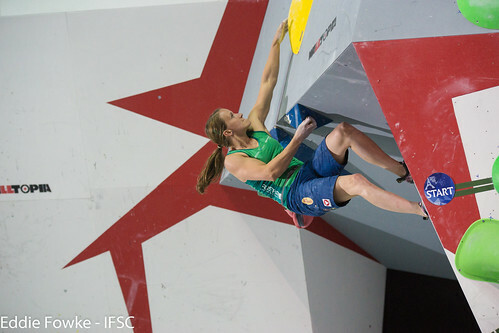 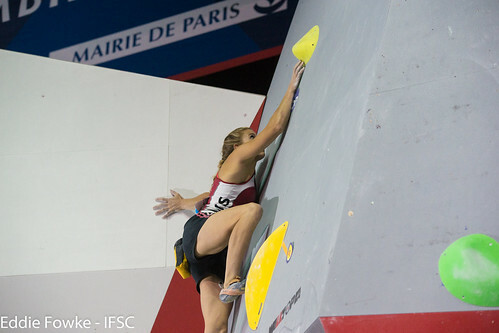 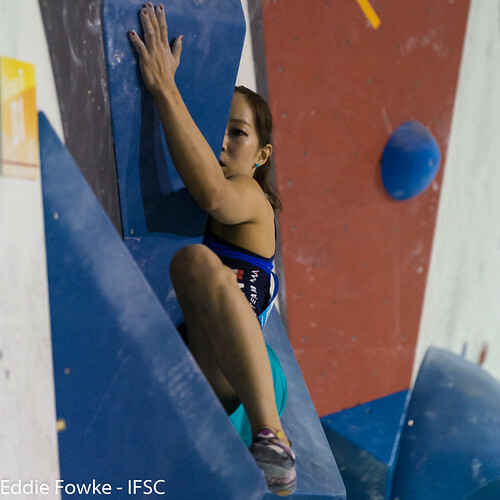 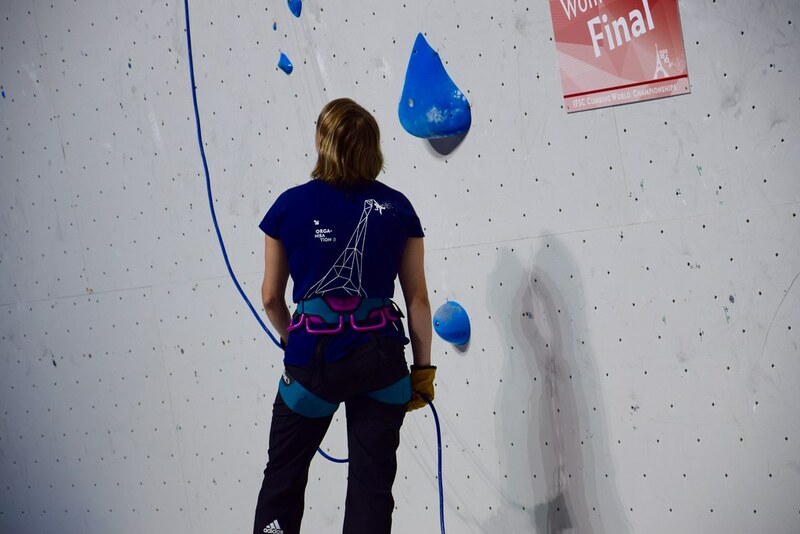 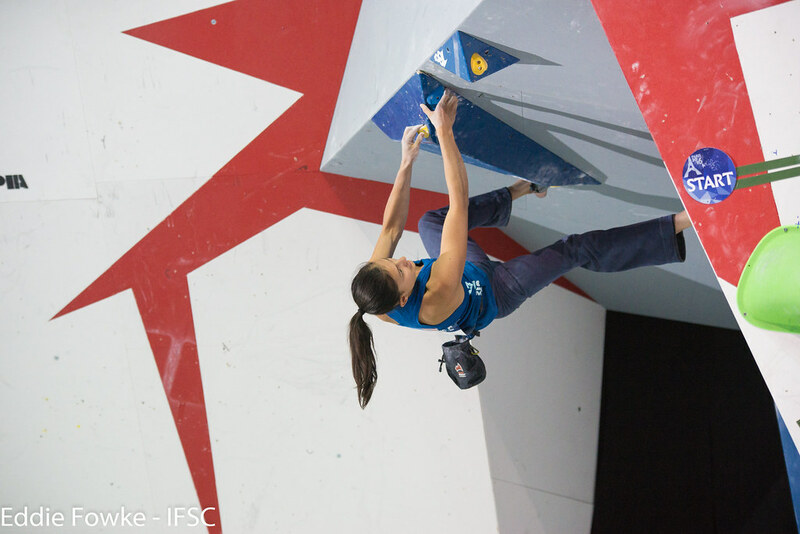 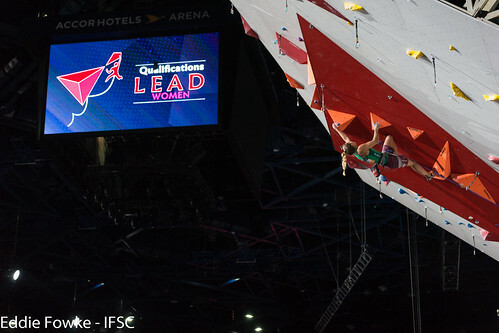 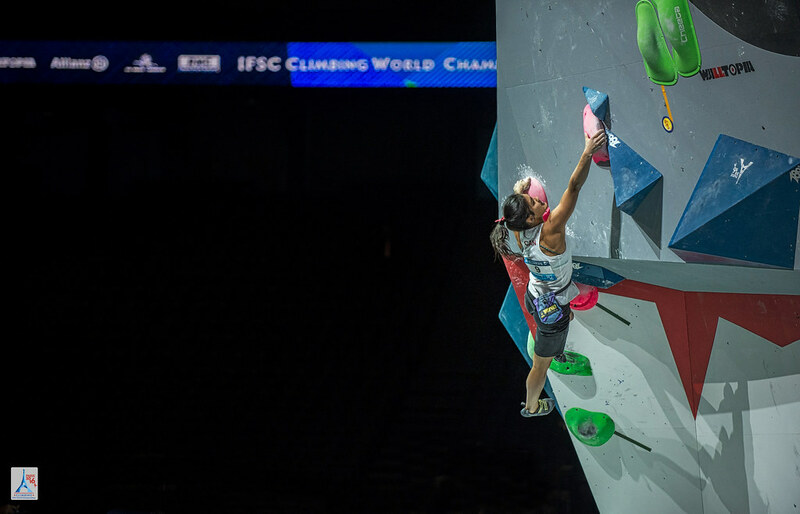 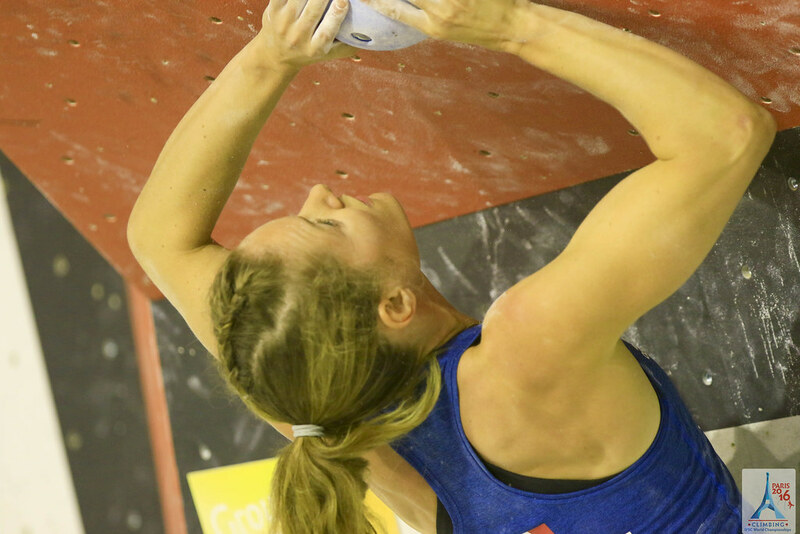 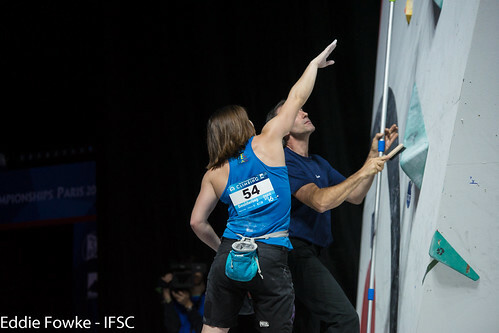 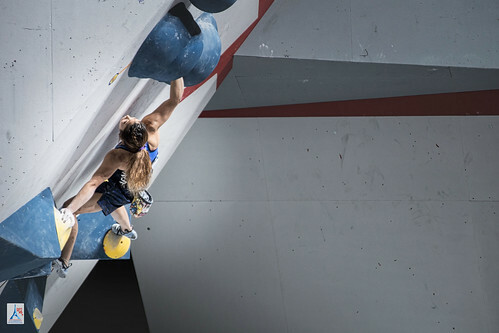 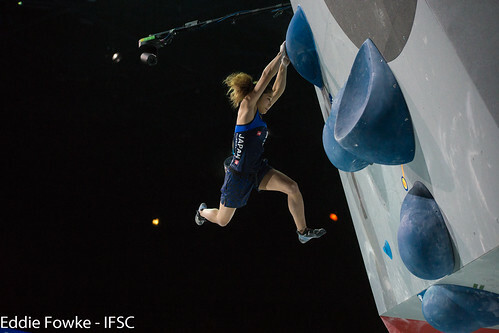 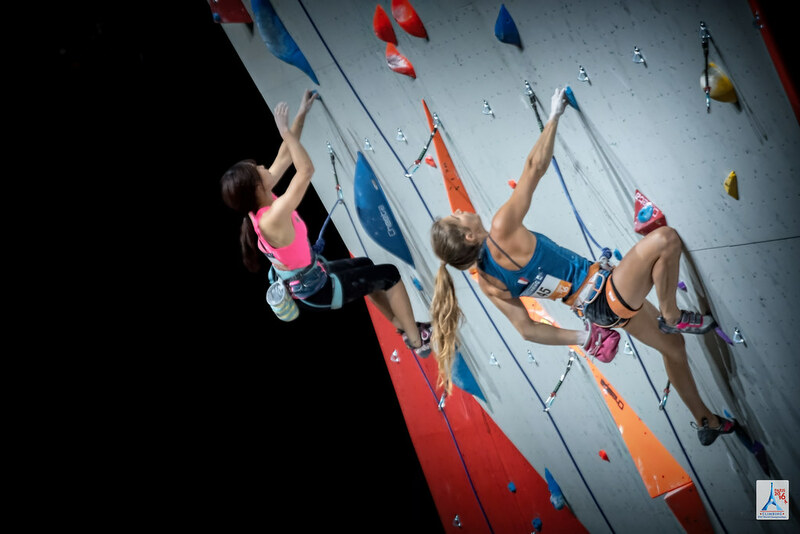 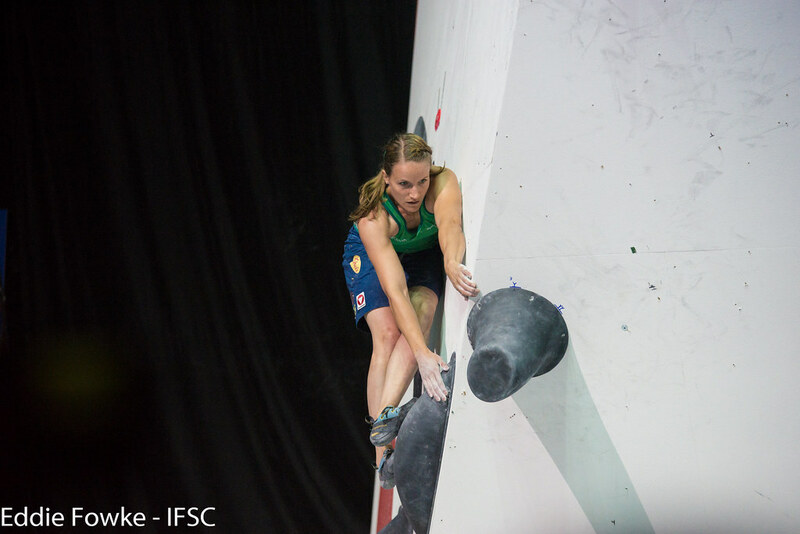 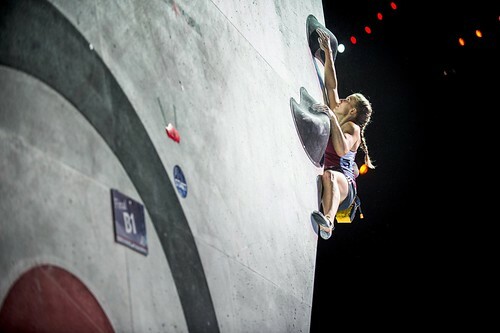 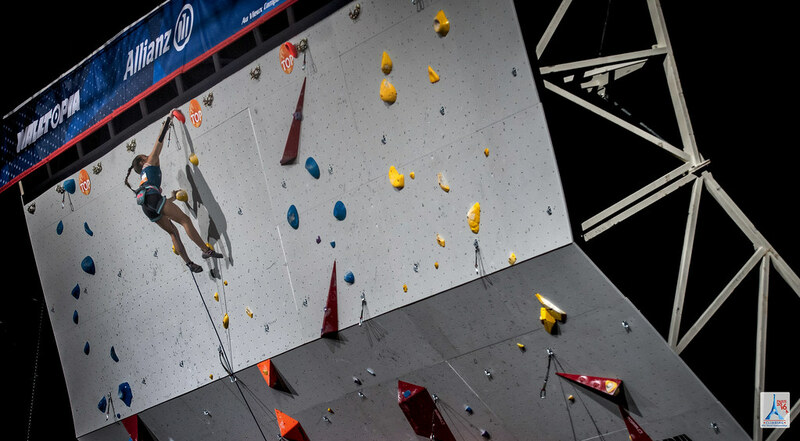 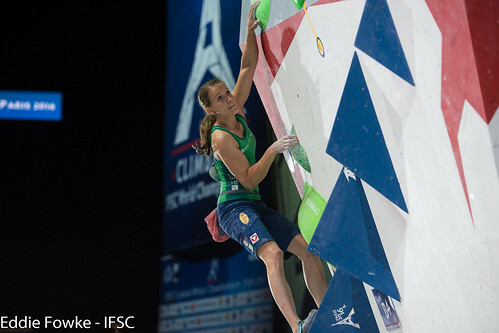 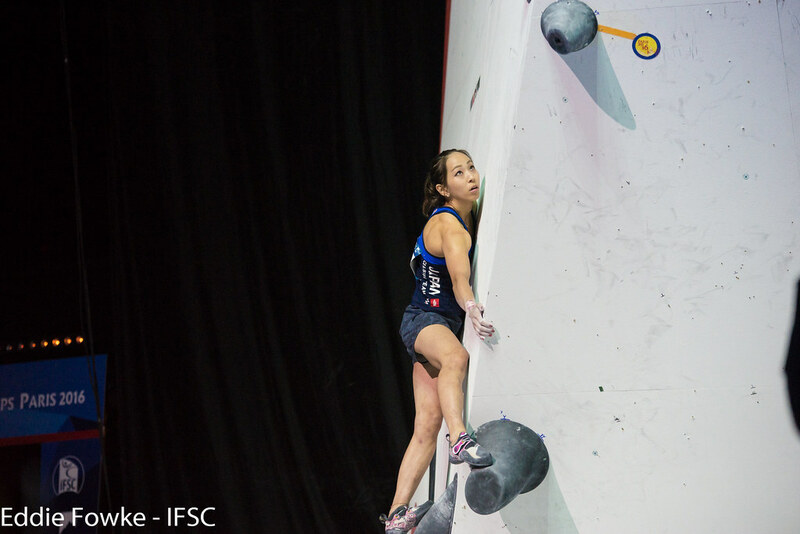 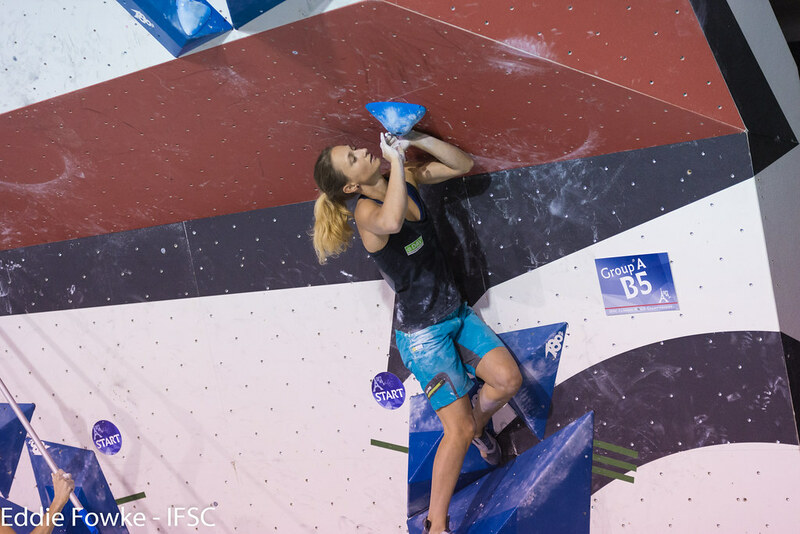 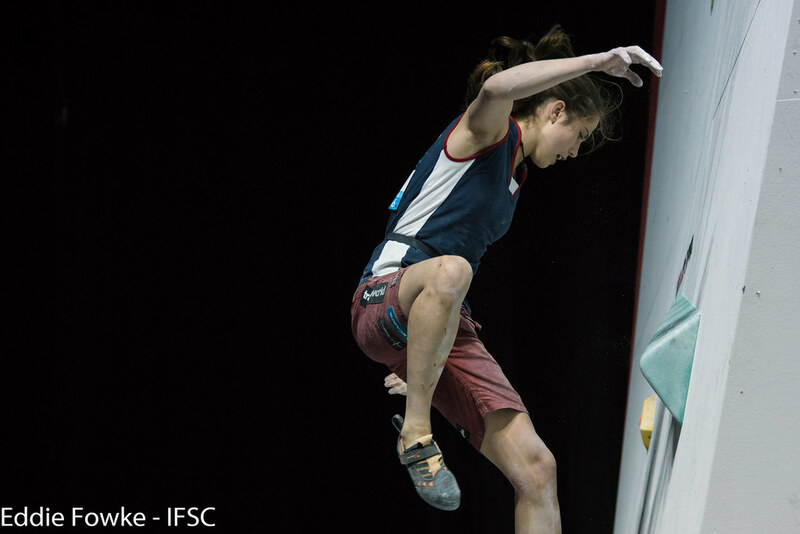 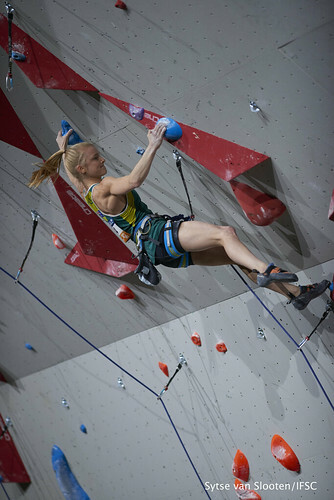 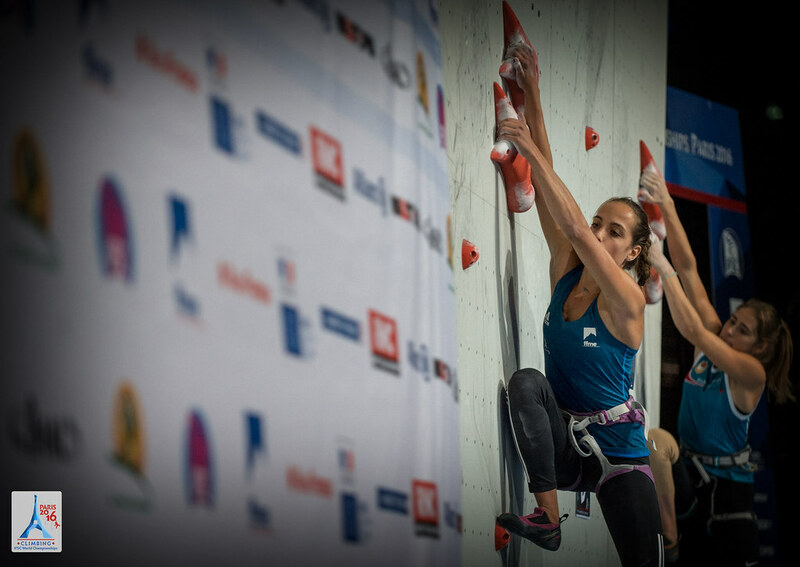 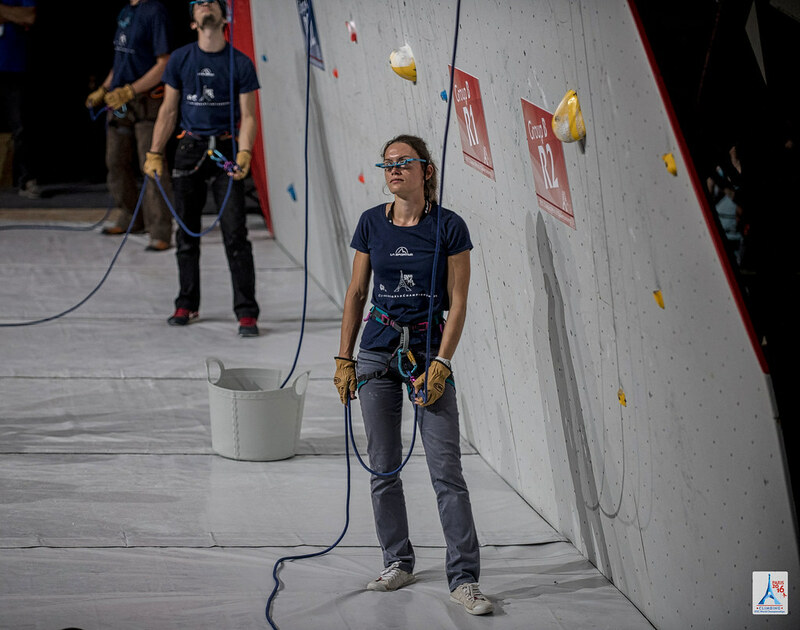 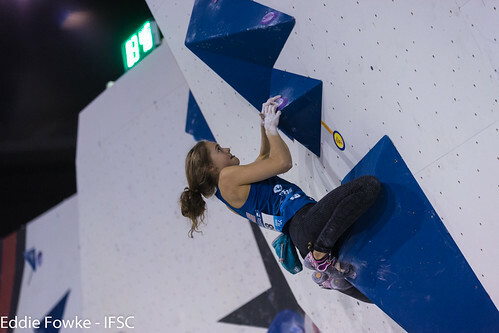 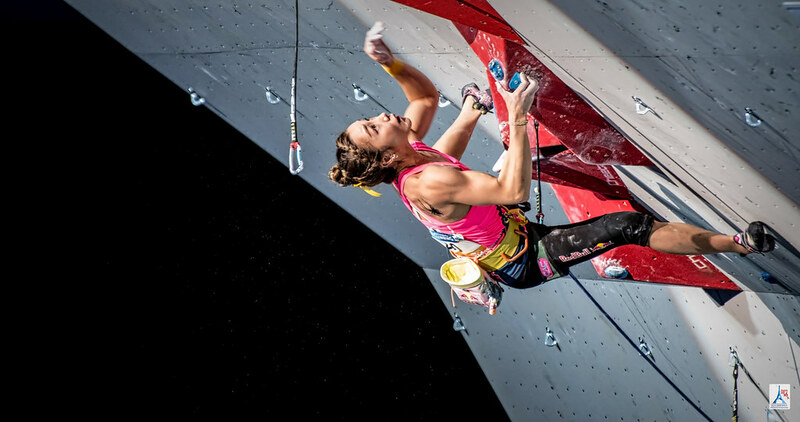 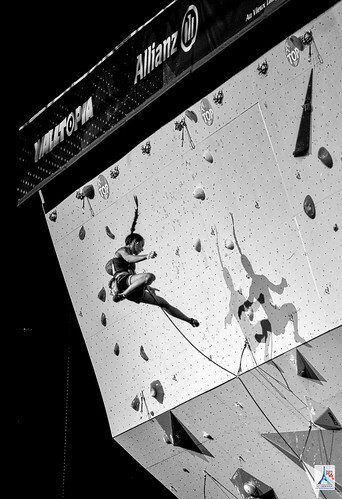 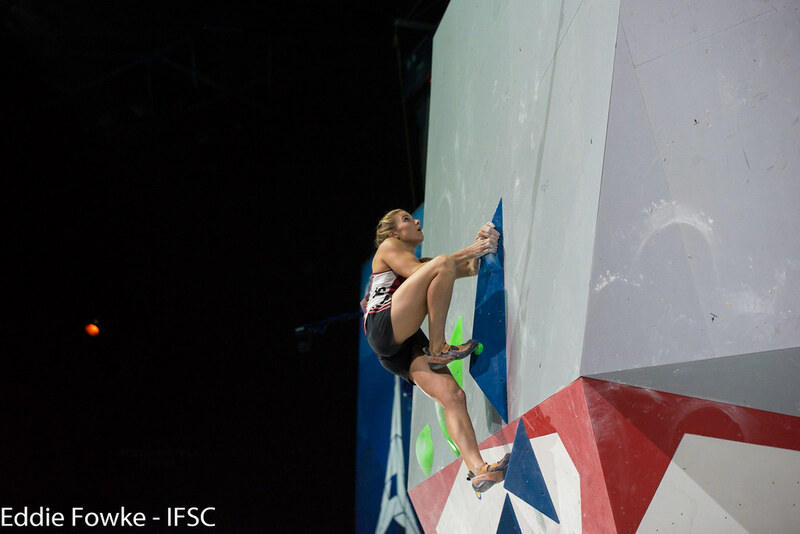 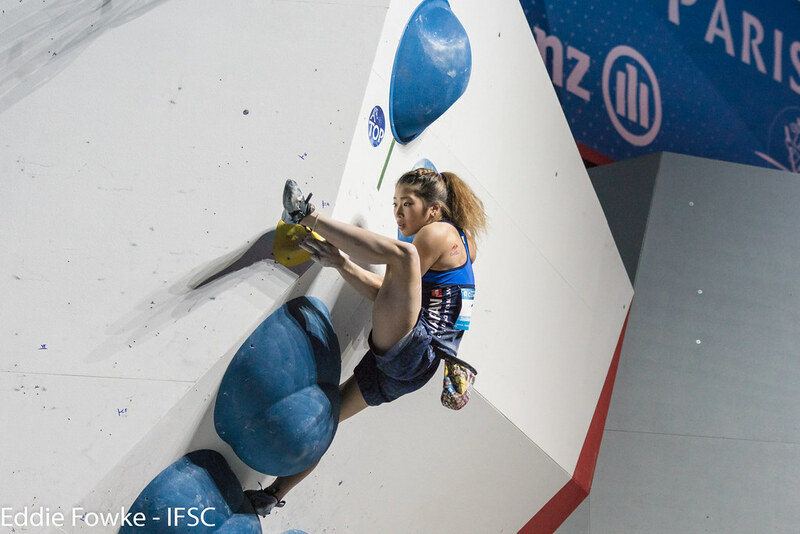 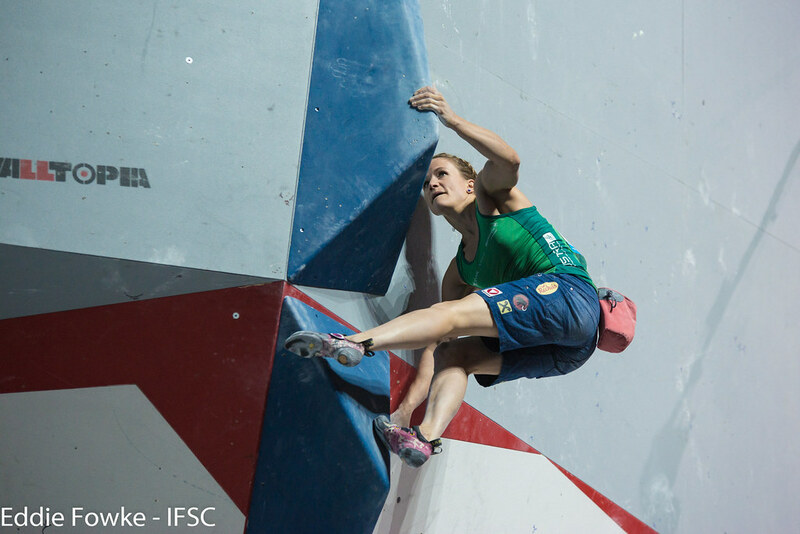 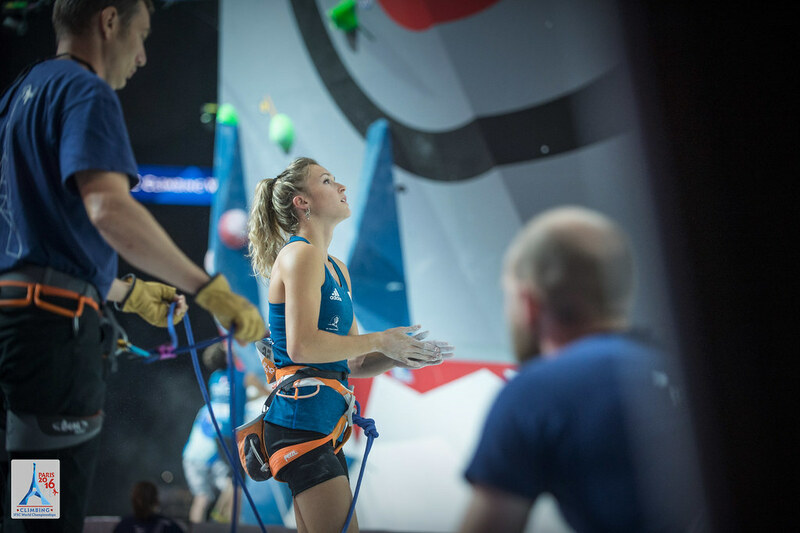 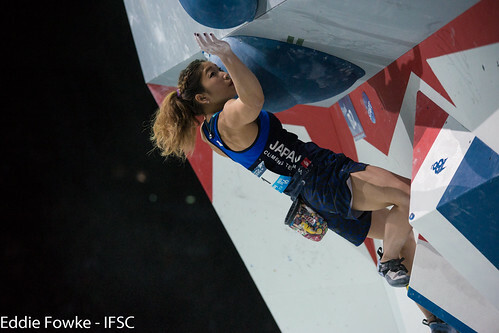 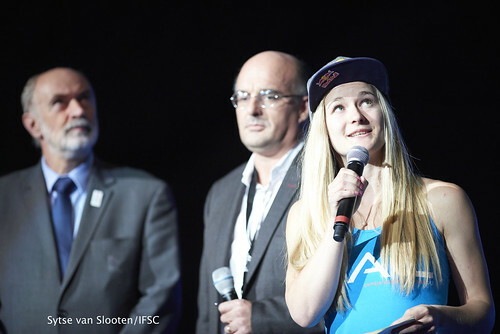 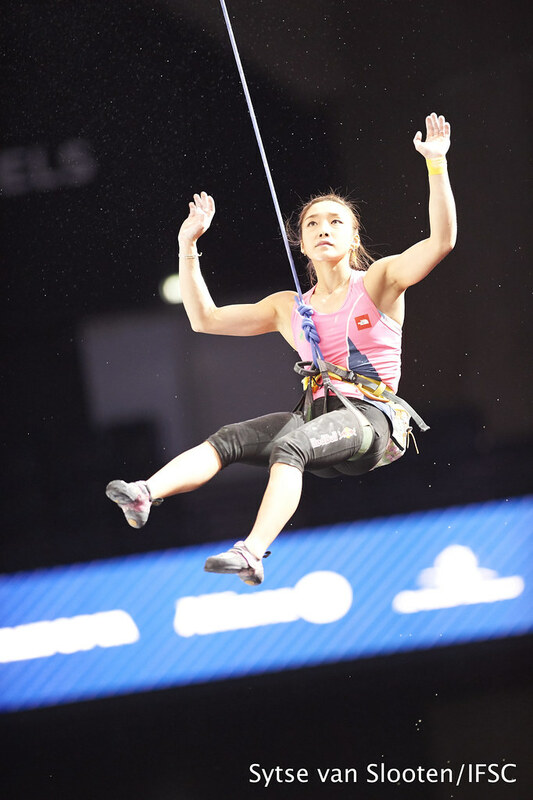 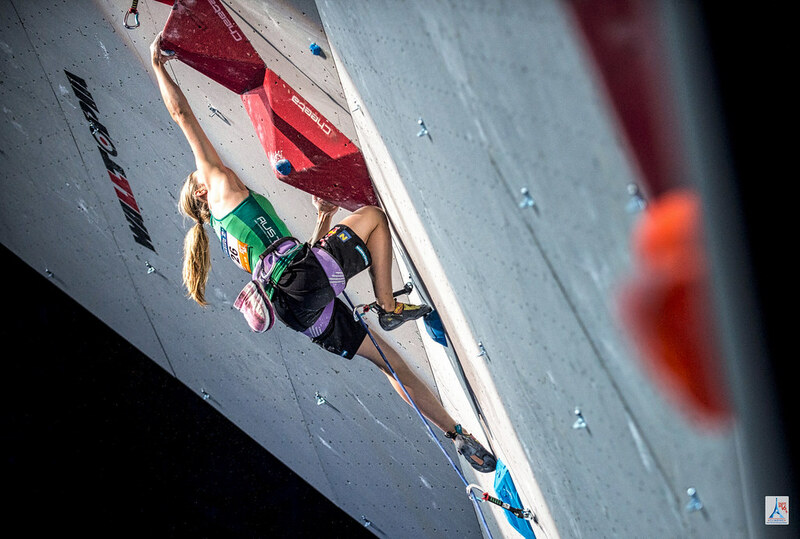 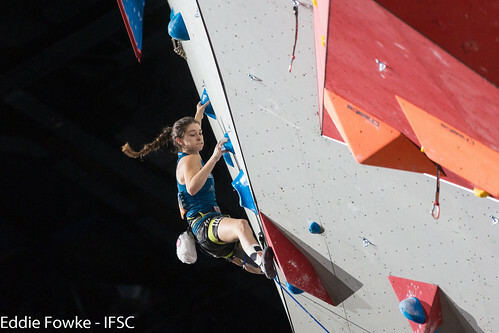 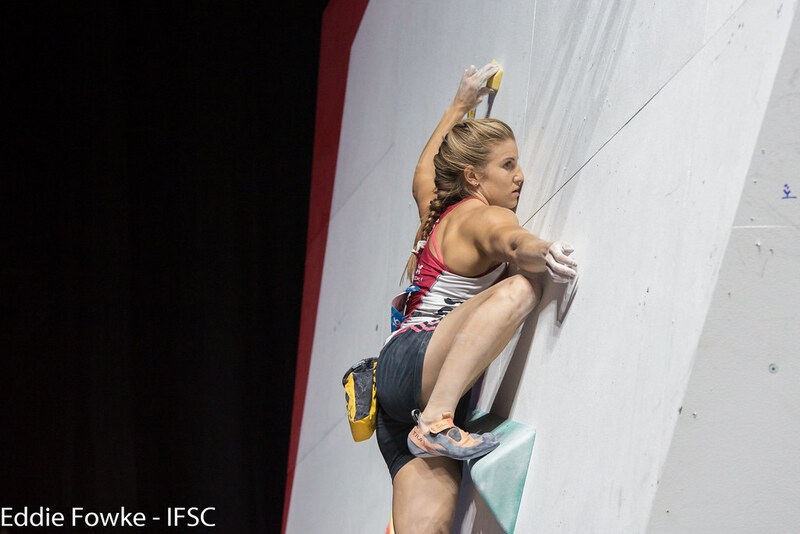 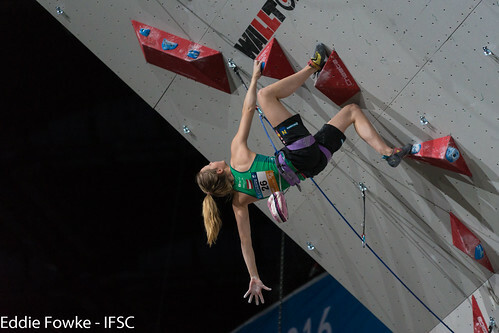 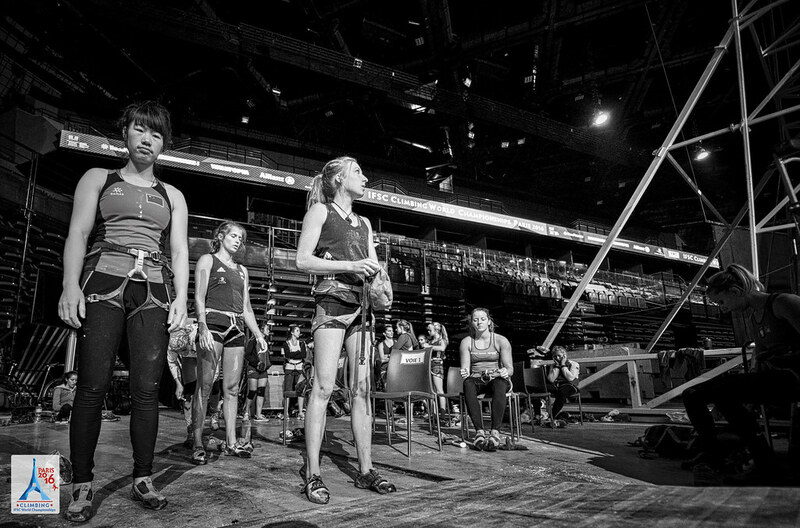 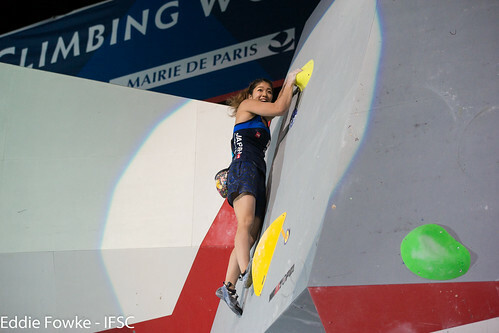 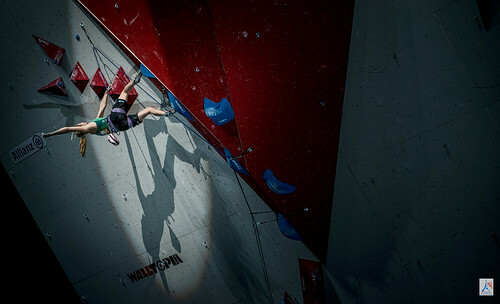 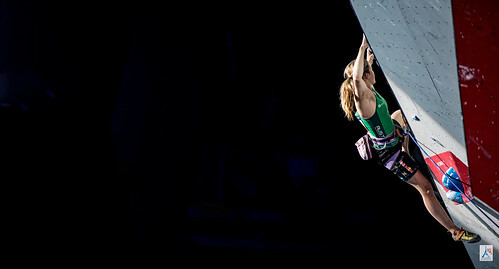 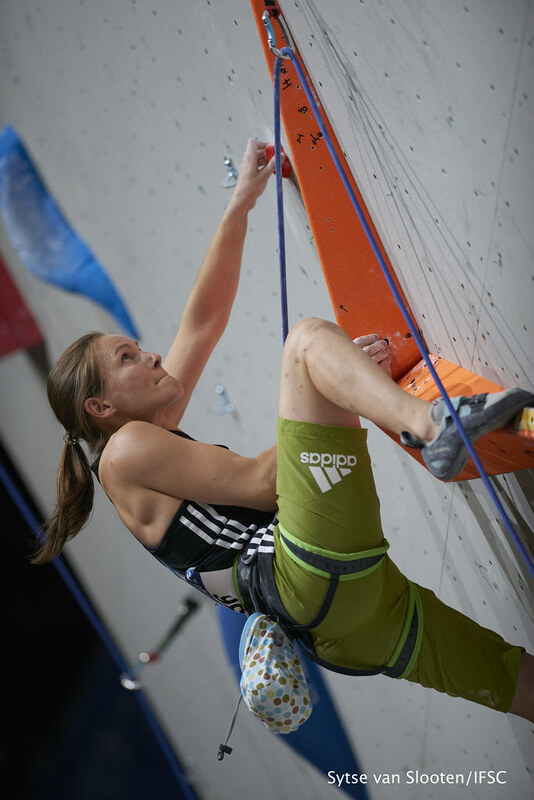 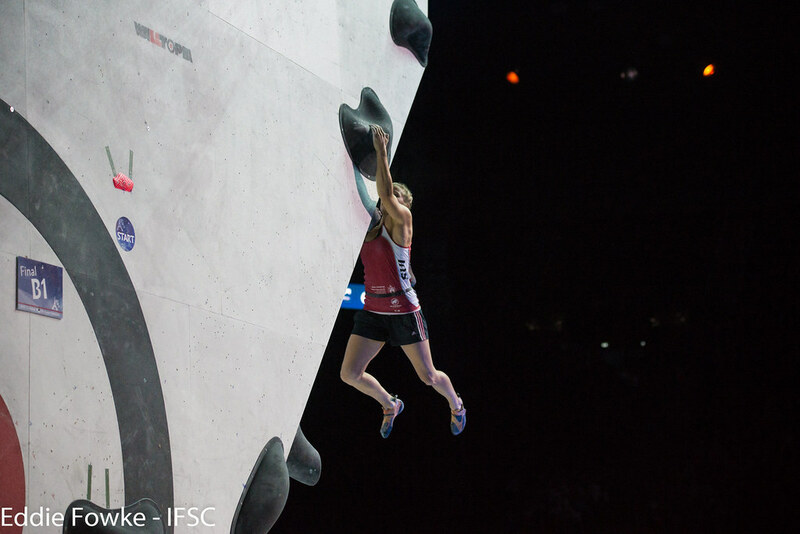 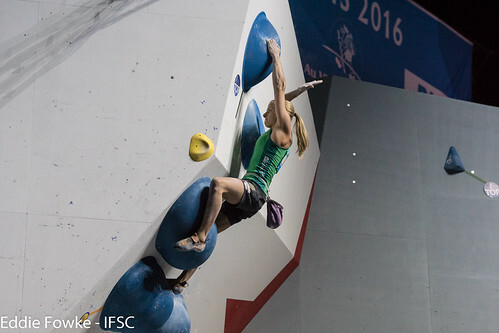 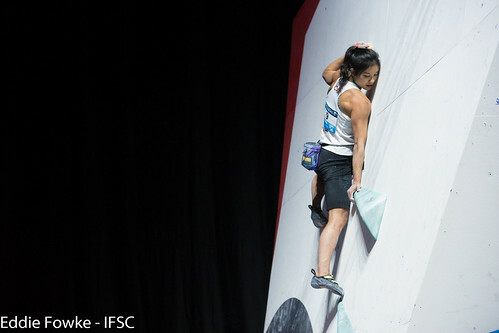 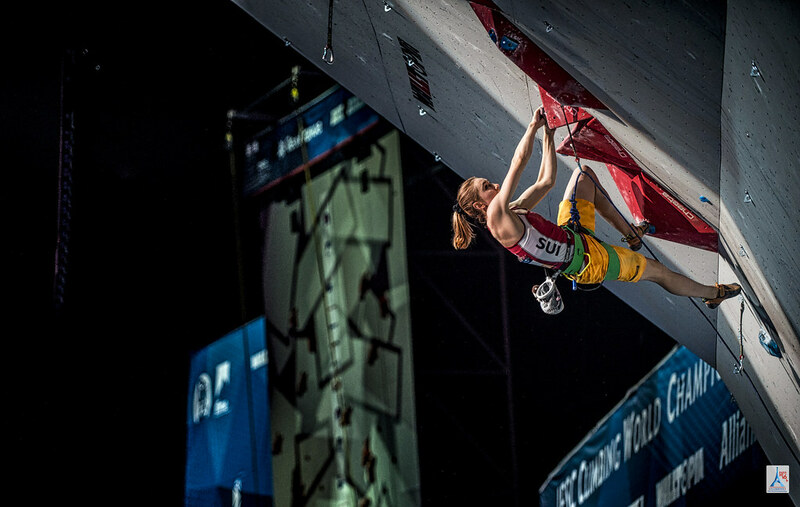 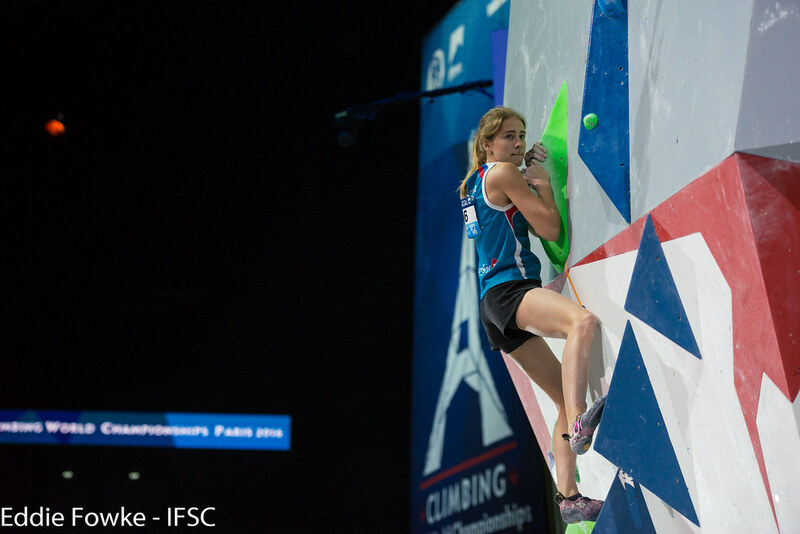 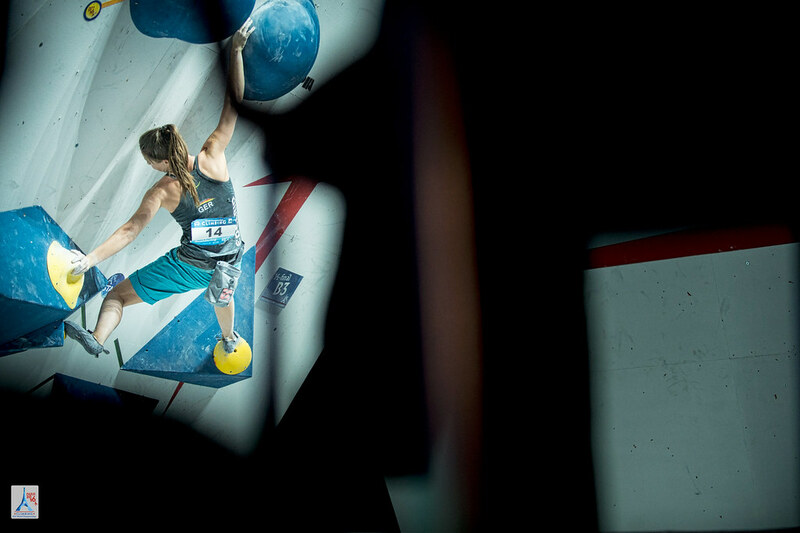 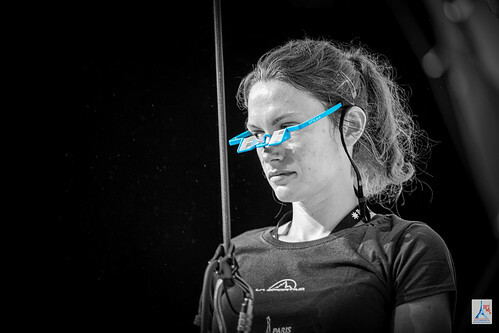 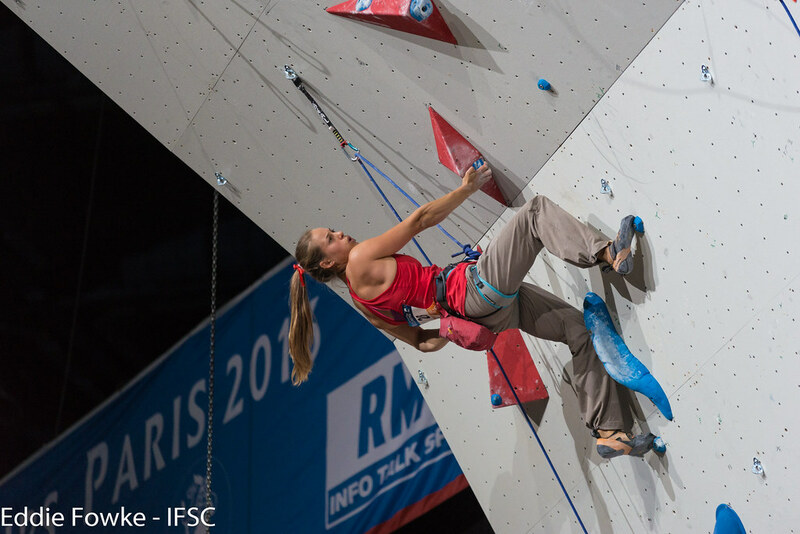 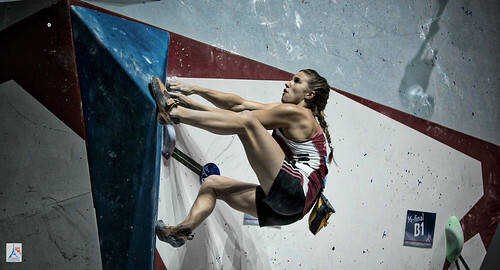 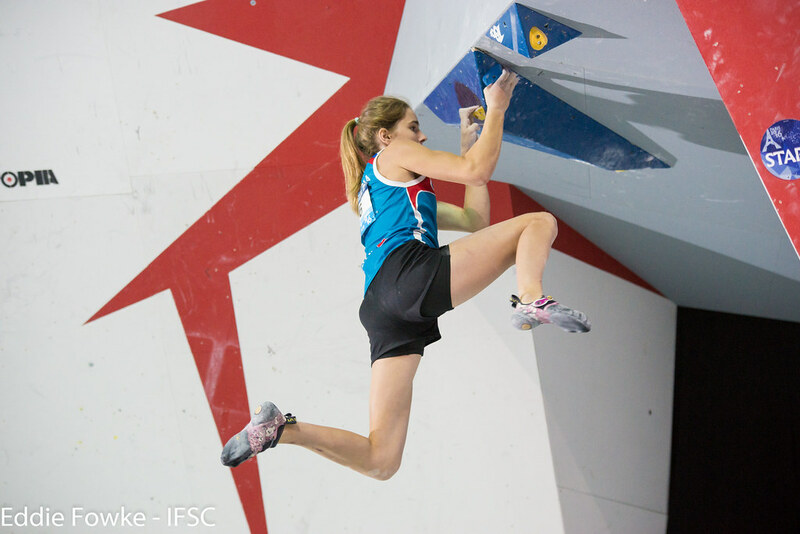 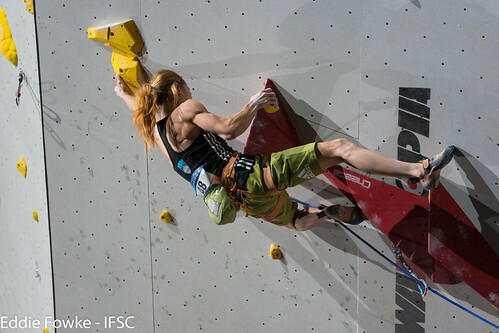 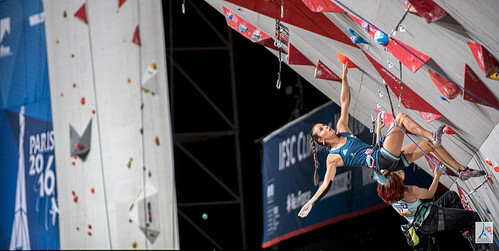 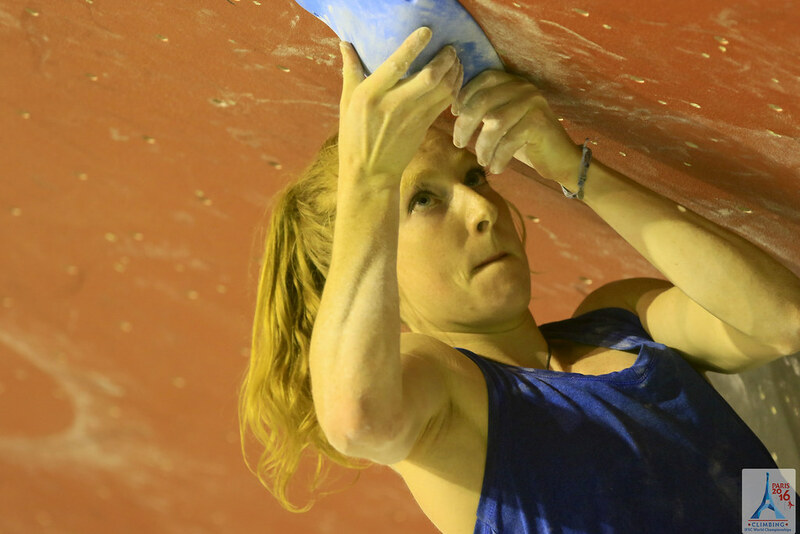 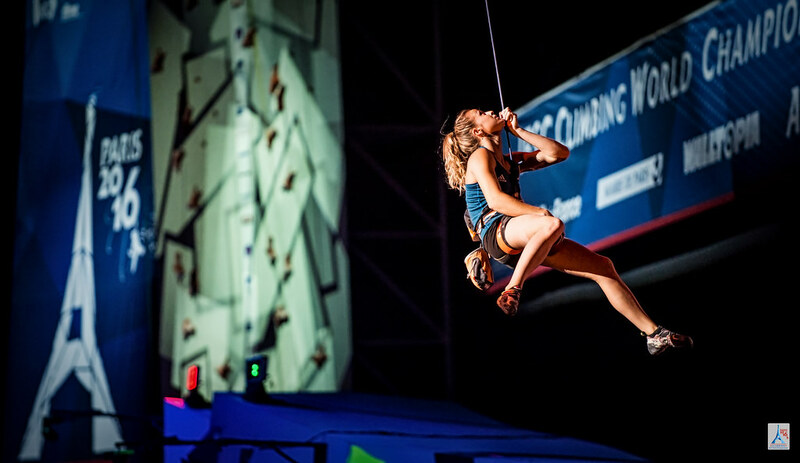 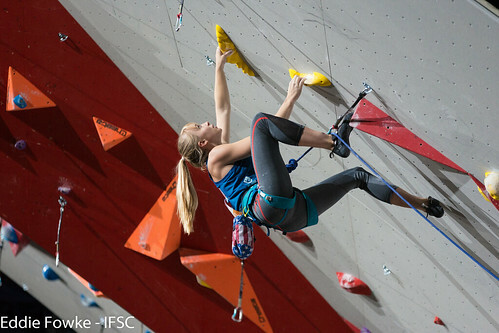 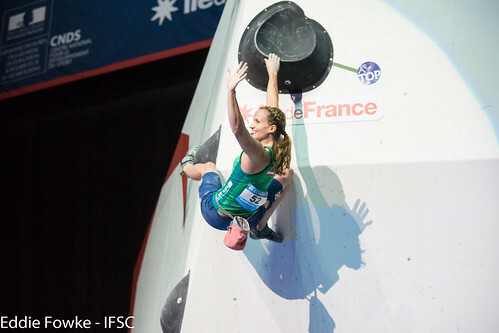 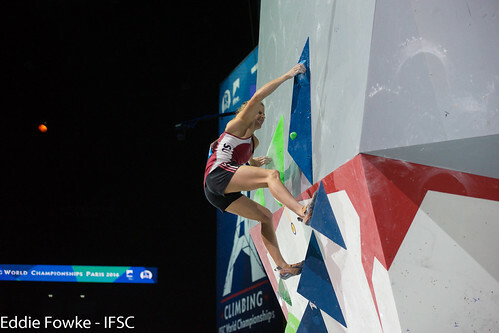 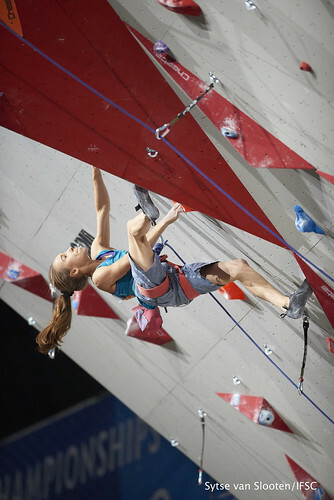 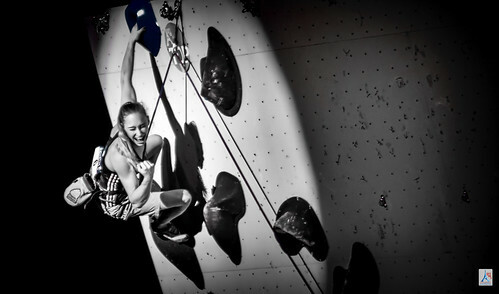 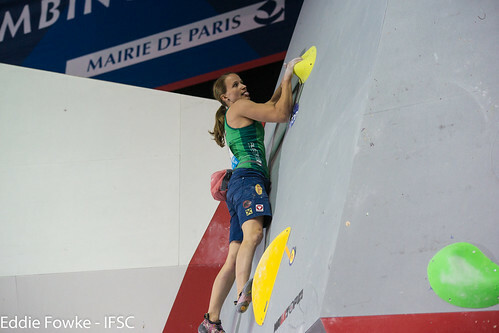 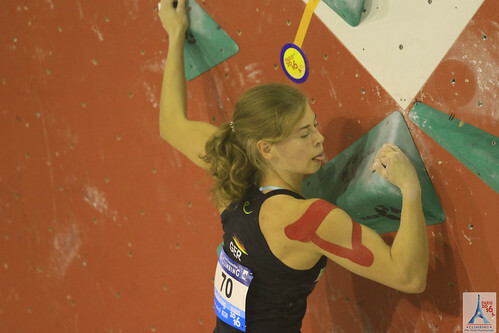 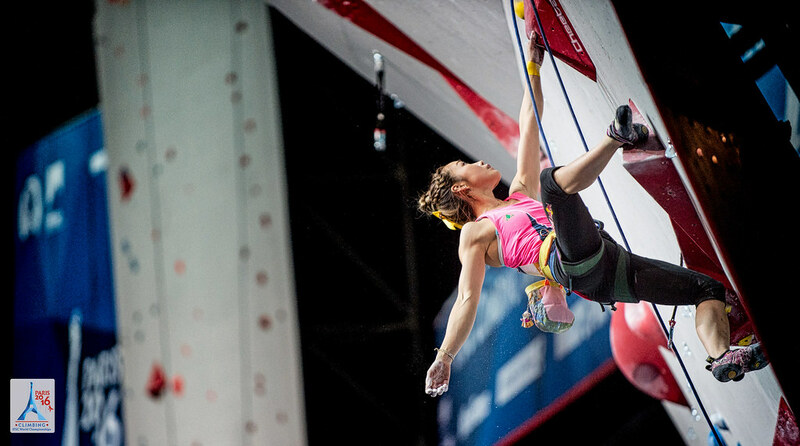 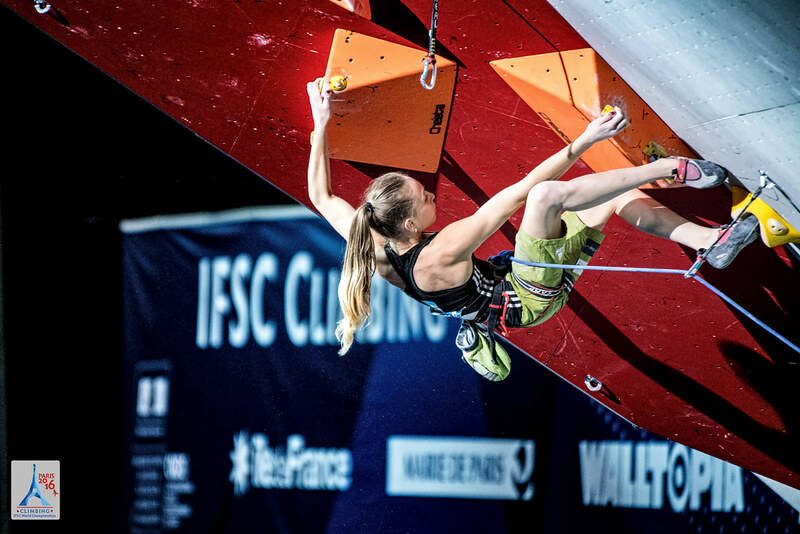 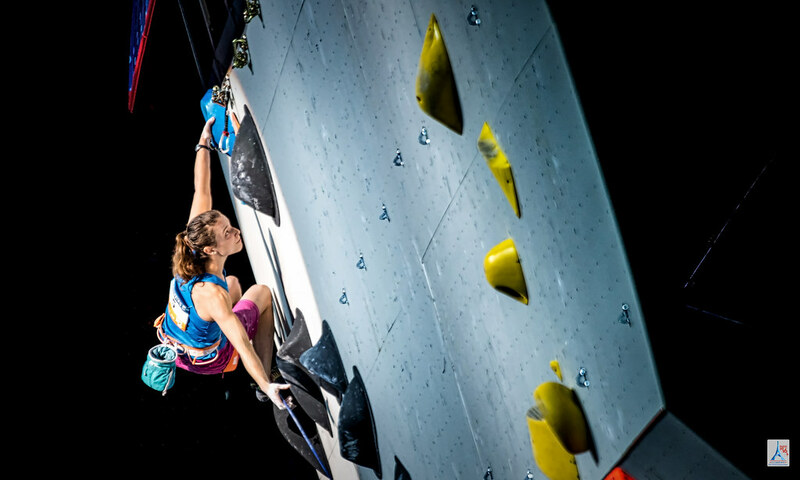 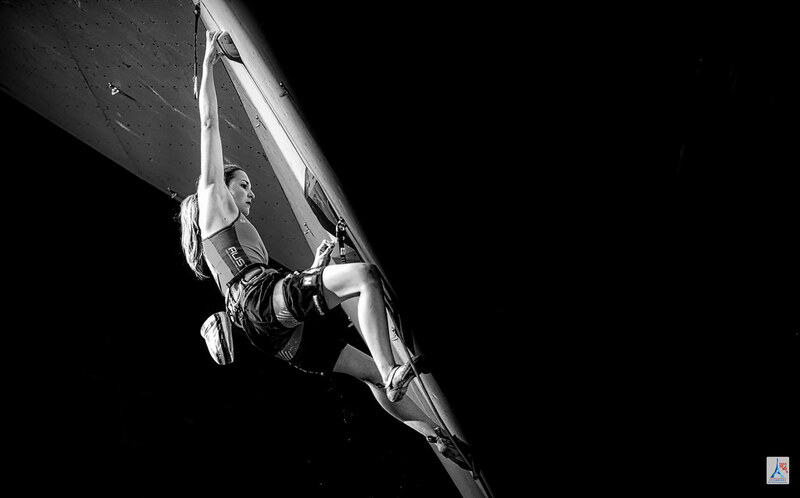 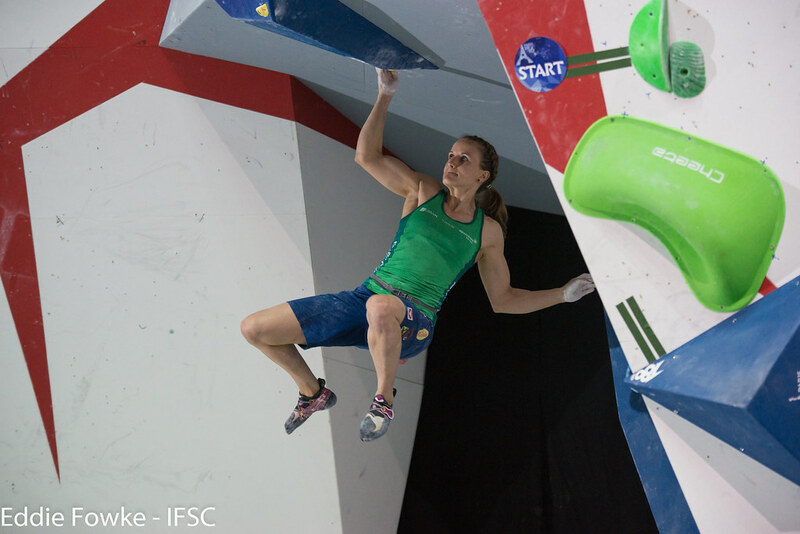 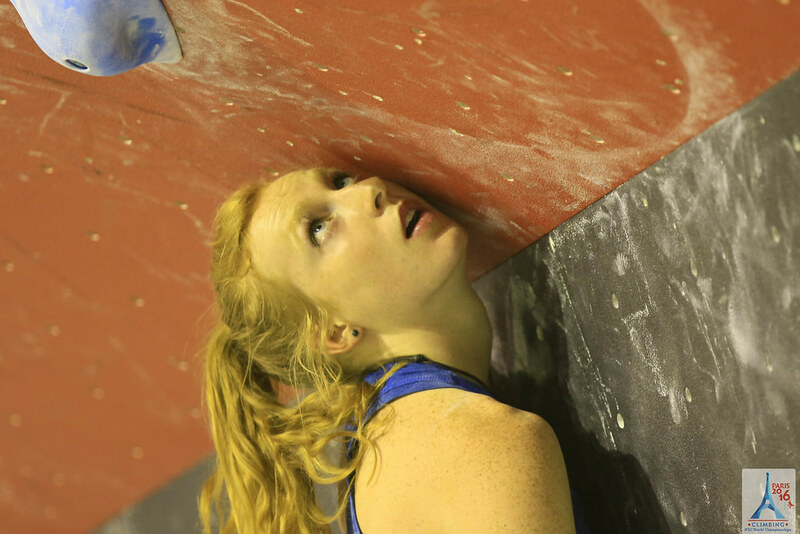 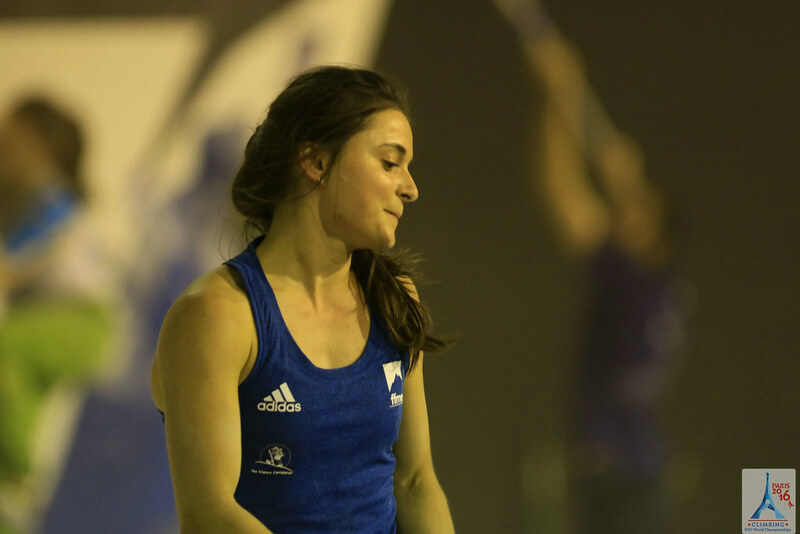 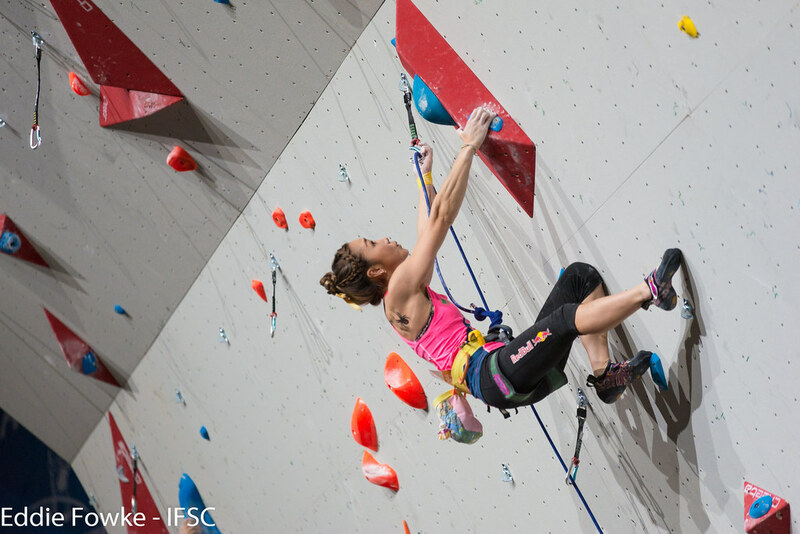 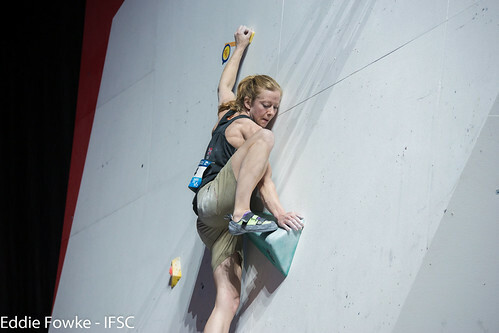 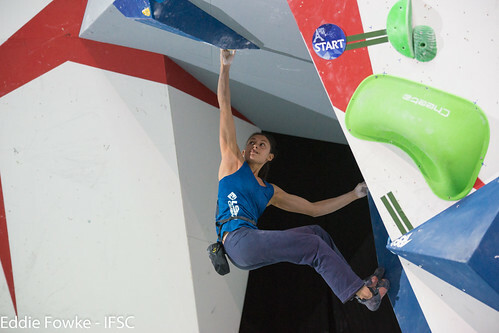 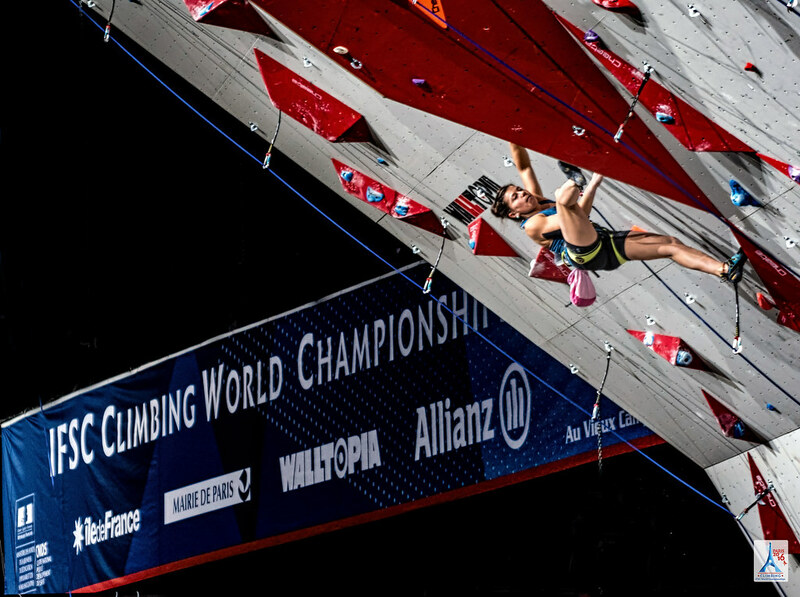 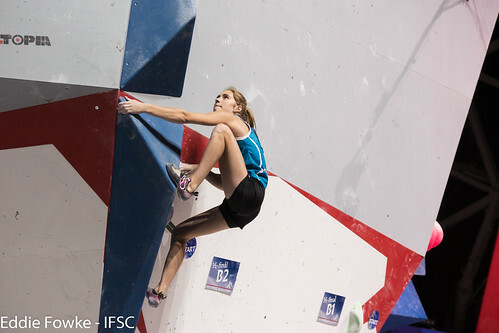 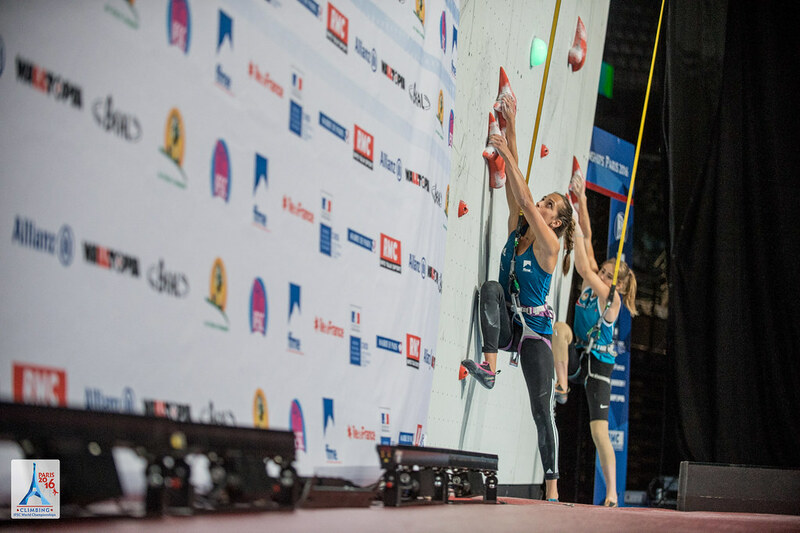 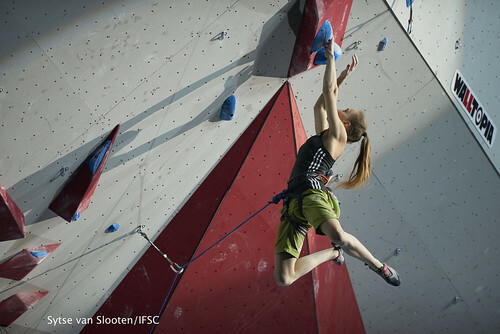 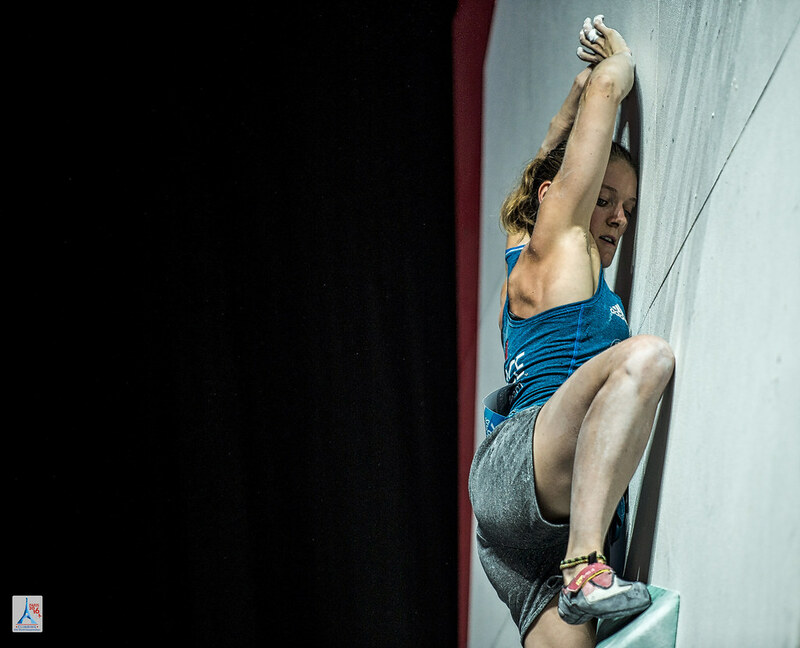 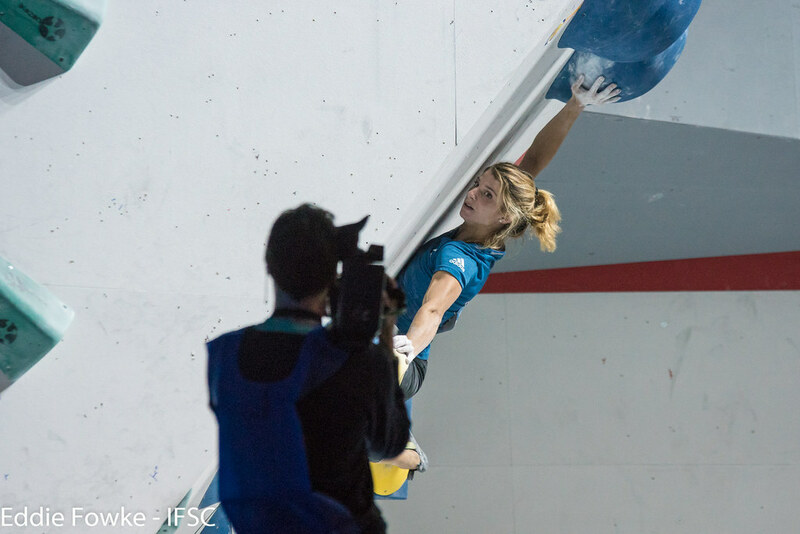 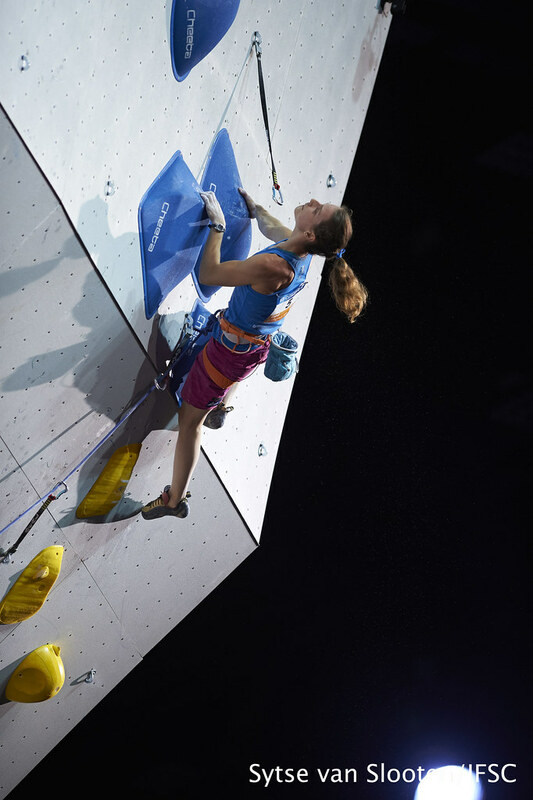 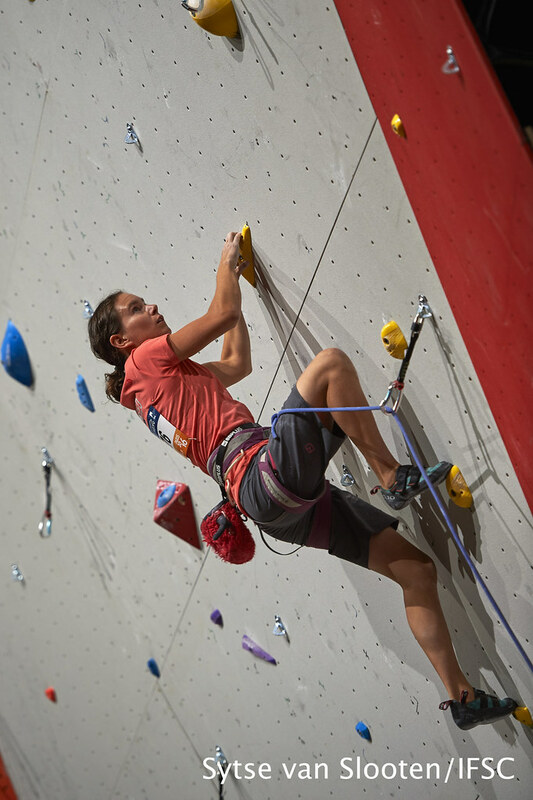 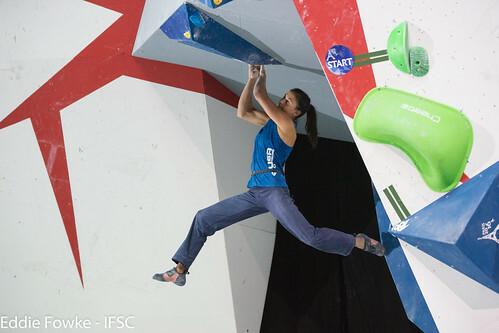 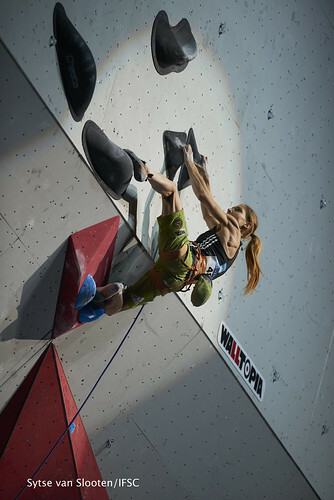 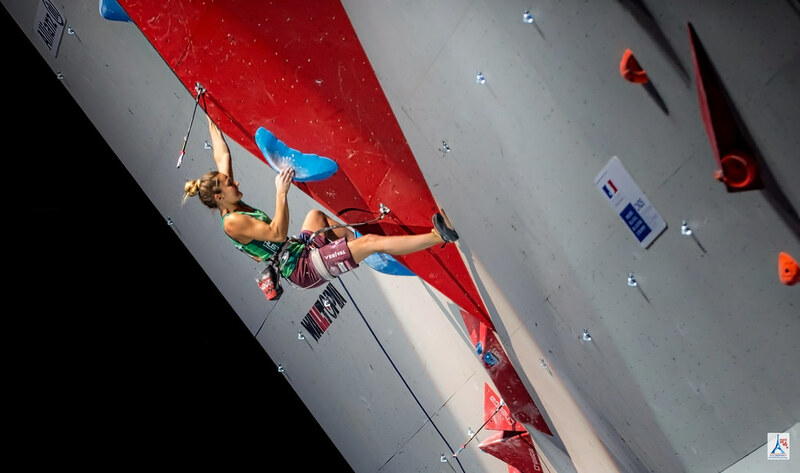 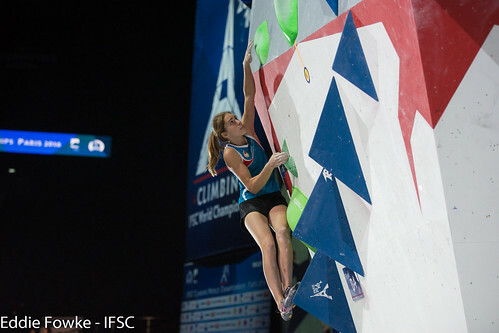 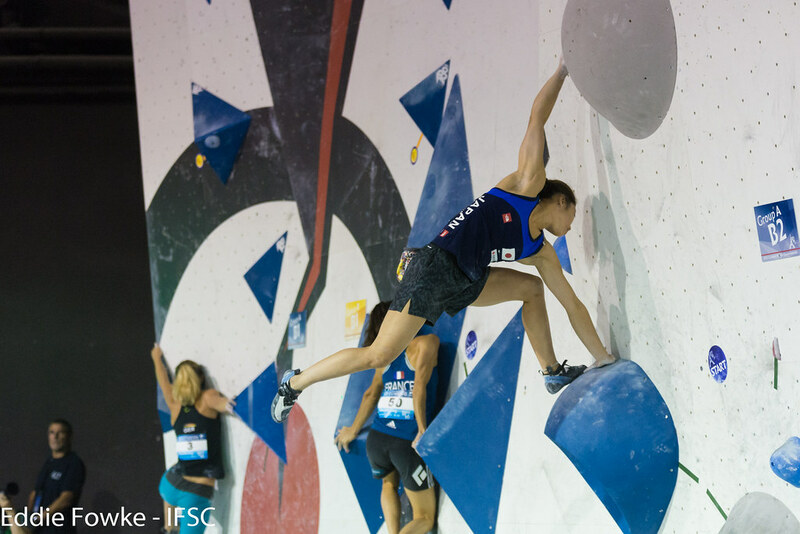 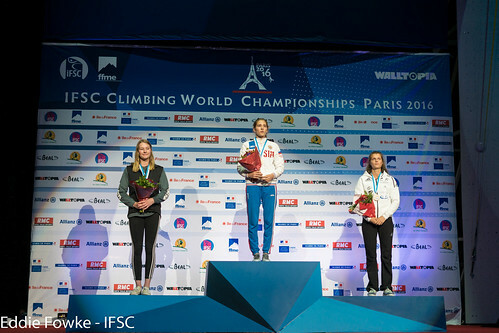 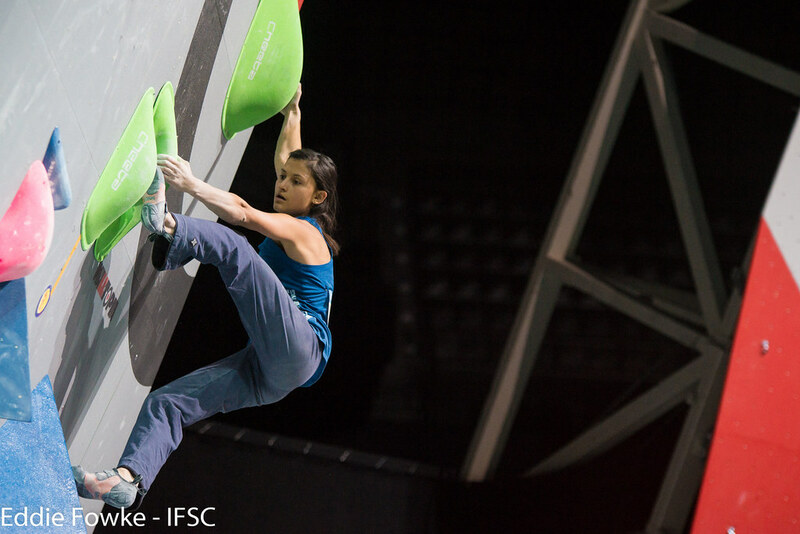 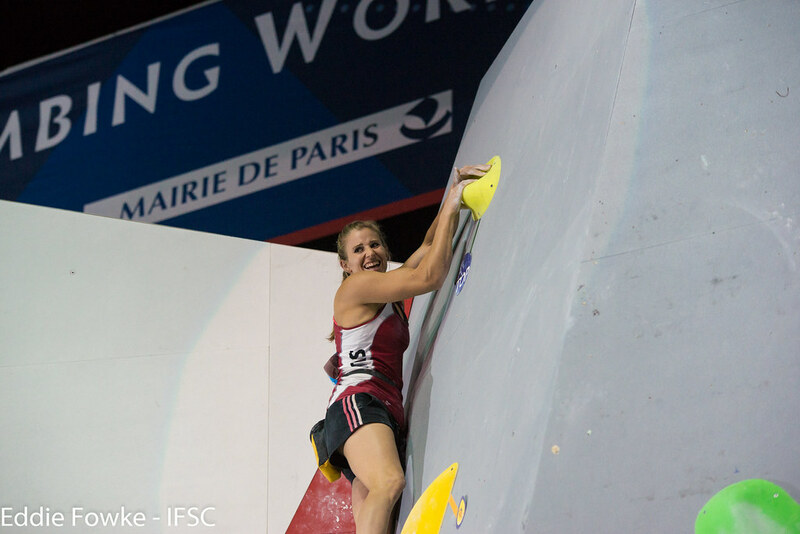 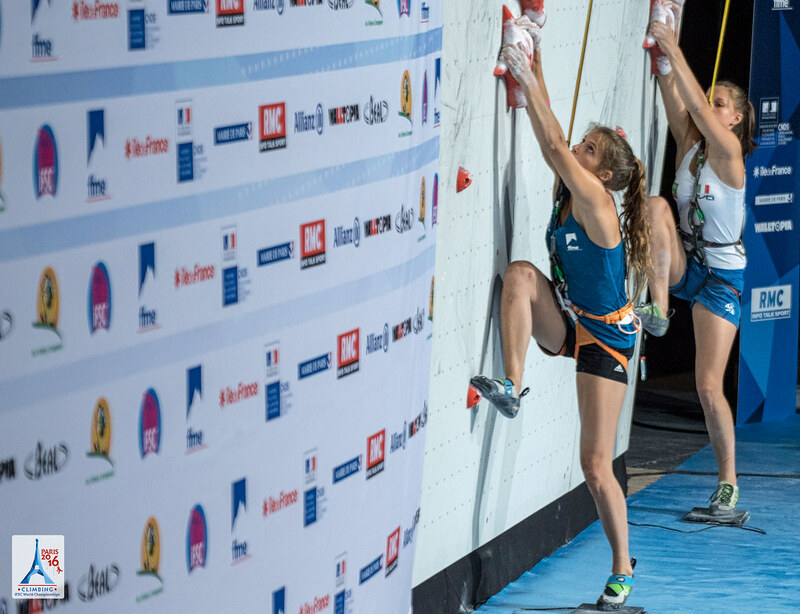 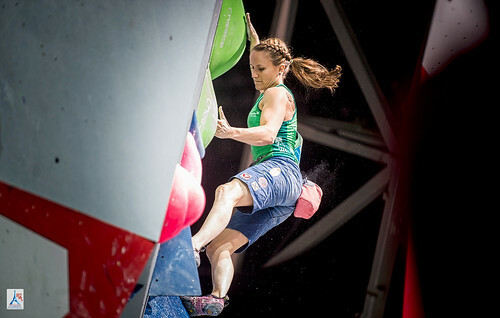 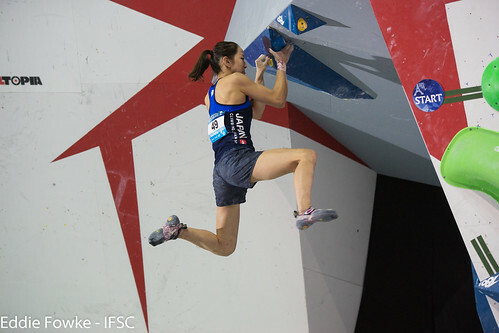 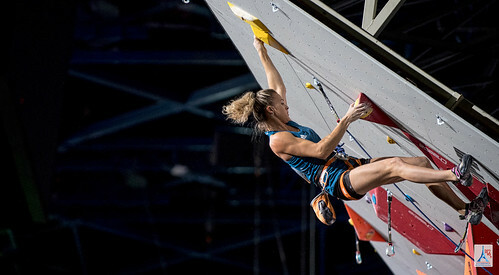 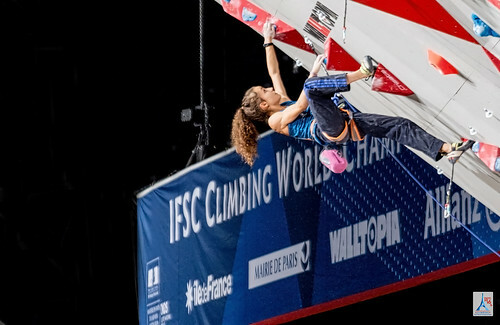 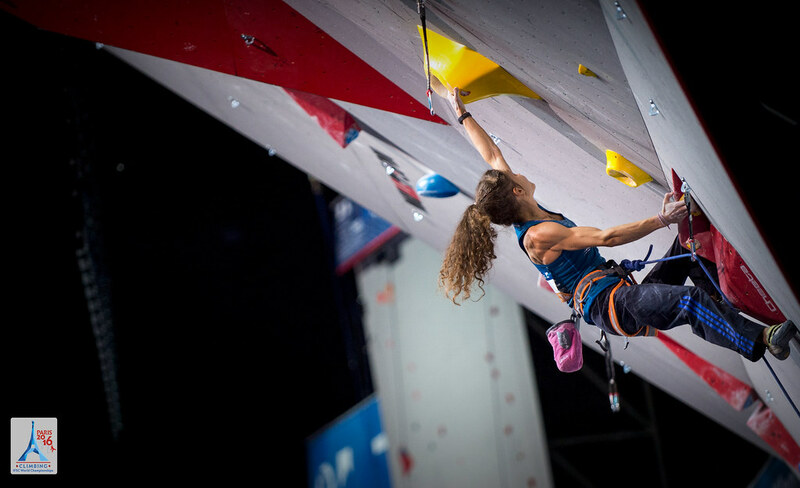 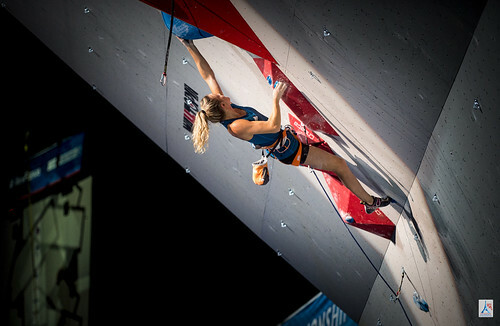 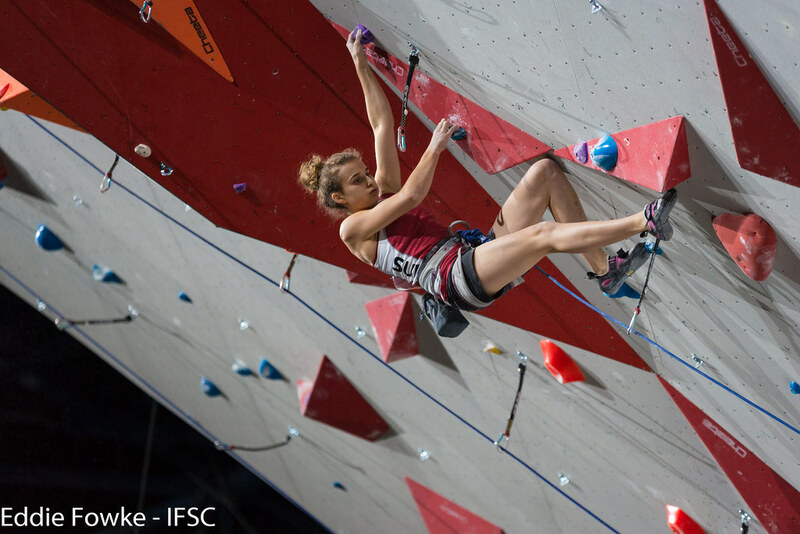 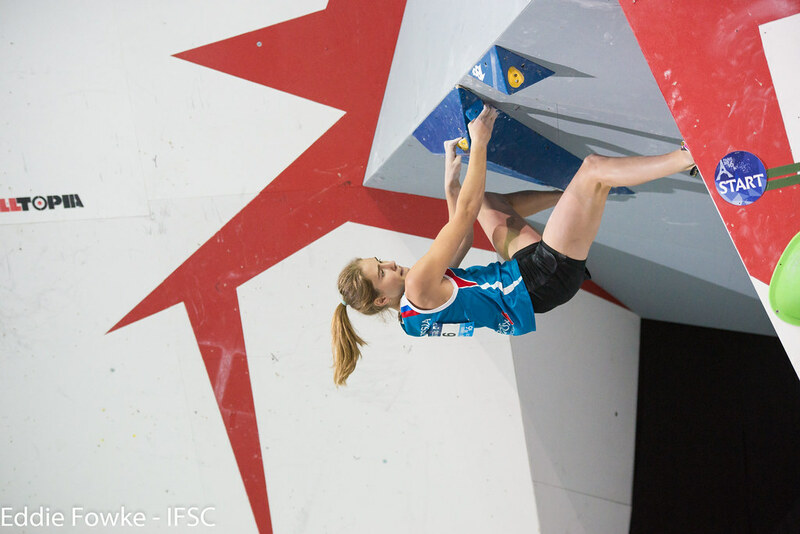 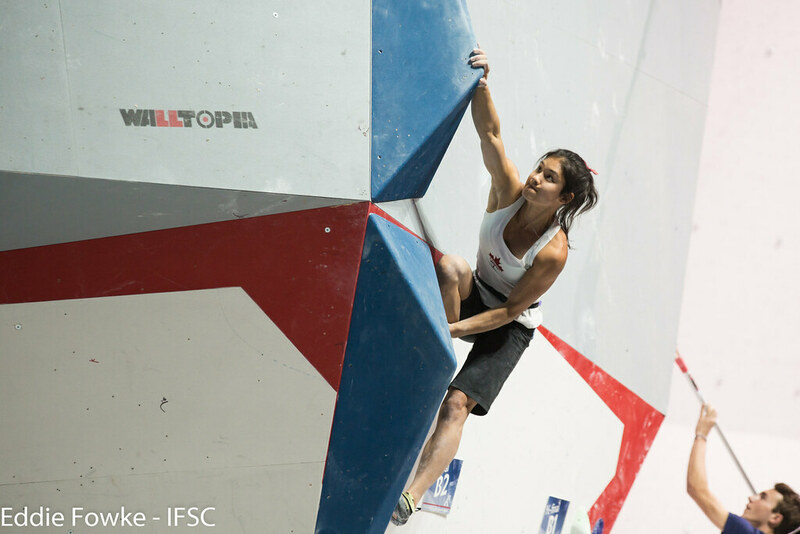 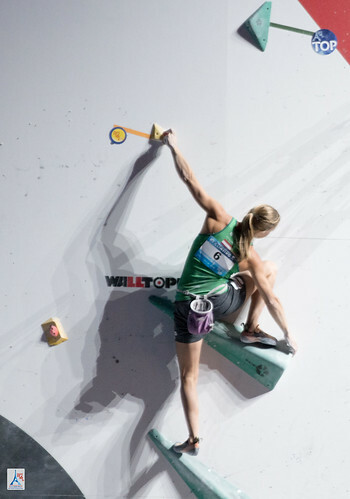 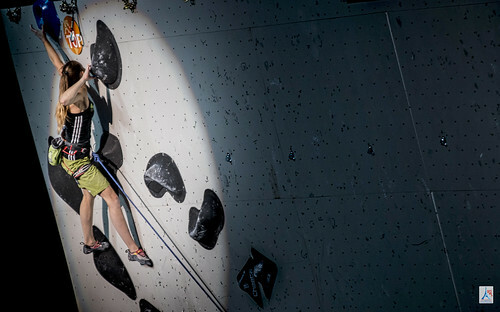 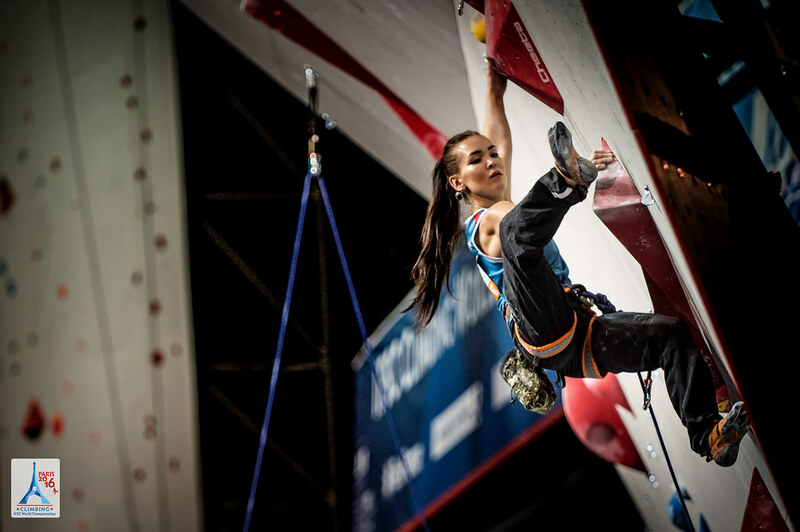 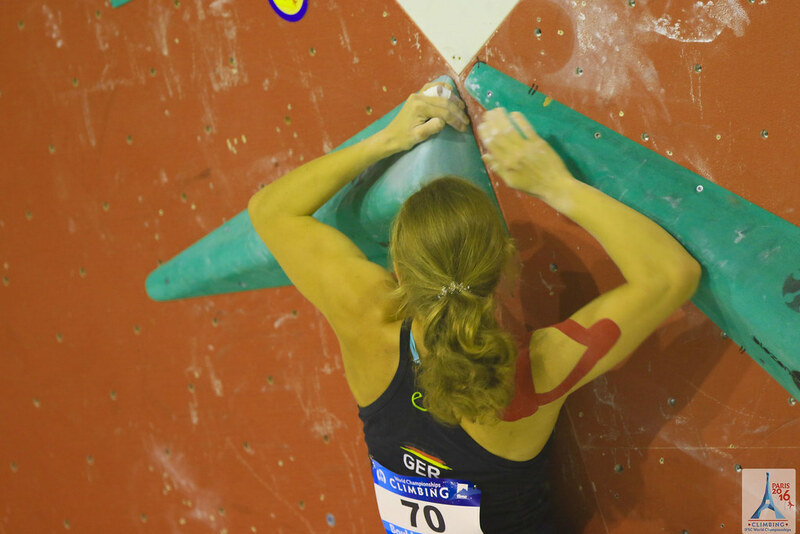 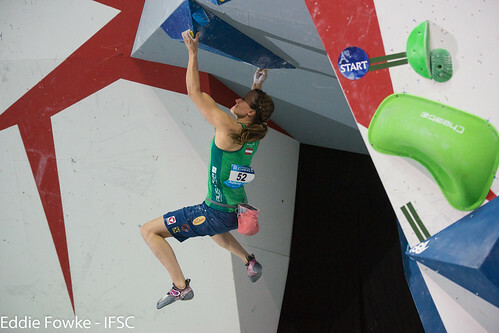 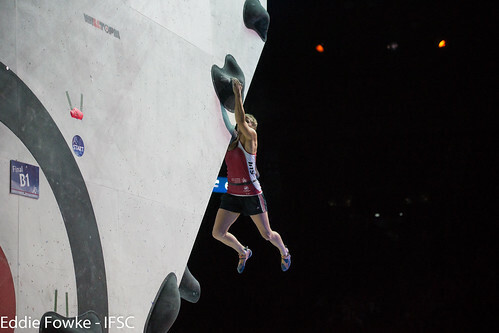 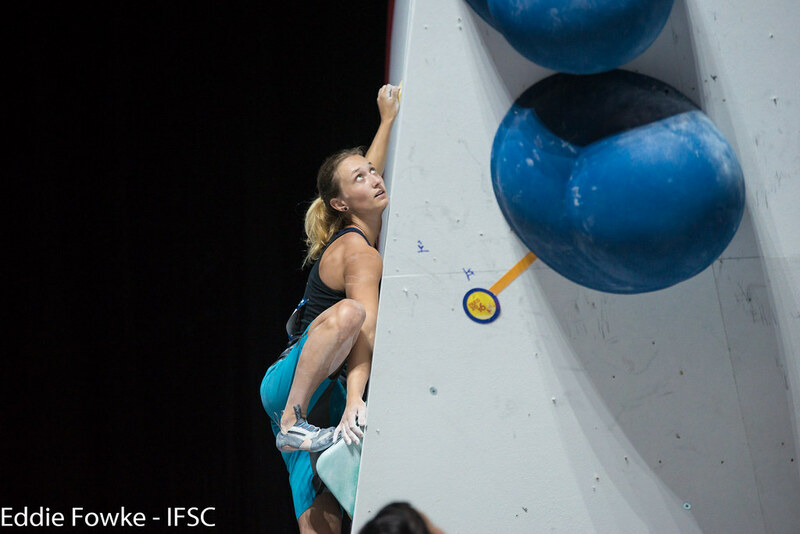 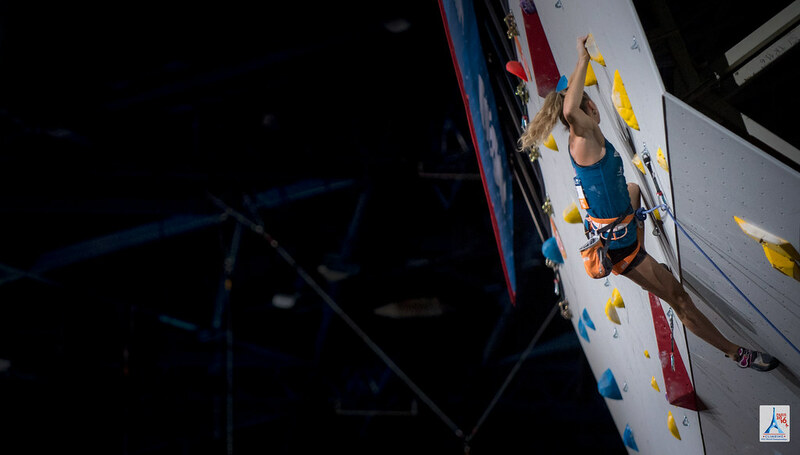 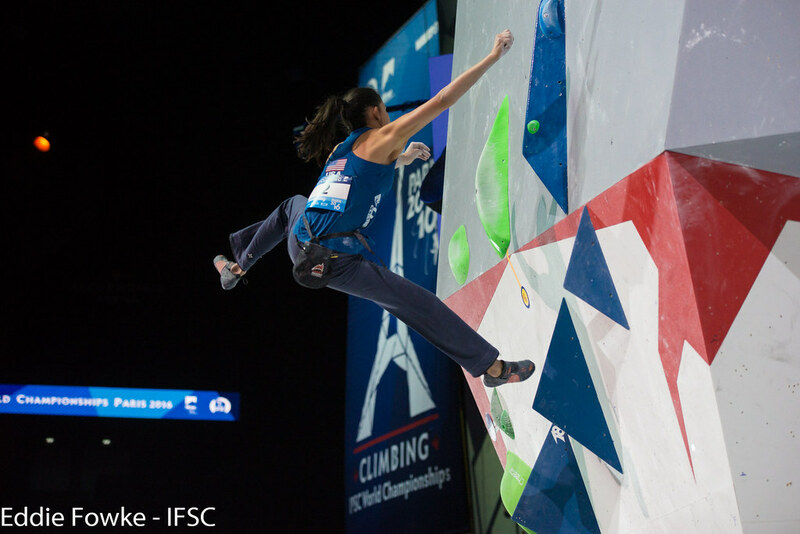 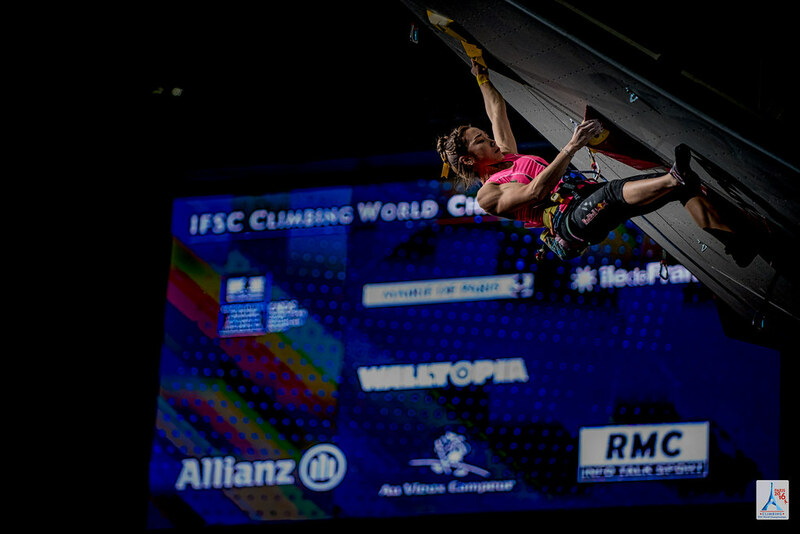 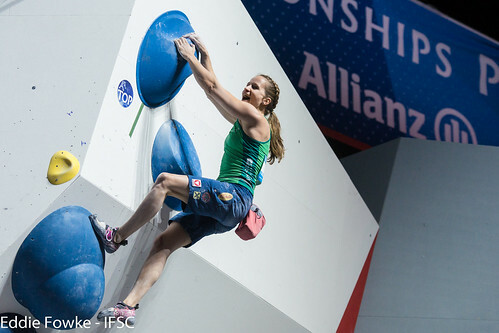 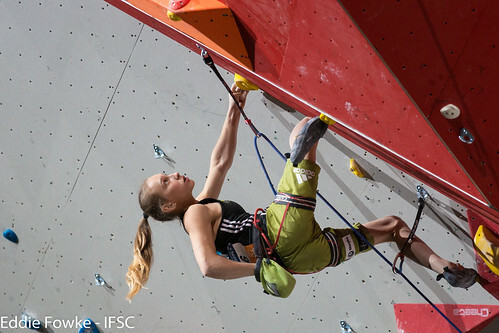 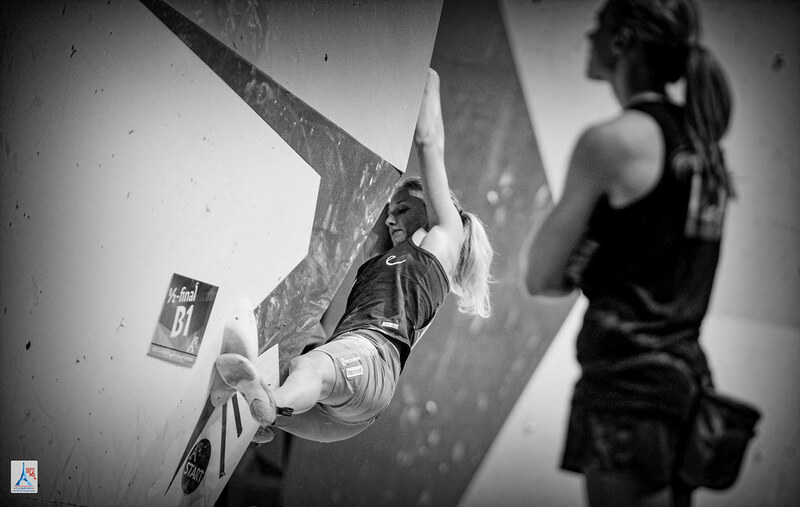 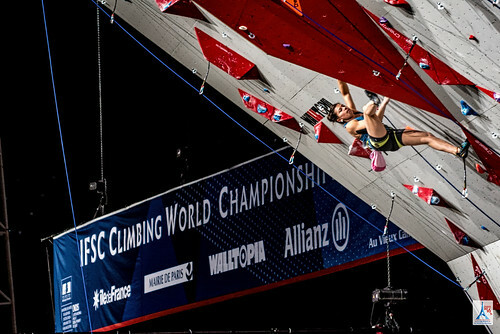 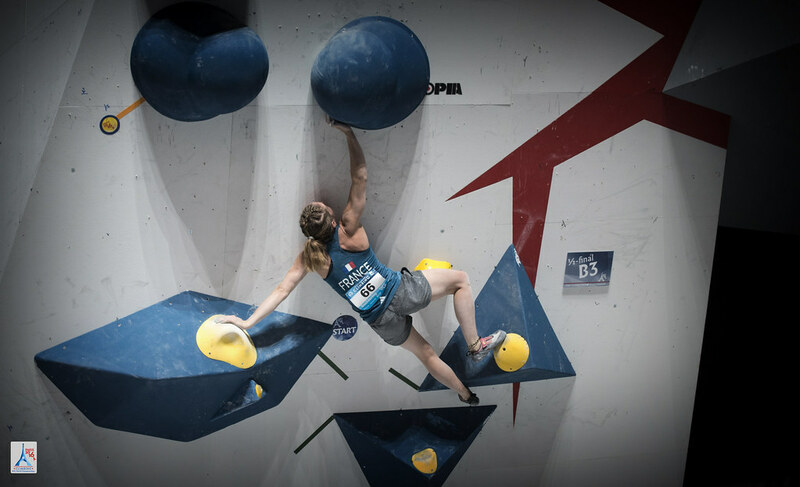 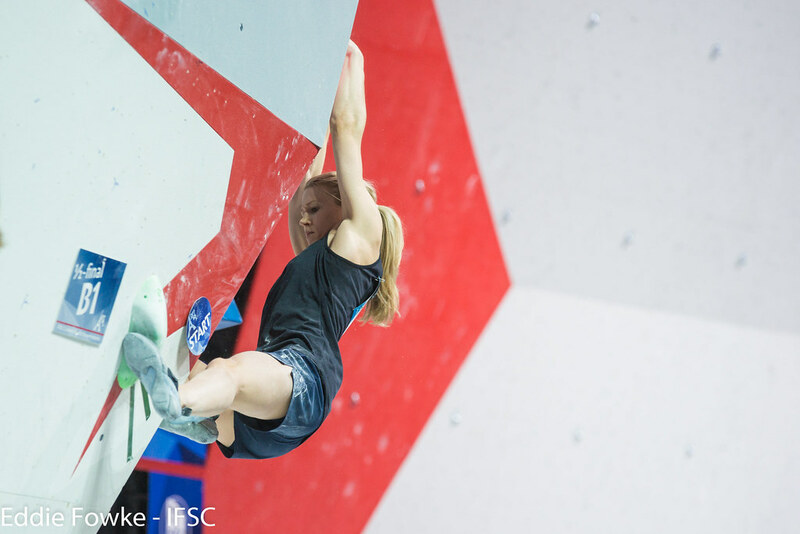 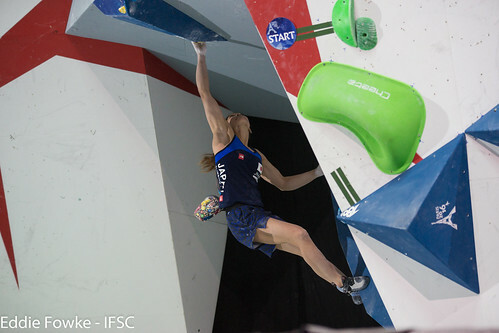 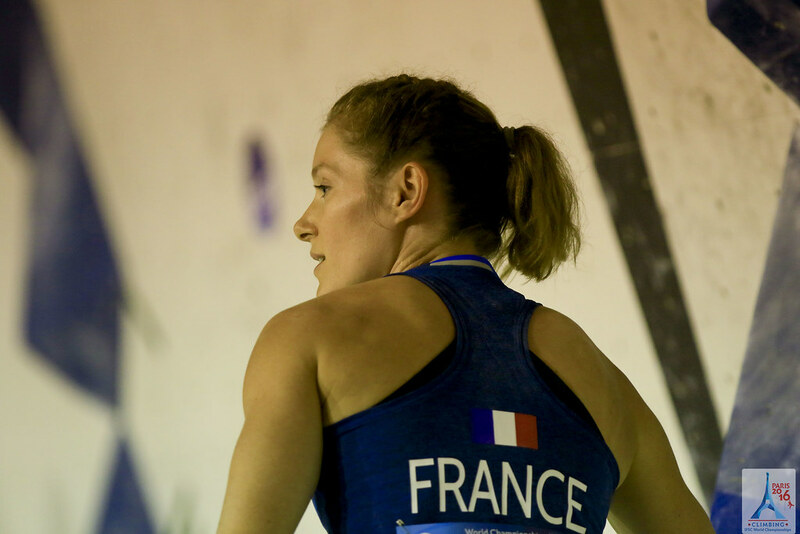 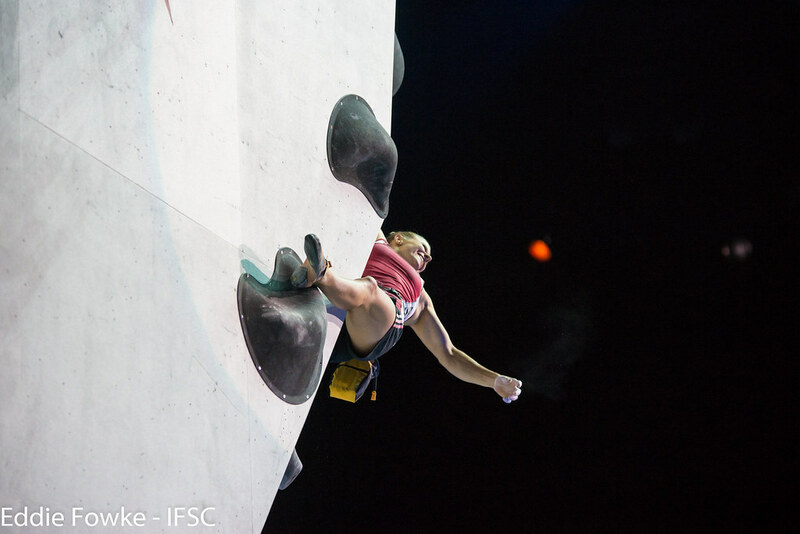 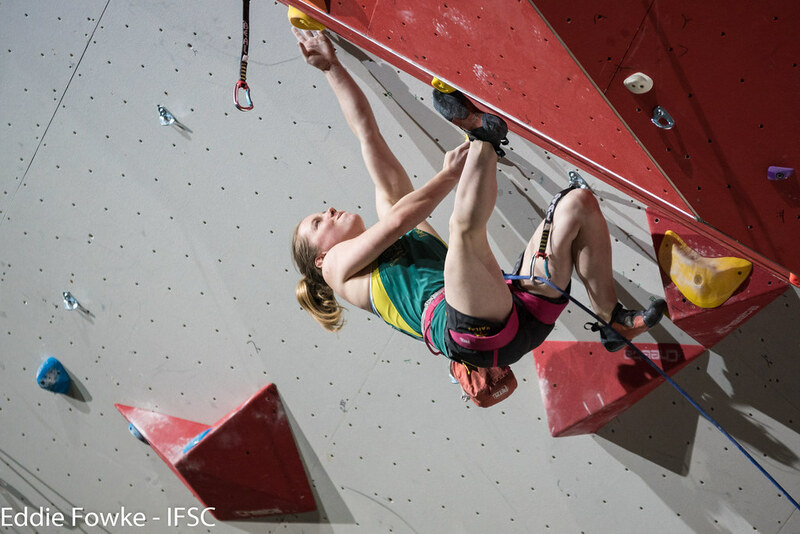 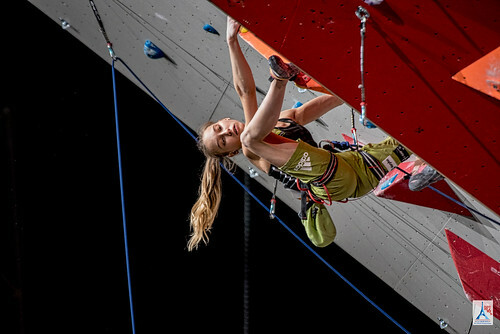 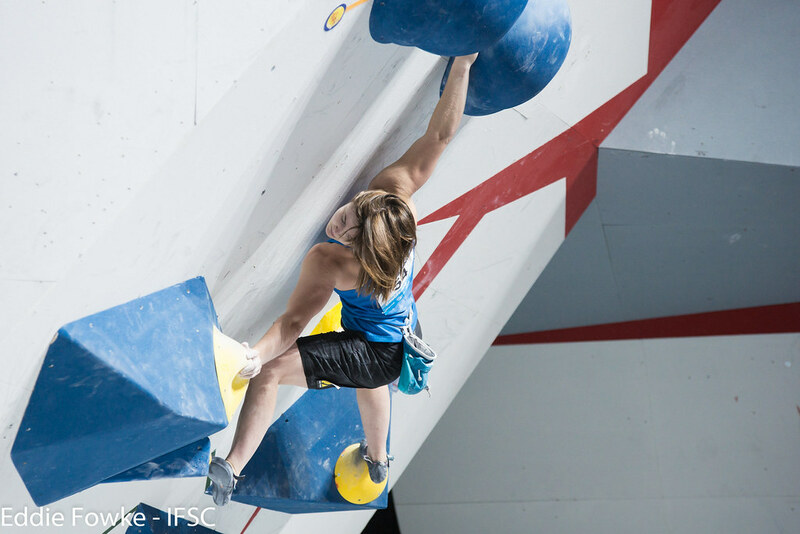 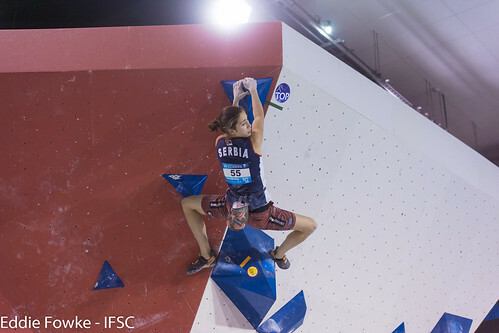 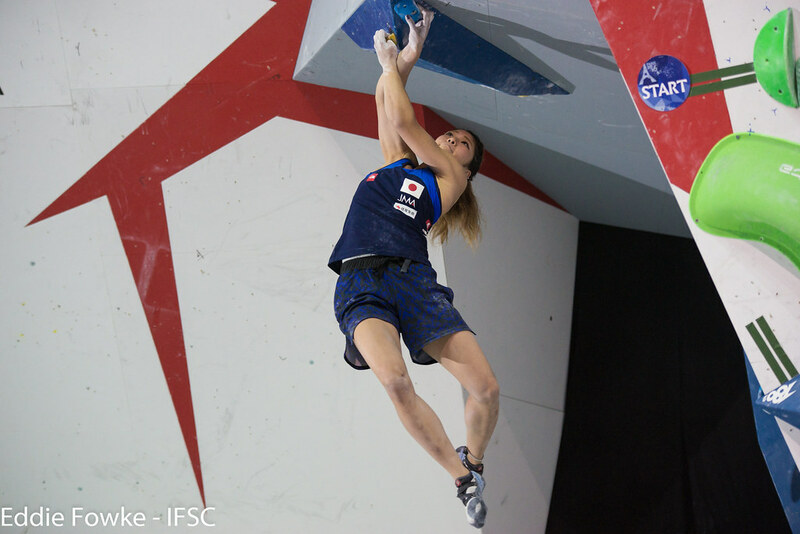 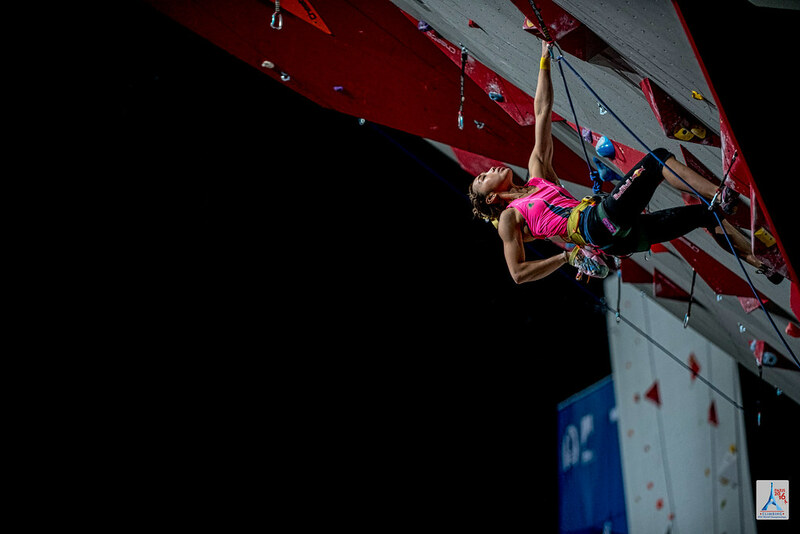 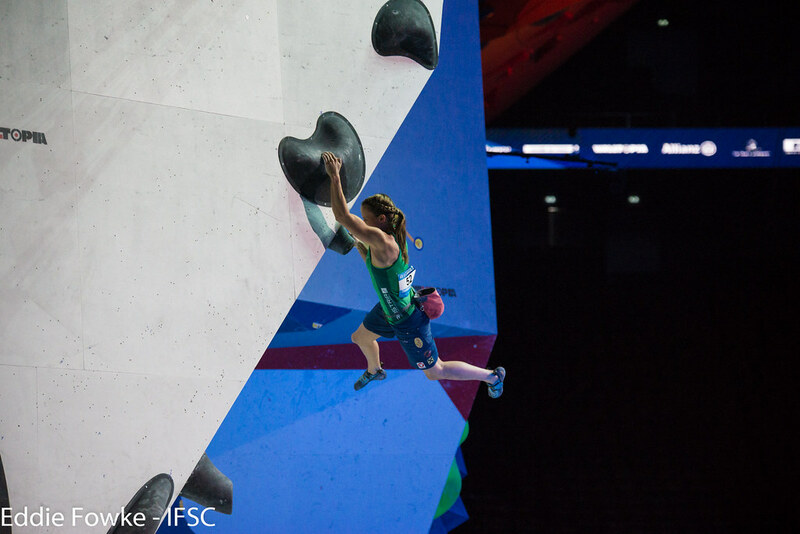 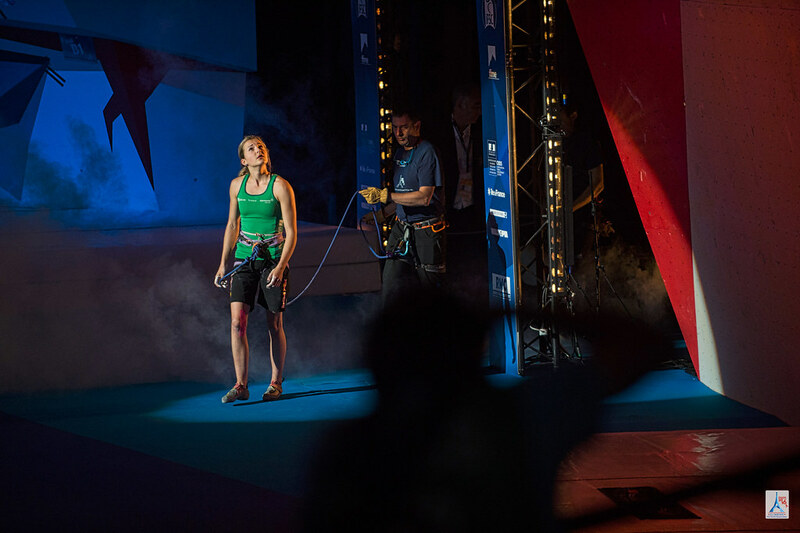 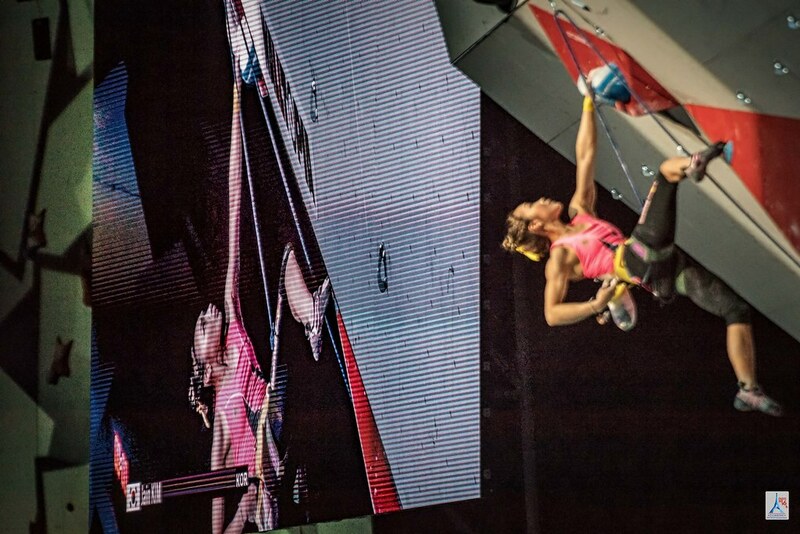 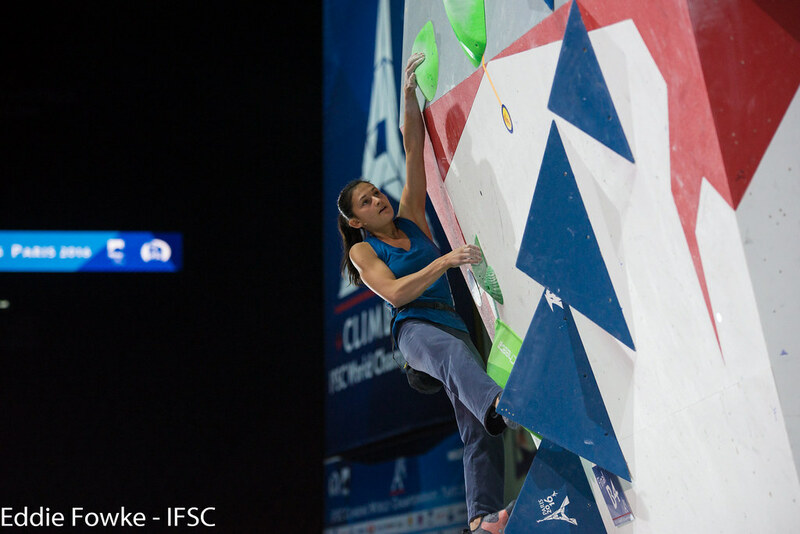 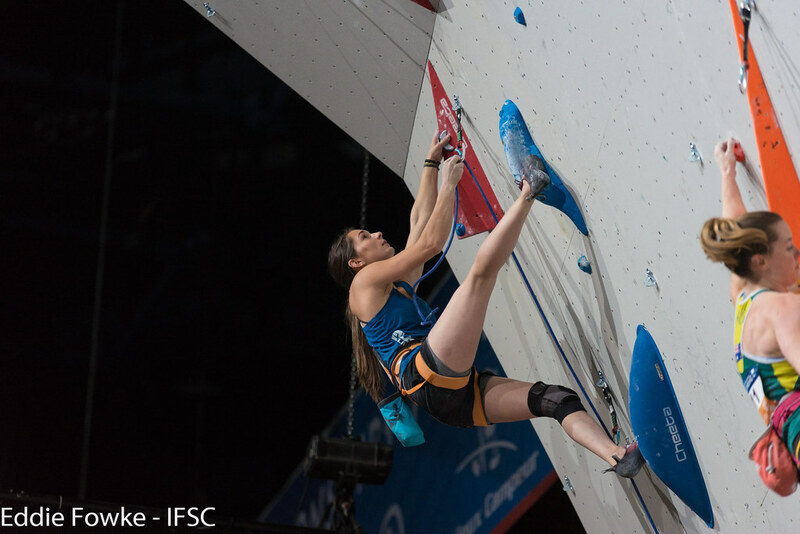 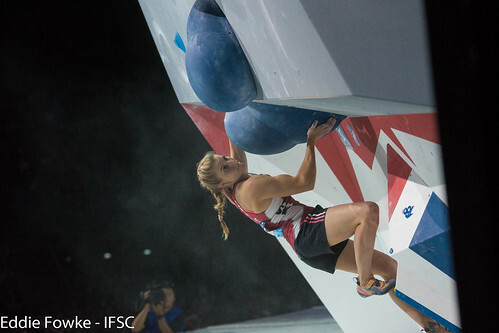 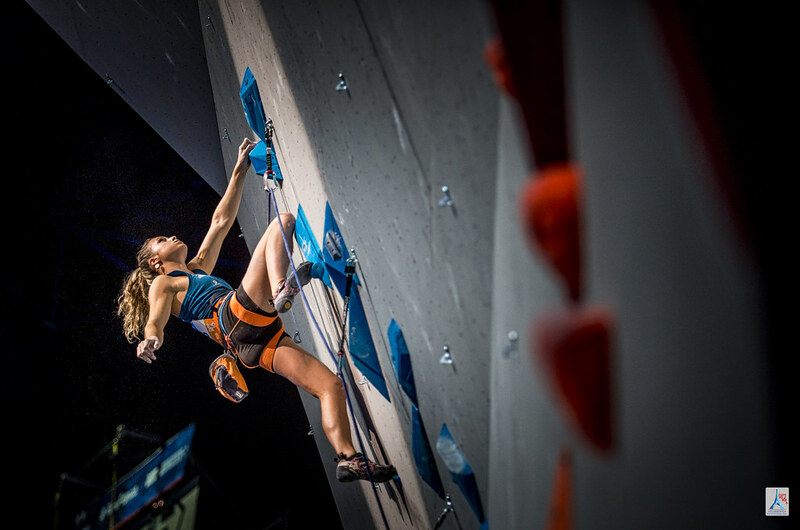 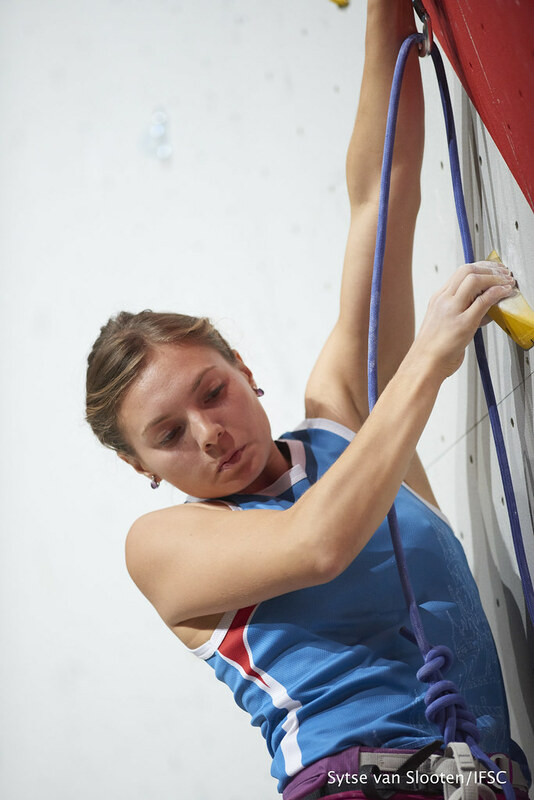 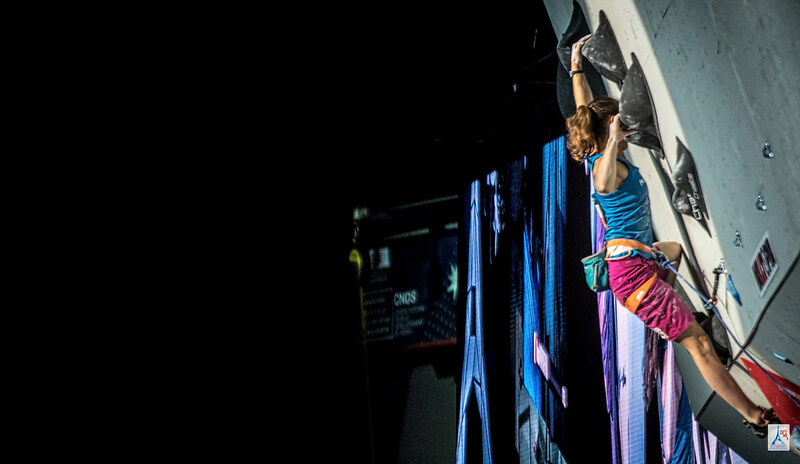 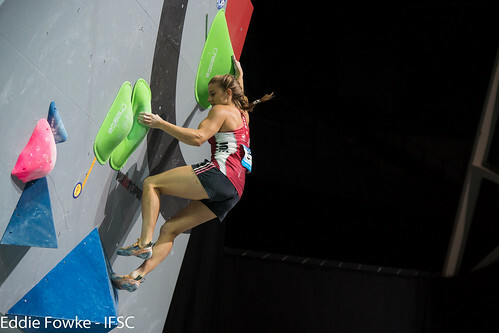 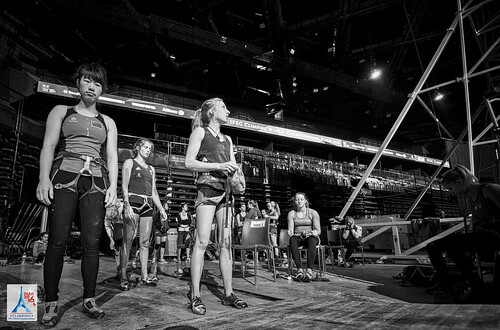 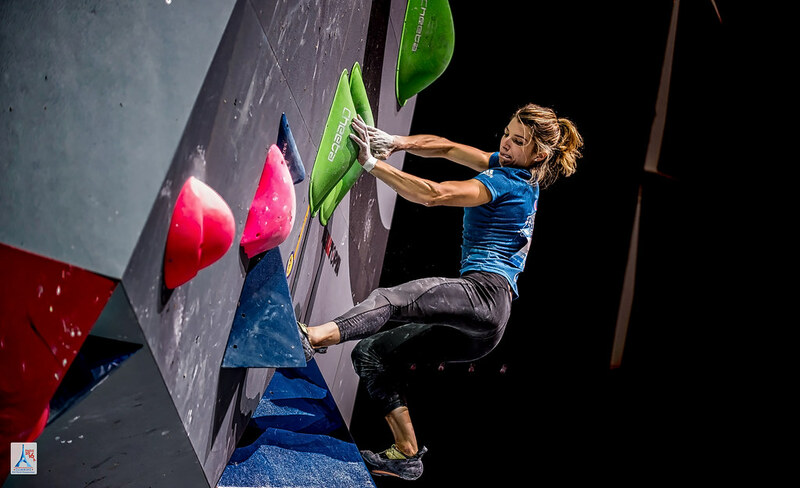 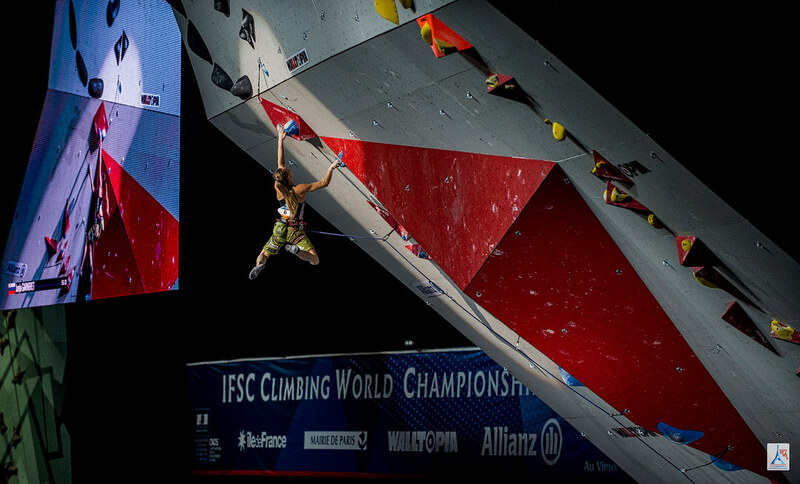 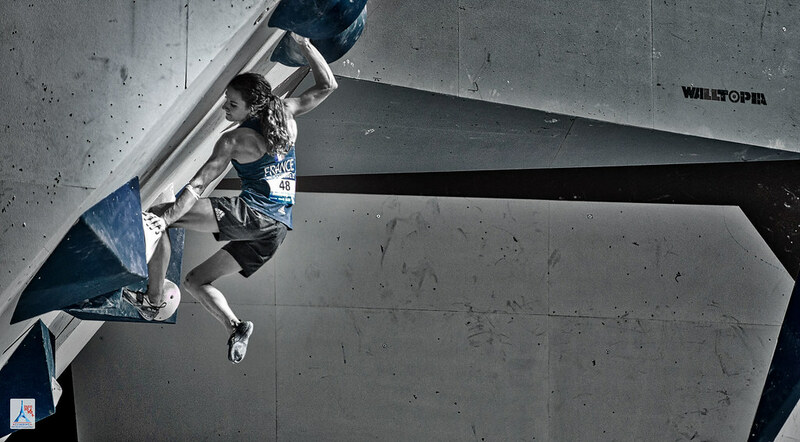 A countback to Semi-Finals broke the tie, making Garnbret the second youngest Woman to win the IFSC World Championships in Lead. 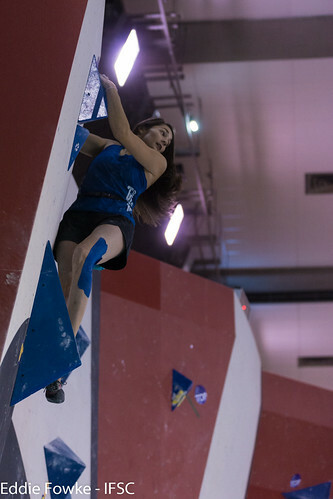 2014 runner-up, Mina Markovic, stayed on the podium with Bronze due to another countback. 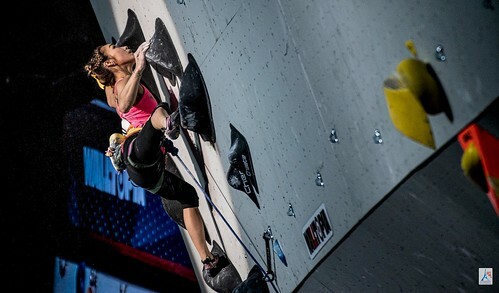 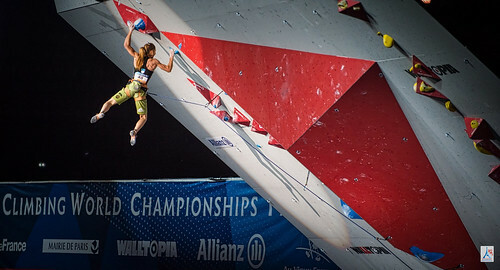 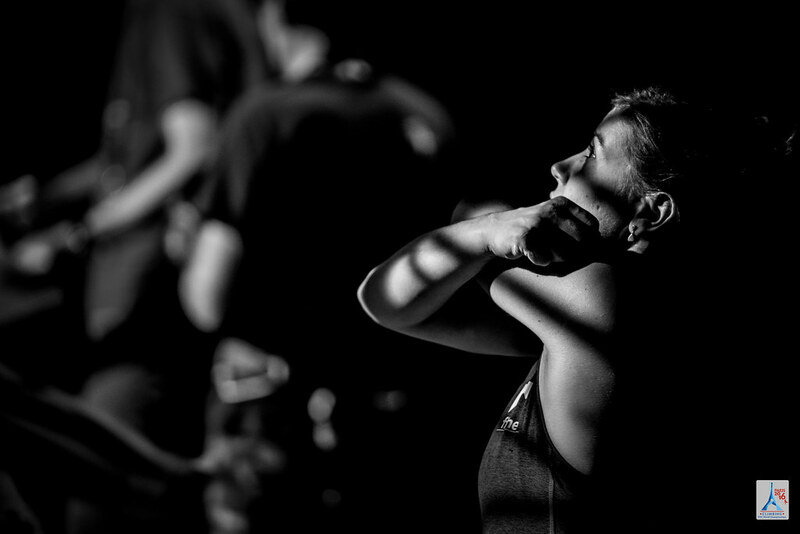 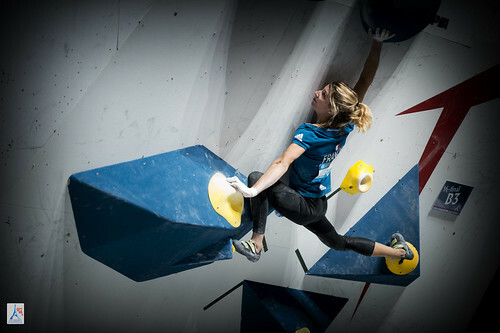 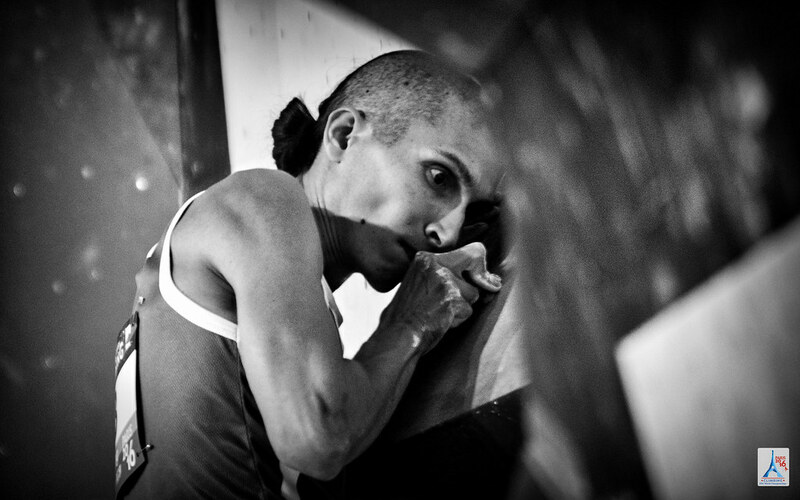 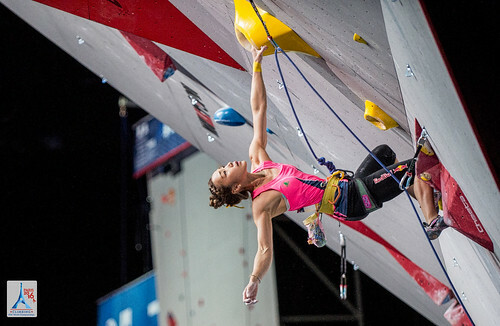 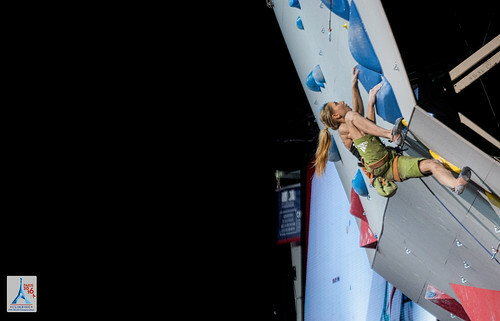 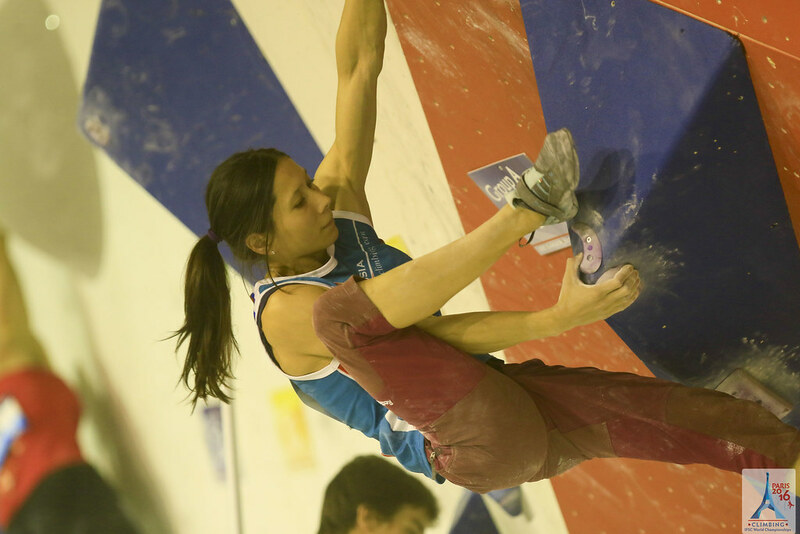 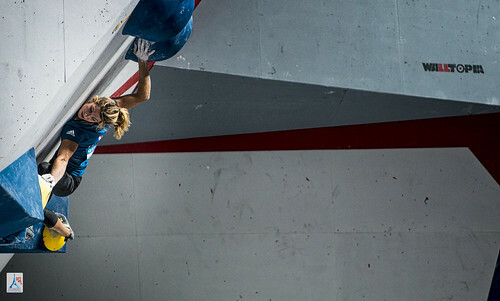 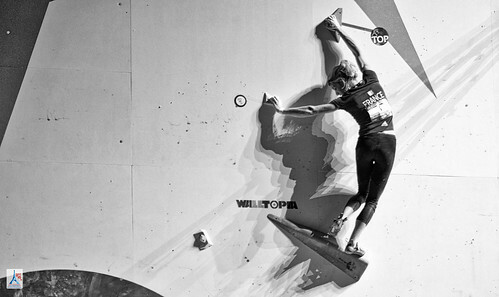 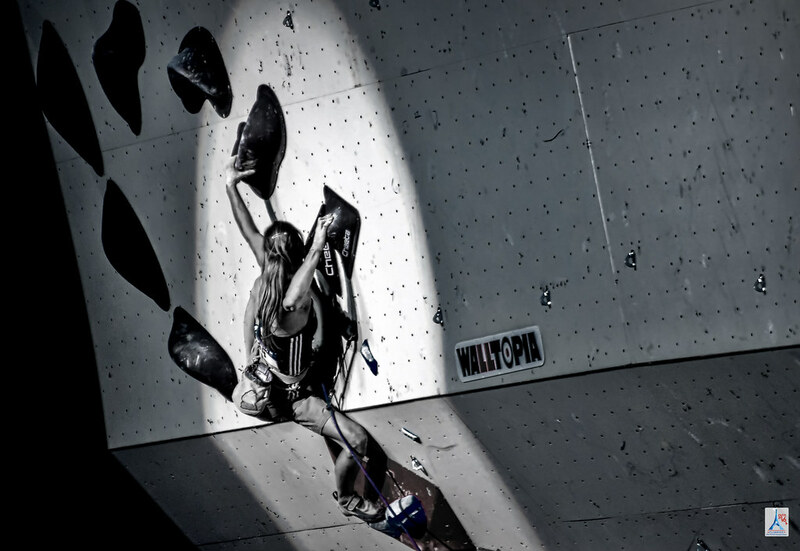 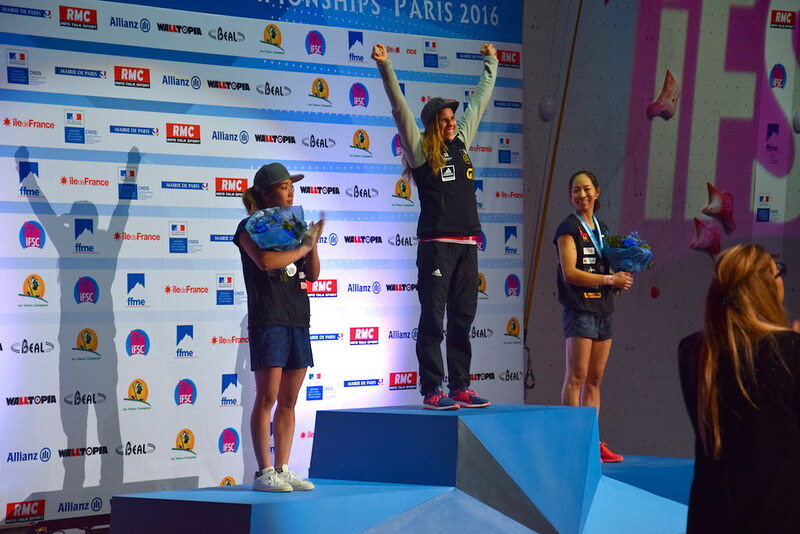 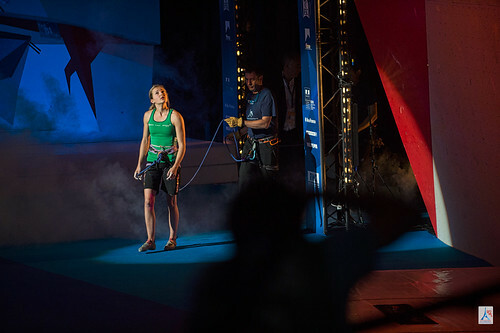 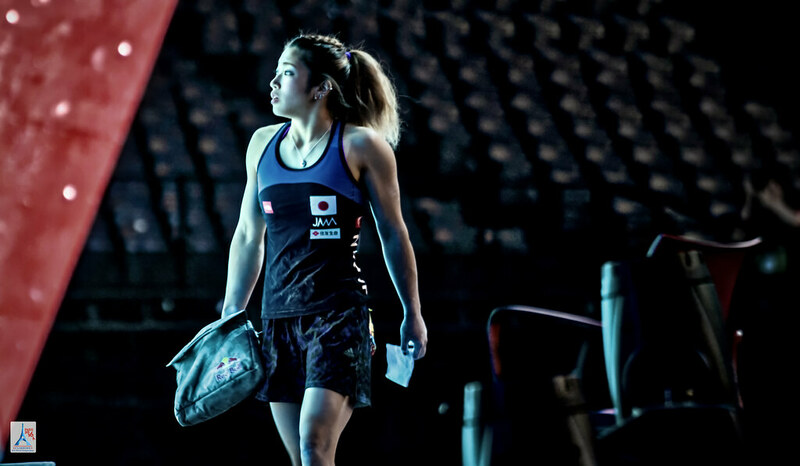 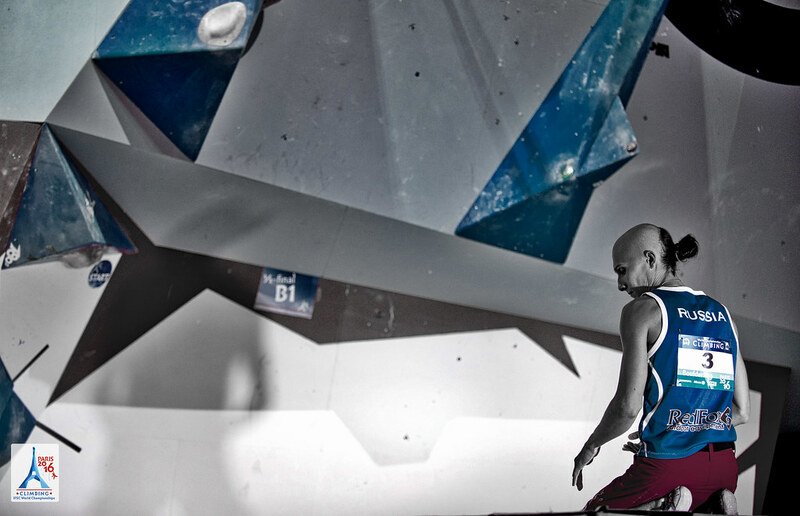 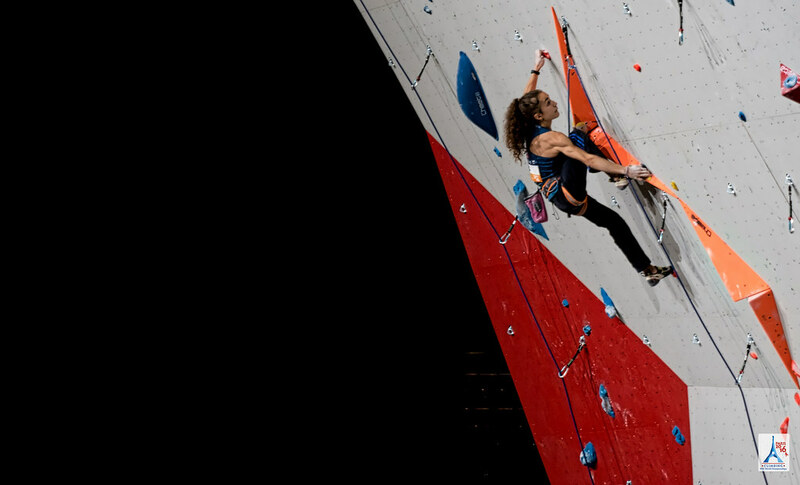 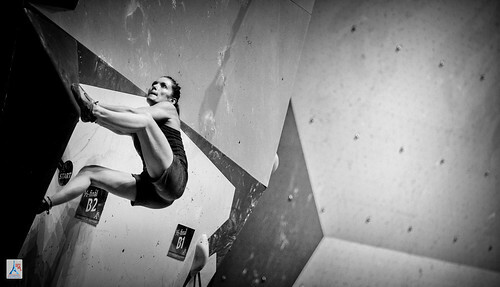 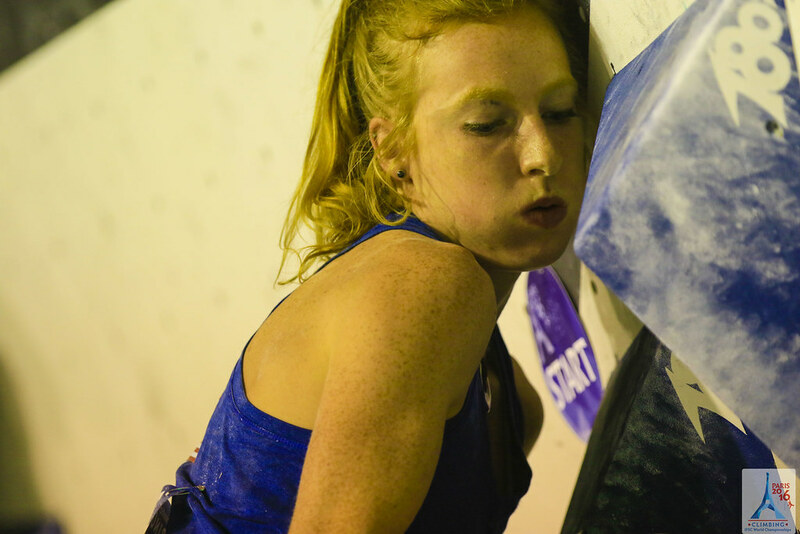 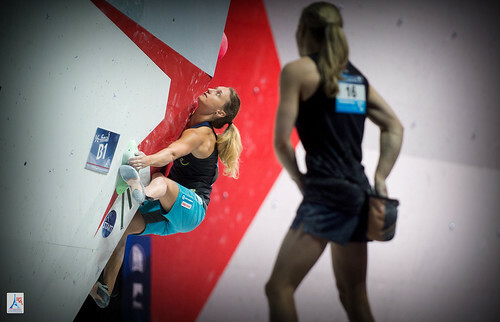 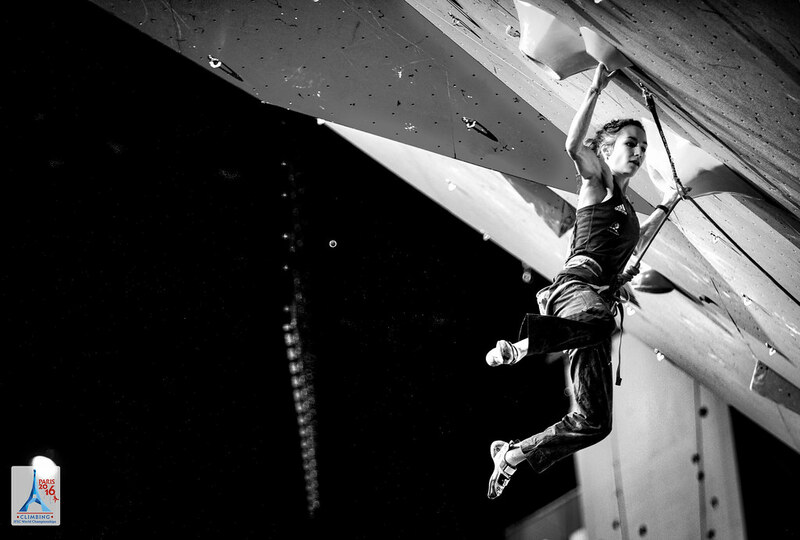 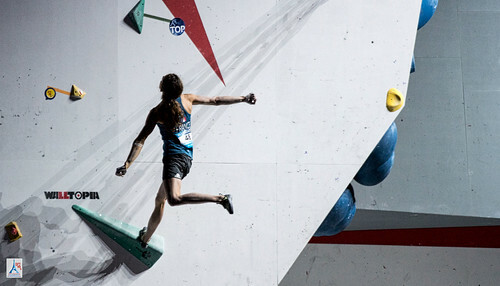 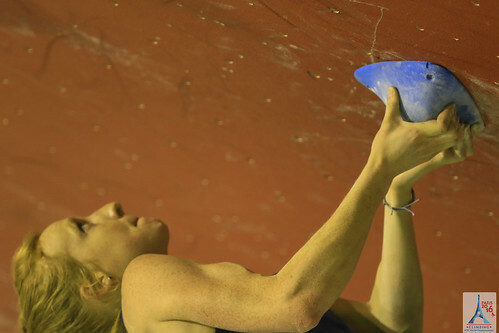 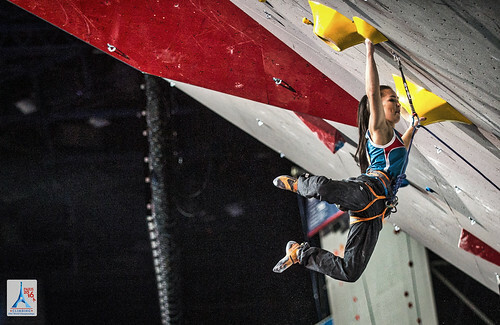 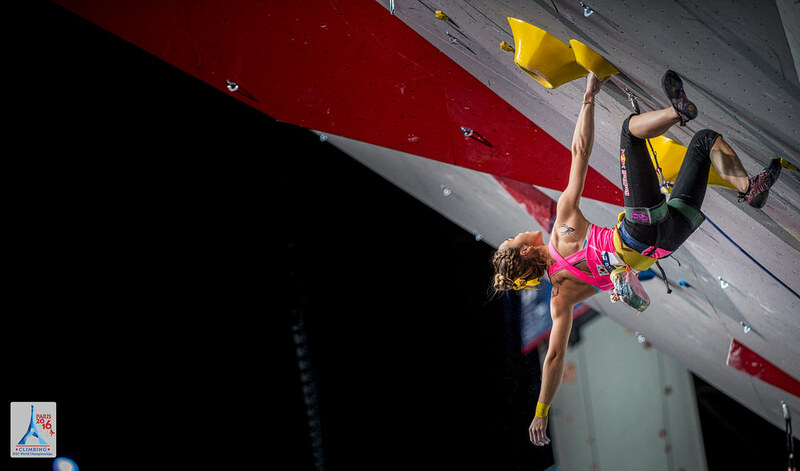 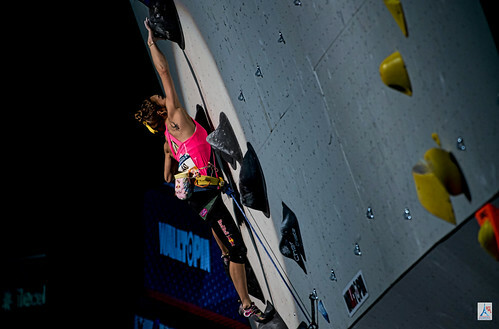 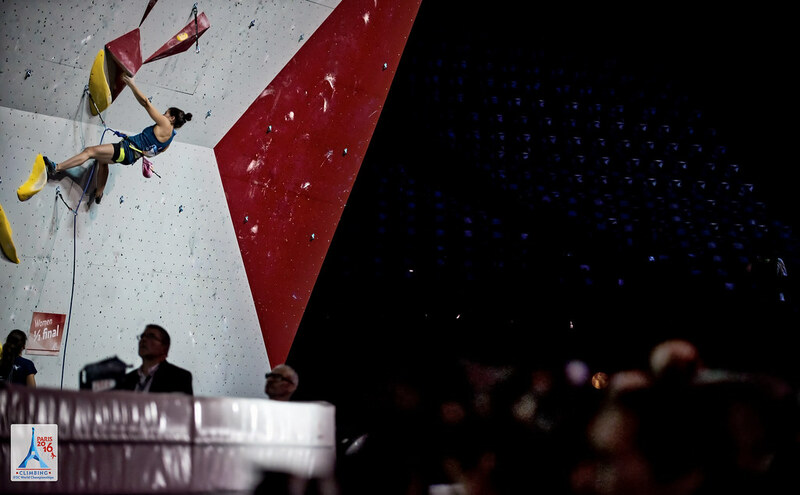 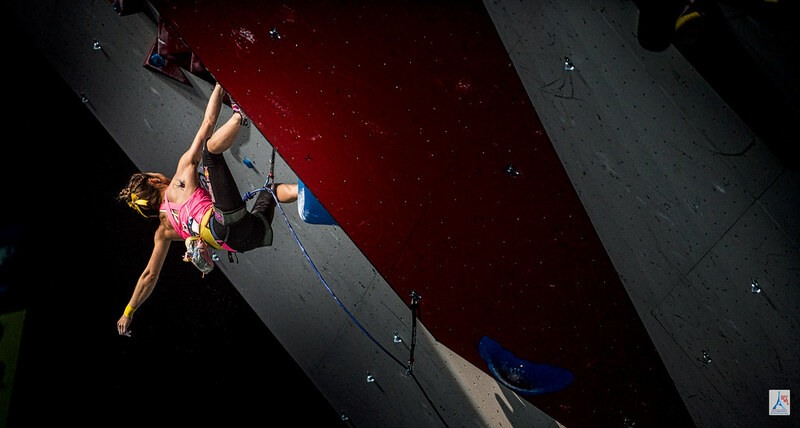 The emotional grand finale on Sunday started with Women Bouldering Finals. 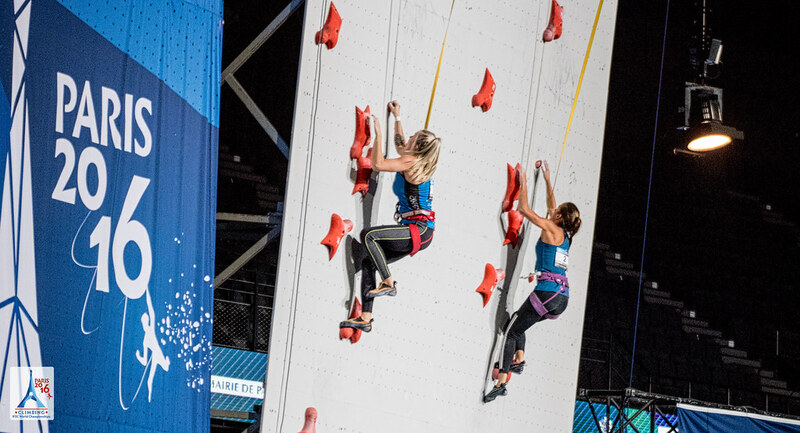 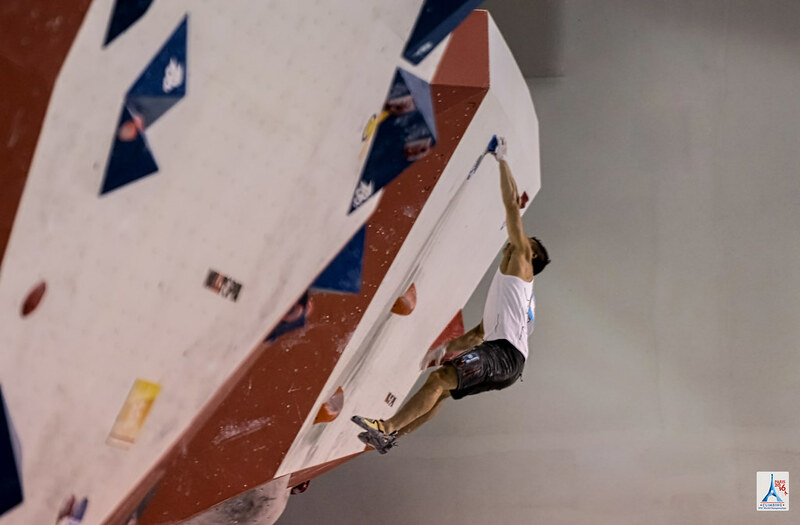 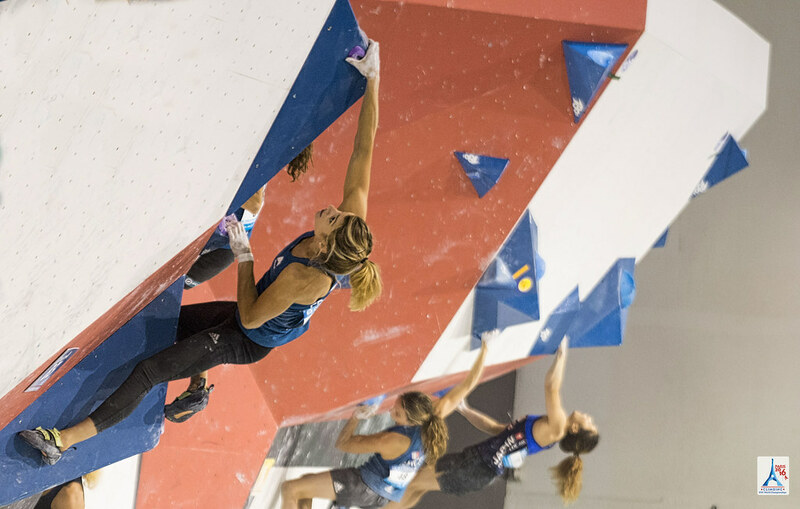 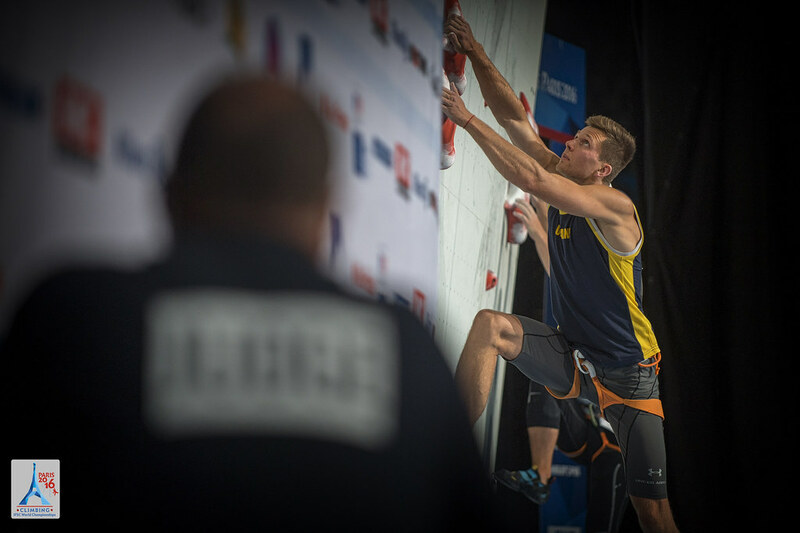 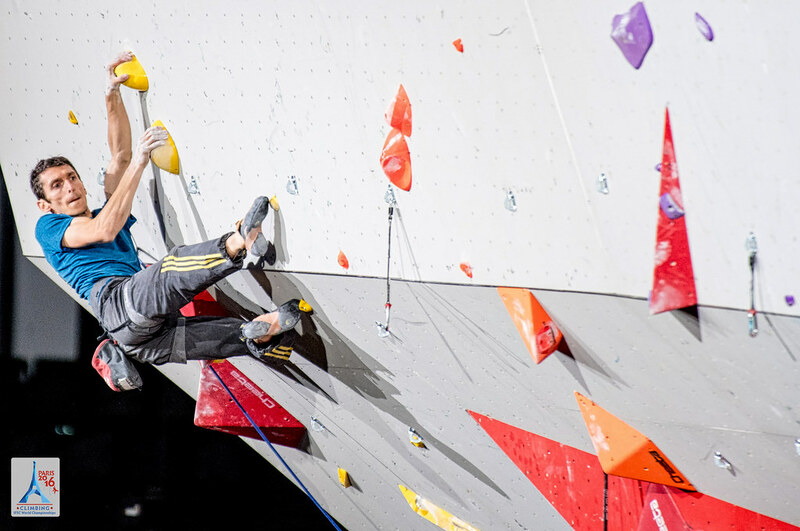 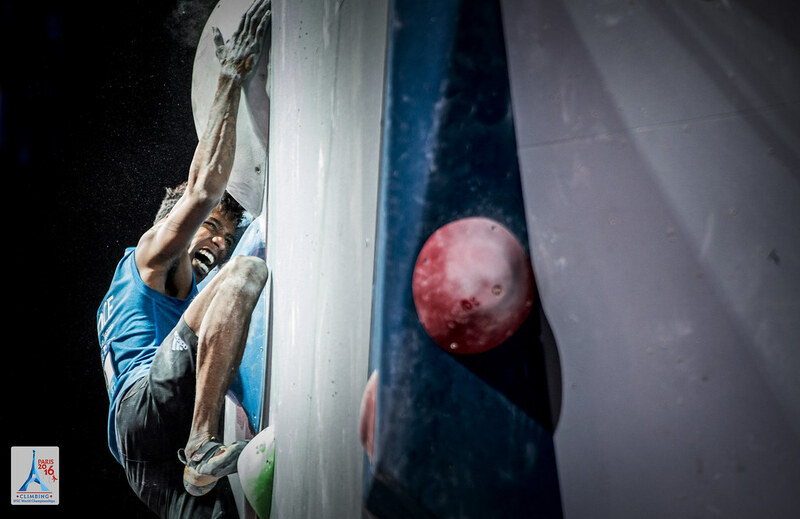 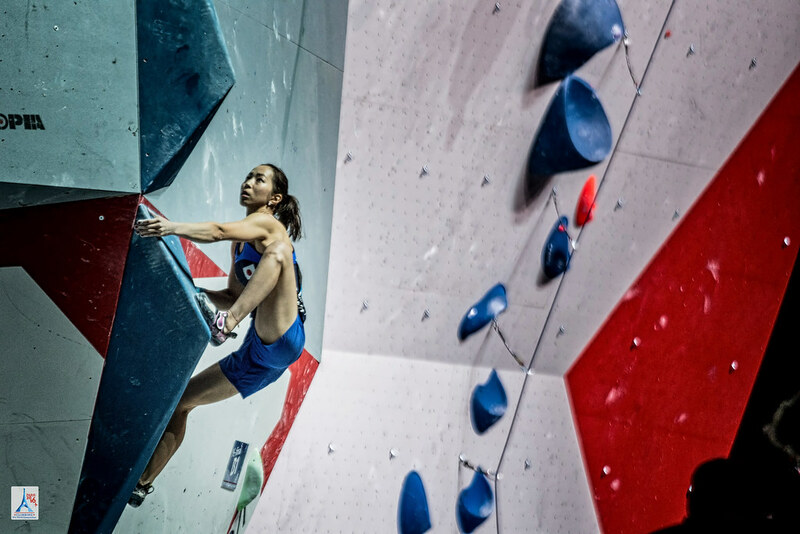 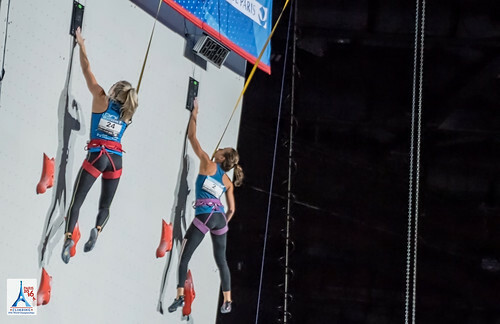 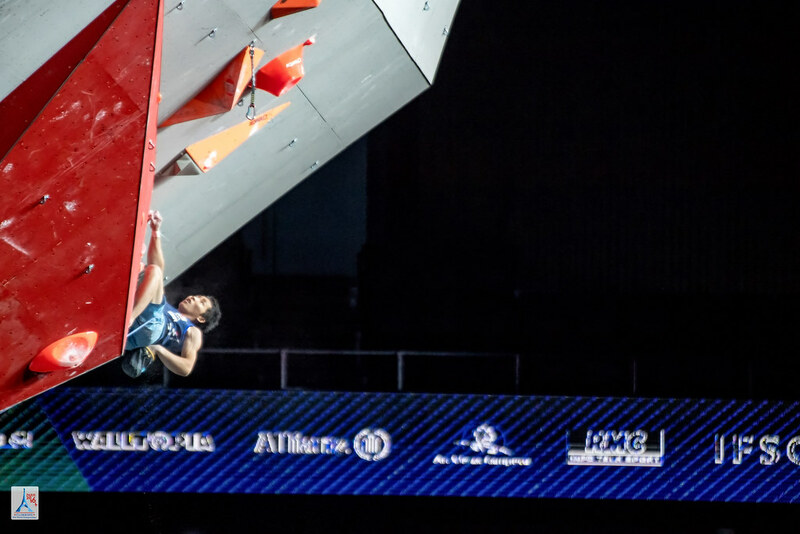 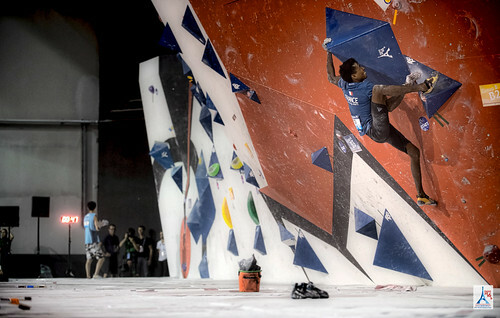 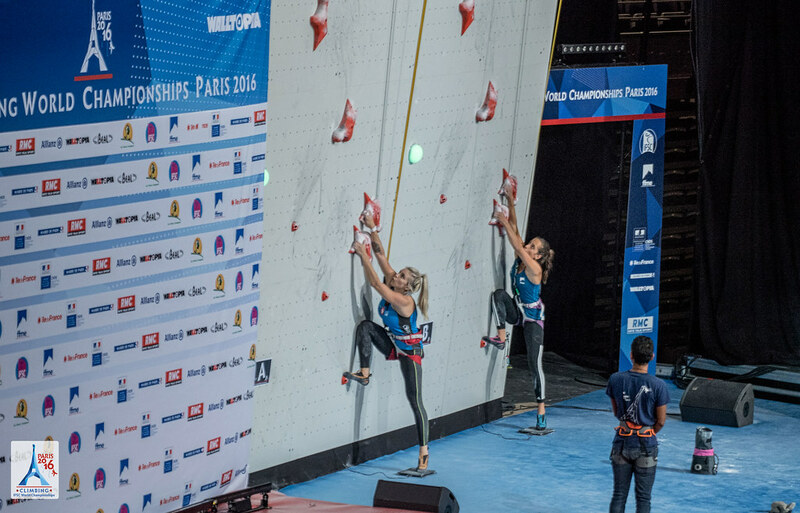 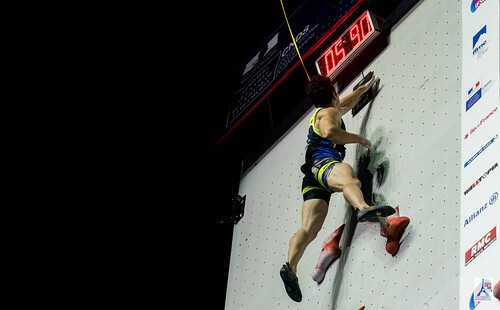 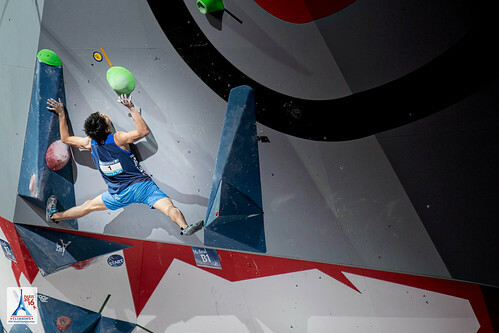 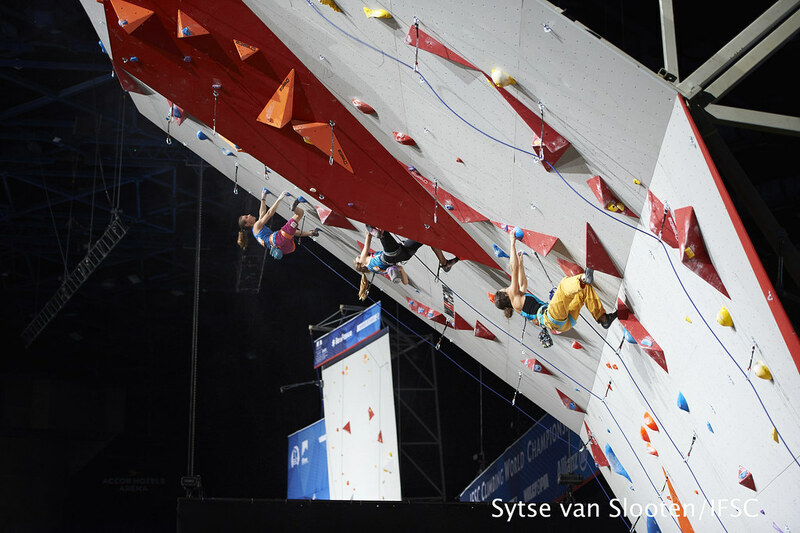 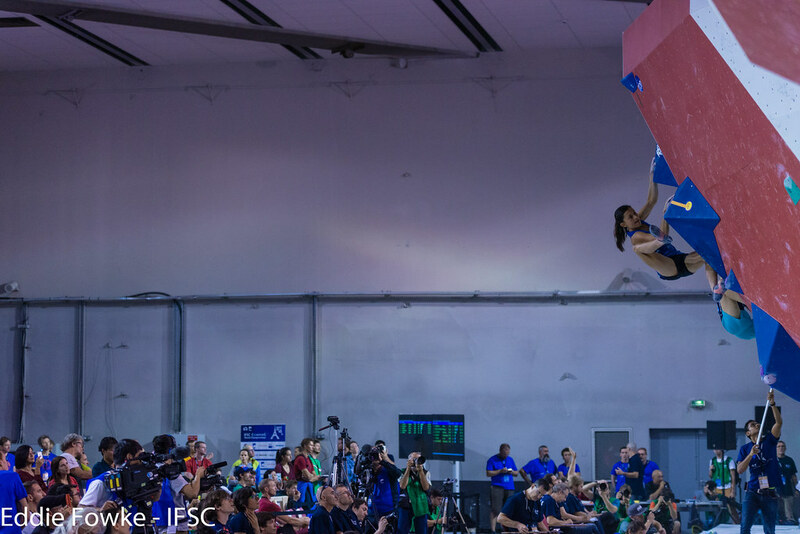 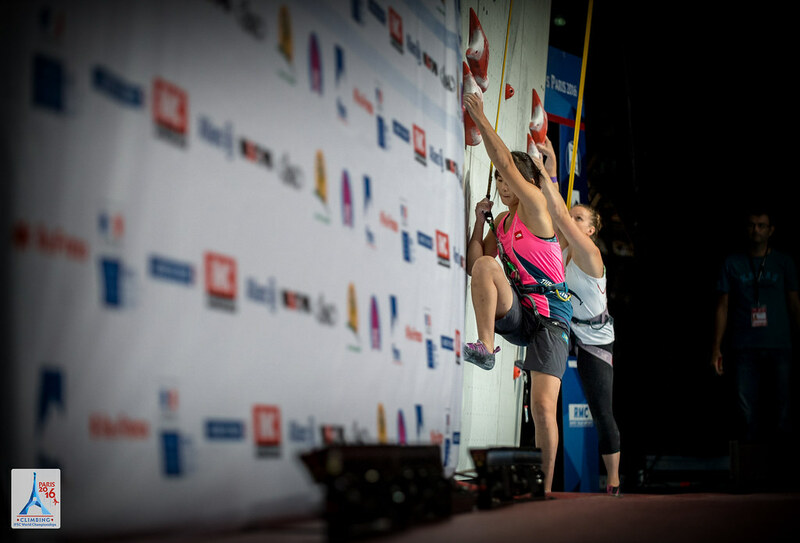 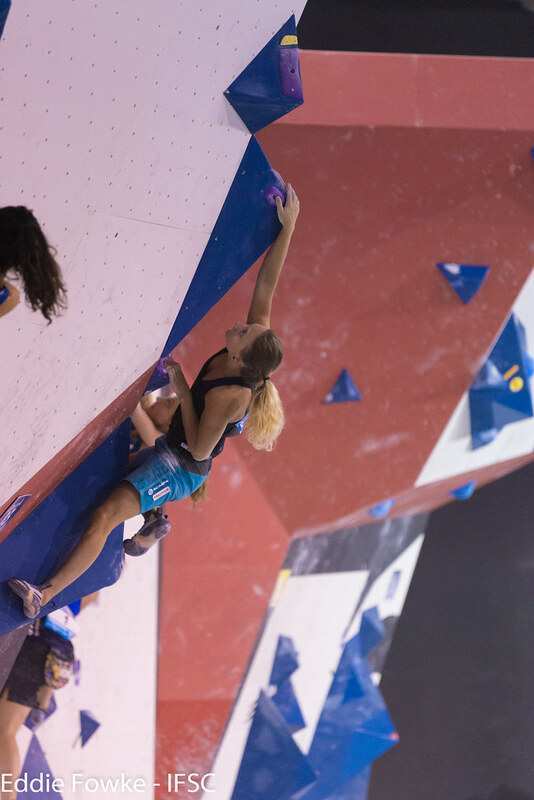 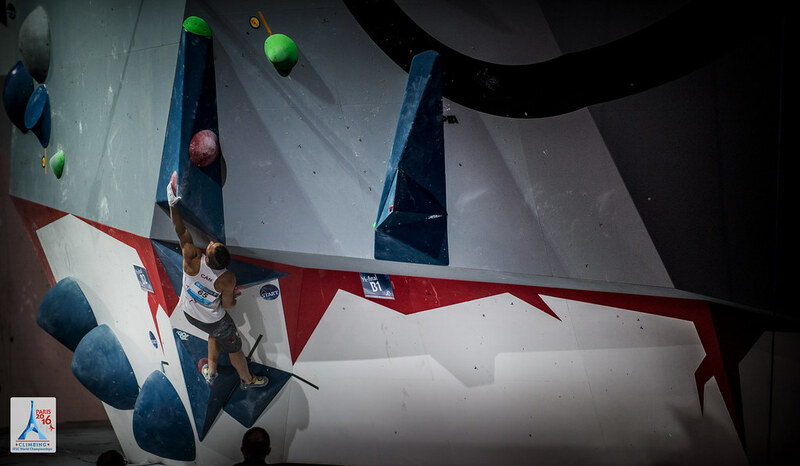 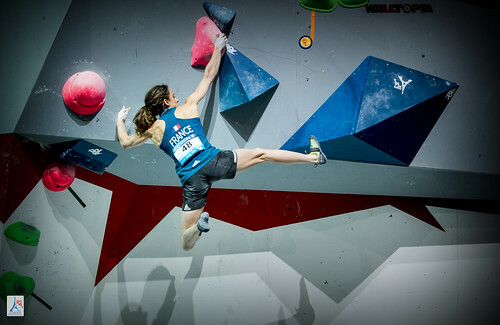 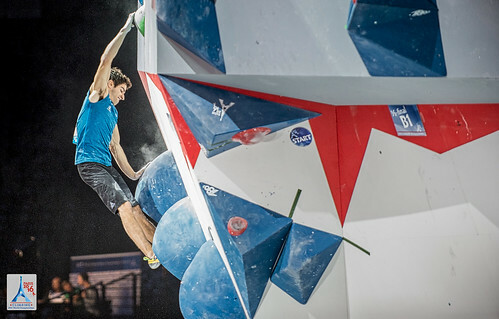 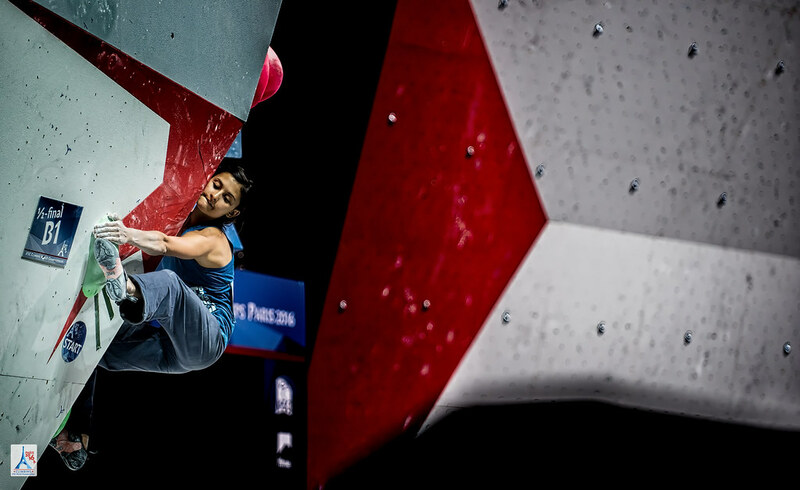 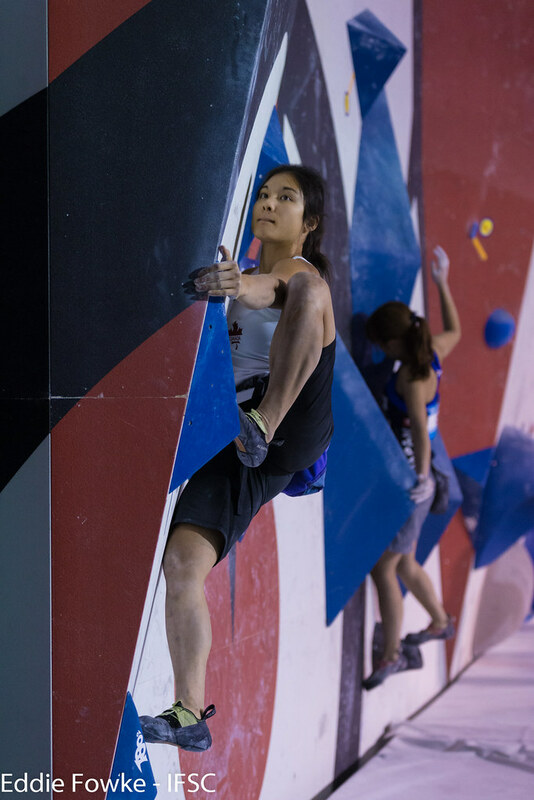 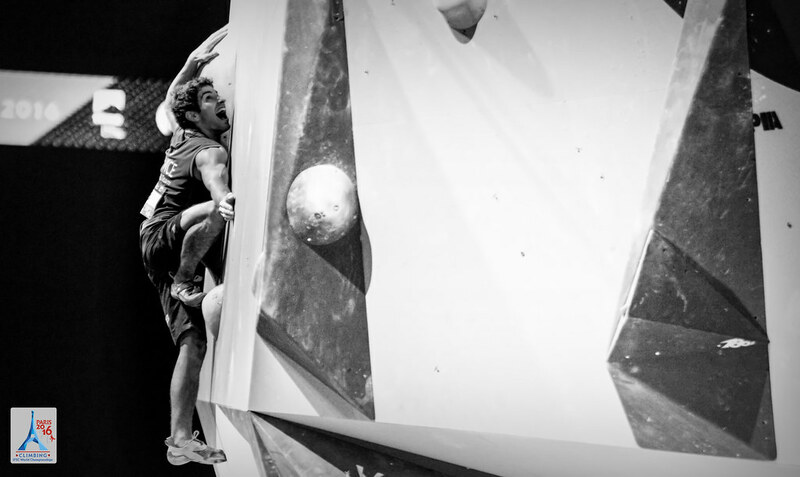 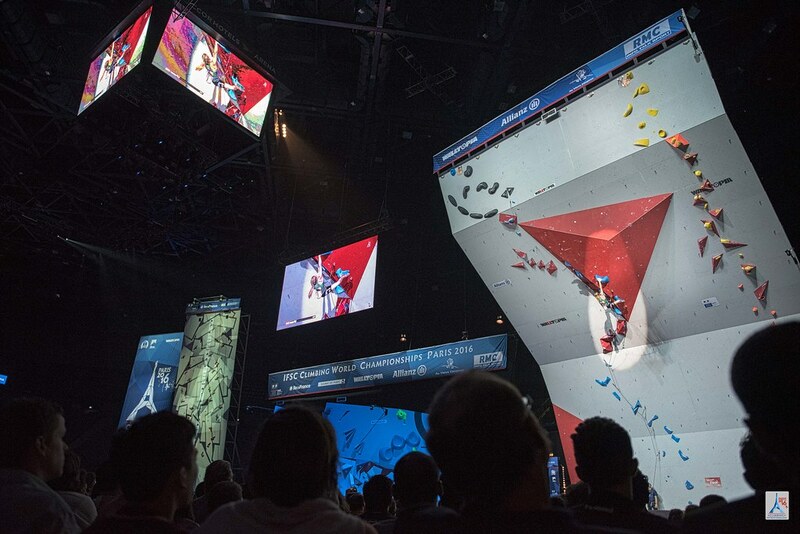 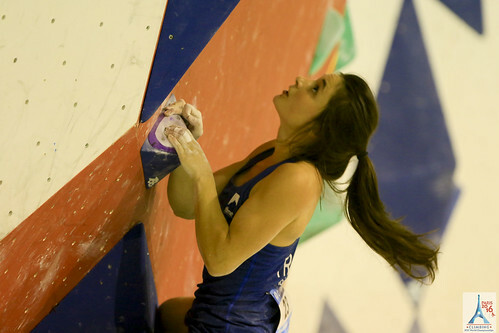 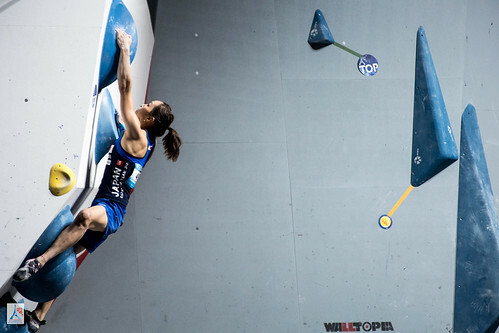 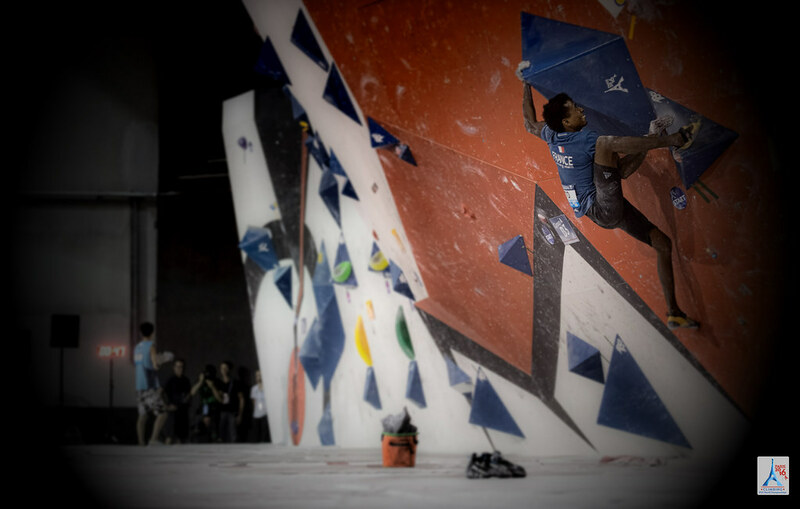 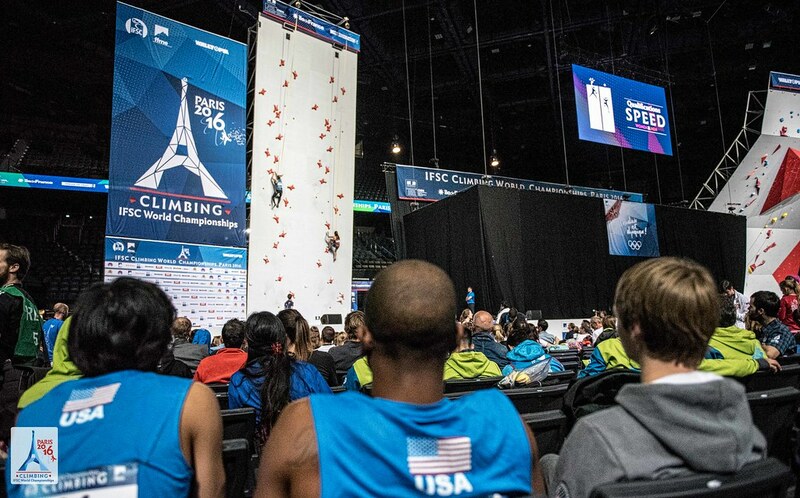 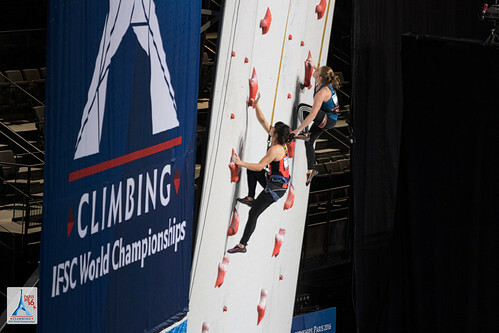 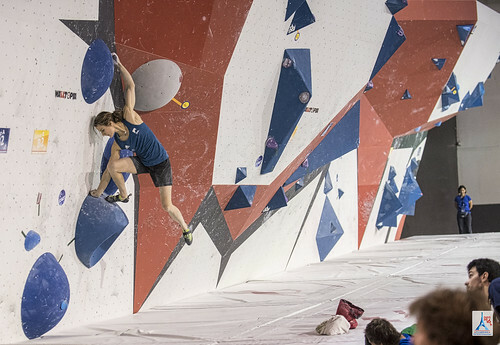 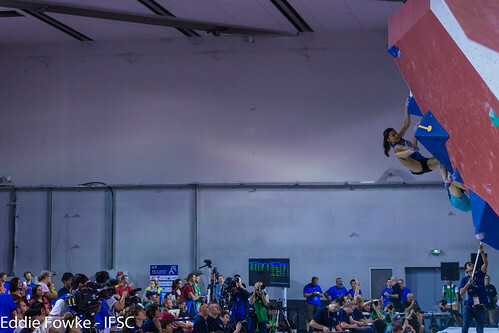 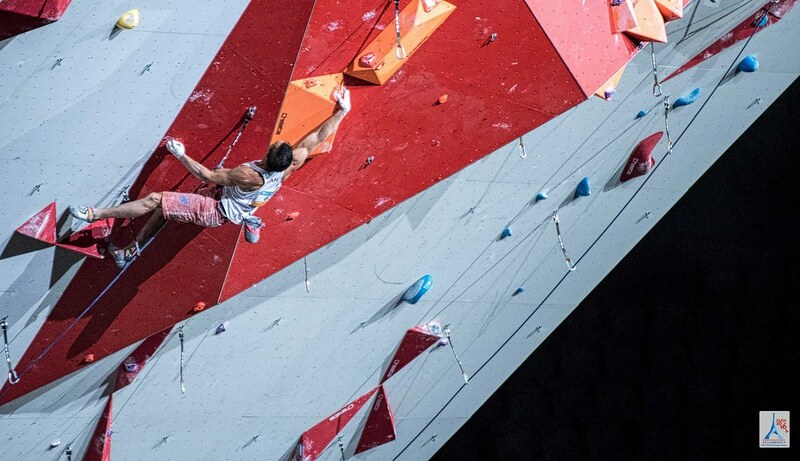 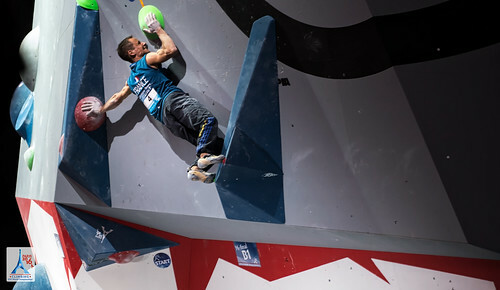 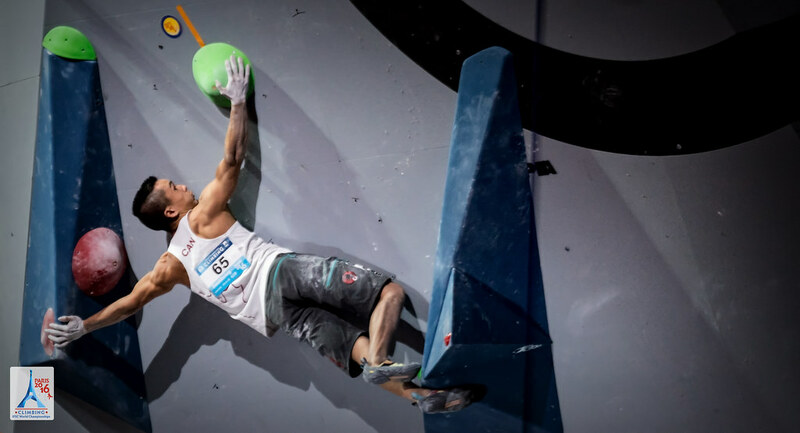 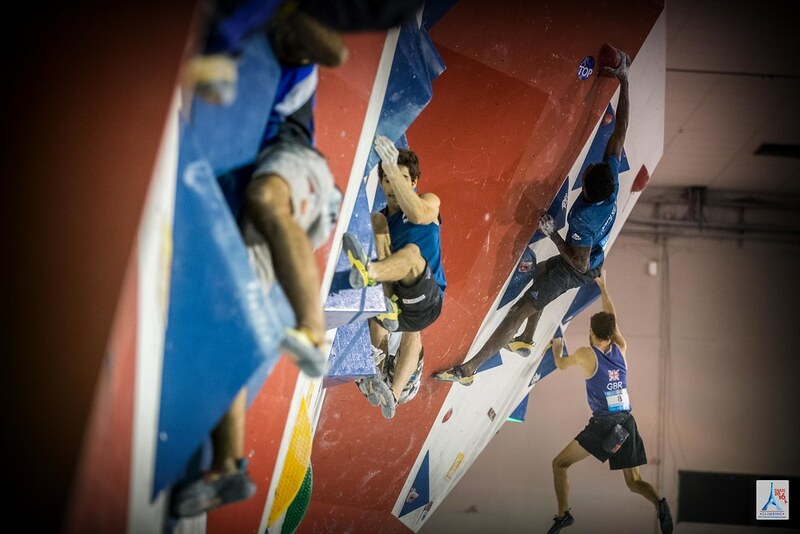 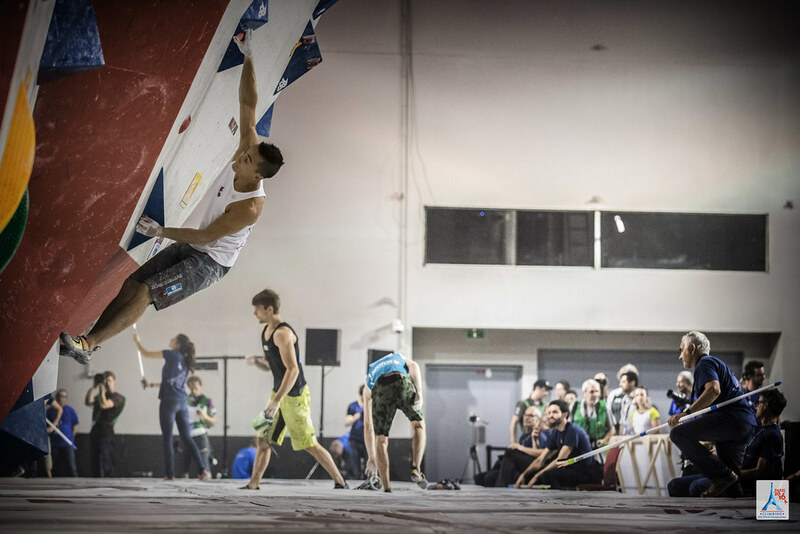 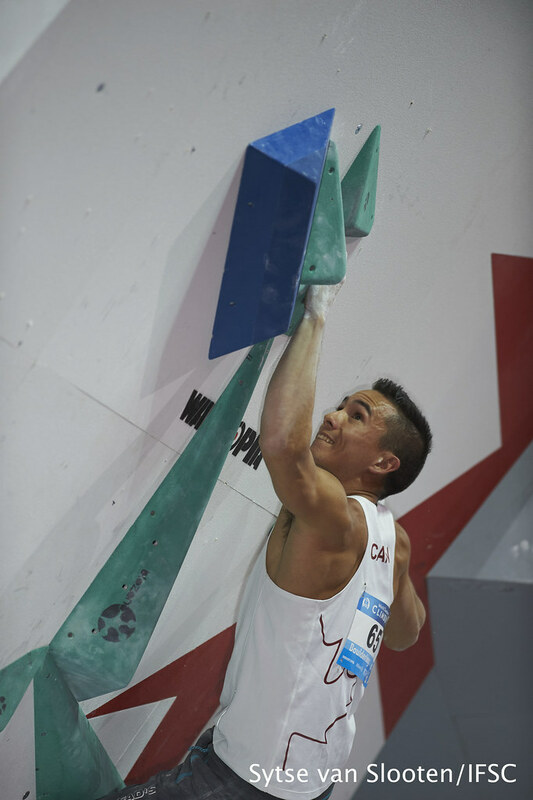 Nearly every finalist stuck the crowd-pleasing dyno on W1 and, although none of the six Athletes matched on the slippery finishing sloper, their wrestling with massive spherical volumes still energized the audience. Five Women solved W3, but only Petra Klingler, Akiyo Noguchi and Megan Mascarenas did so on their first attempts. 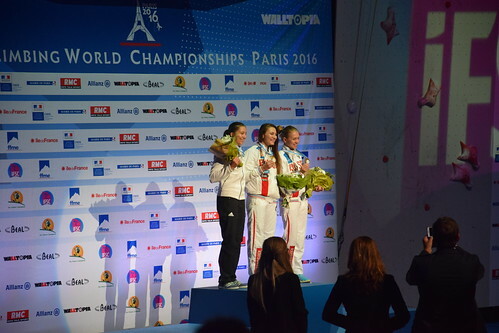 With many Athletes tied at two Tops apiece, the medal distribution came down to W4. The crowd erupted when Klingler powered through the crux and lunged for the concluding jug. 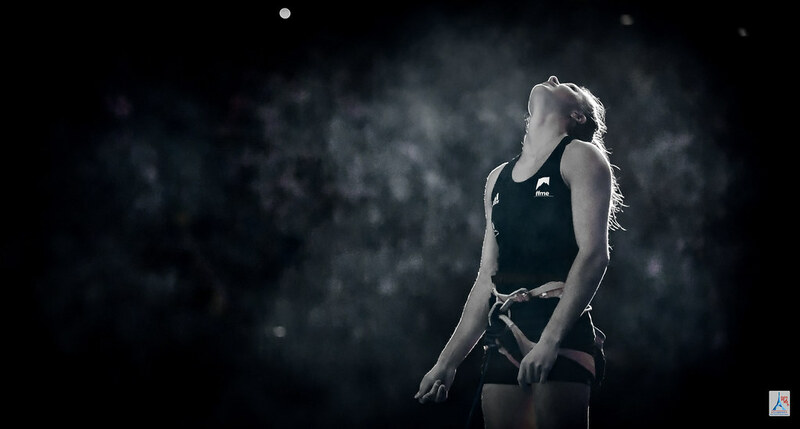 She hugged her coach with full eyes, having earned a spot on the podium. That place turned into first place when Noguchi could not Top W4, but the veteran Japanese Athlete’s effort to reach bonus still bumped Mascarenas out of third. 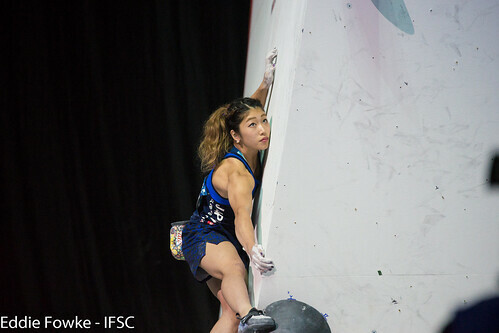 Miho Nonaka made it two medals for Japan with the other Top on W4. 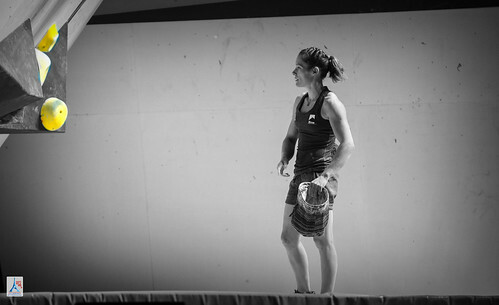 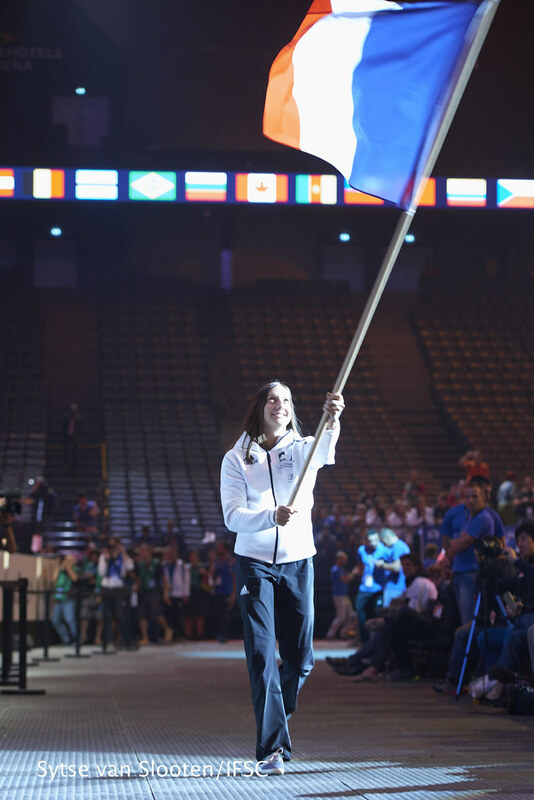 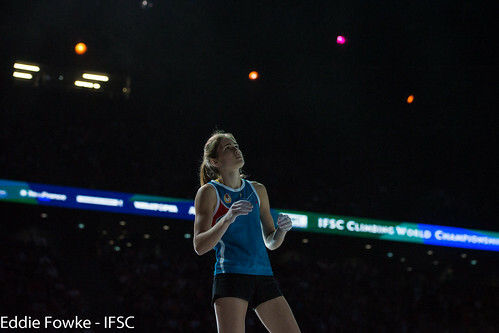 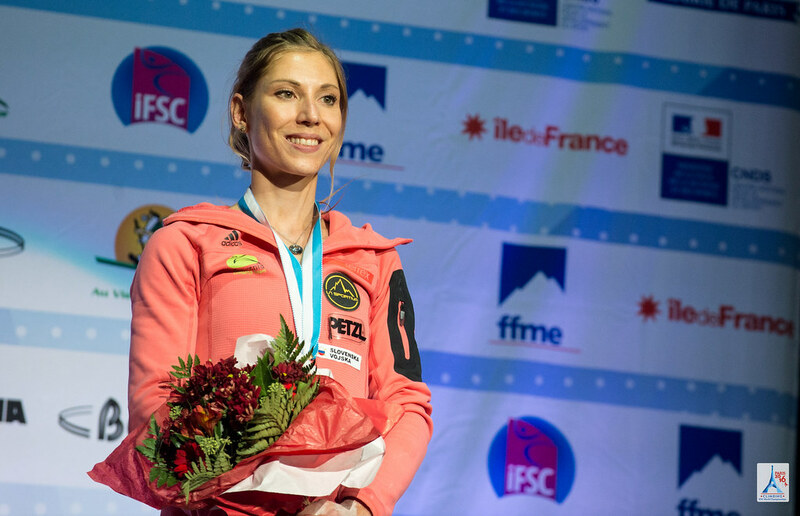 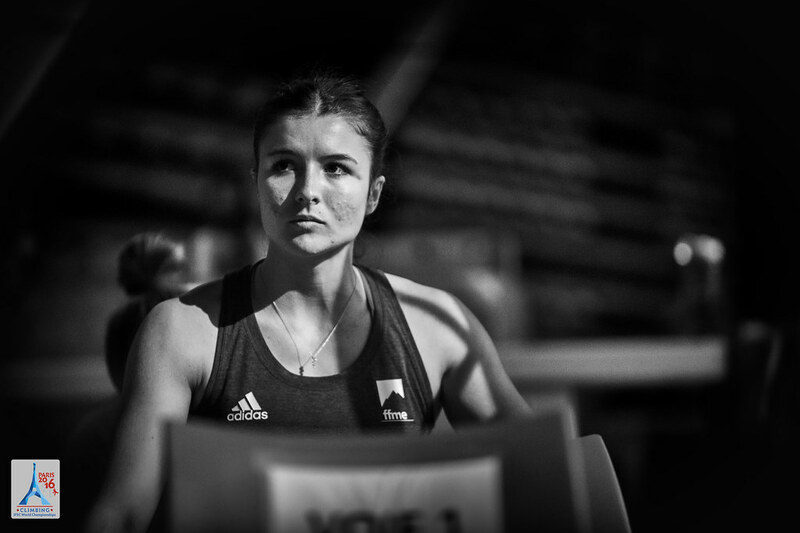 Later in the afternoon, Anouck Jaubert of France faced-off in the semi-final against Russian Iuliia Kaplina, the current Speed World Record holder. Jaubert slipped early on, but the leader of the 2016 Speed World Cup rankings was resilient and caught up to Kaplina just in time. 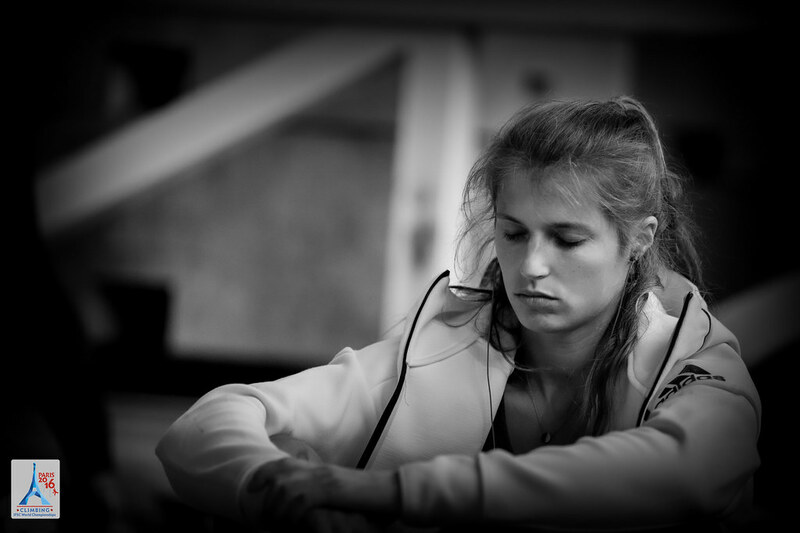 Anna Tsyganova looked strong all week and didn’t stop on Sunday, besting a very quick Aleksandra Rudzinska of Poland. 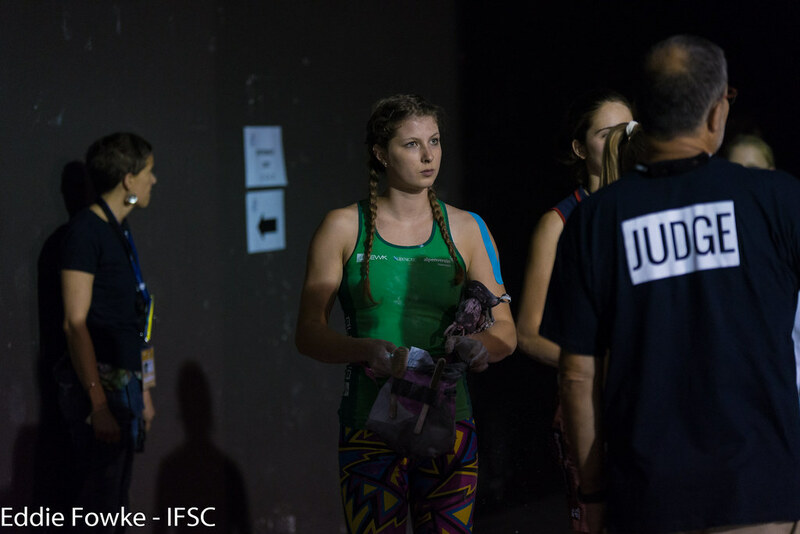 In the final, thrilling race, both Jaubert and Tsyganova showed their best and posted times under eight seconds. 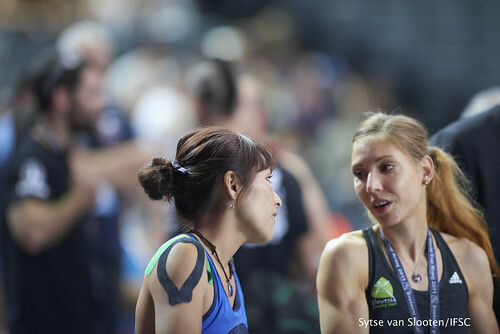 In the end, Tsyganova claimed the world title with a jaw-dropping time of 7.52. 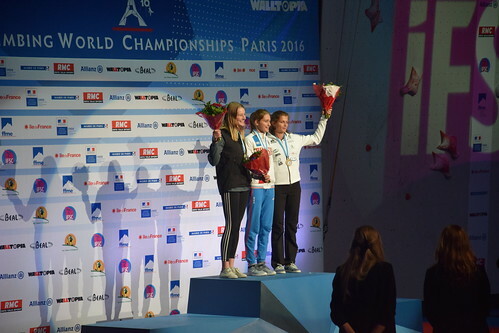 Kaplina rounded out the podium with a victory in the small final. 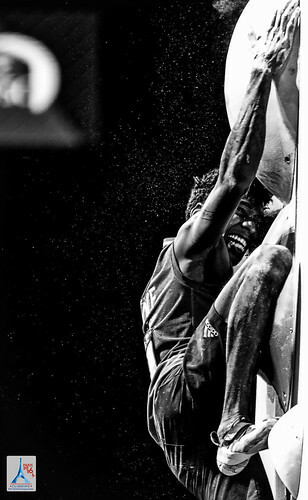 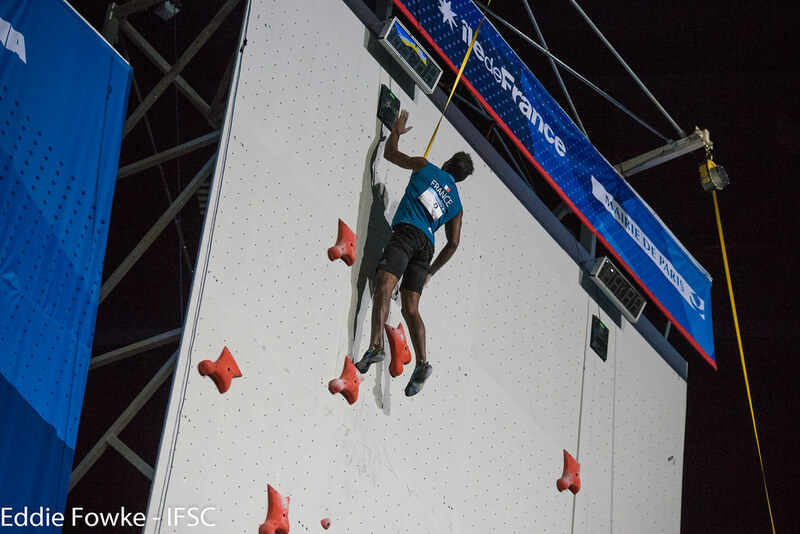 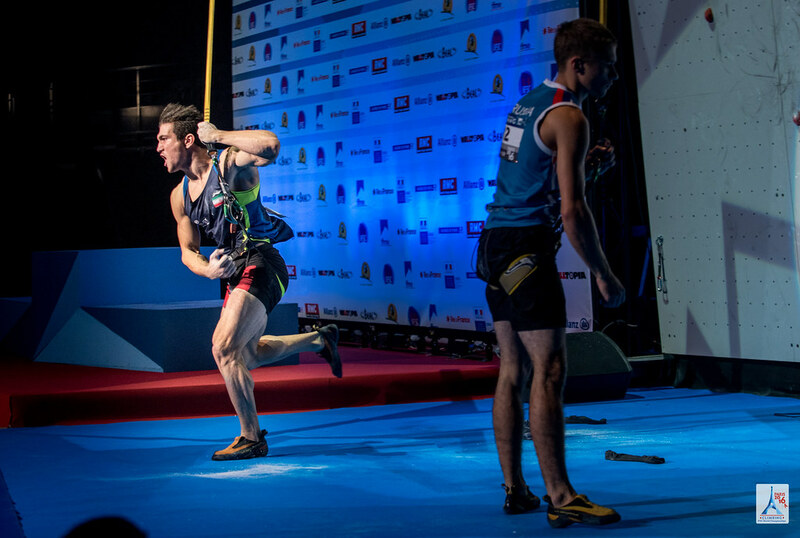 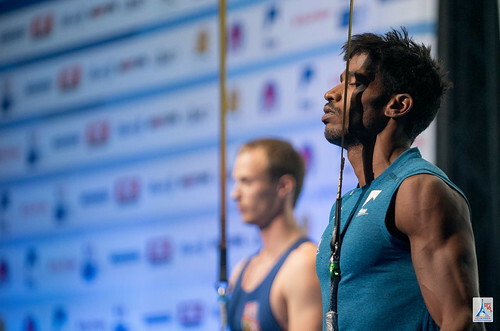 It is hard to imagine a better finish to these IFSC World Championships than what took place in the Men Lead Finals. A dyno at the base of the route started the applause, followed by powerful steep climbing in the middle section and a taxing final traverse on crimps and slopers. 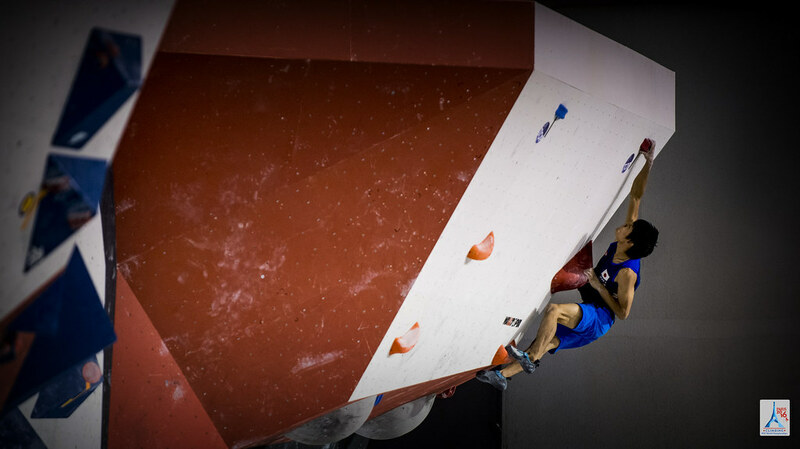 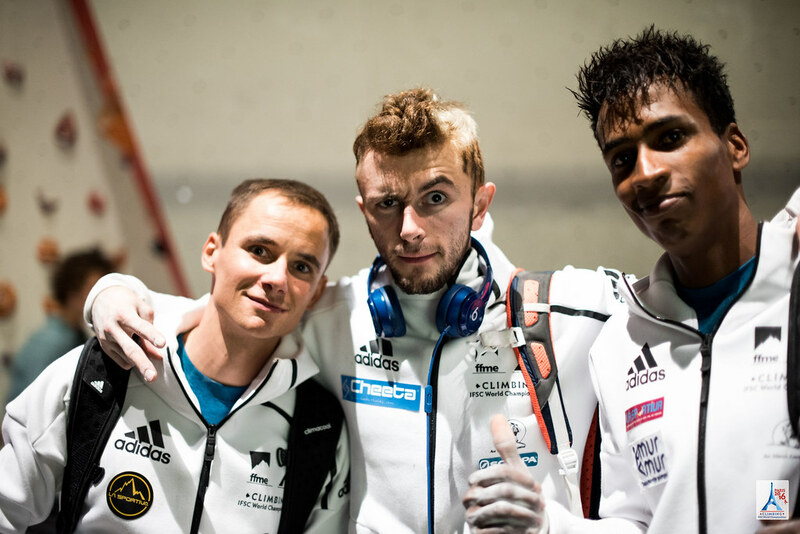 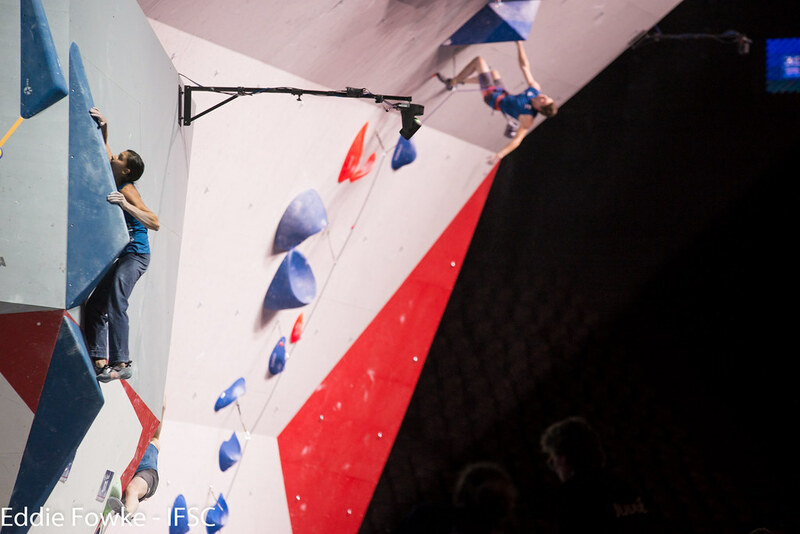 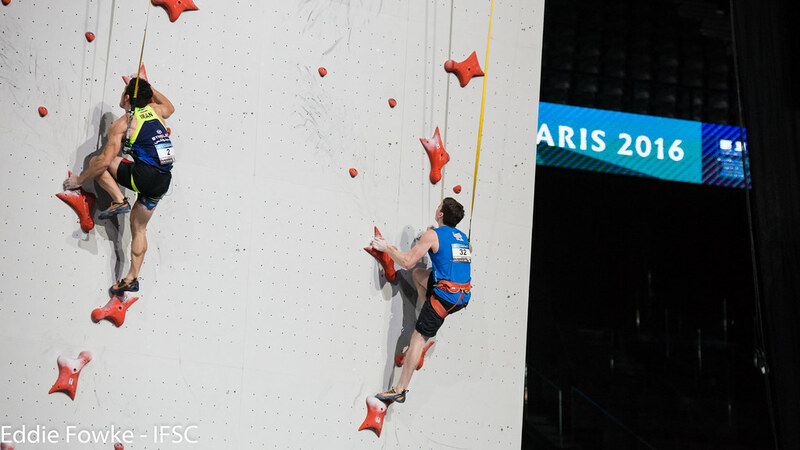 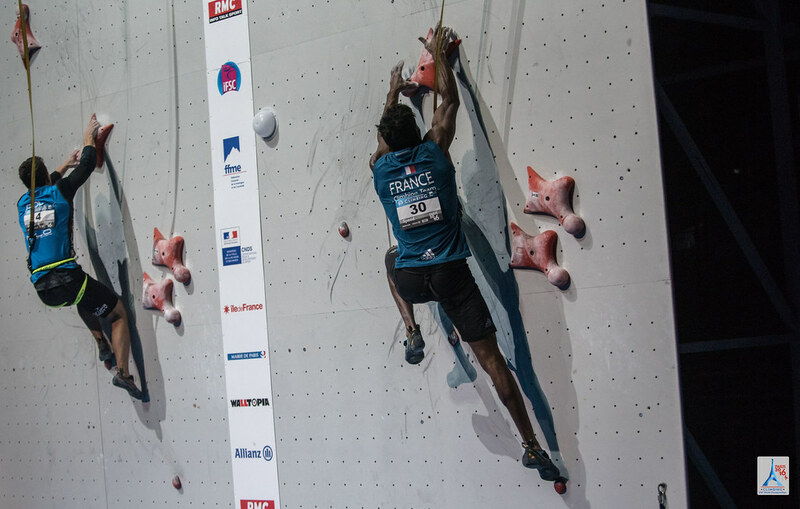 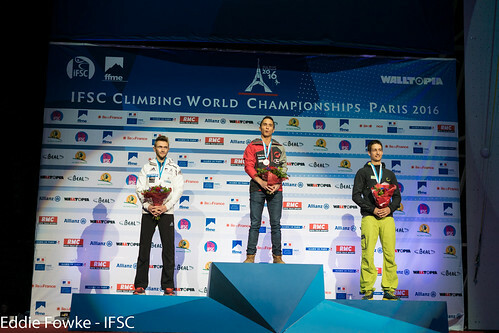 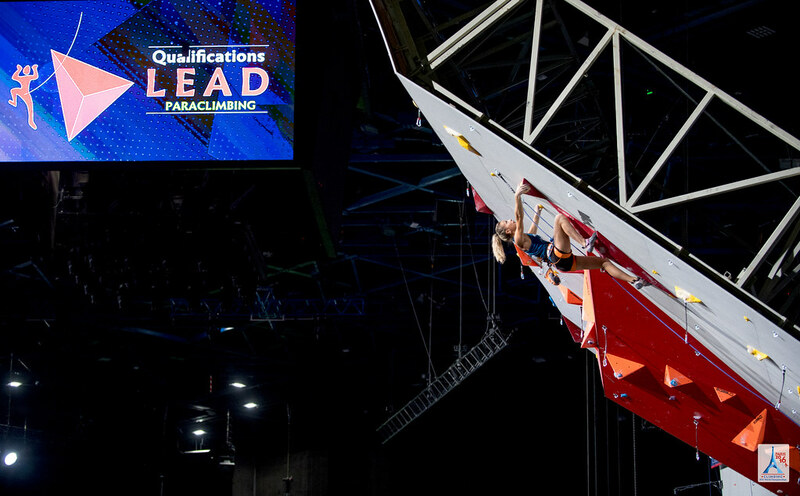 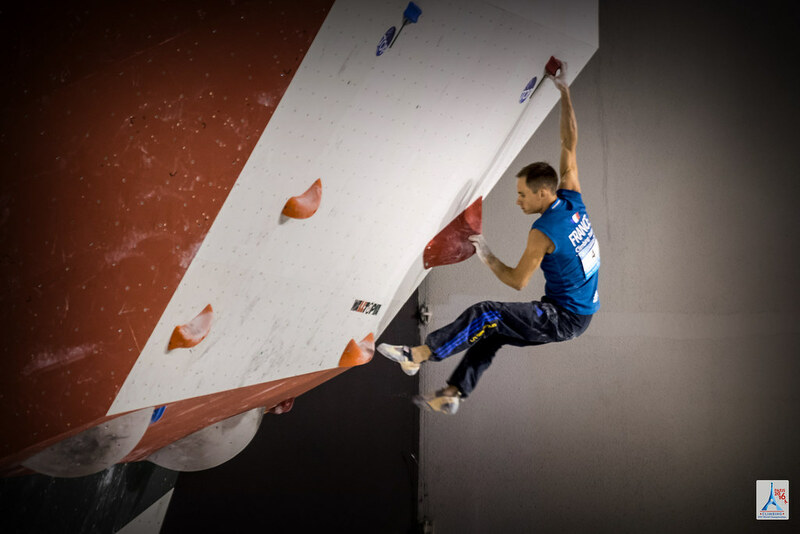 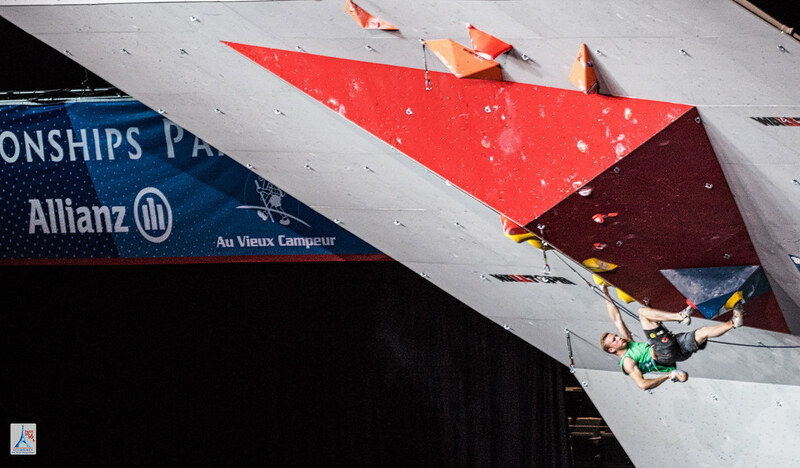 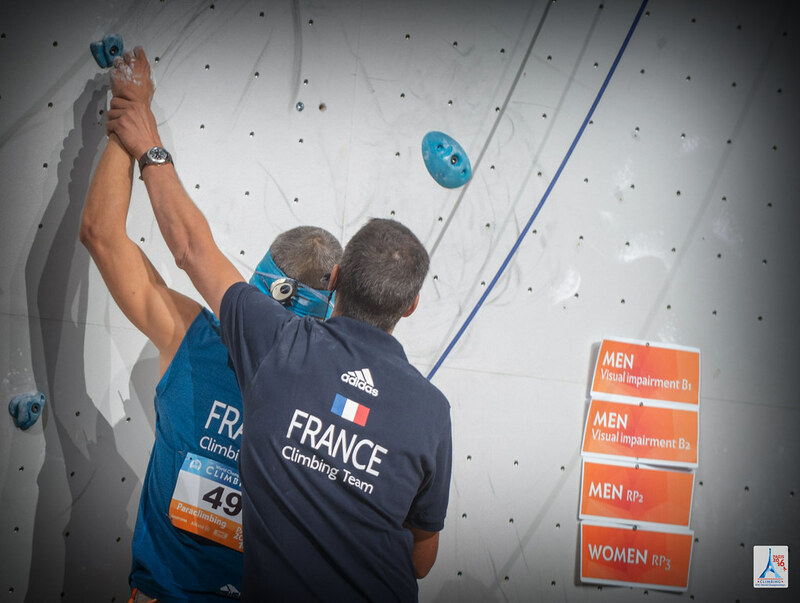 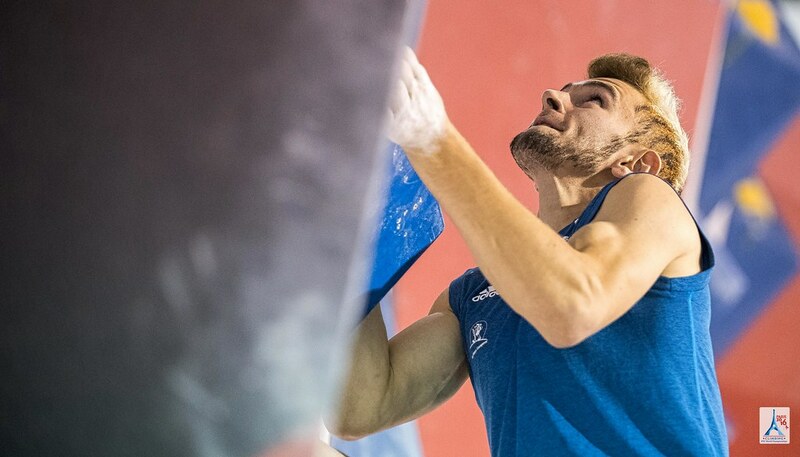 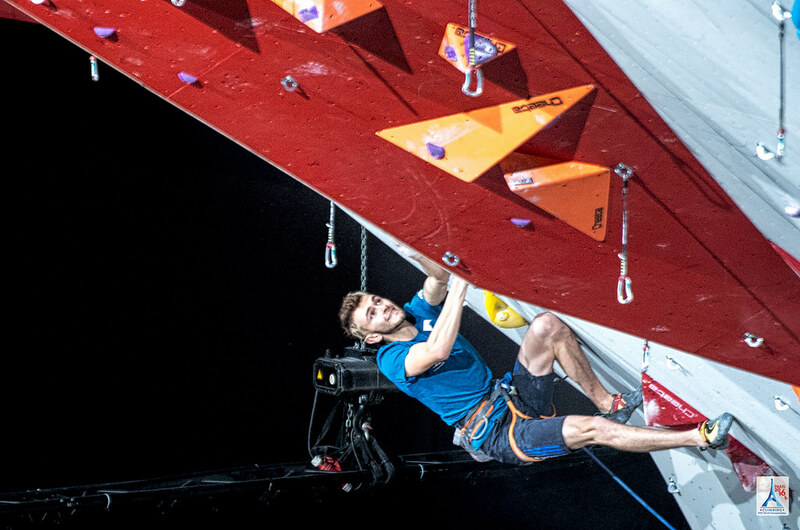 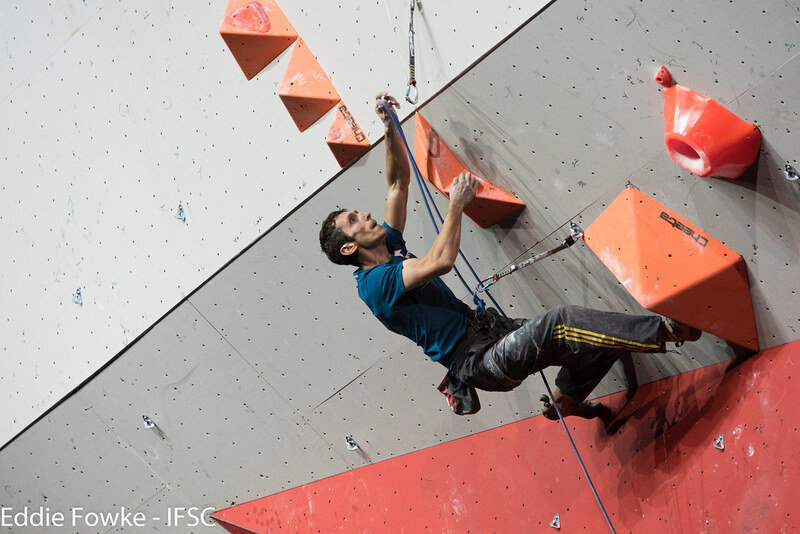 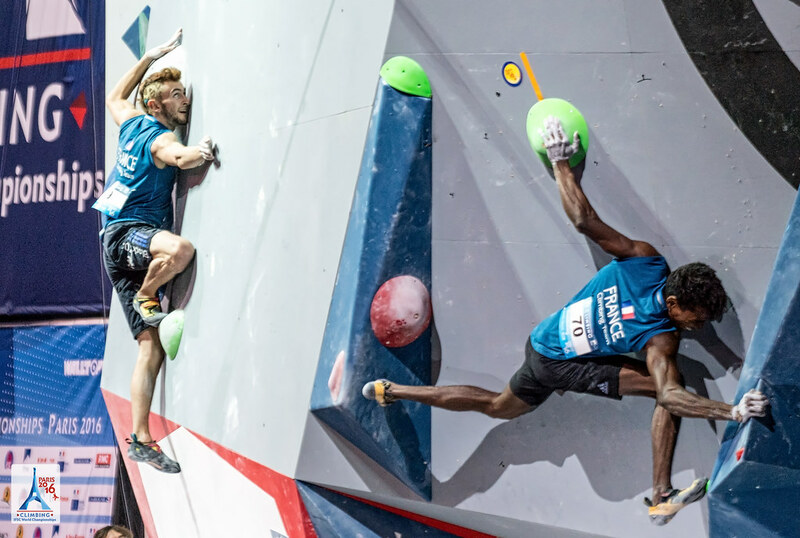 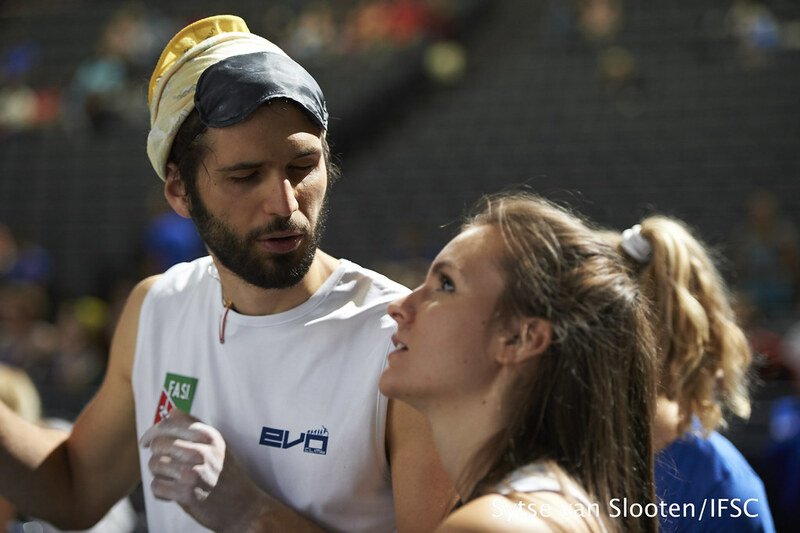 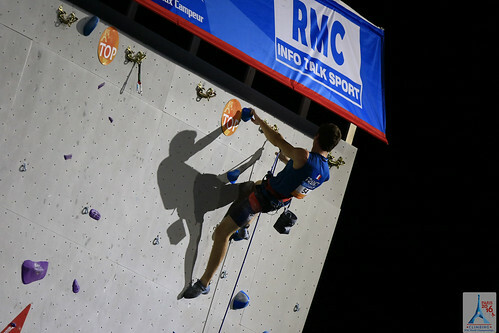 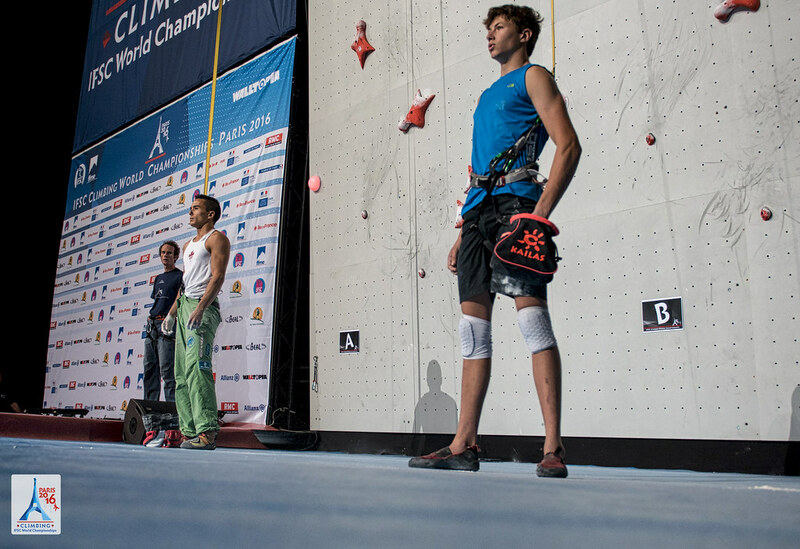 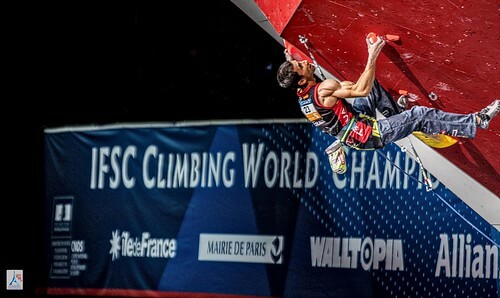 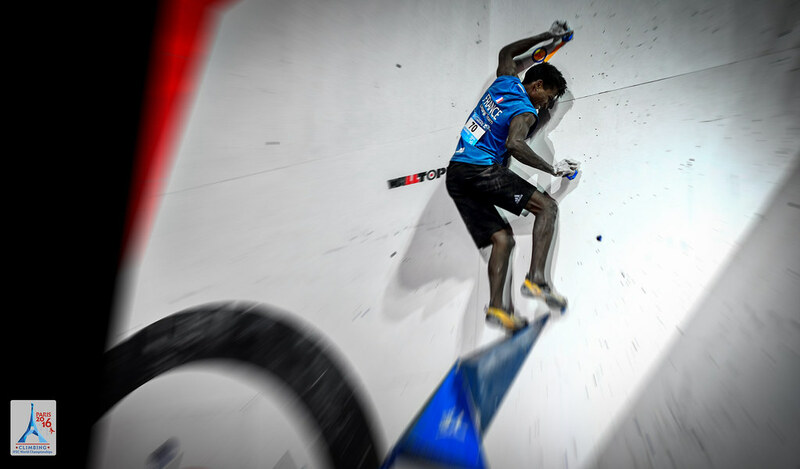 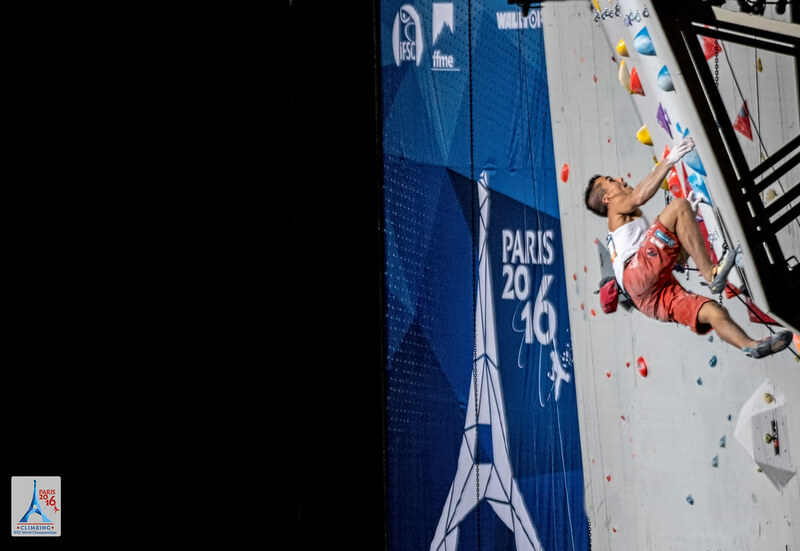 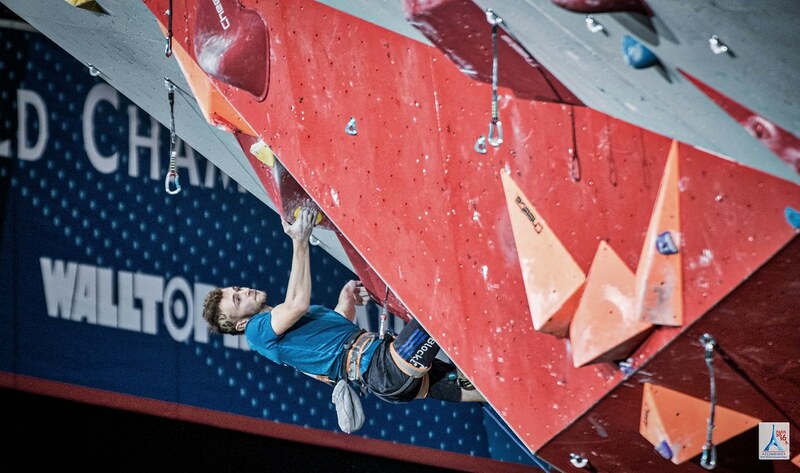 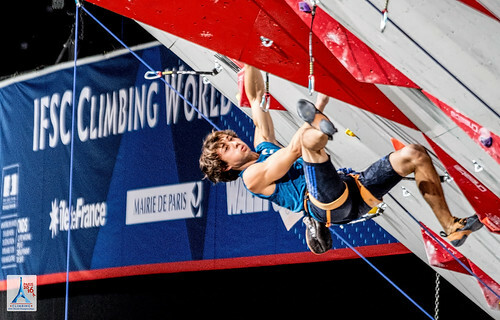 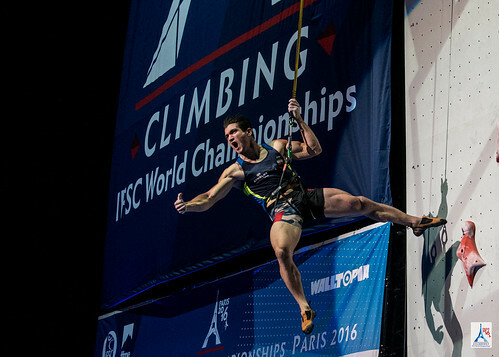 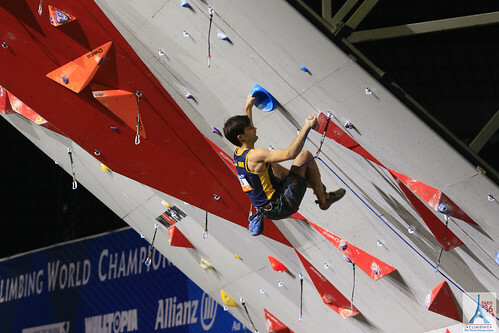 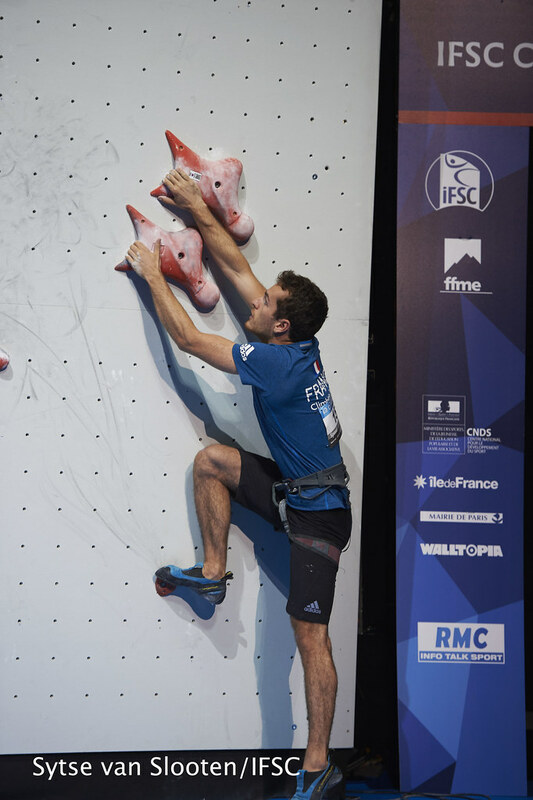 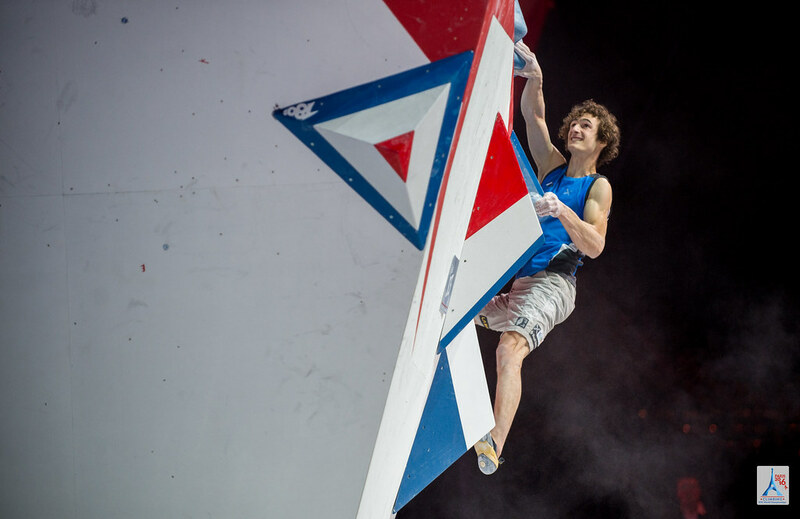 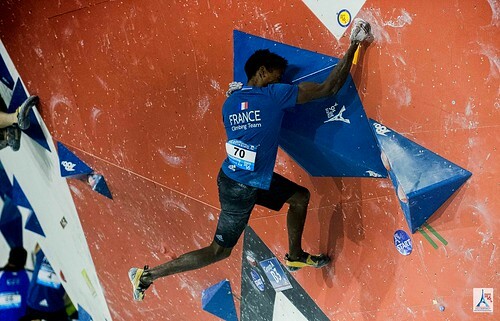 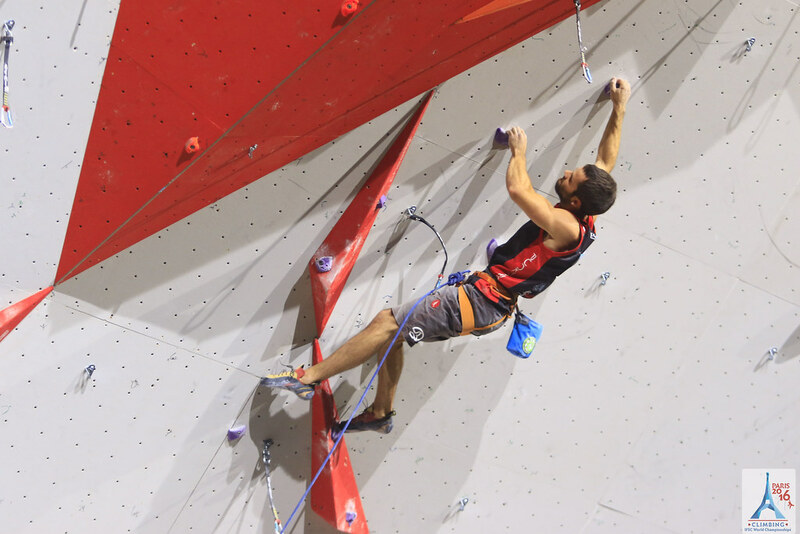 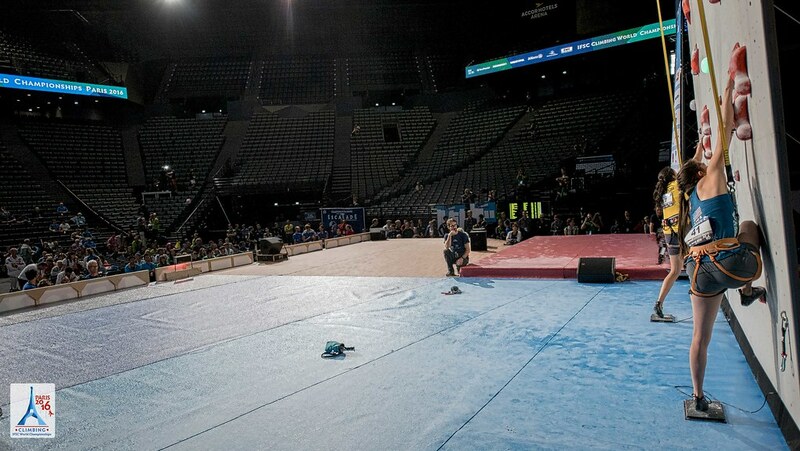 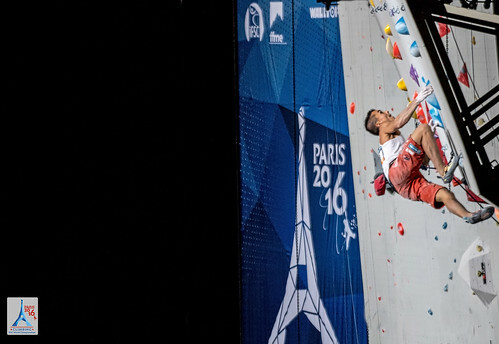 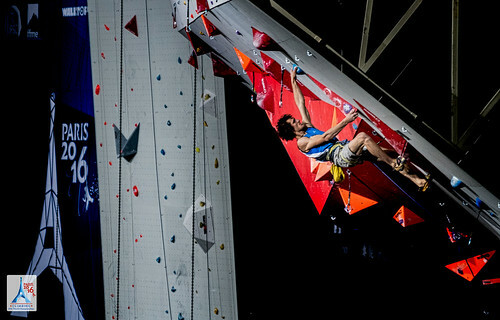 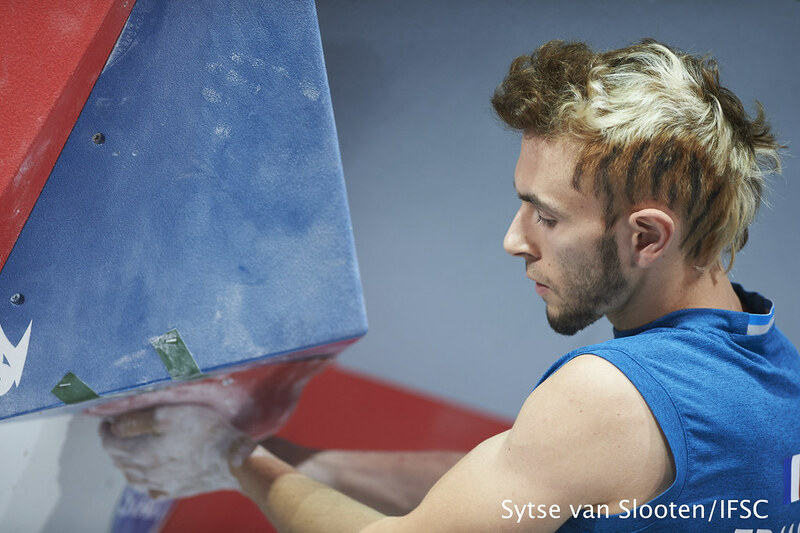 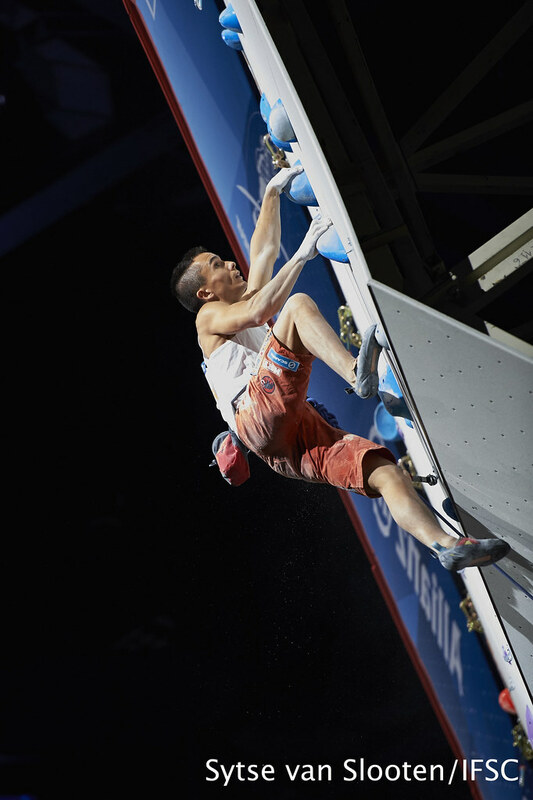 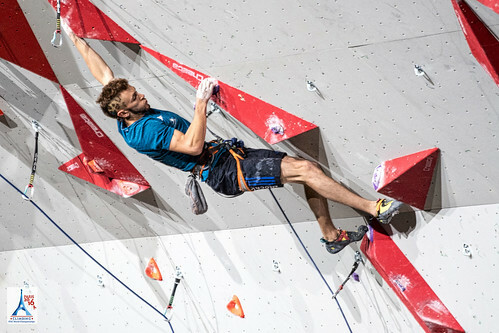 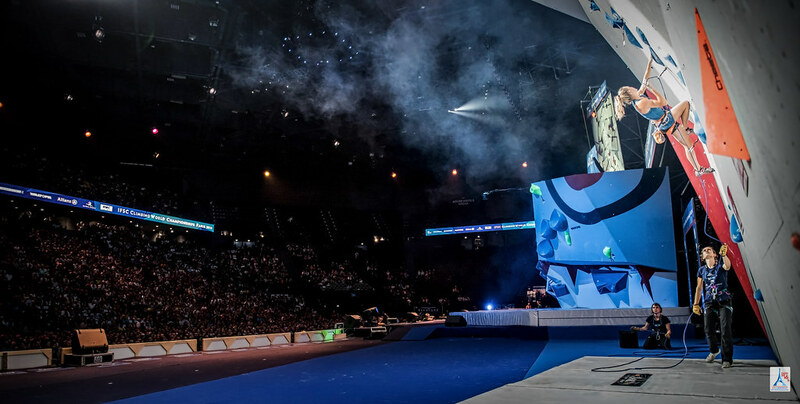 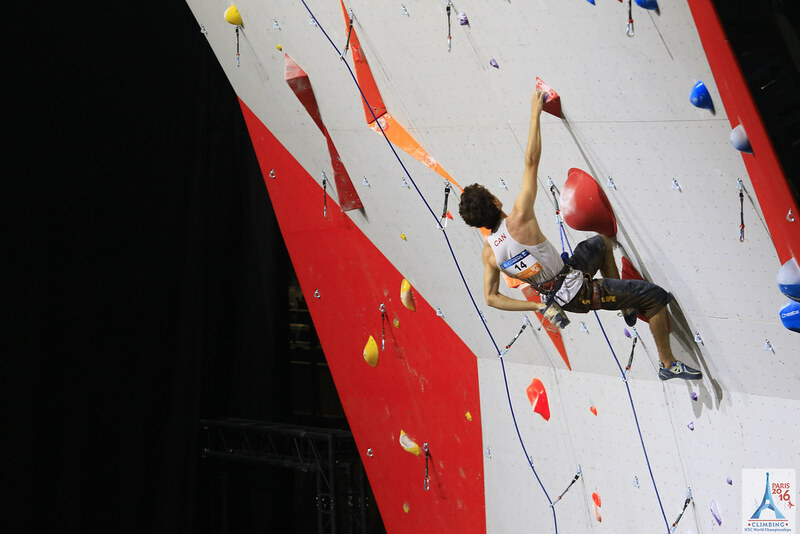 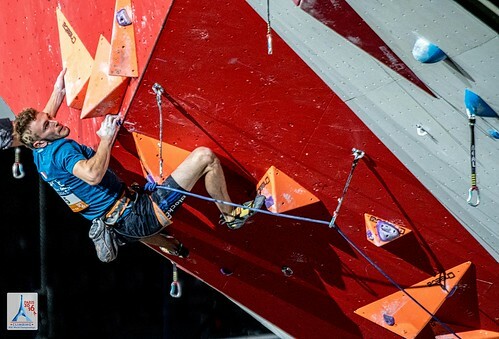 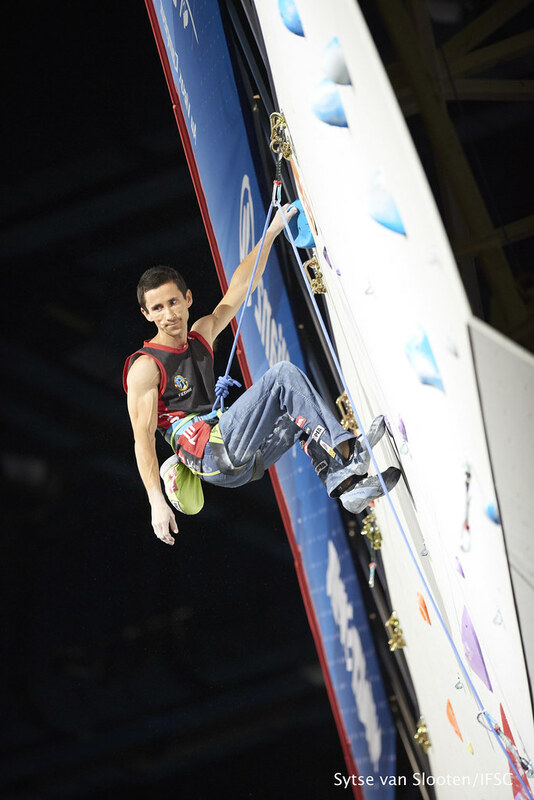 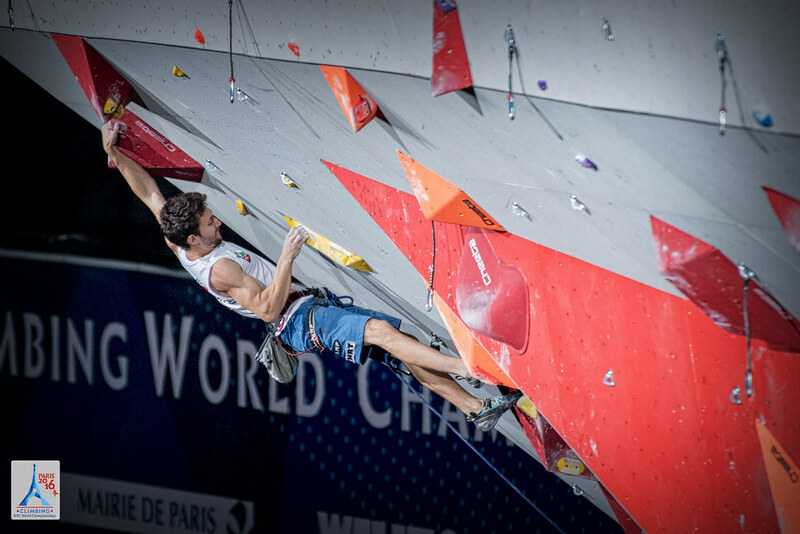 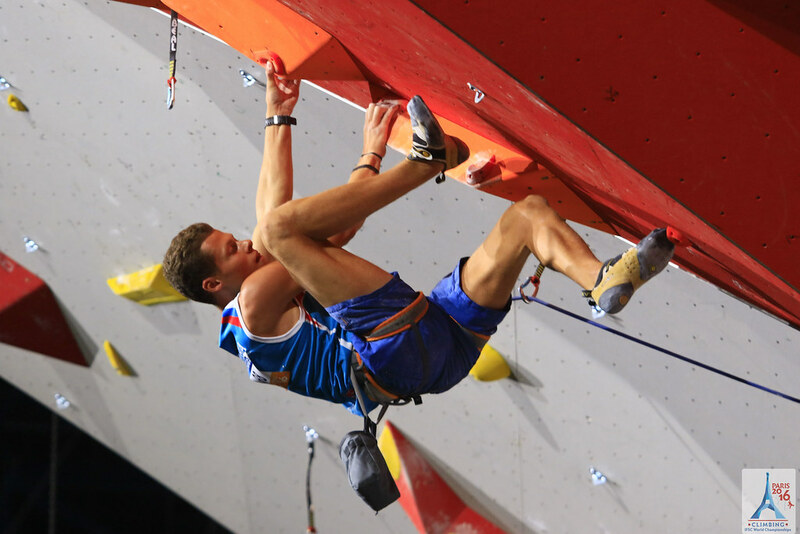 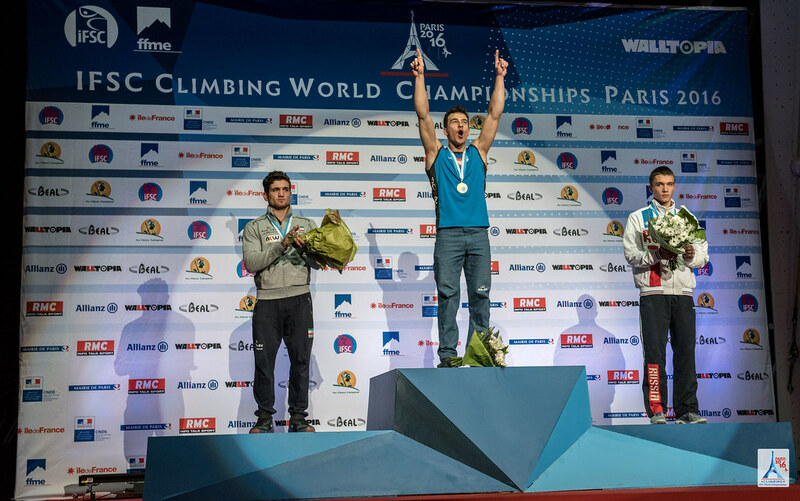 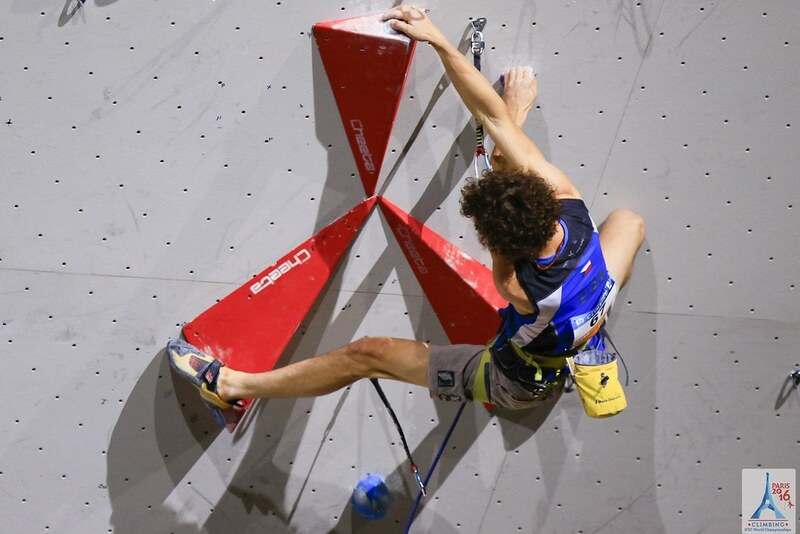 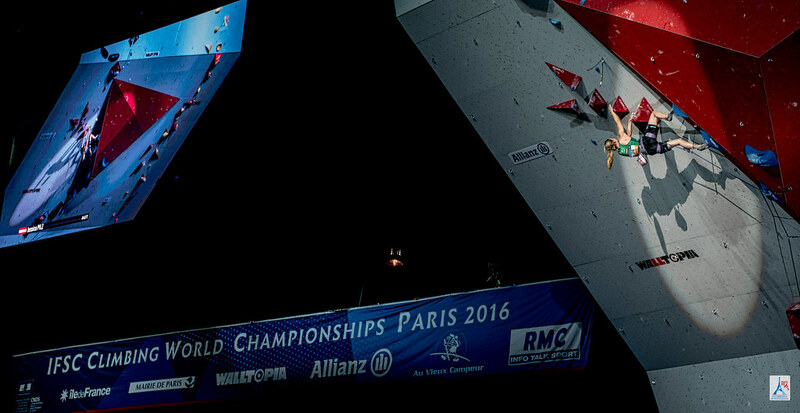 Romain Desgranges set a new high point on the top panel for the French crowd, and not long after his teammate, Gautier Supper, marched into the last crimp section for Bronze. 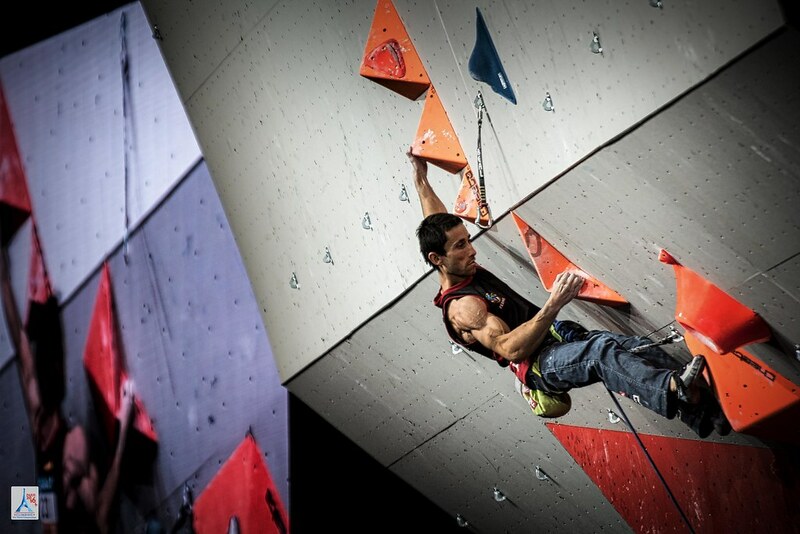 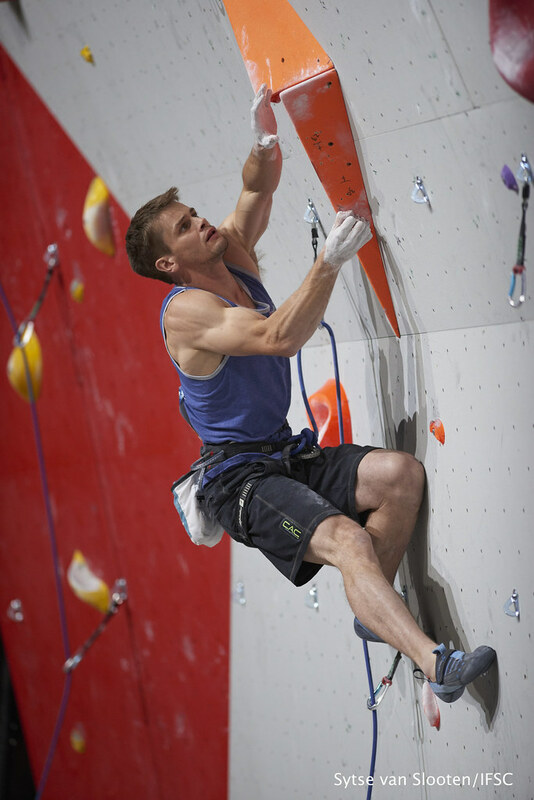 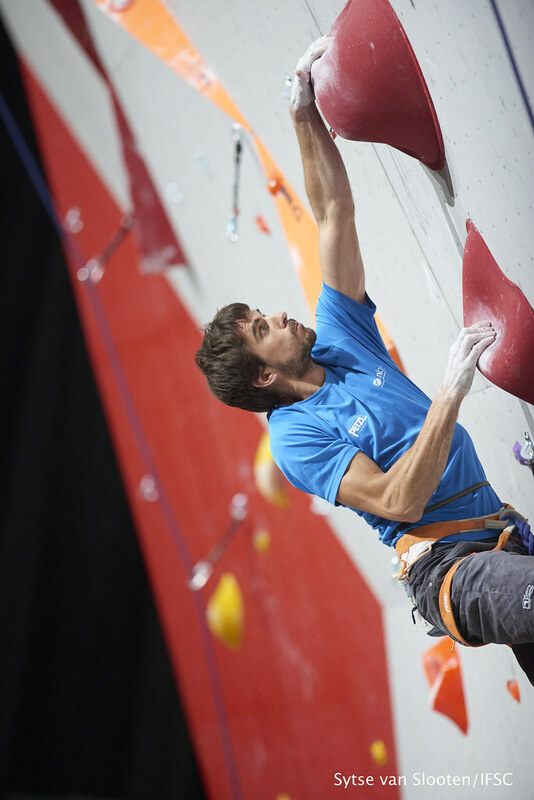 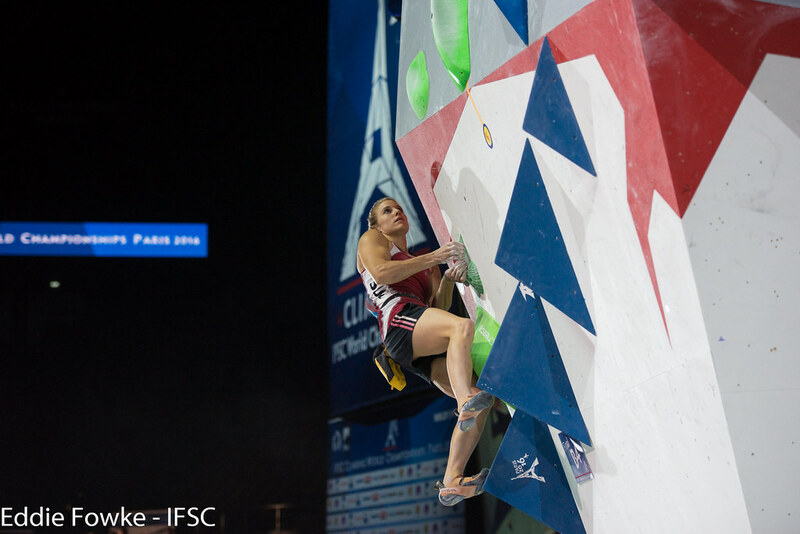 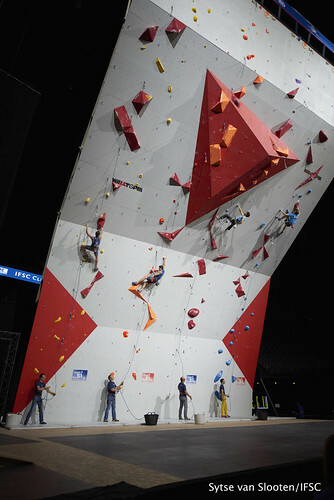 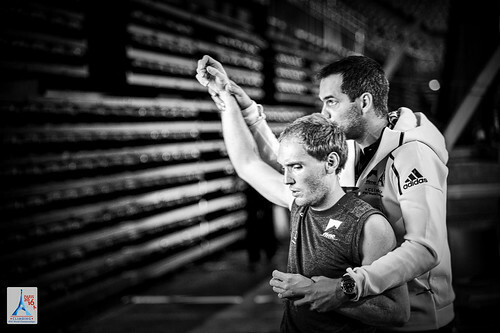 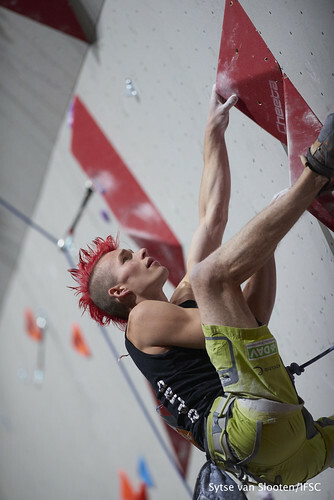 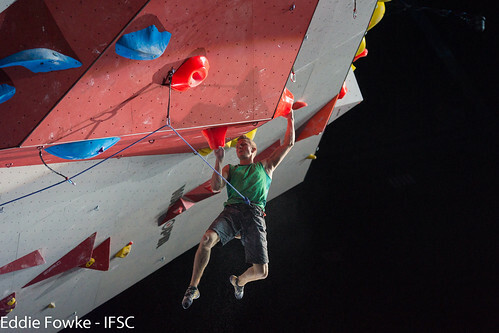 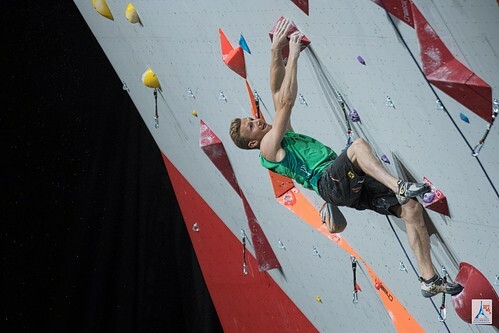 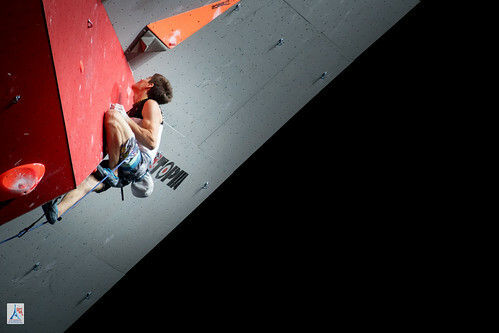 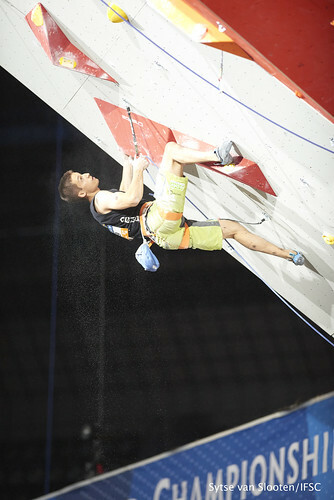 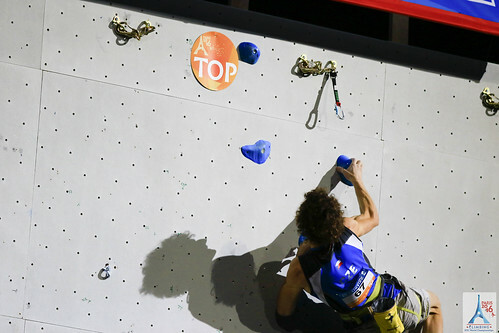 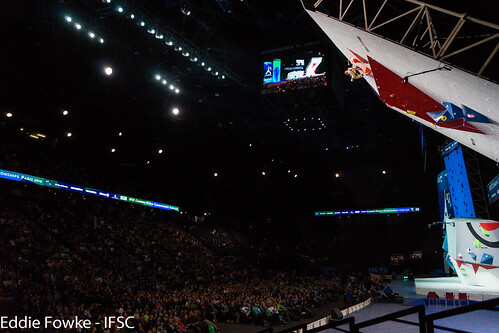 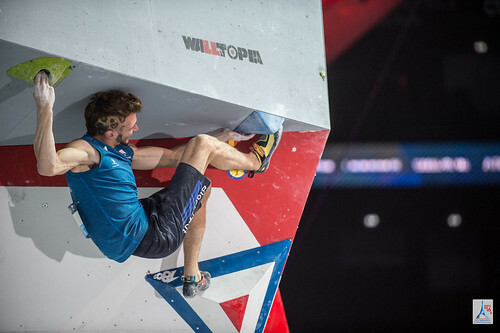 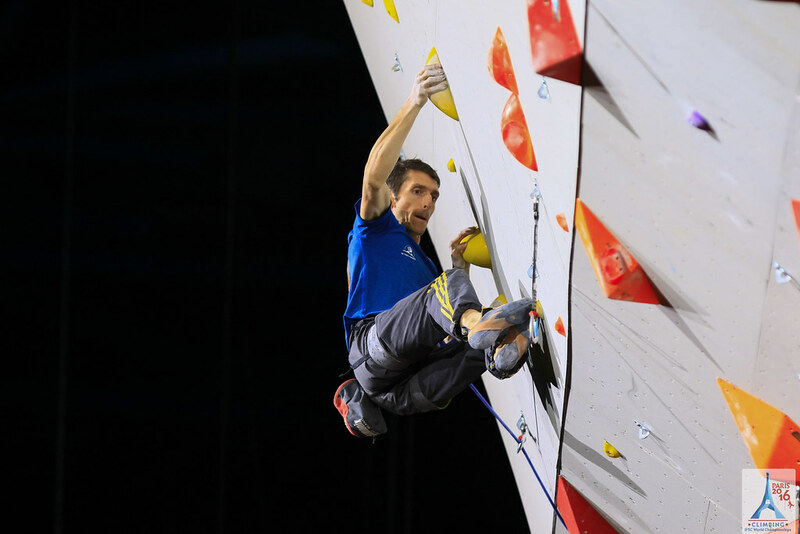 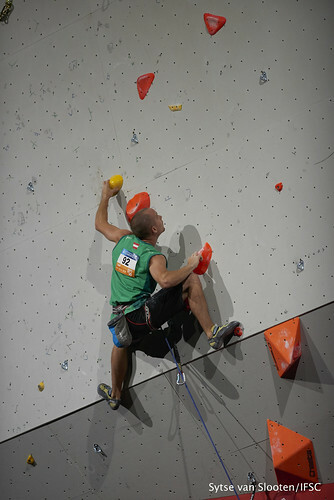 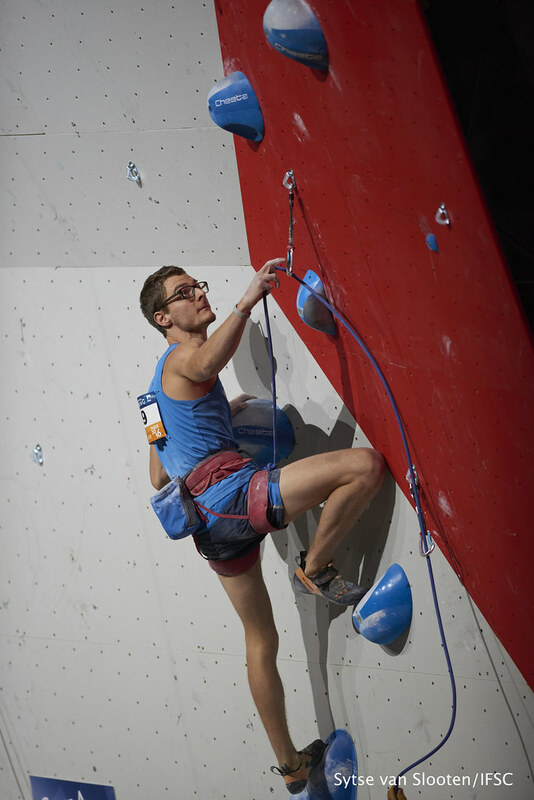 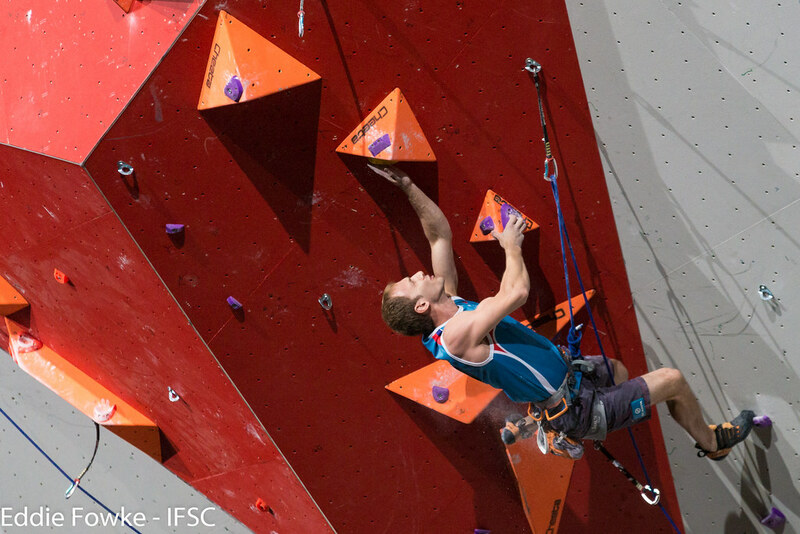 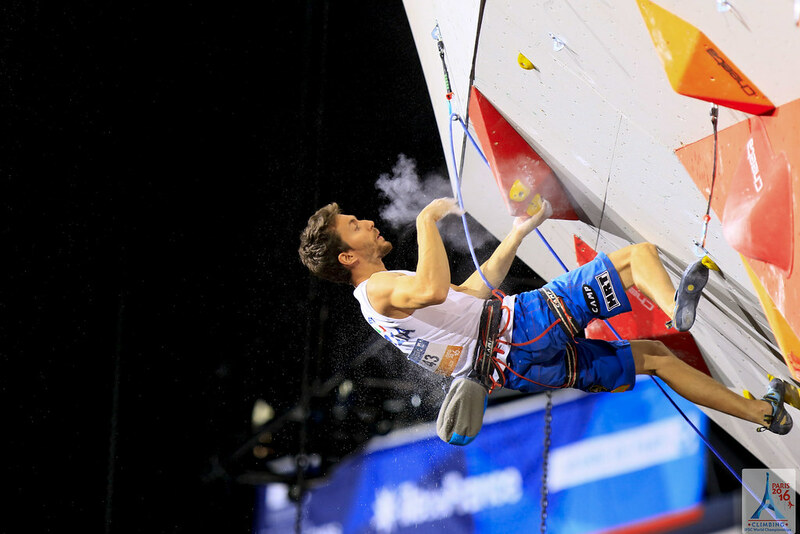 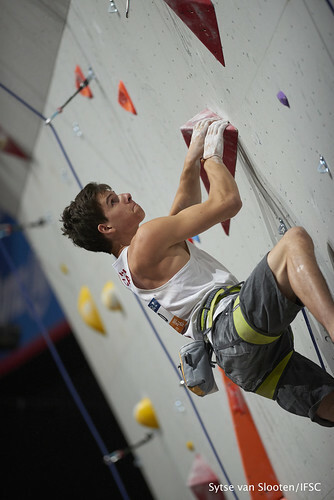 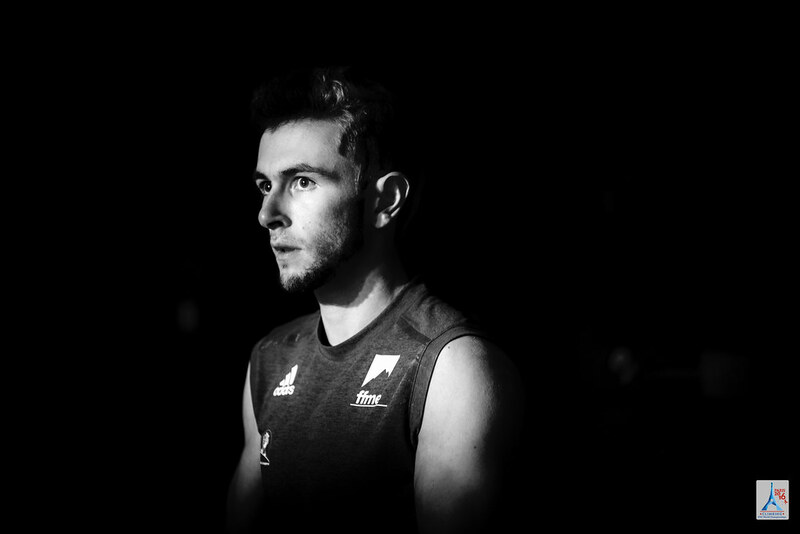 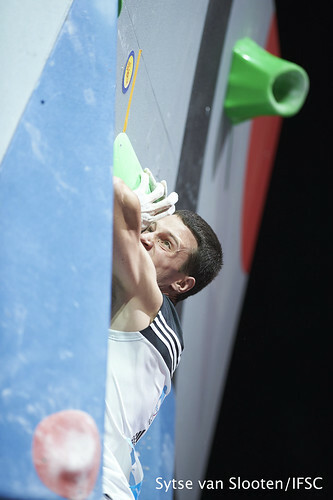 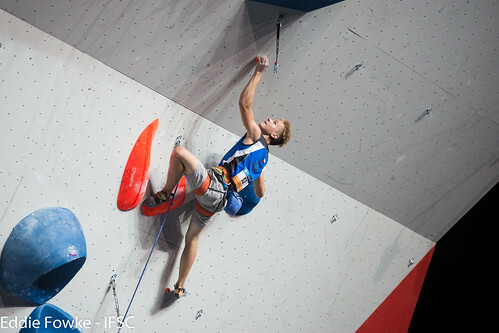 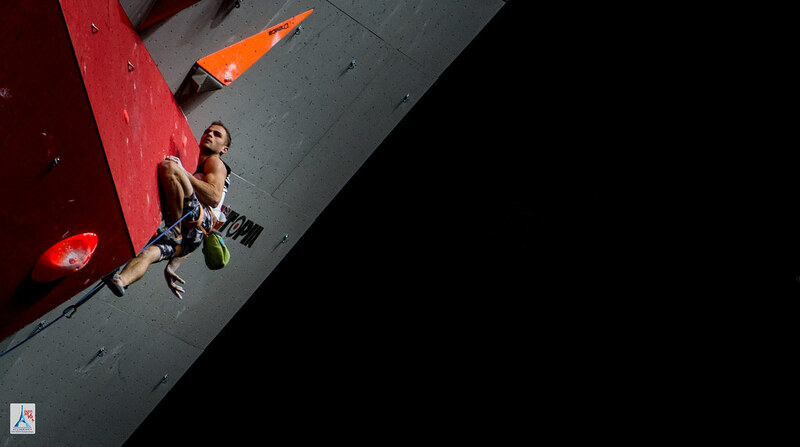 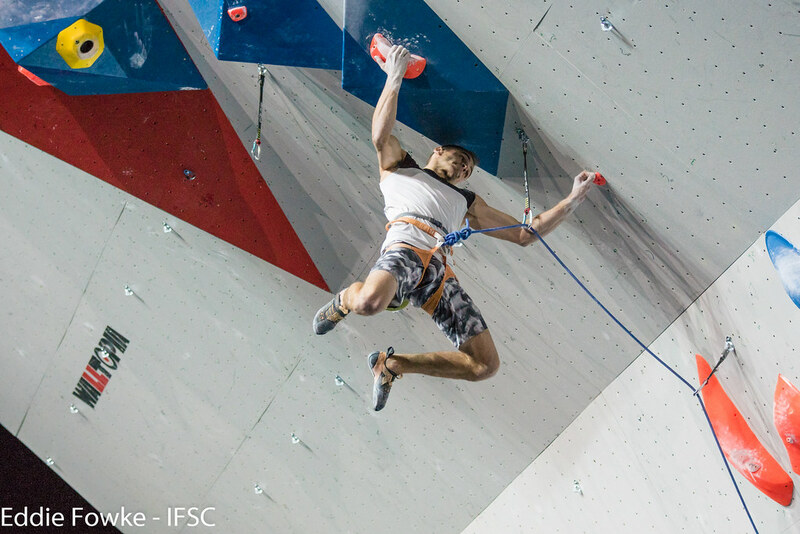 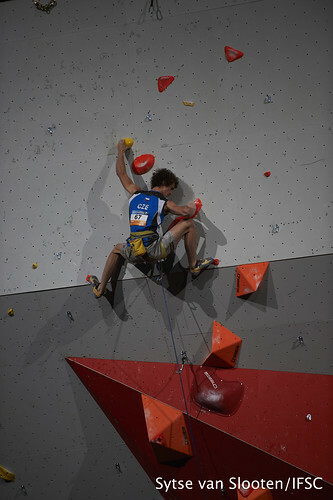 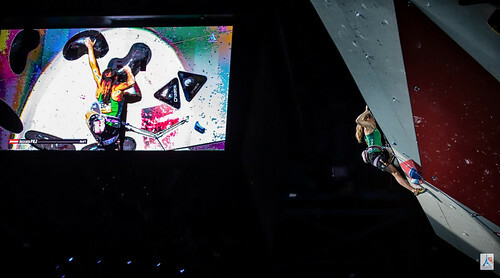 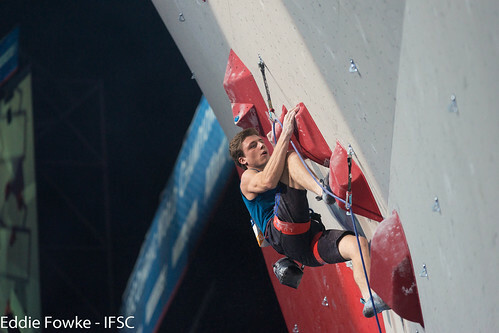 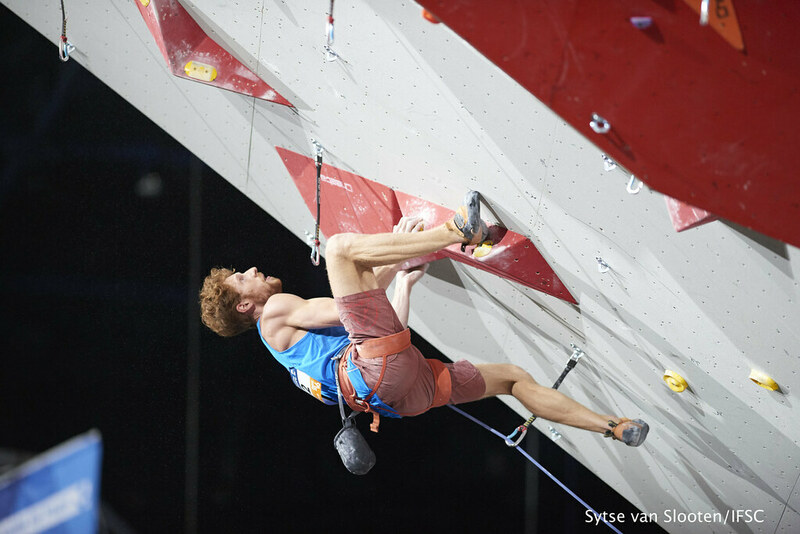 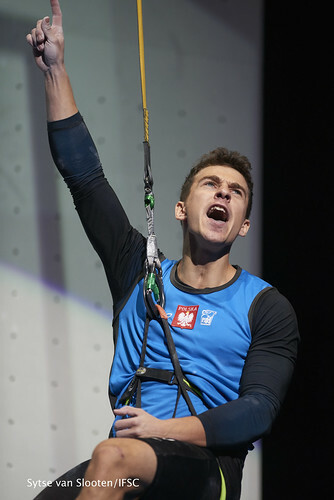 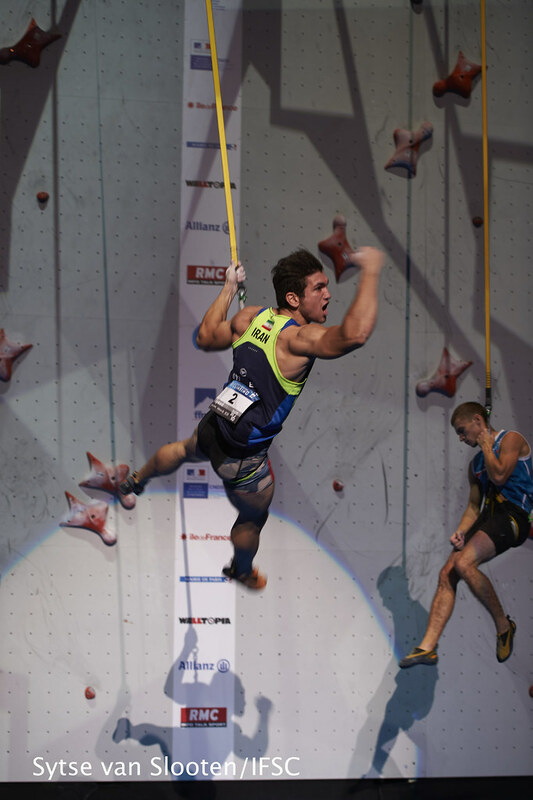 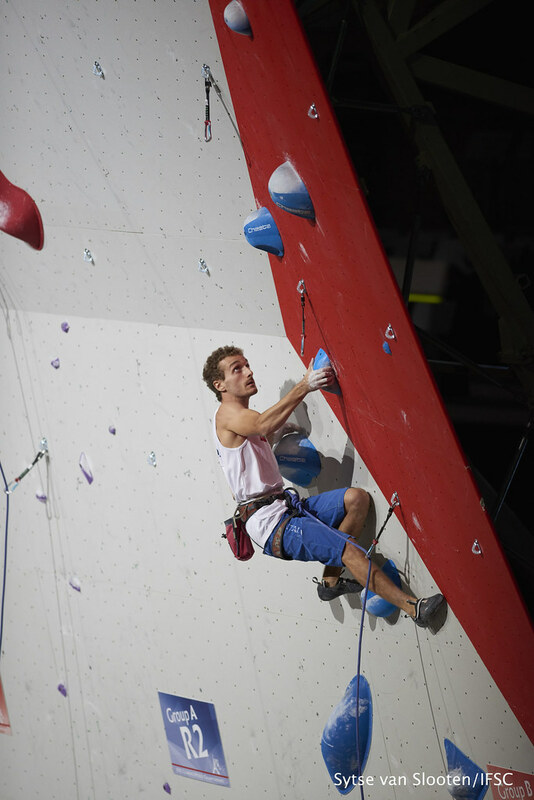 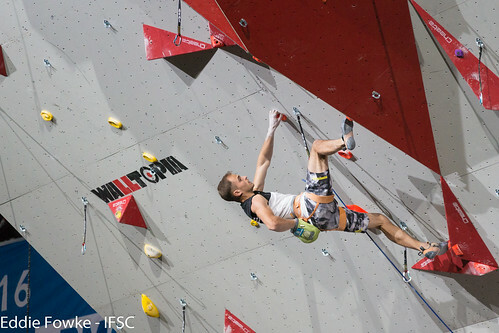 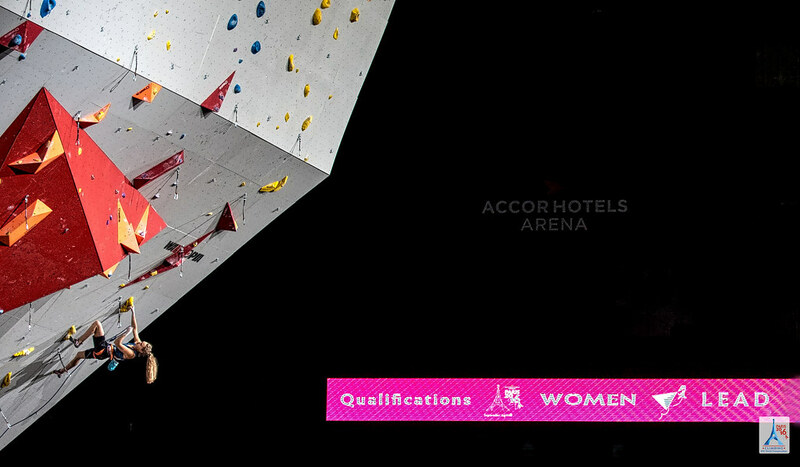 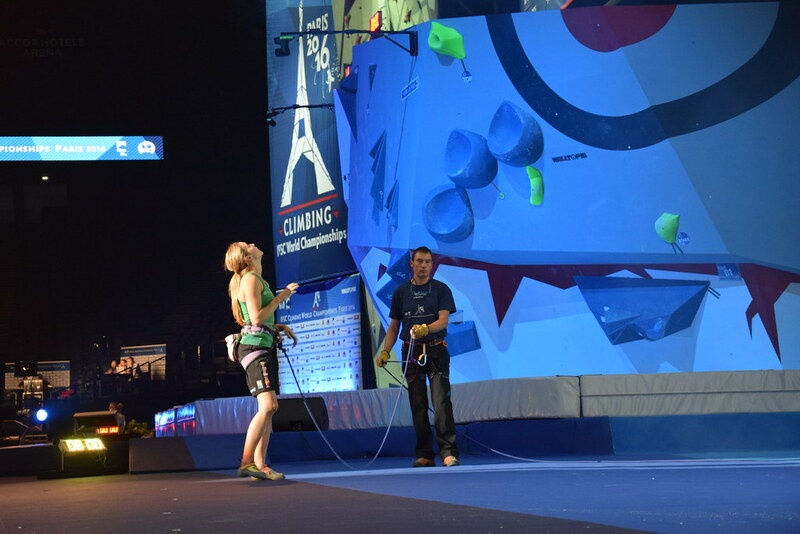 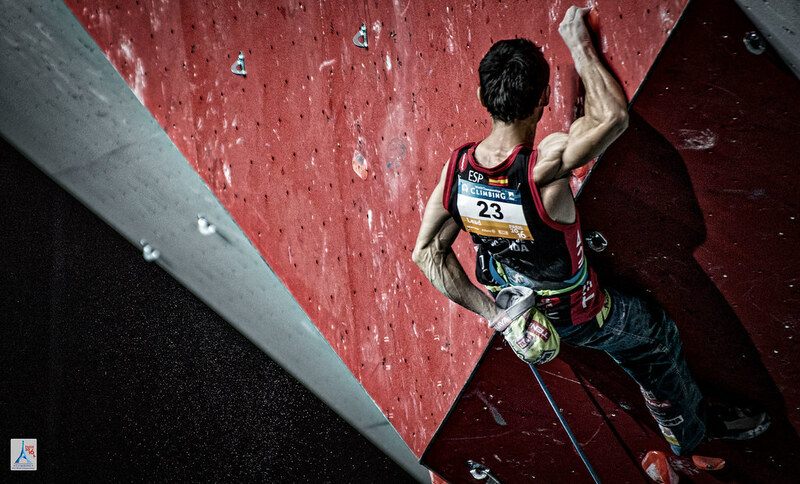 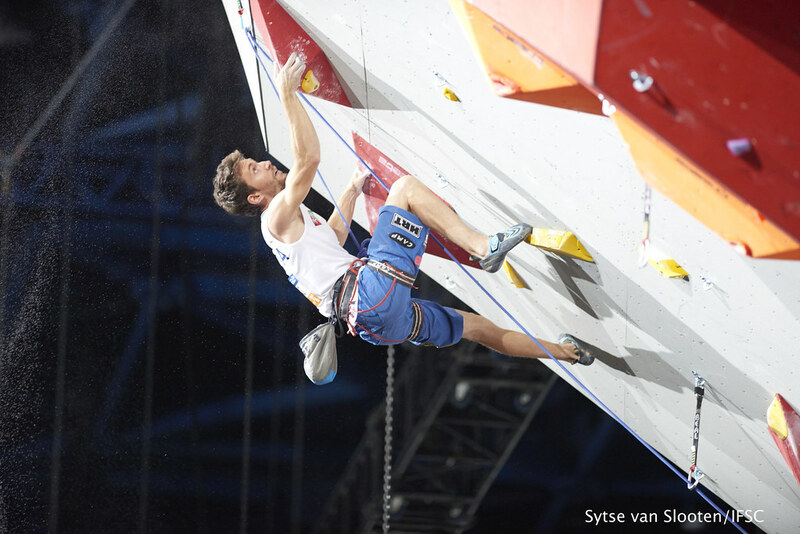 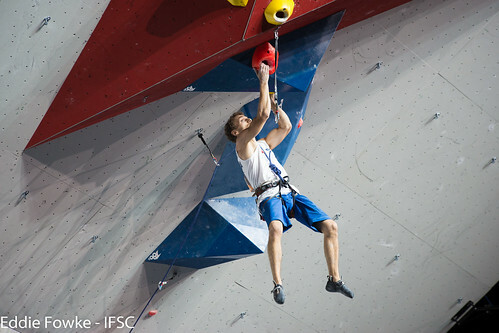 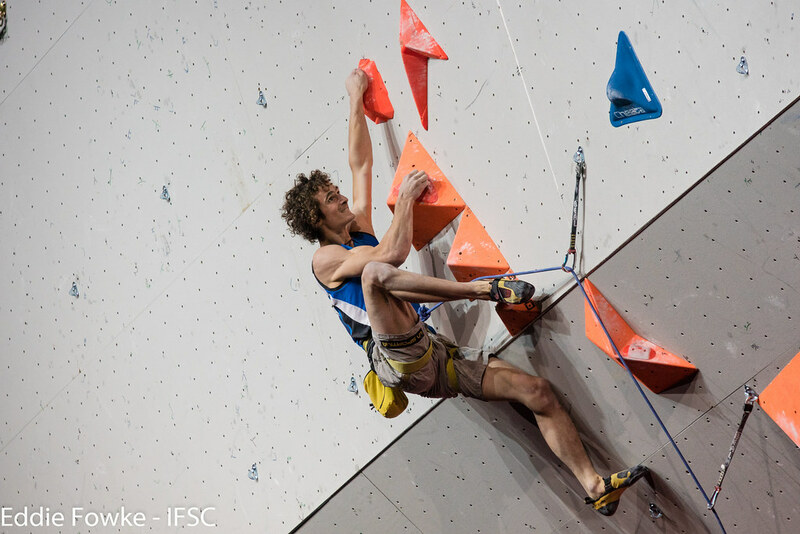 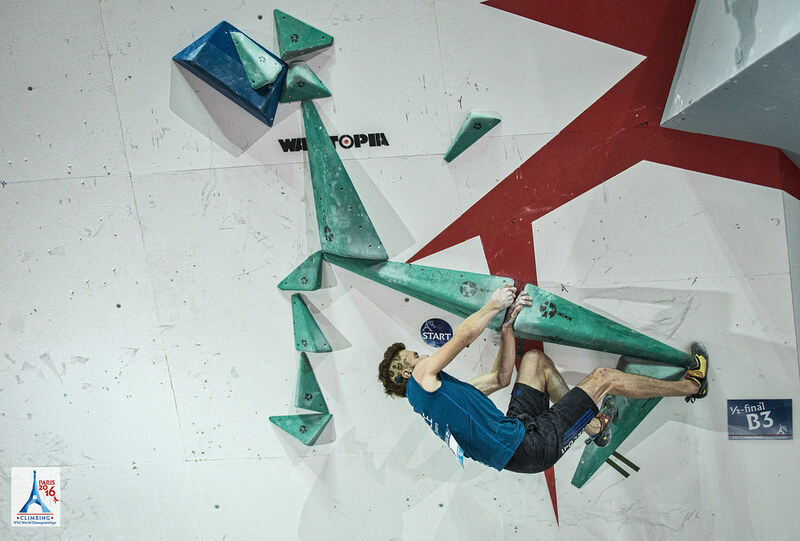 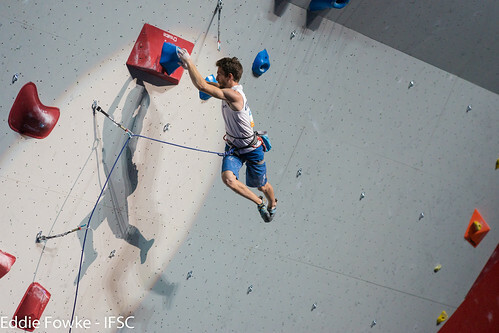 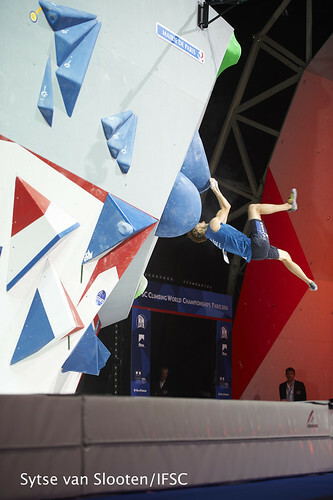 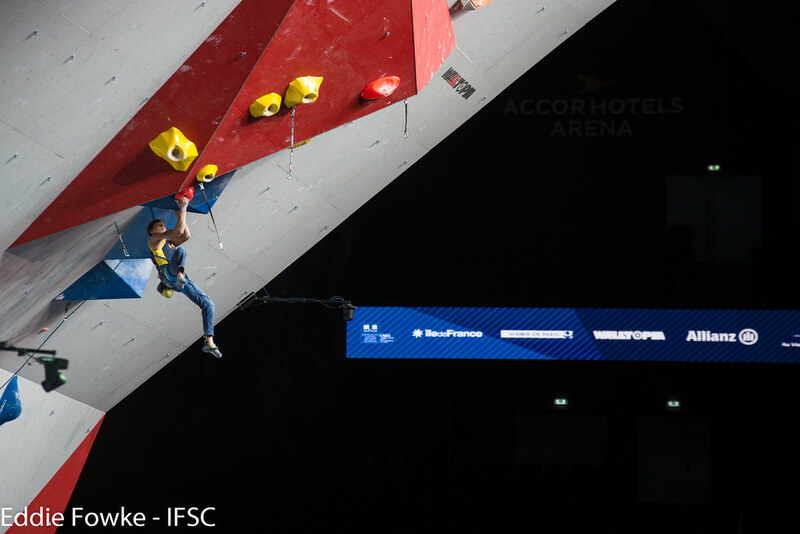 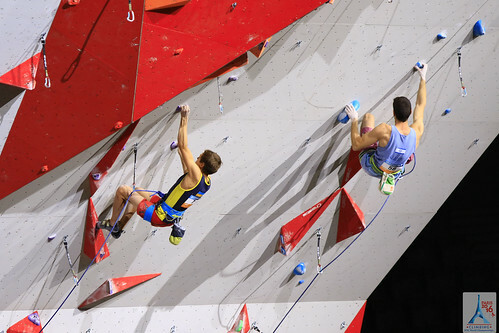 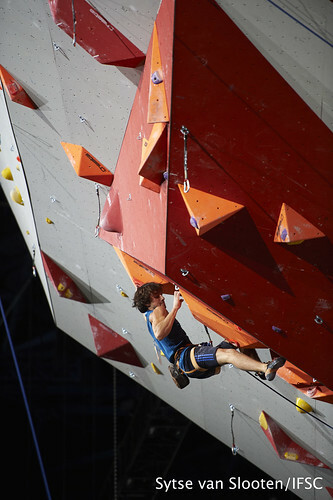 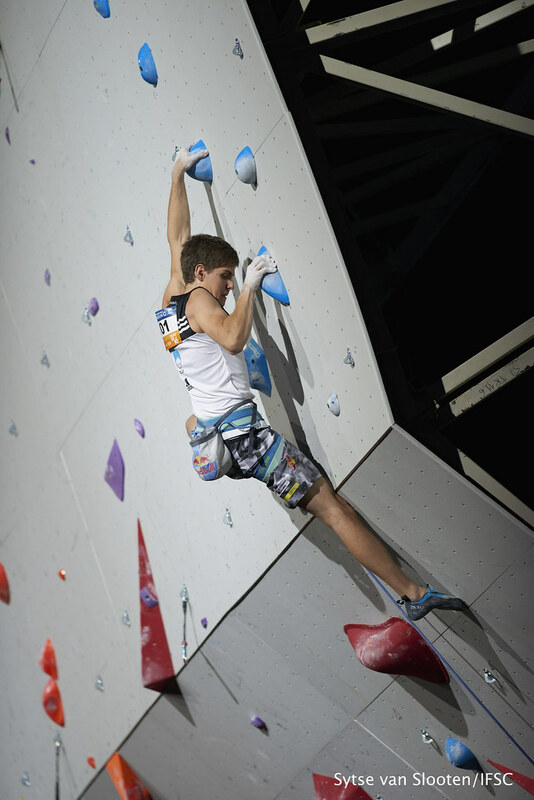 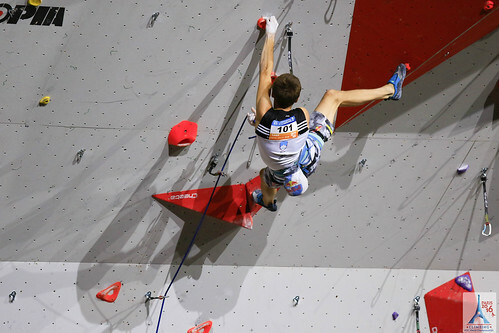 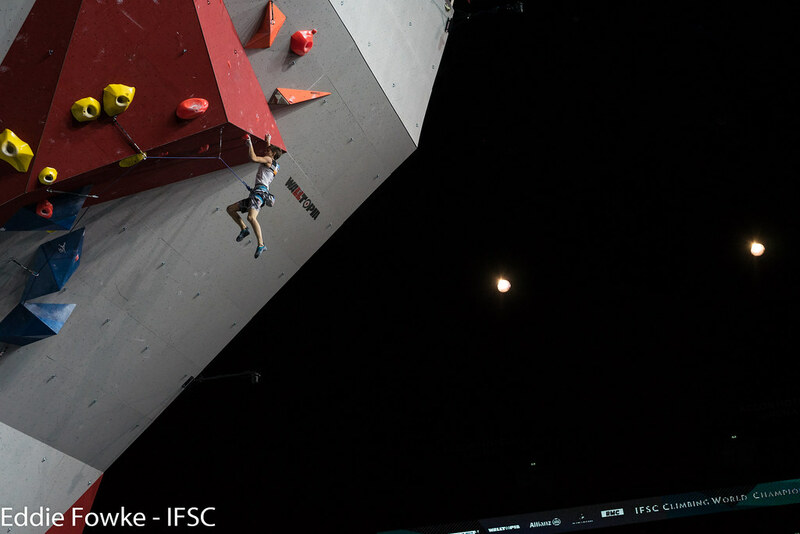 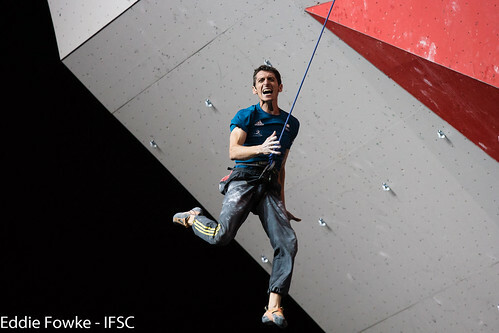 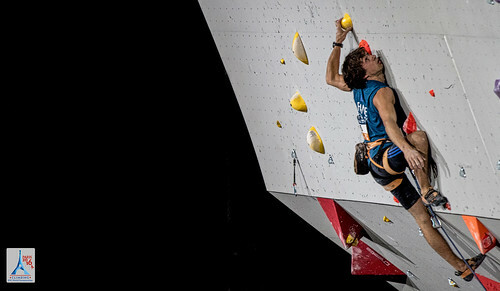 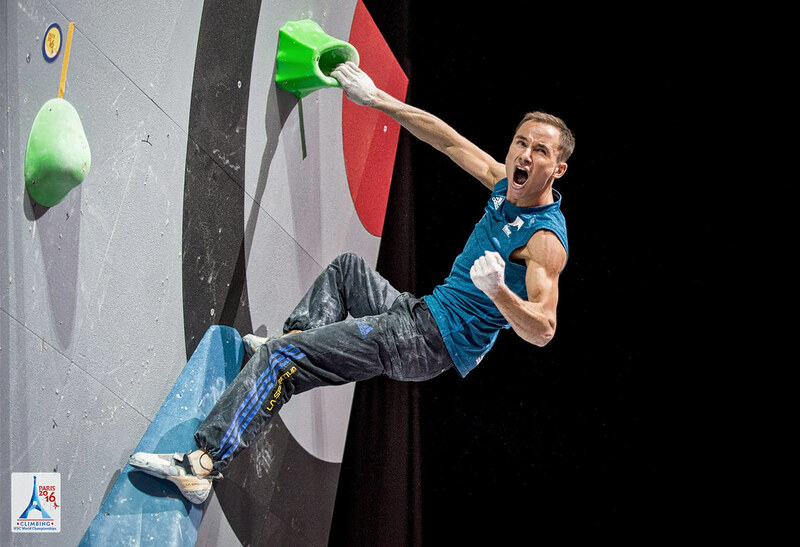 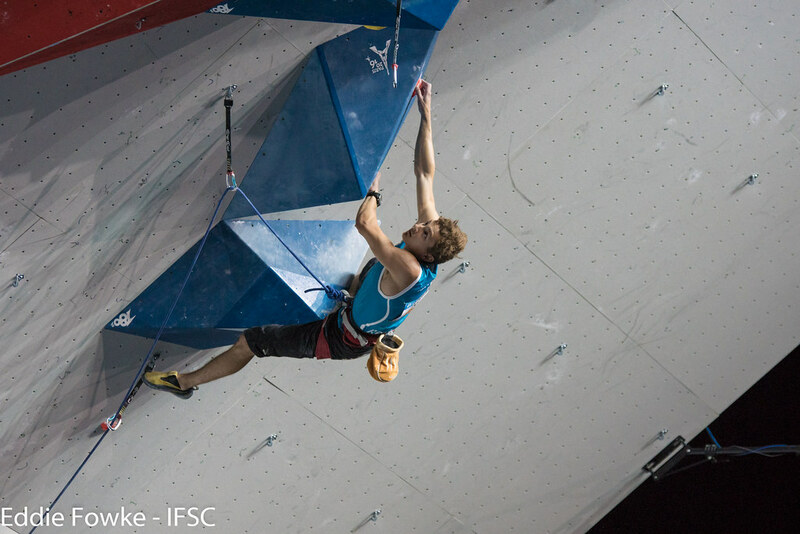 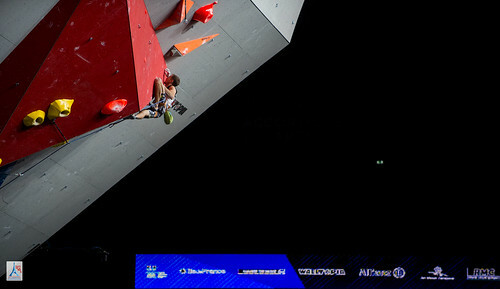 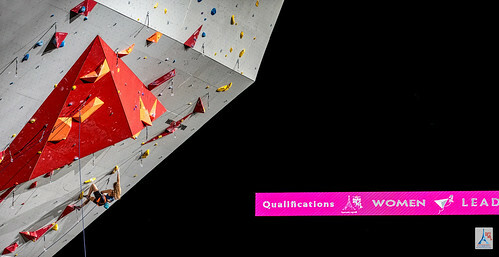 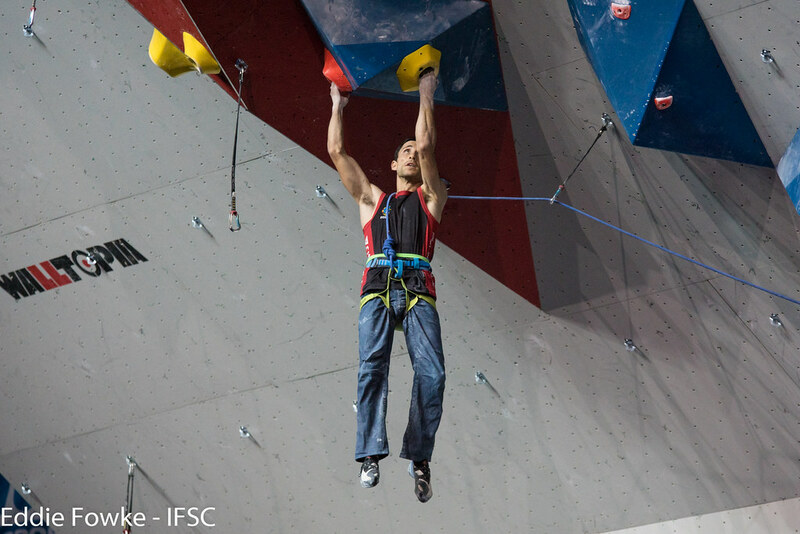 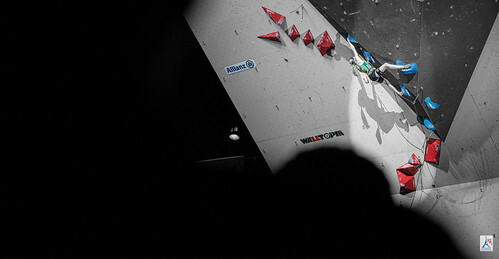 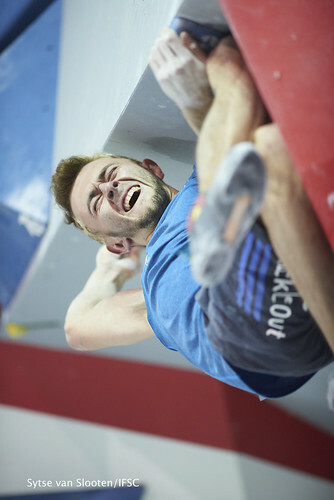 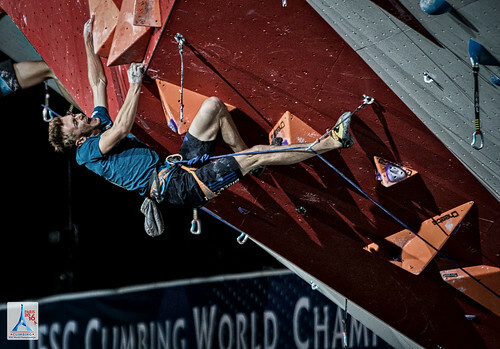 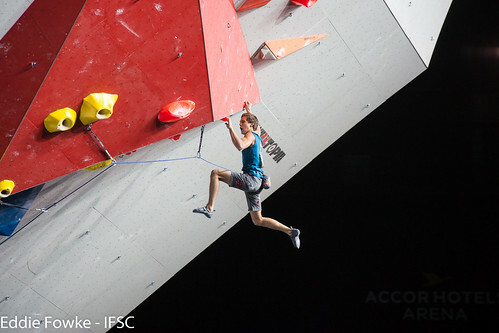 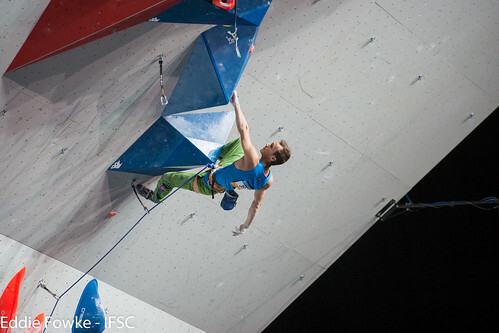 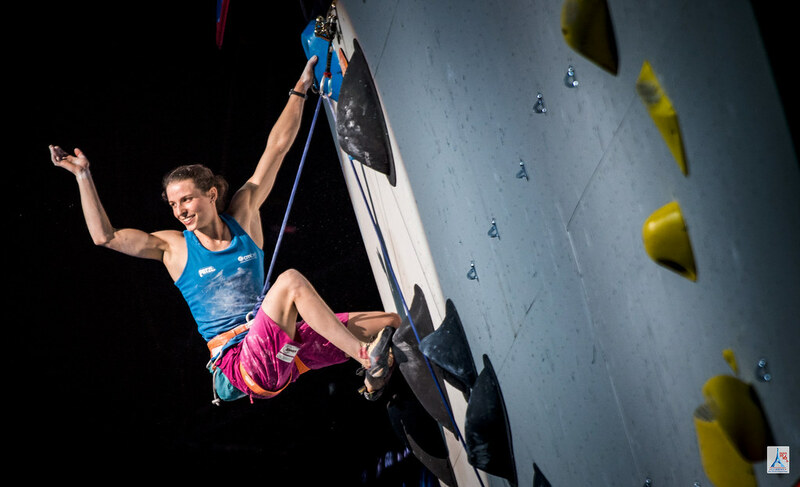 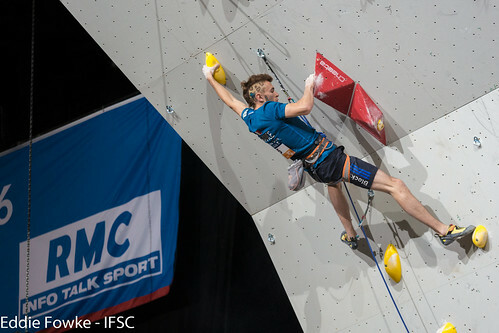 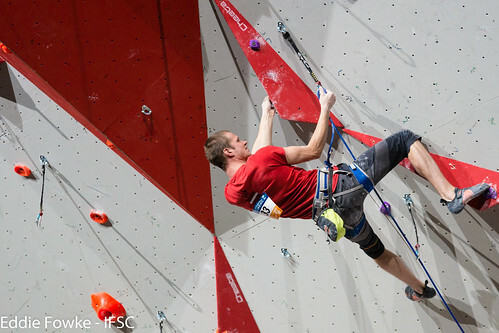 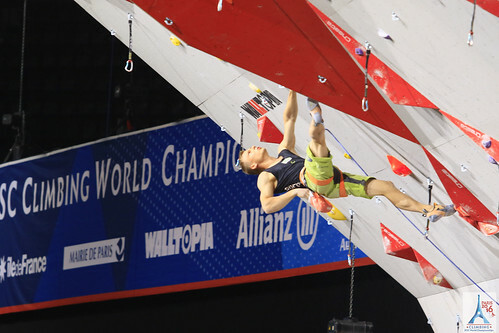 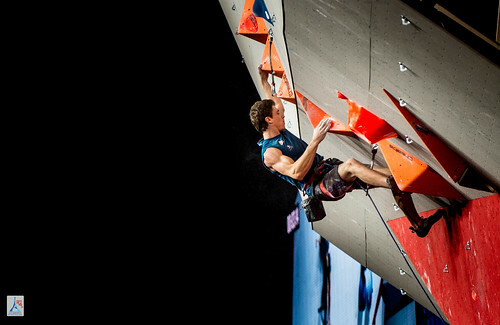 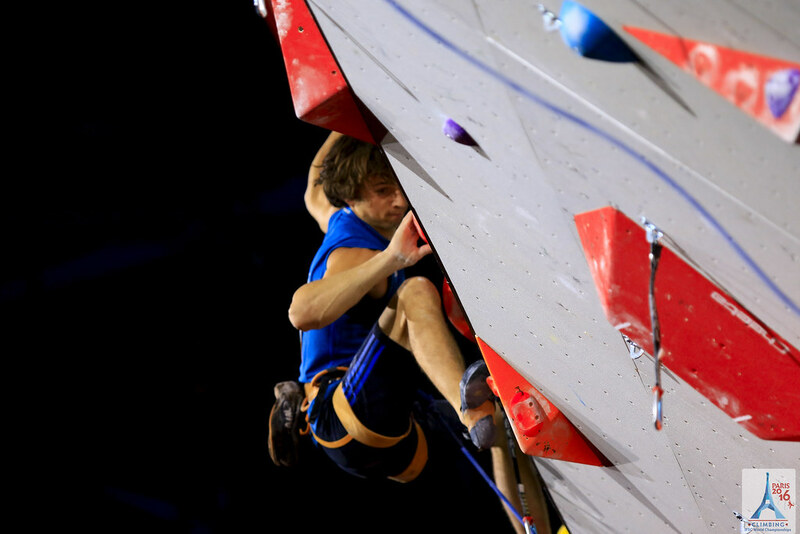 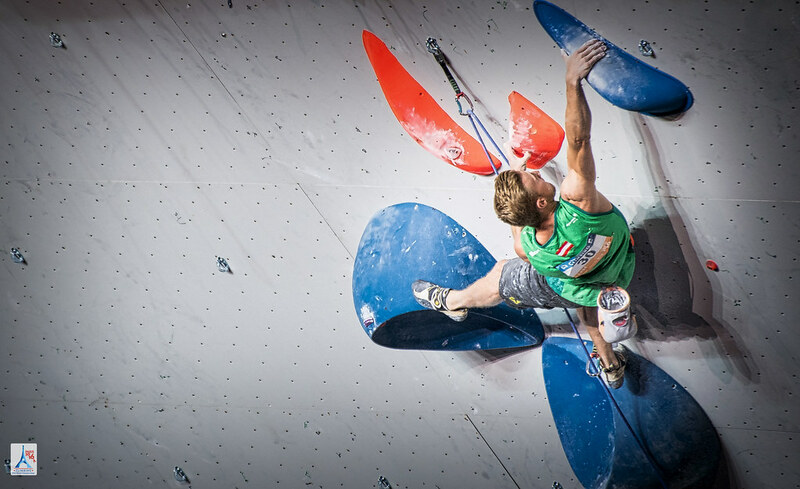 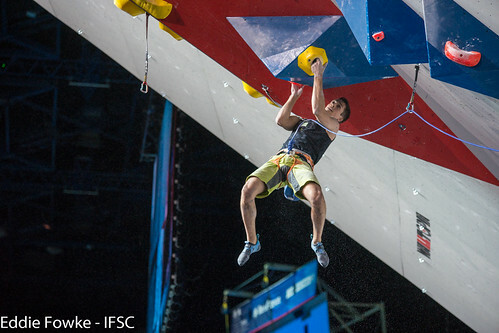 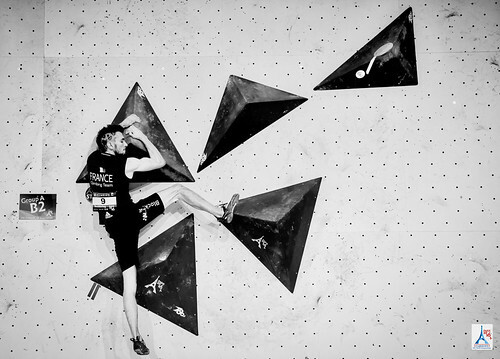 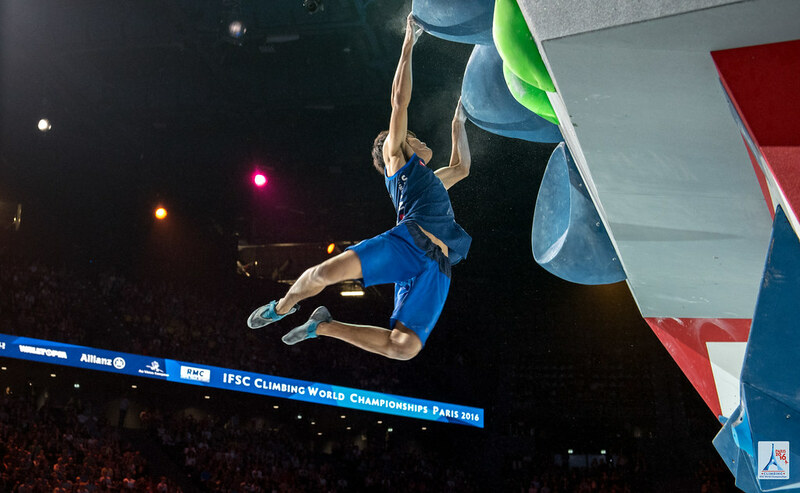 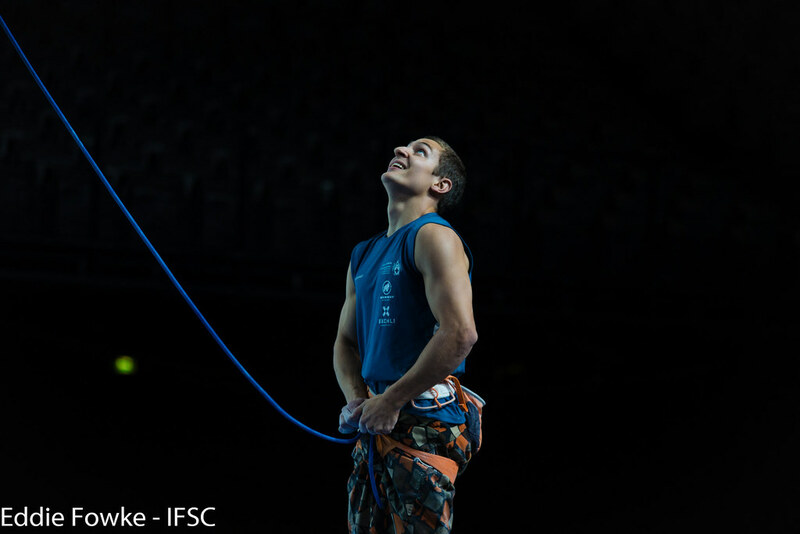 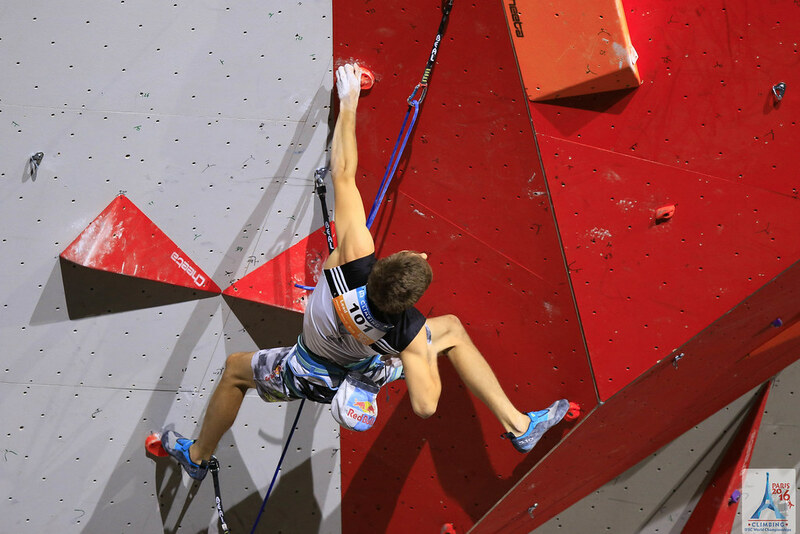 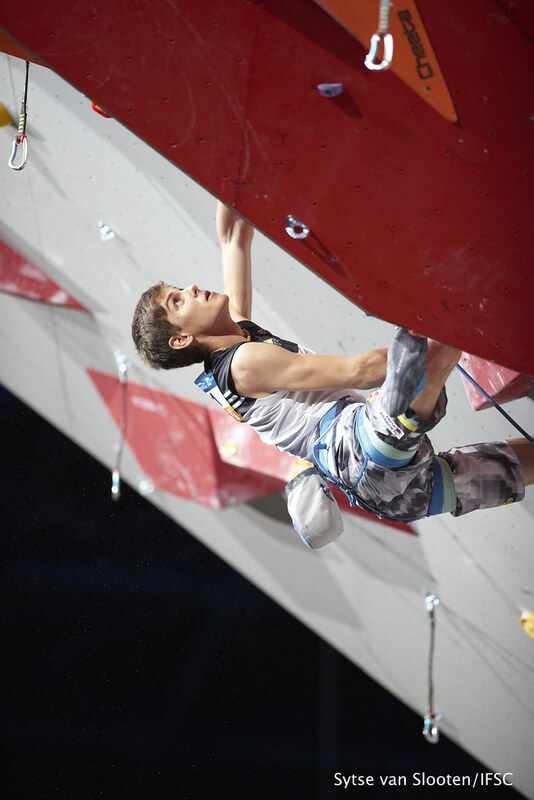 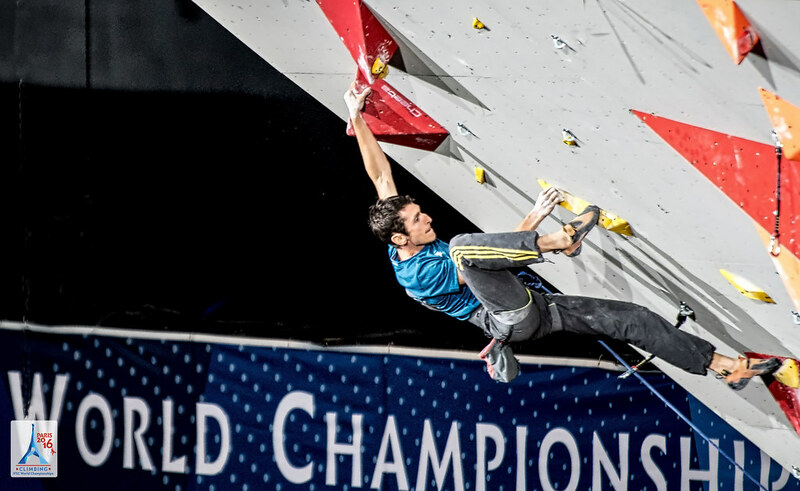 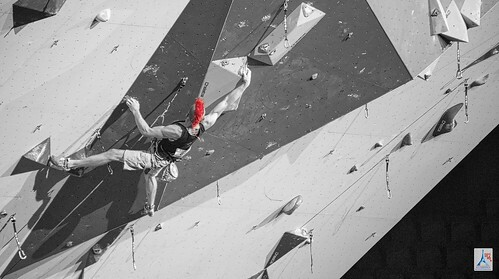 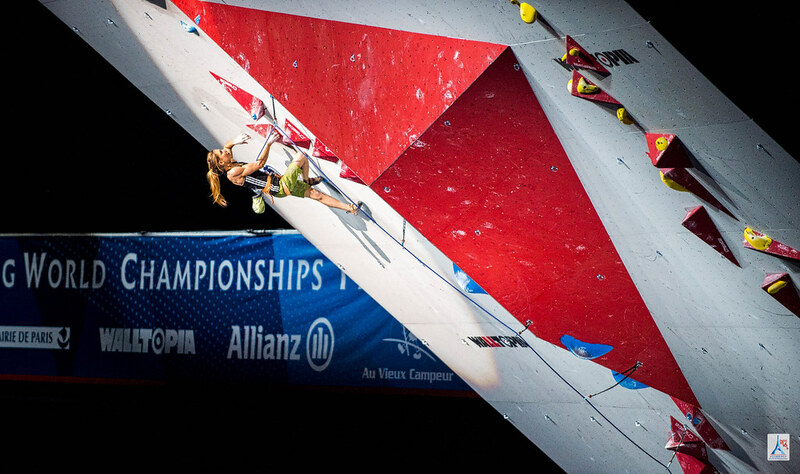 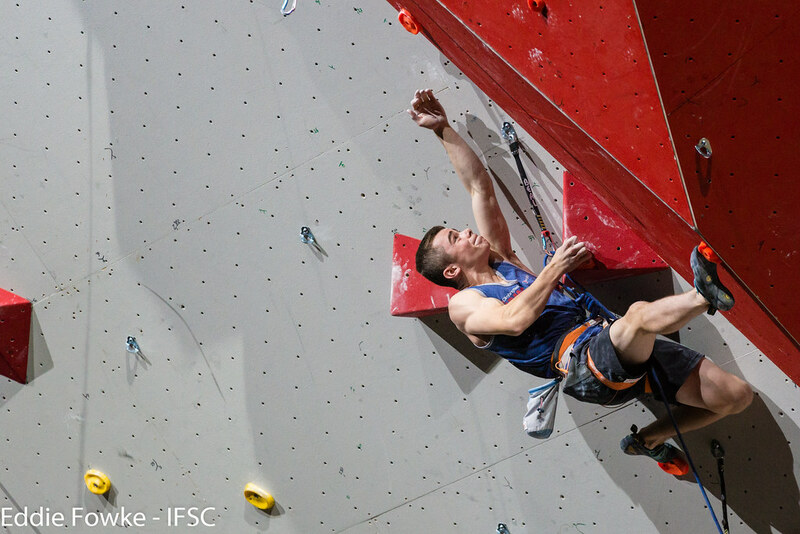 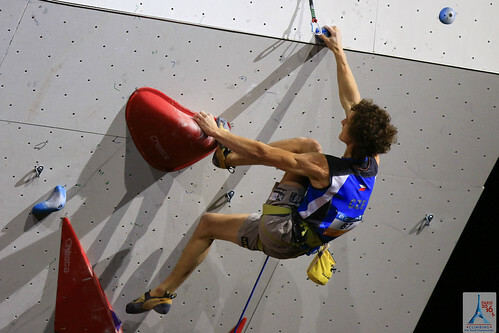 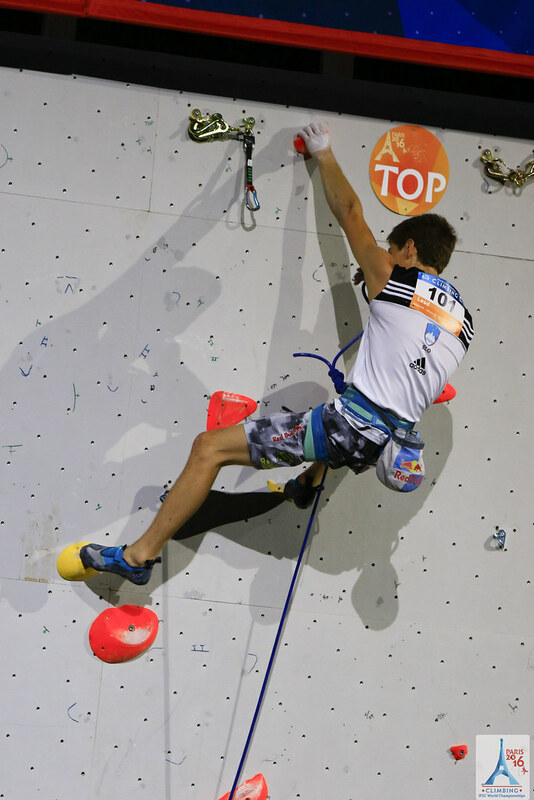 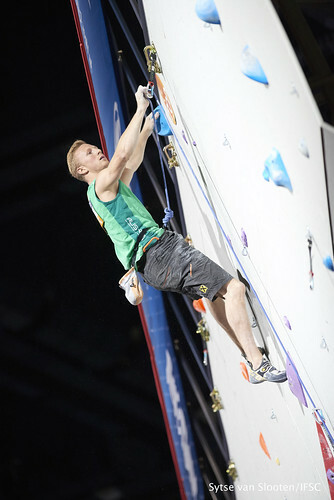 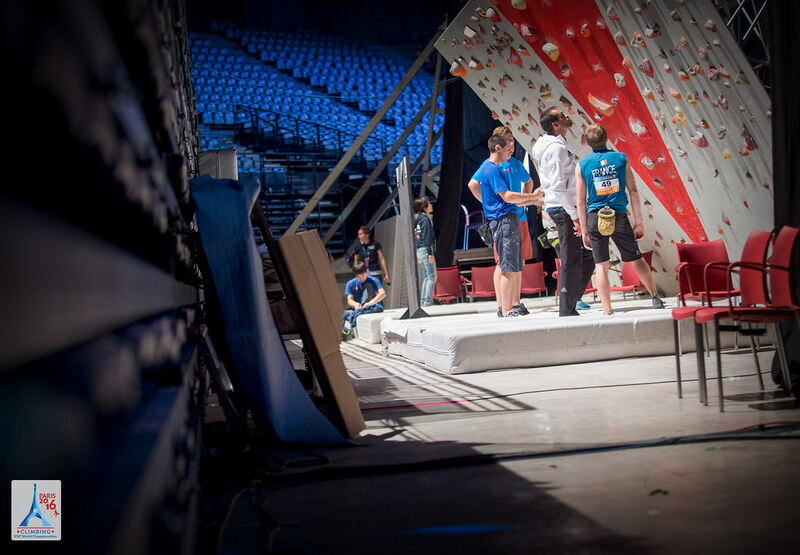 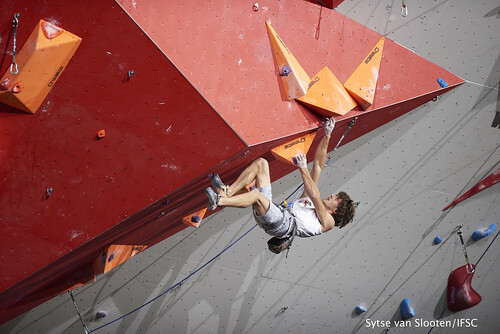 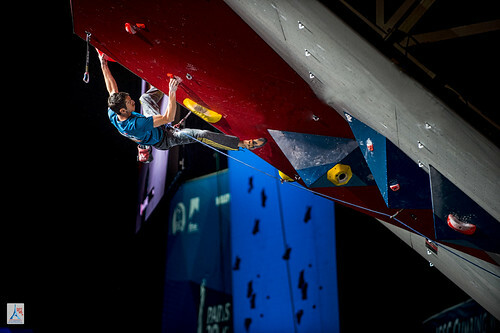 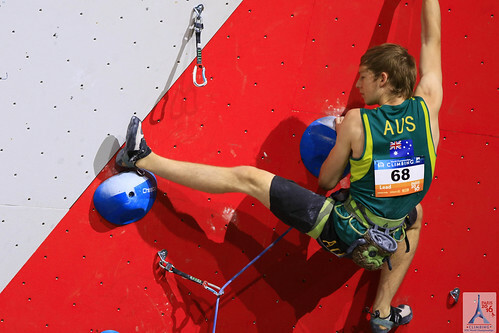 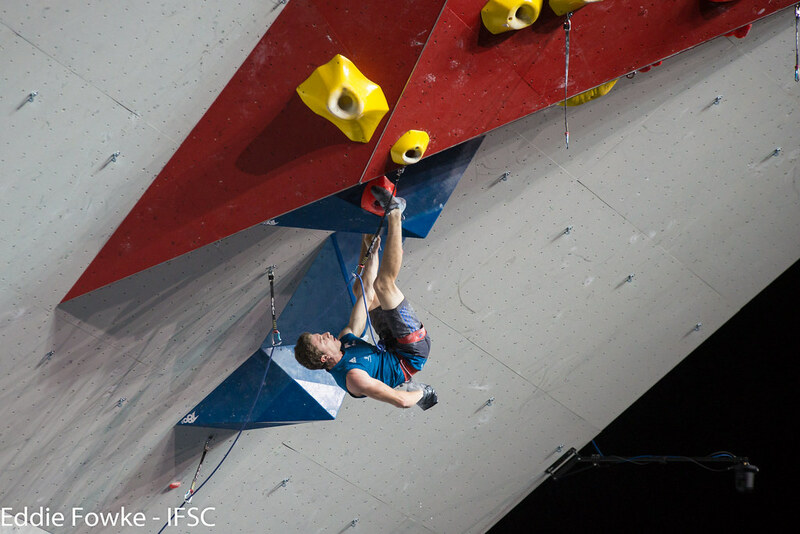 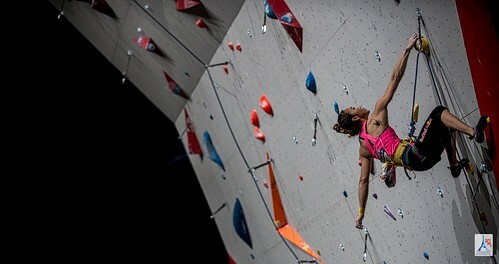 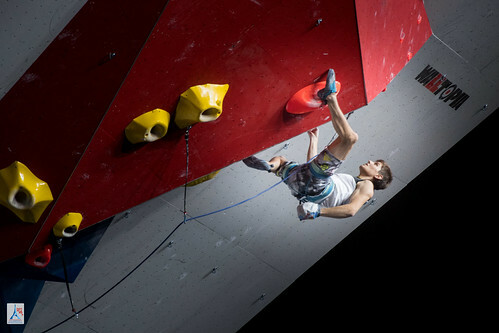 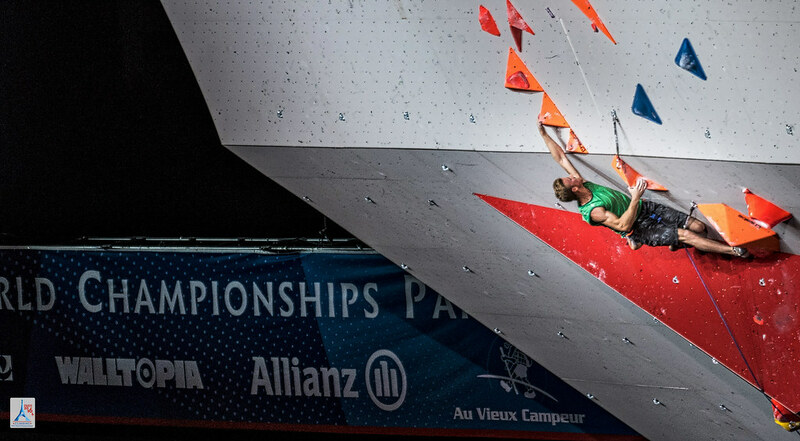 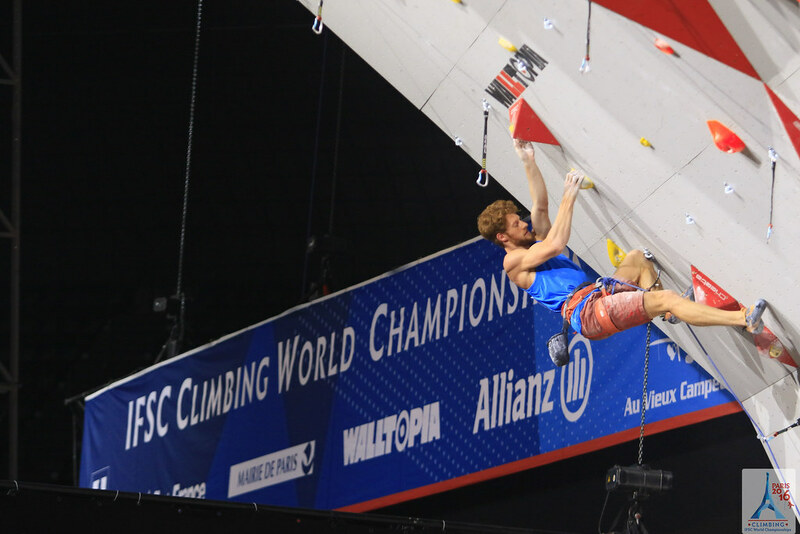 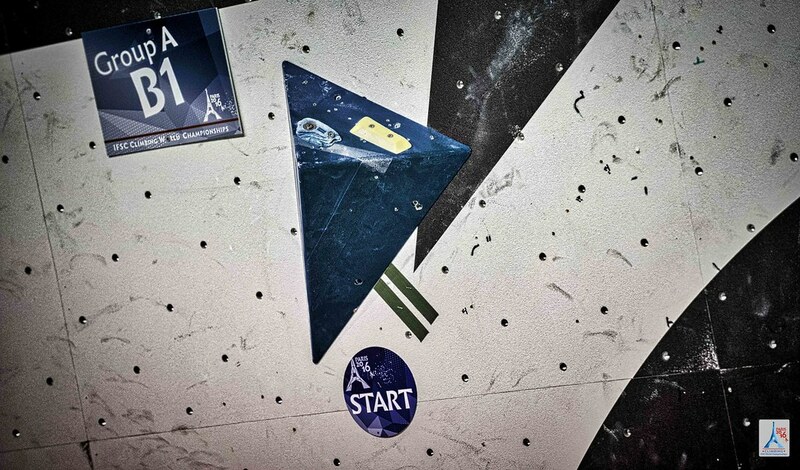 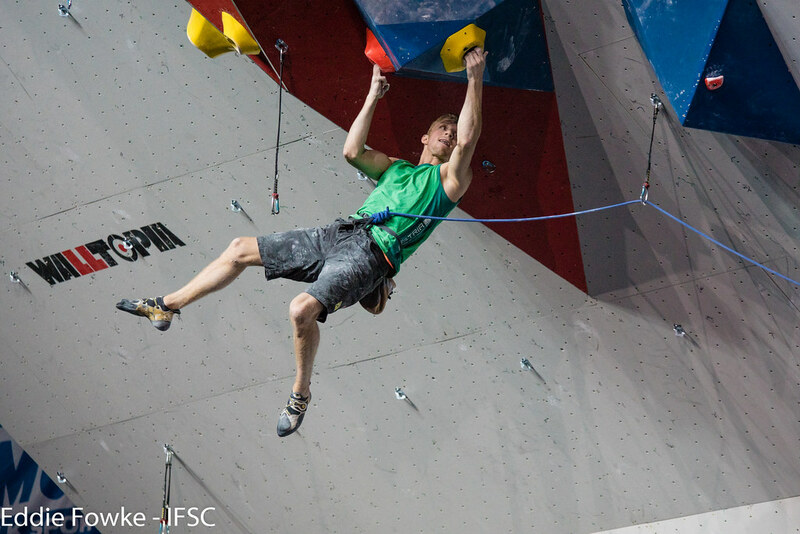 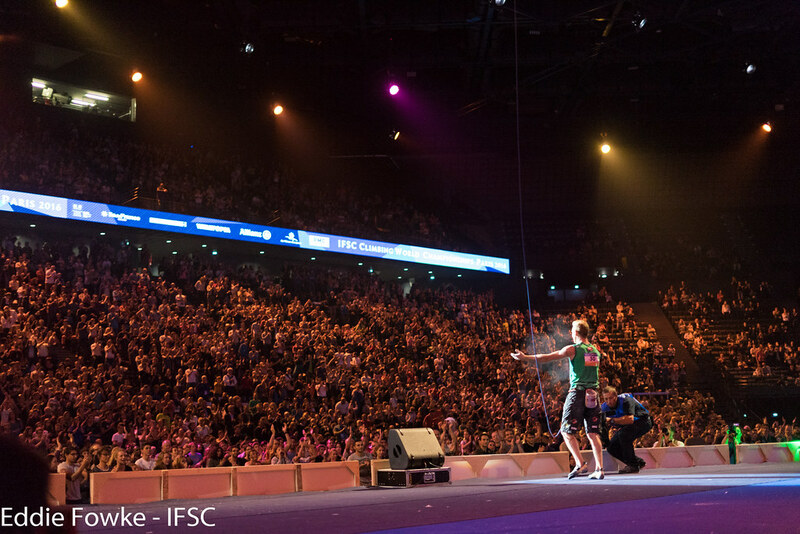 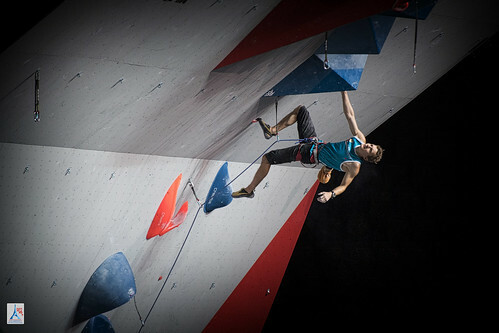 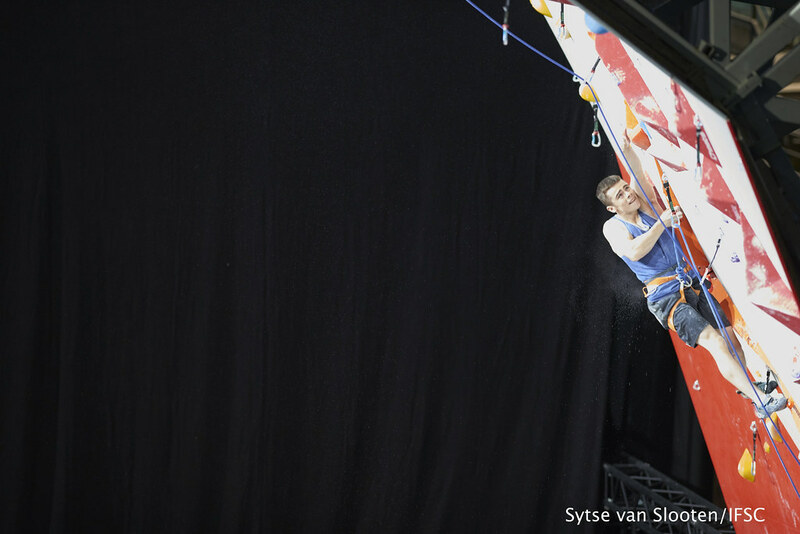 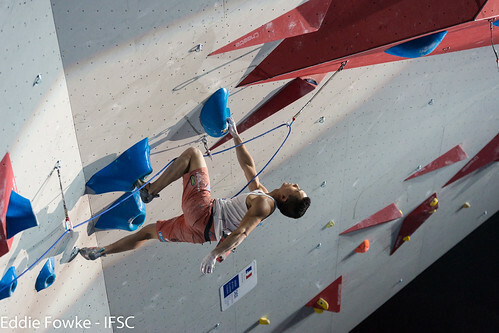 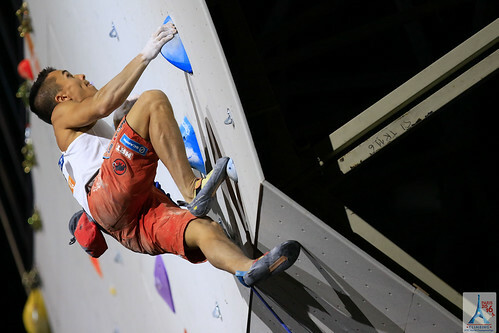 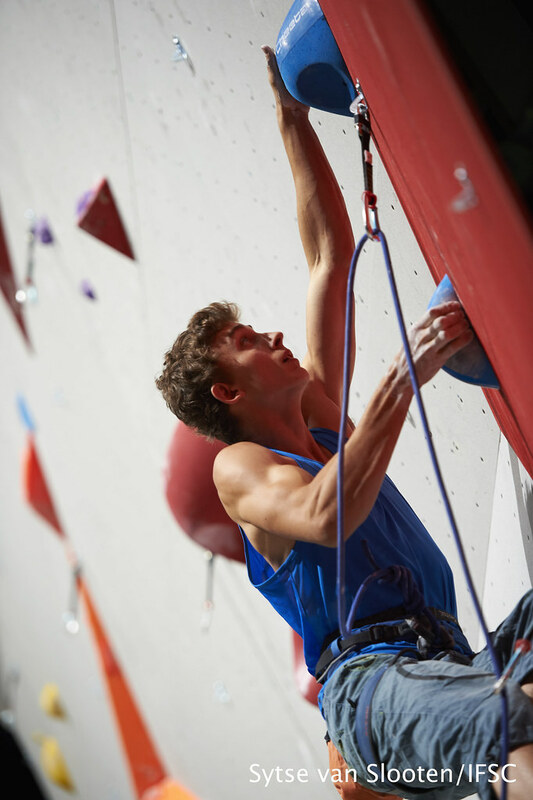 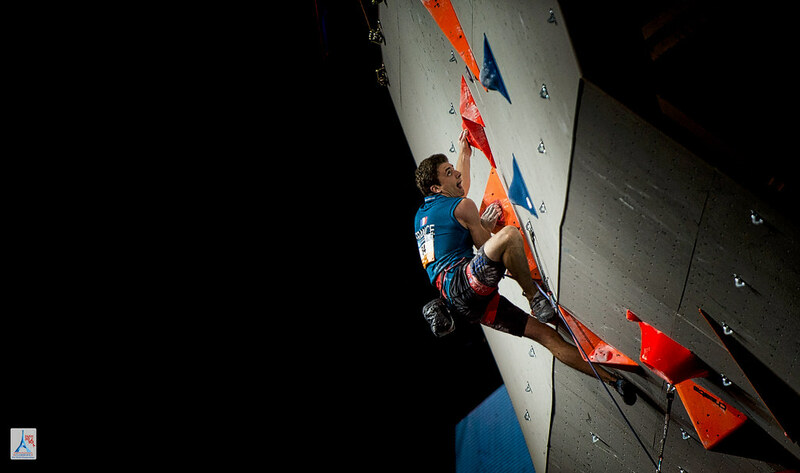 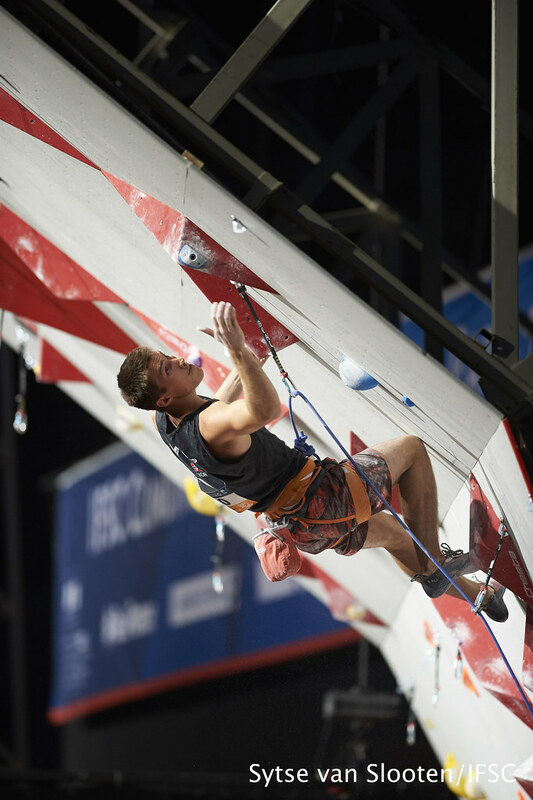 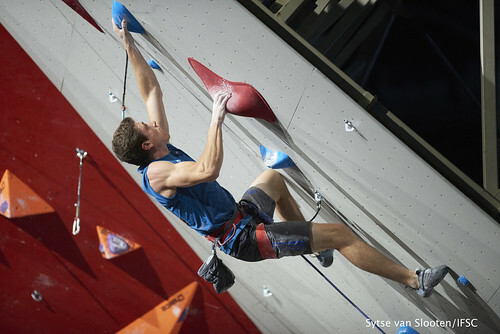 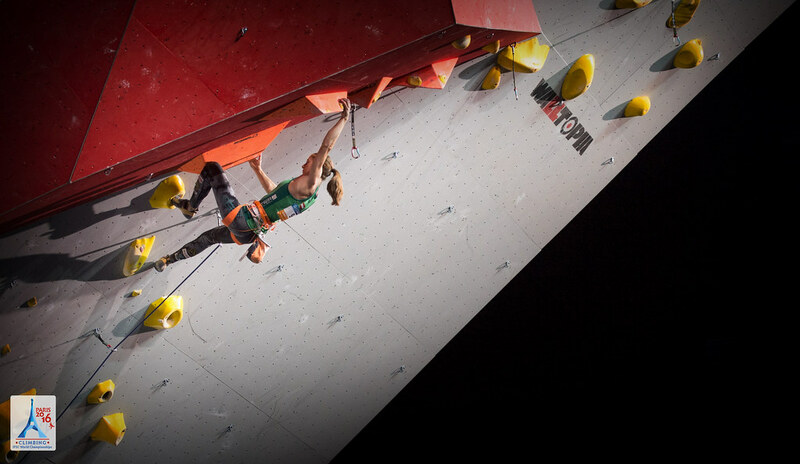 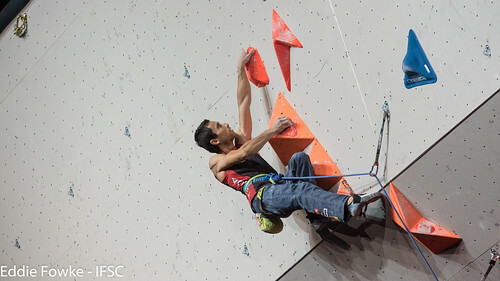 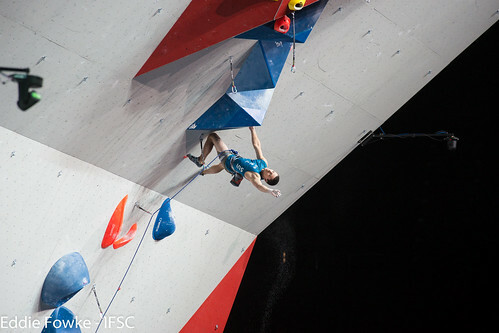 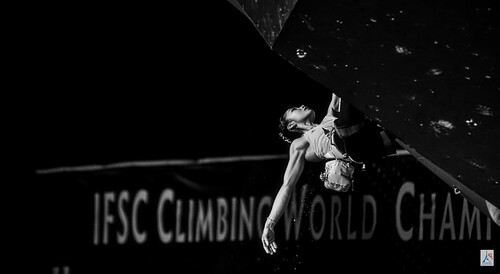 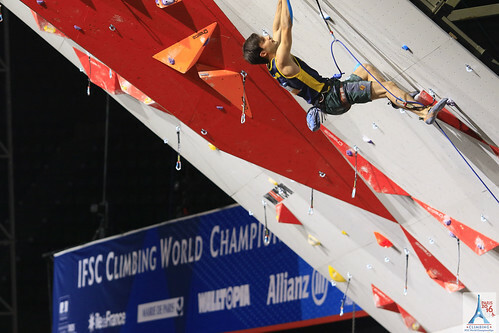 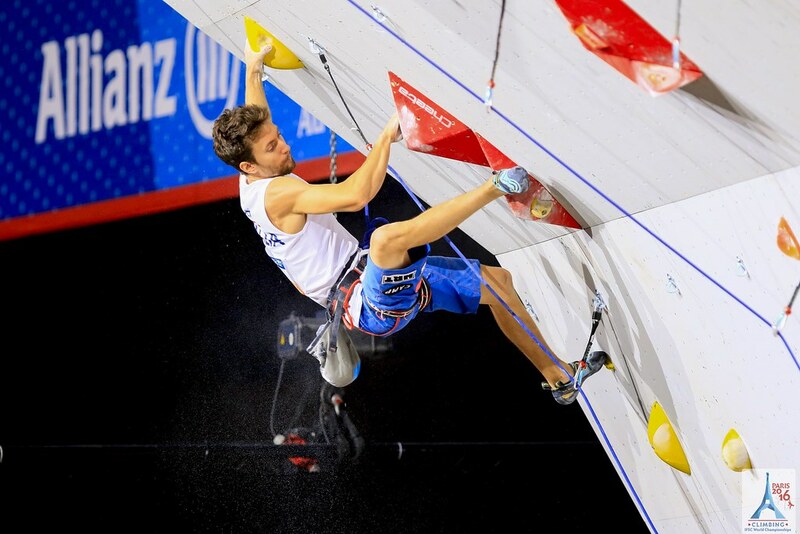 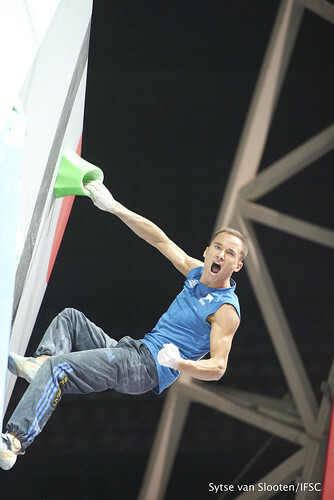 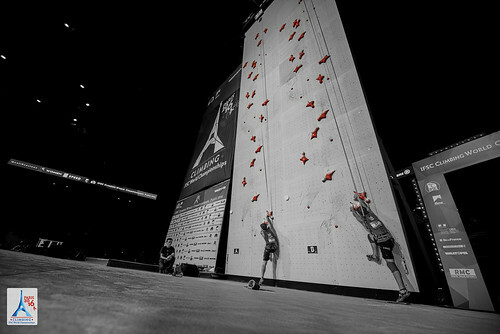 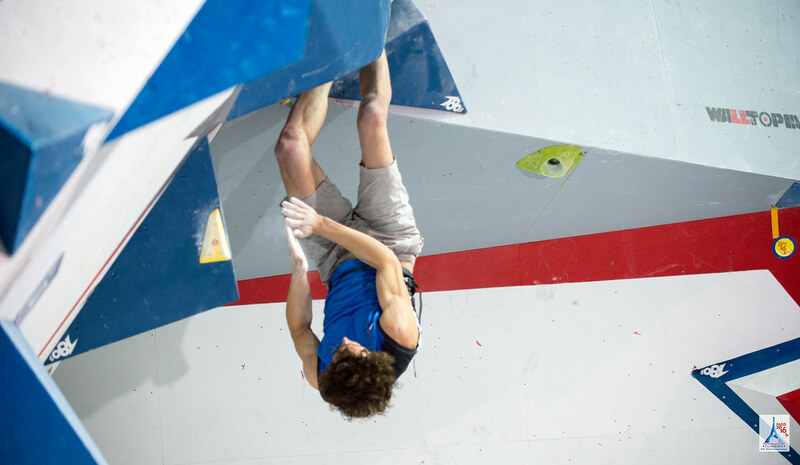 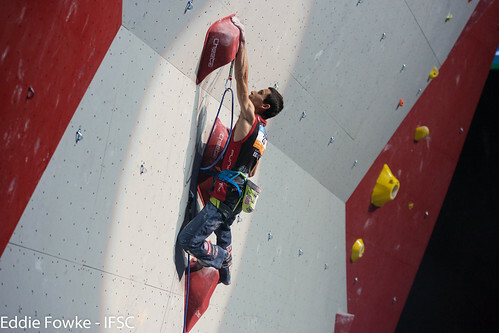 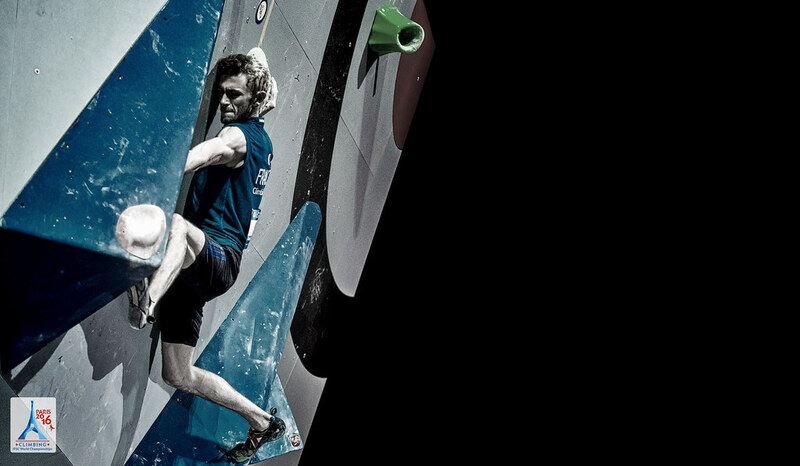 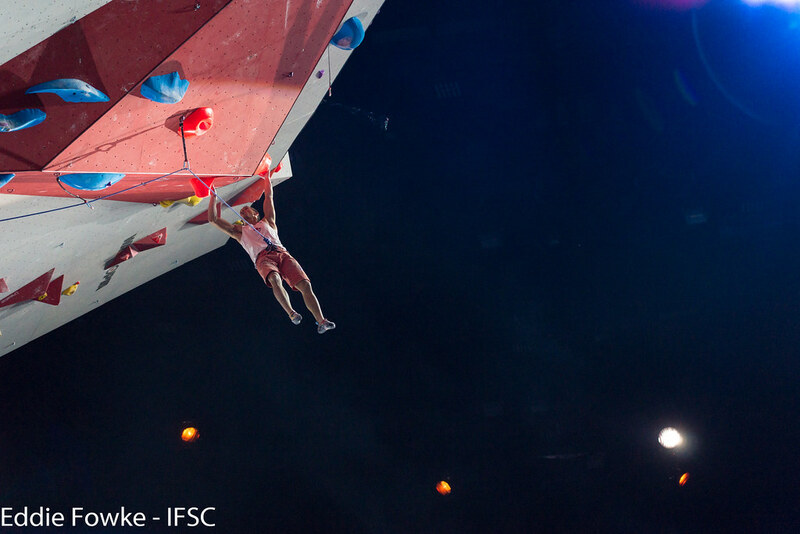 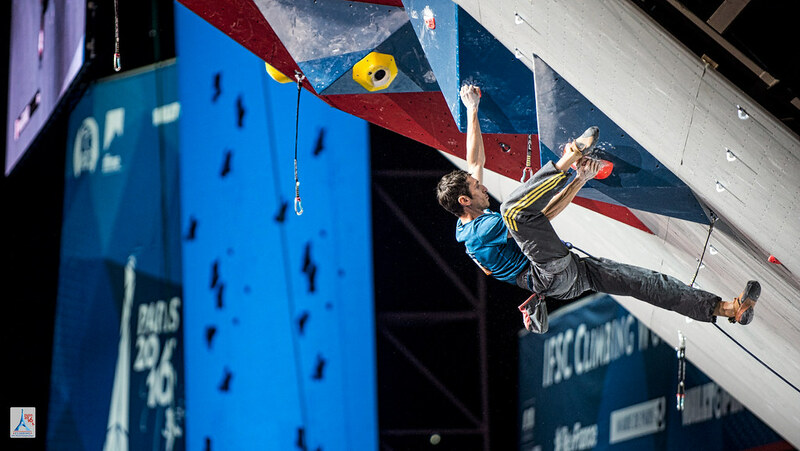 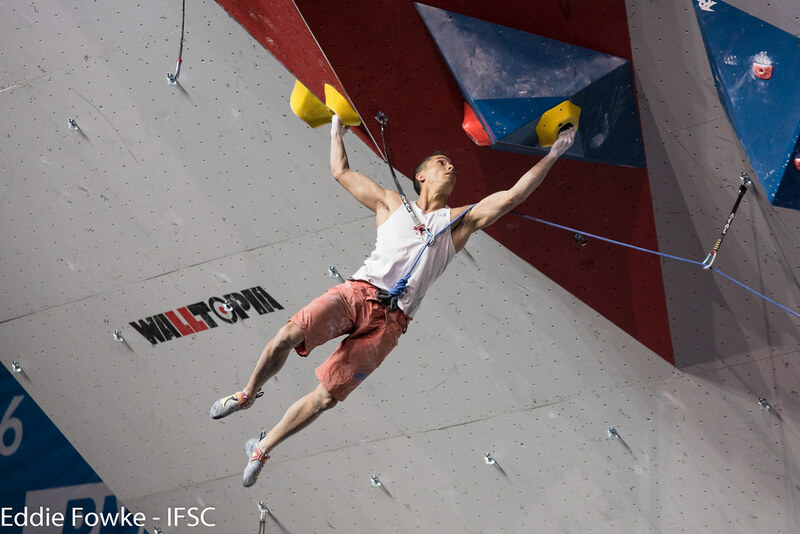 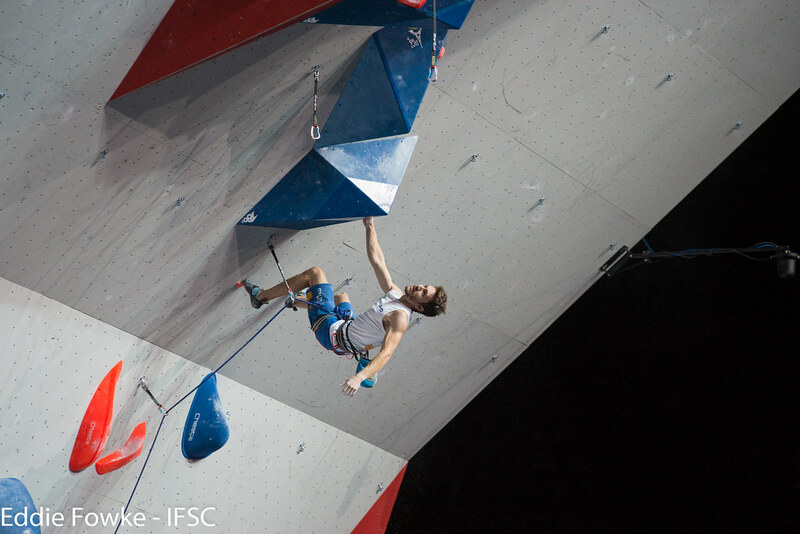 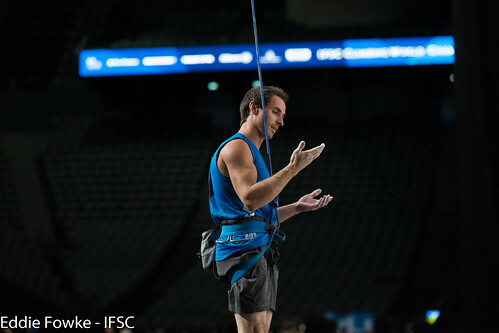 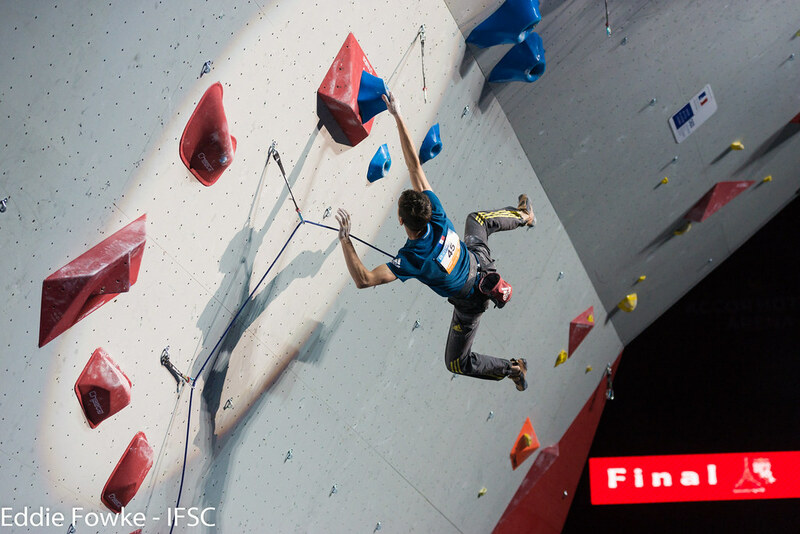 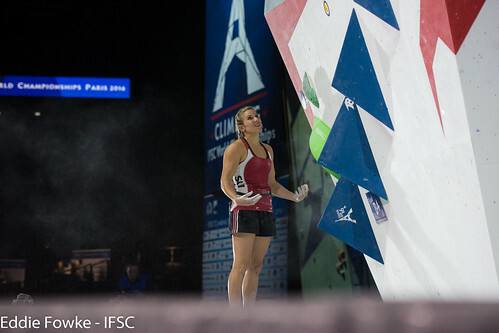 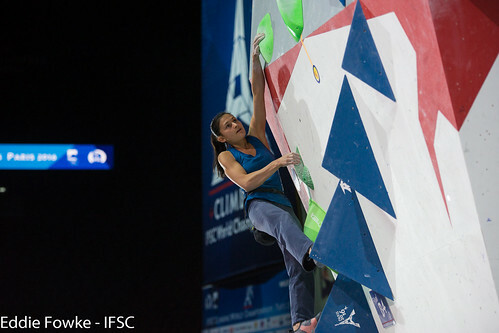 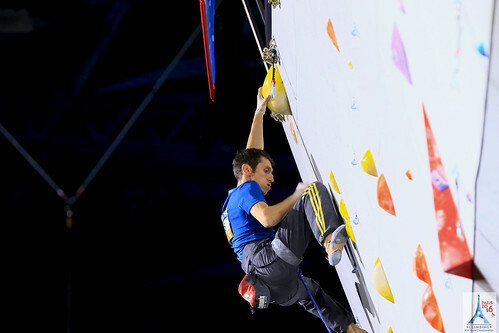 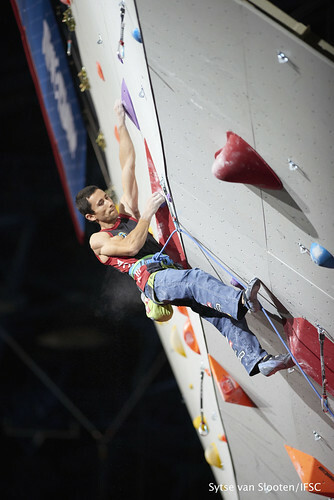 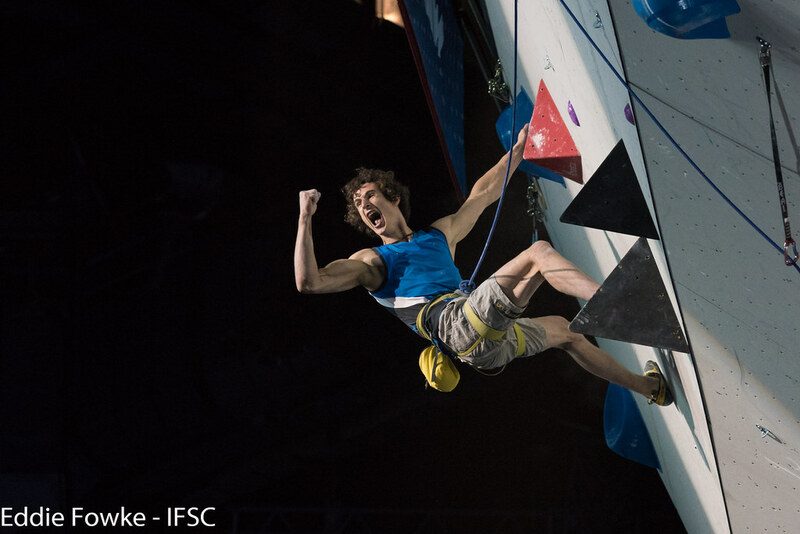 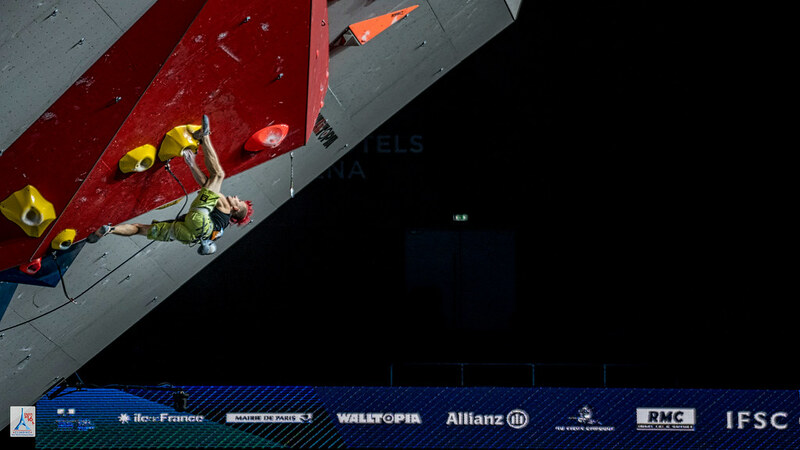 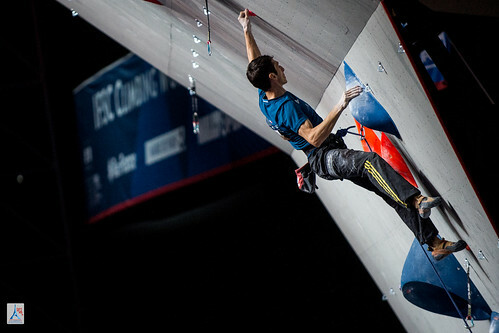 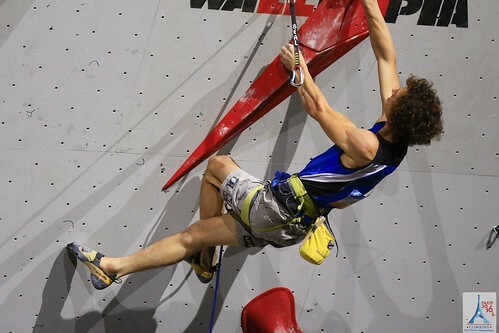 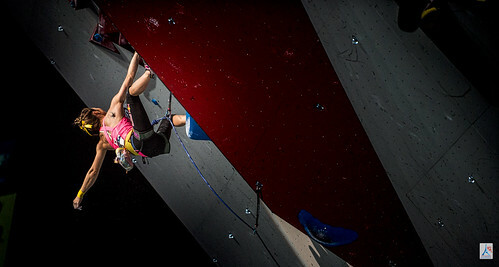 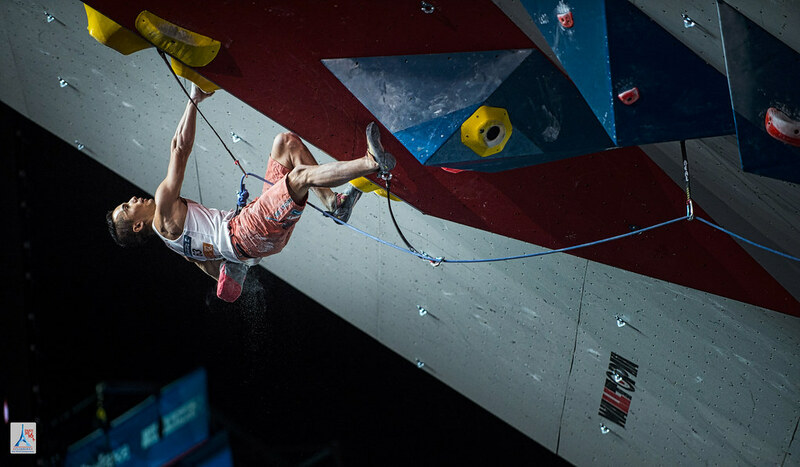 Supper fell just short of the mark of Austrian Jakob Schubert, winner of the 2012 IFSC World Championships in Paris. 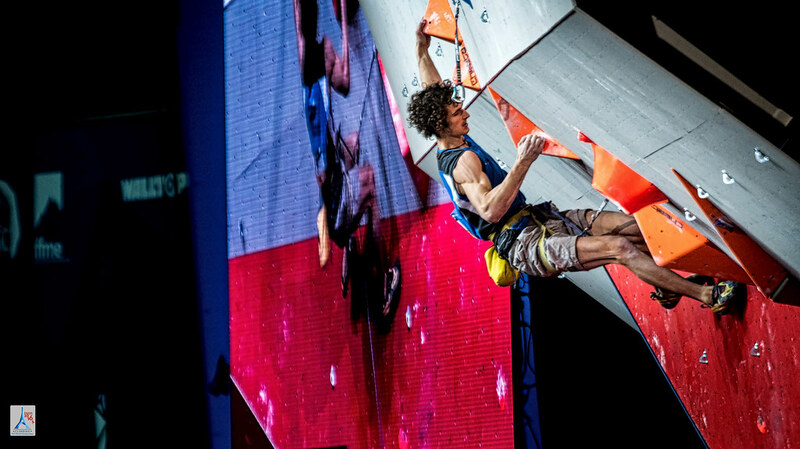 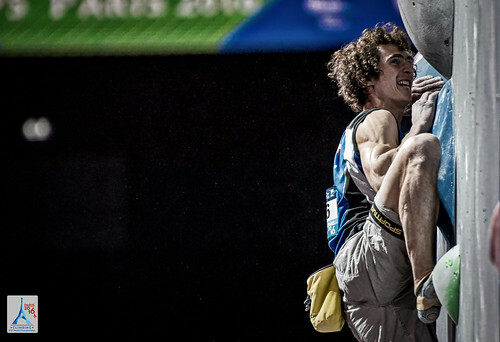 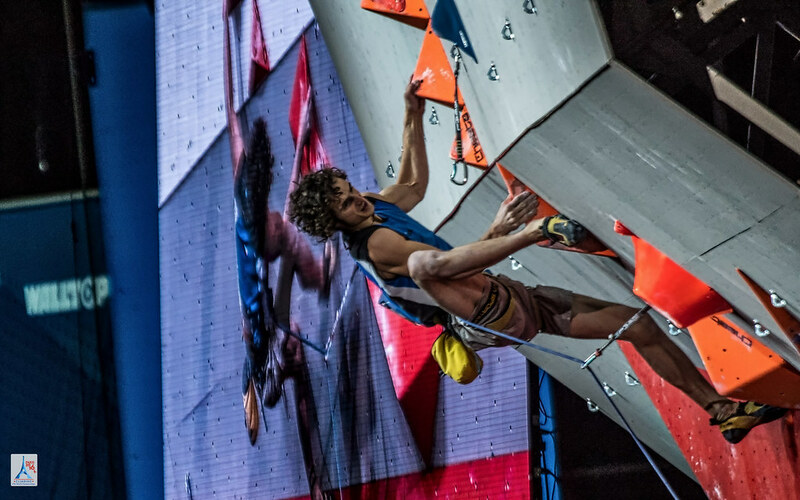 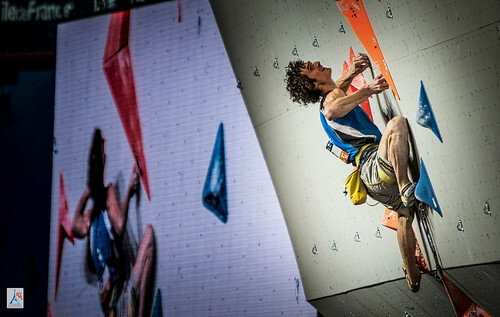 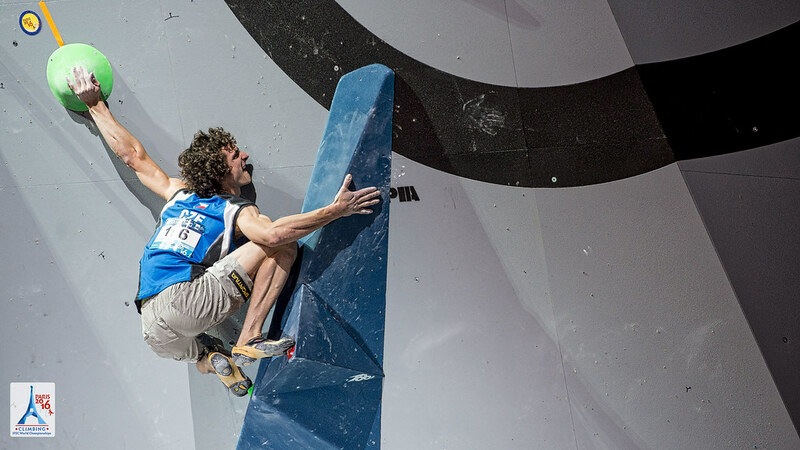 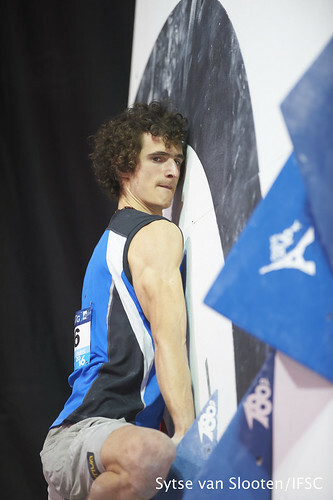 The story of the round, though, was the performance of the final Athlete to step onto the stage: Adam Ondra. 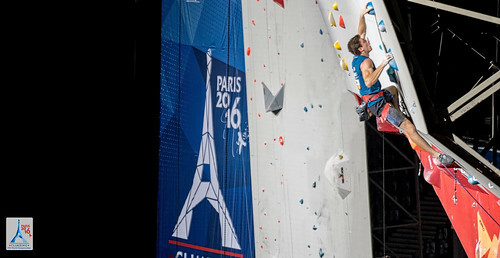 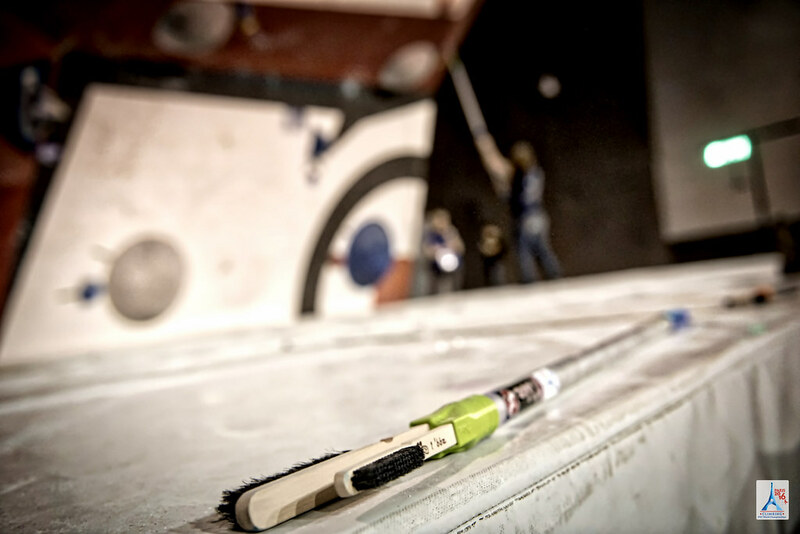 All eyes were on the reigning Lead world champion, who made quick work of the Finals route. 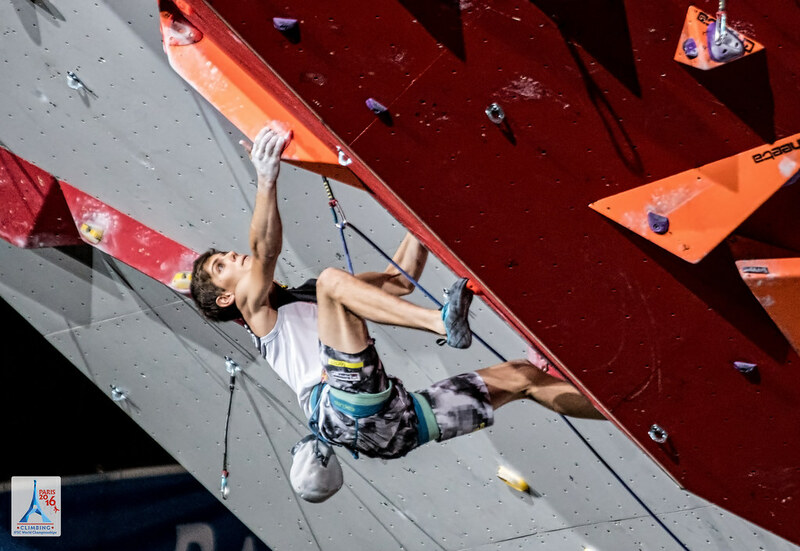 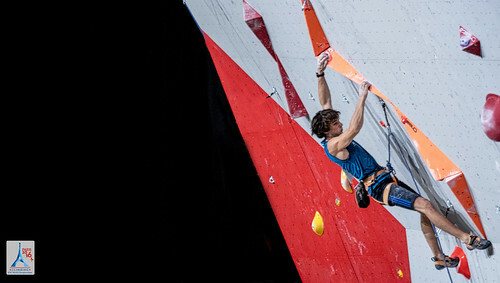 Not only did Ondra surpass Schubert’s impressive high point, the legendary Athlete stuck the succeeding dyno and turned around to wave for more support. 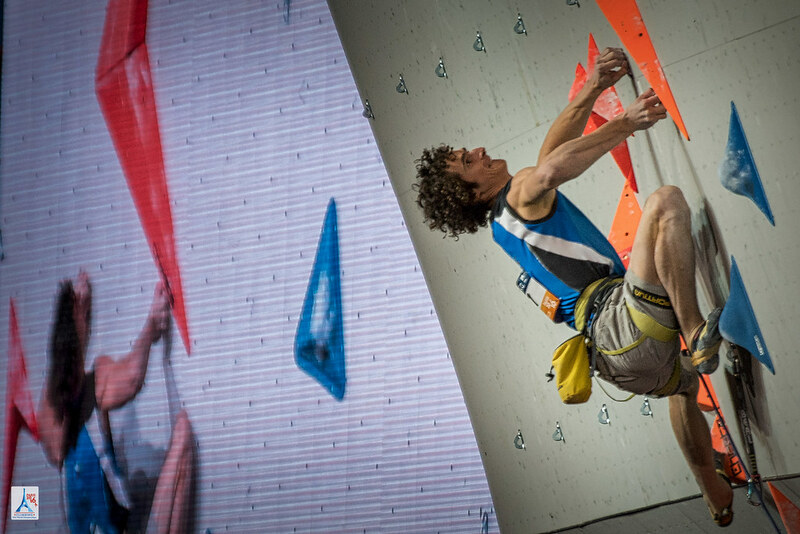 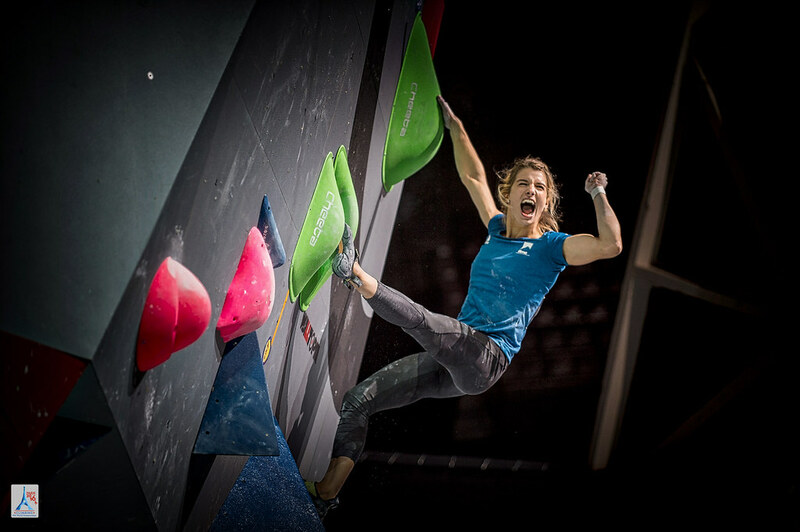 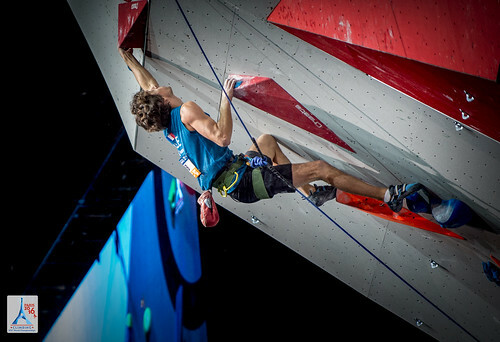 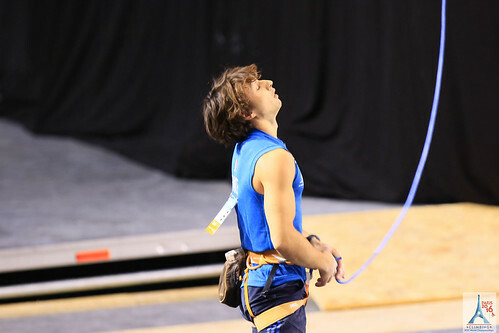 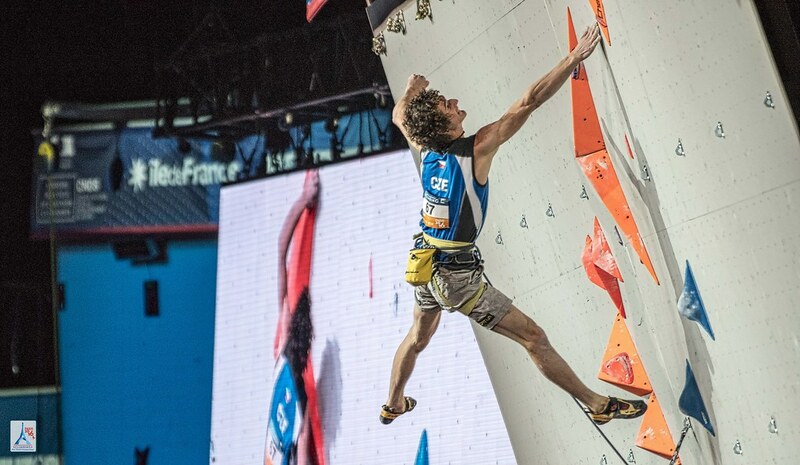 Ondra clipped the chains for the sole Top, rejoicing with over seven thousand fans standing in awe.